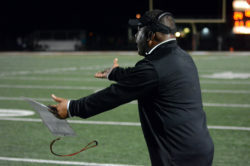 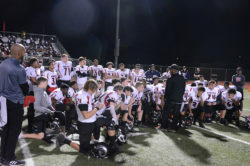 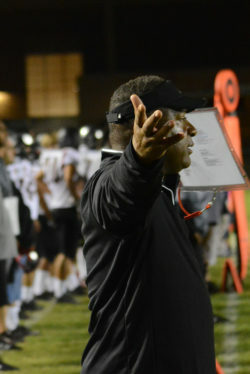 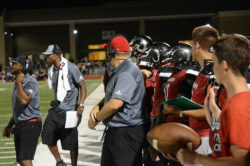 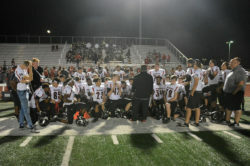 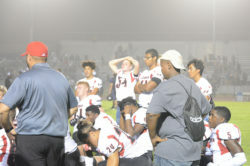 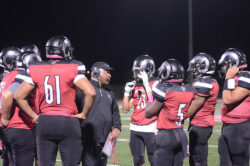 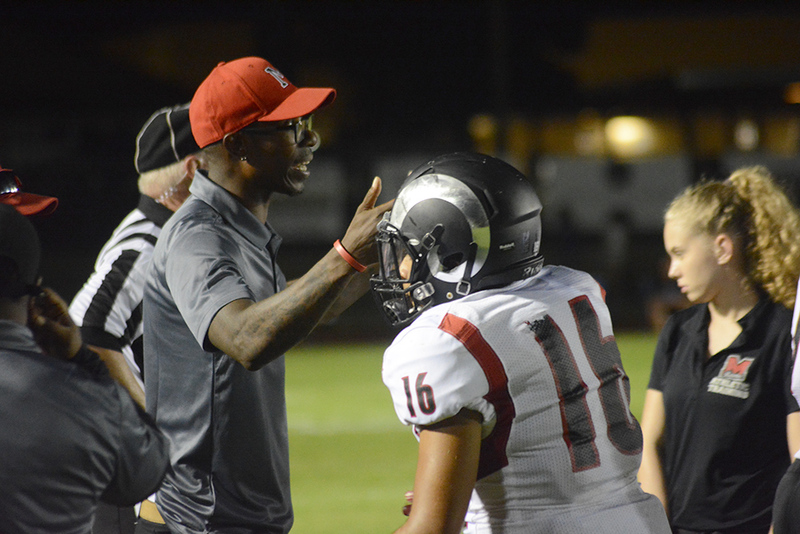 Home Tags Articles tagged with "football"
Coach Brandon Harris talks to his team after a win at South Mountain High School. 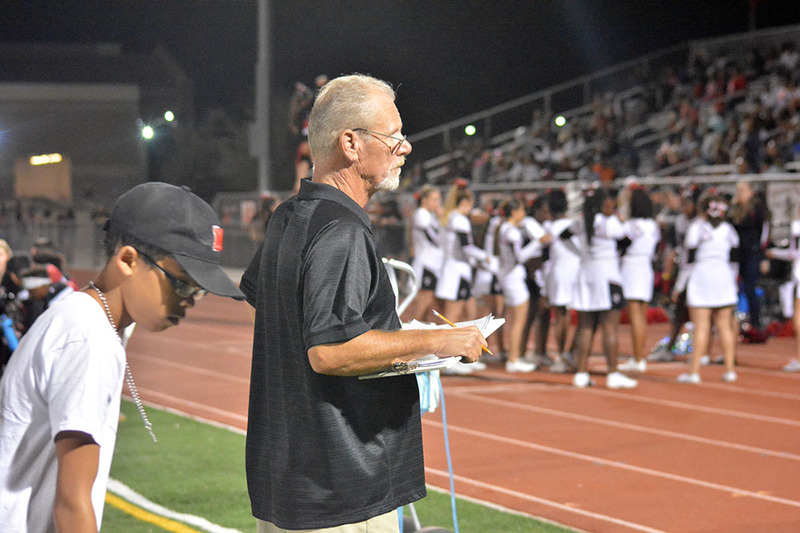 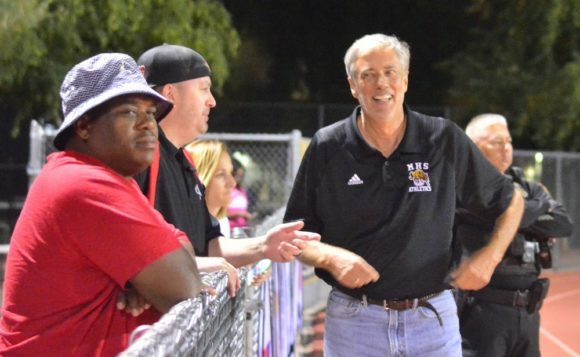 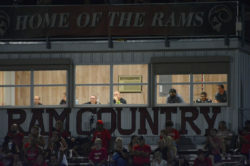 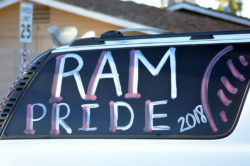 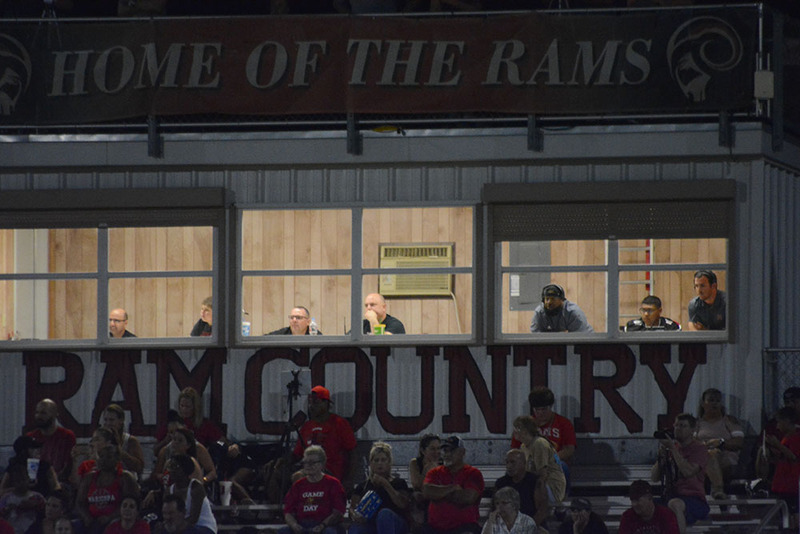 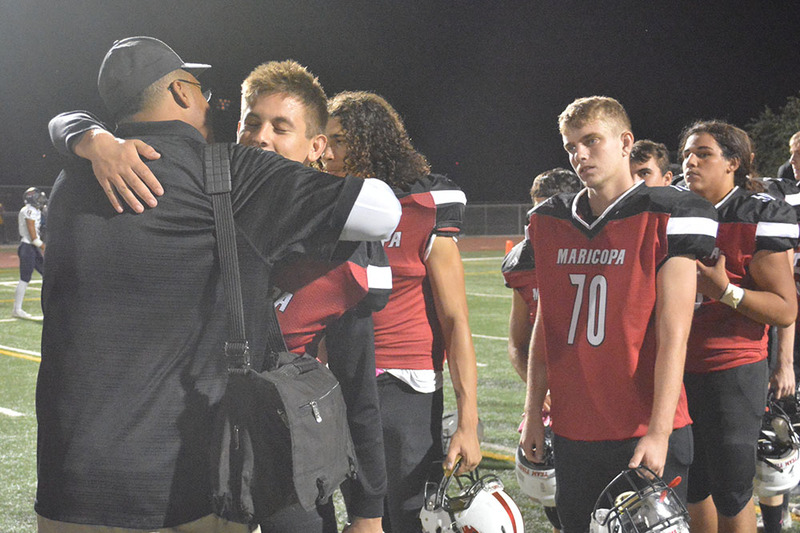 The Maricopa High School Rams won their third football game of the season, but the head coach wasn’t exactly happy about the way it all happened. 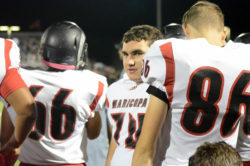 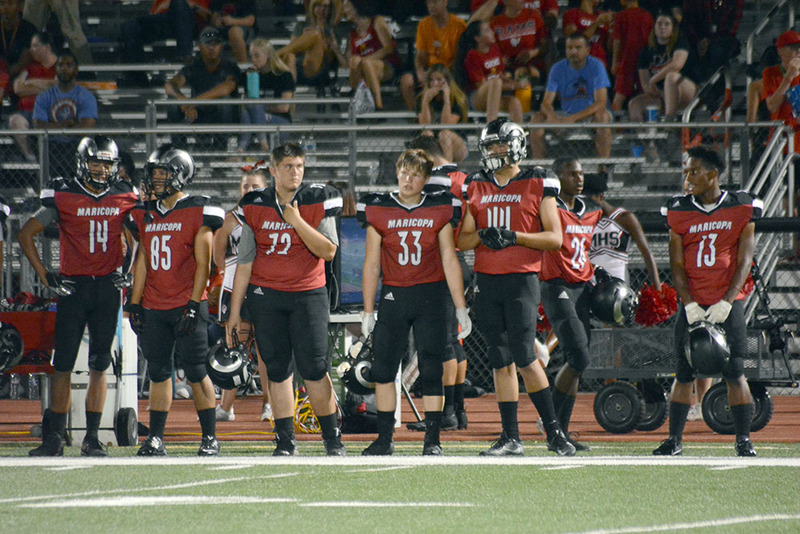 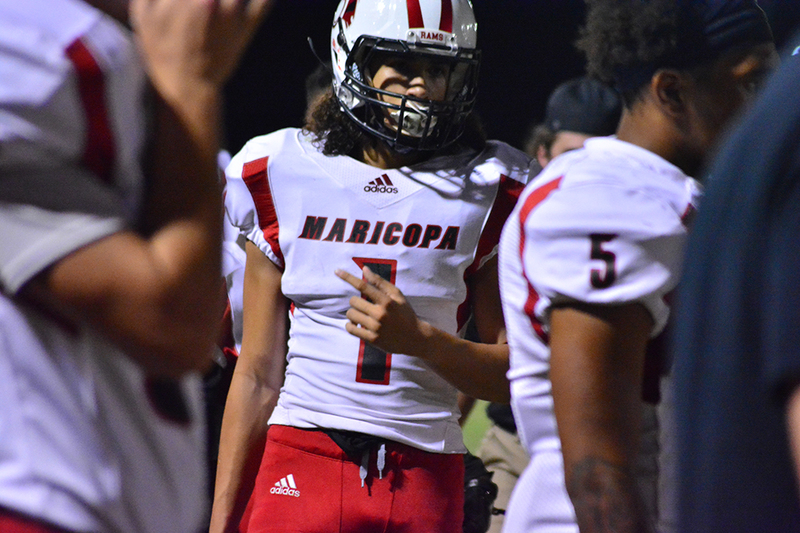 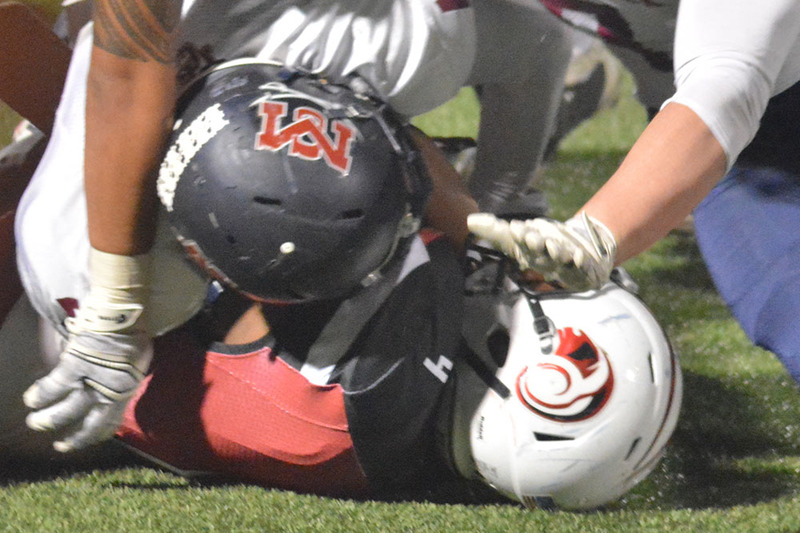 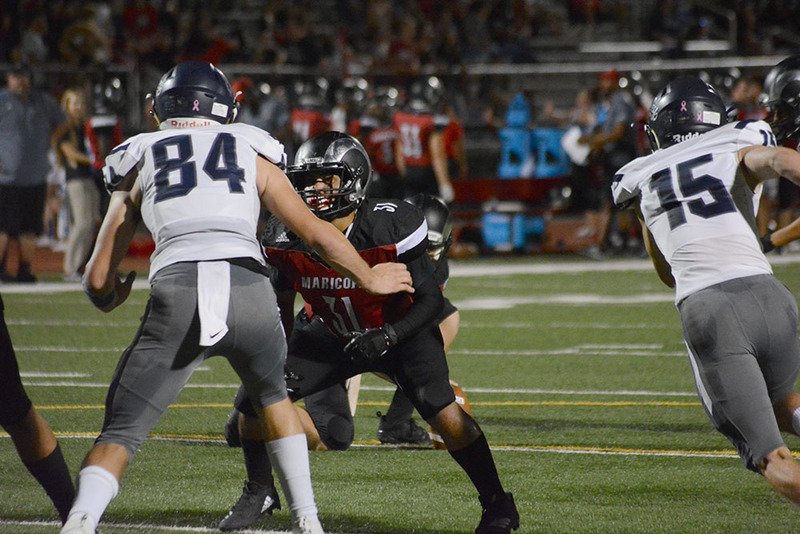 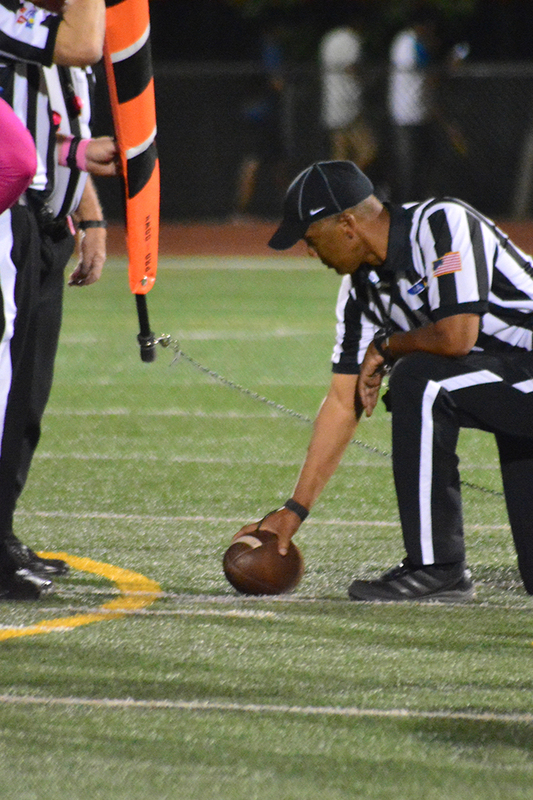 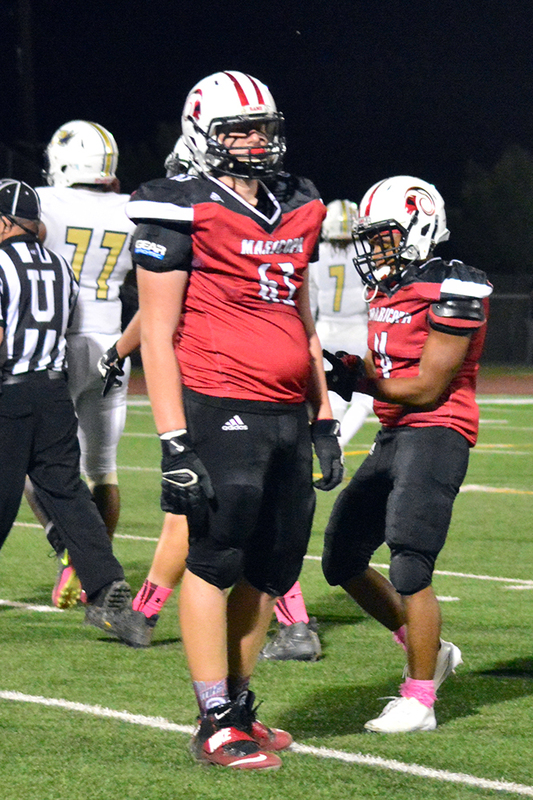 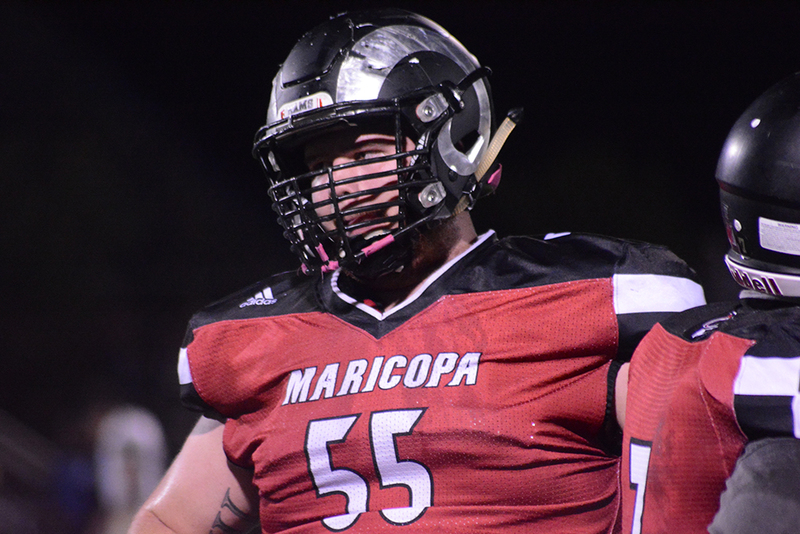 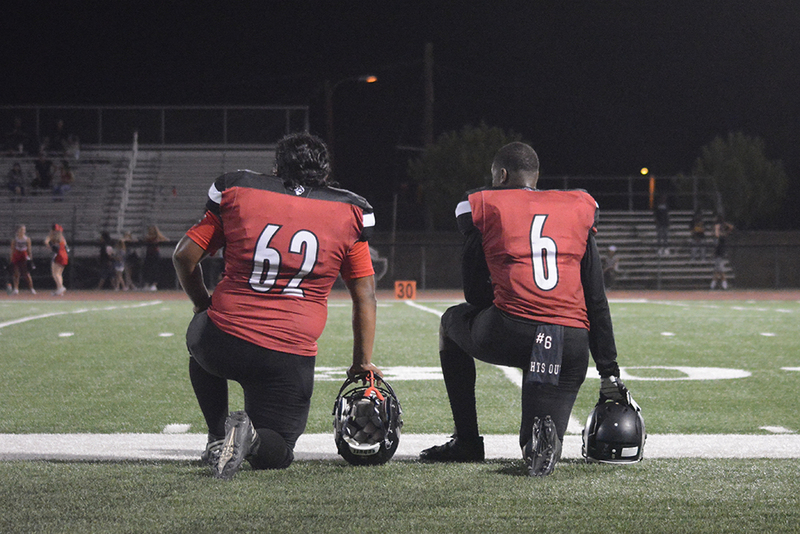 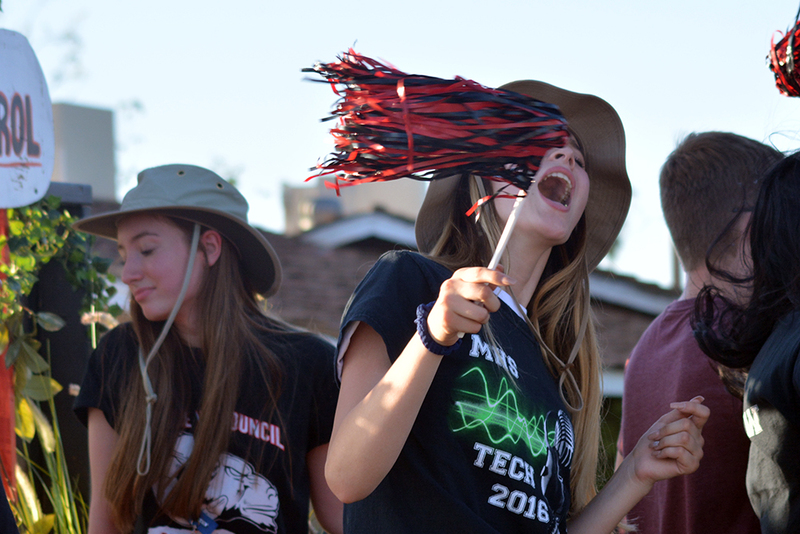 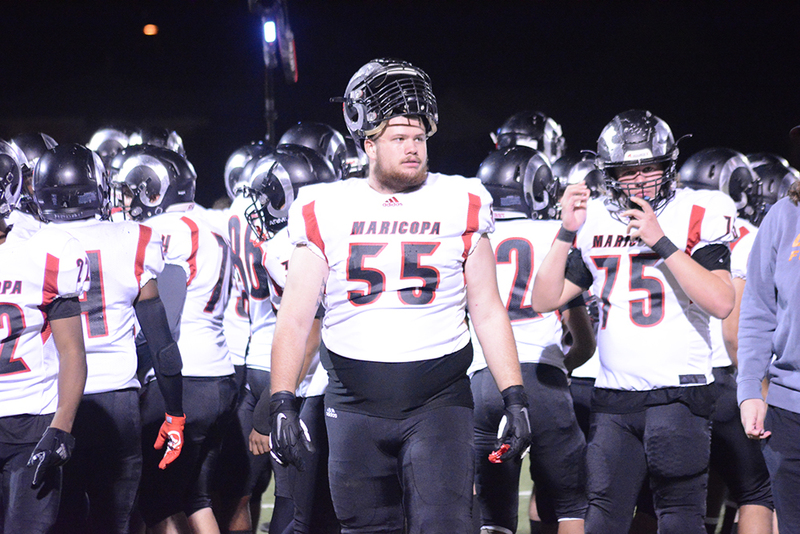 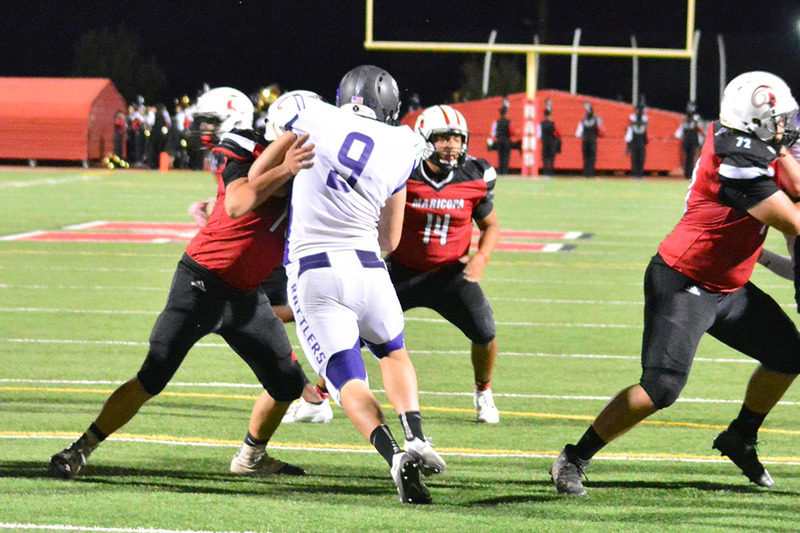 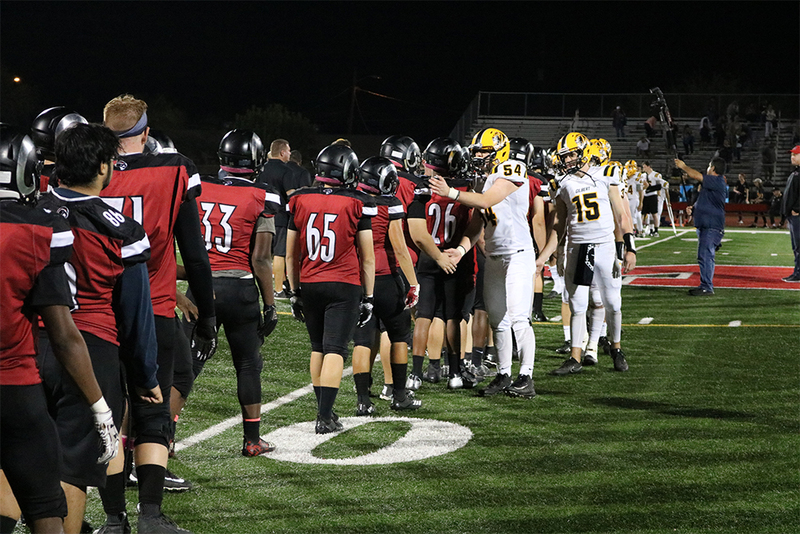 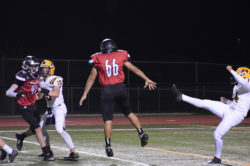 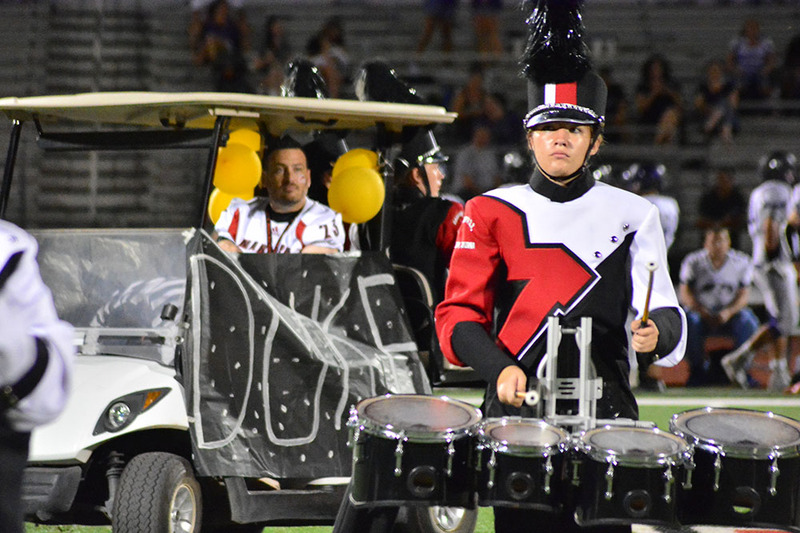 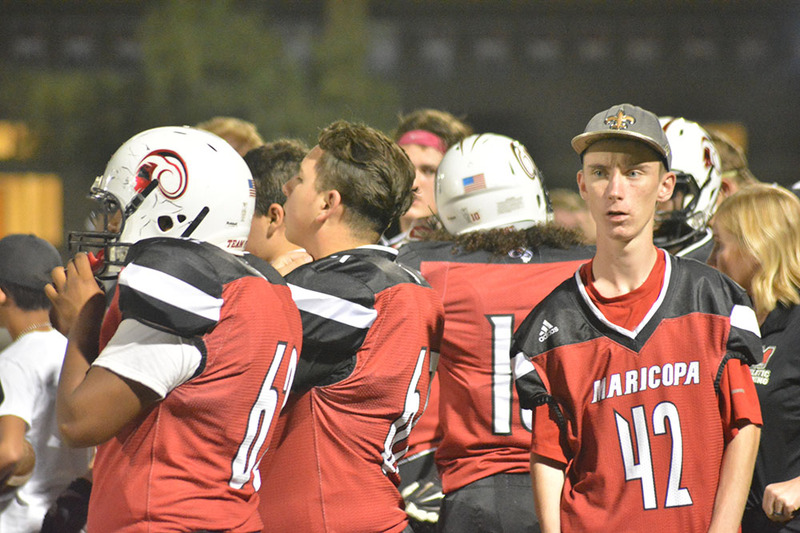 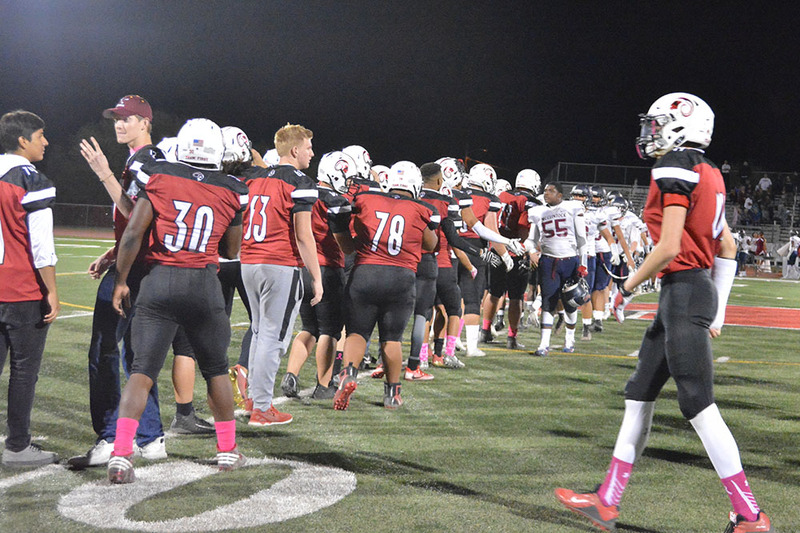 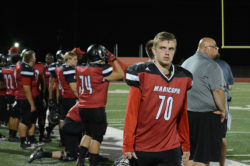 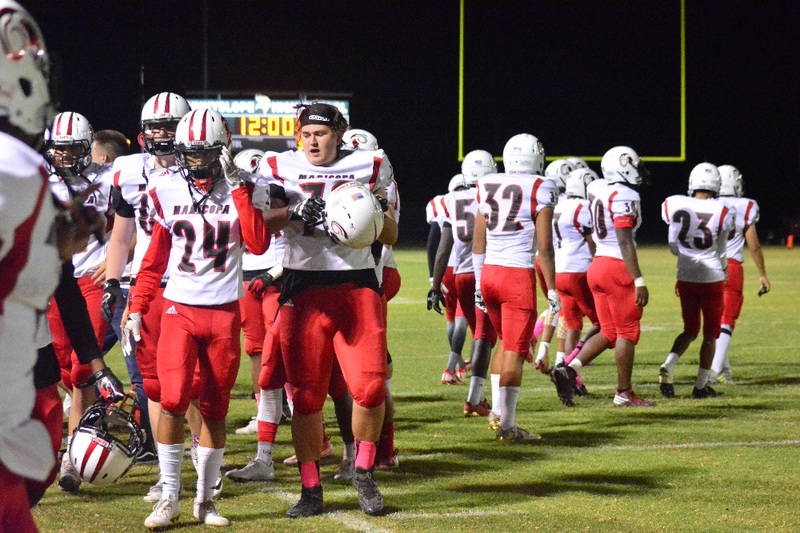 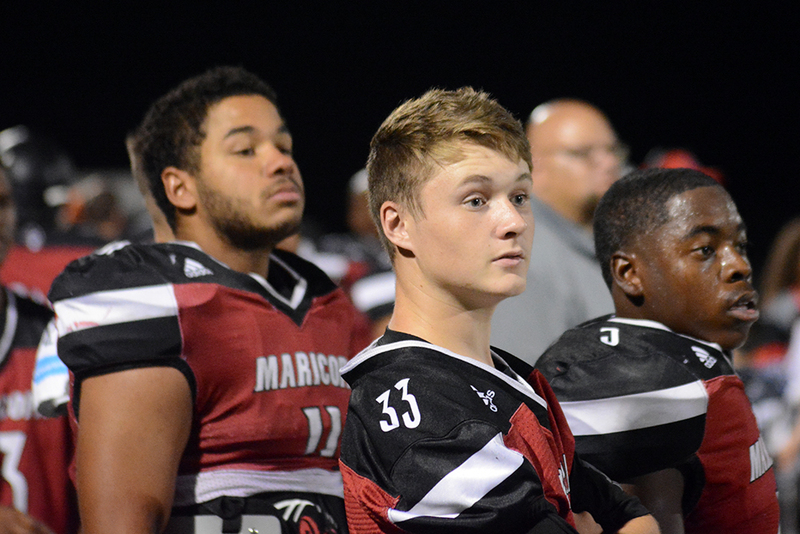 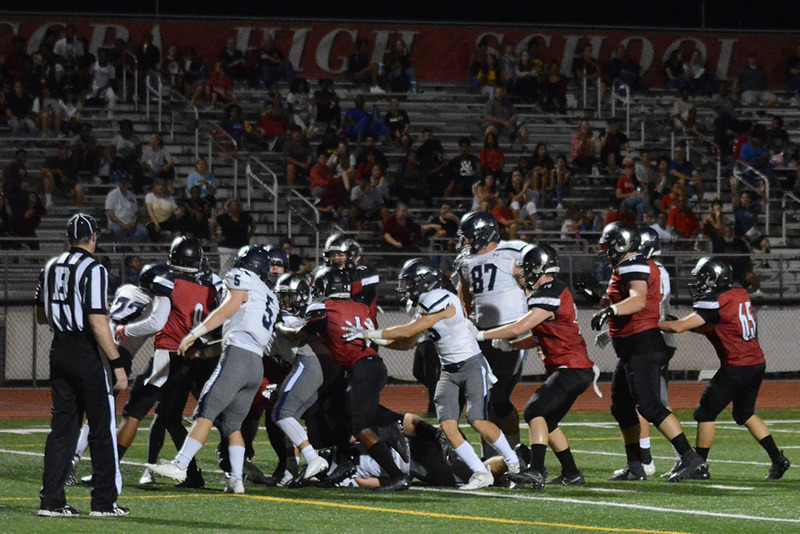 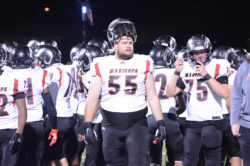 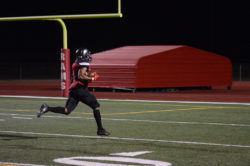 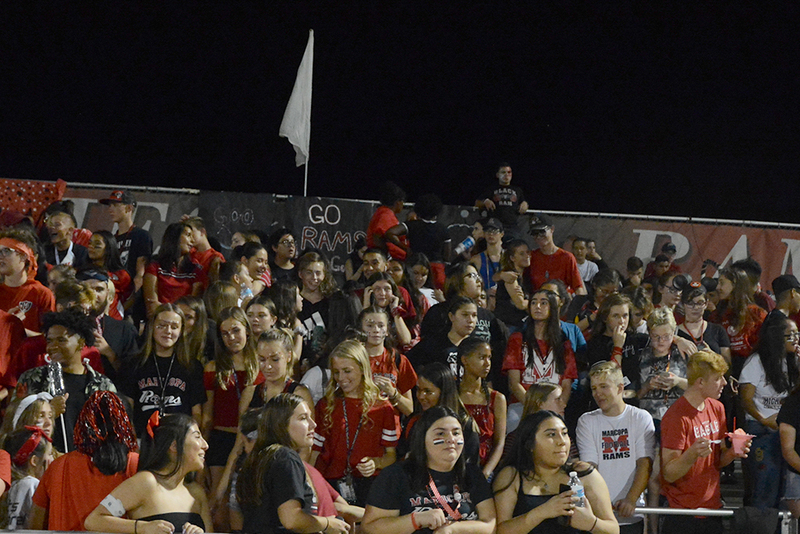 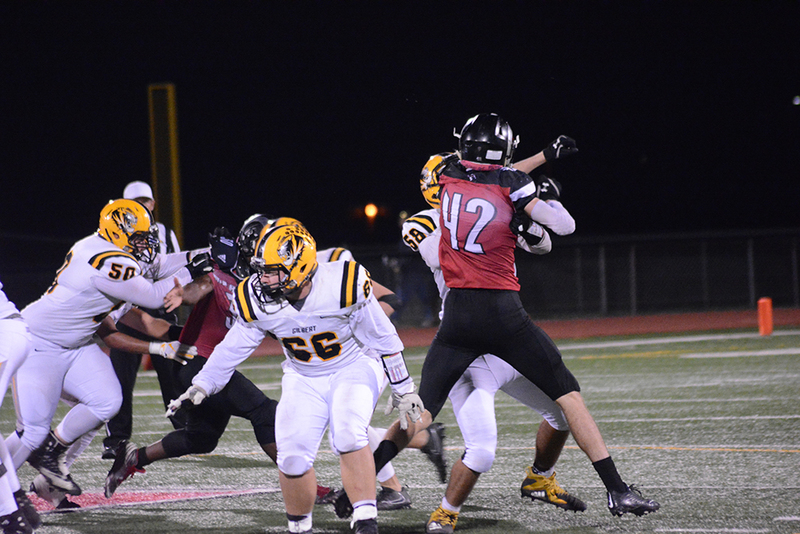 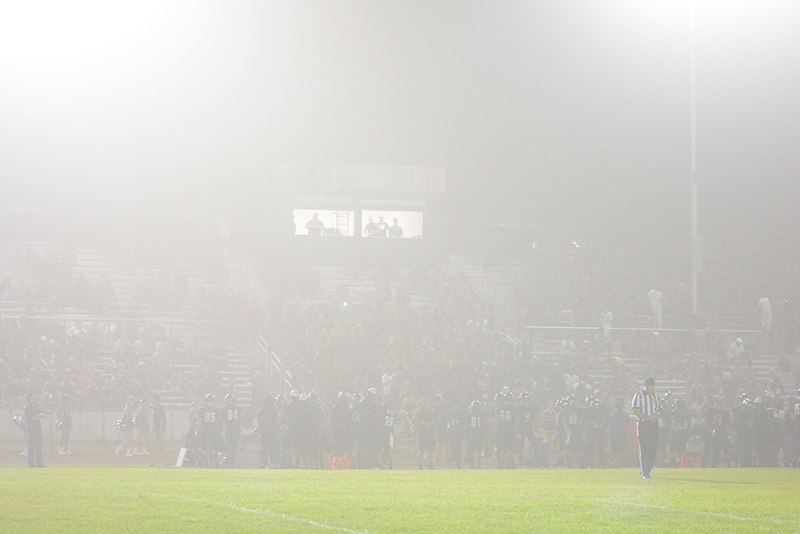 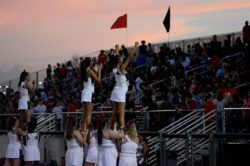 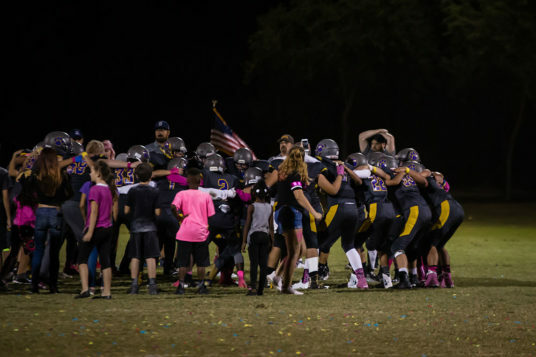 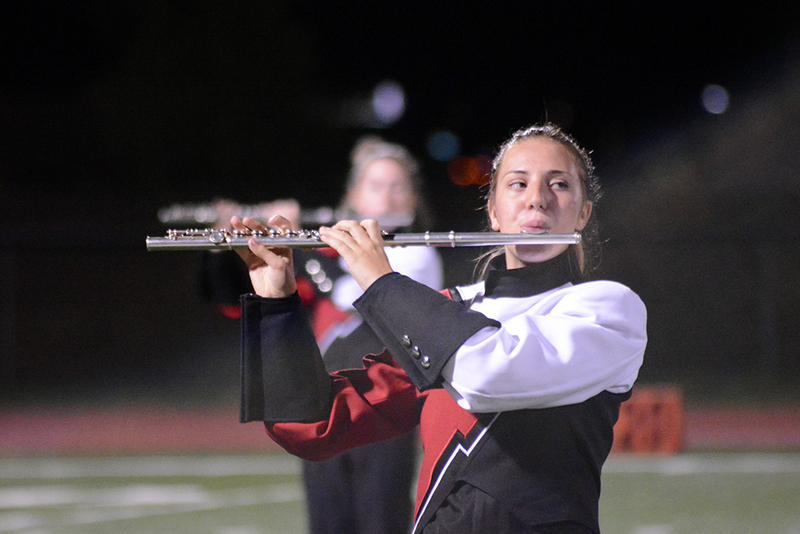 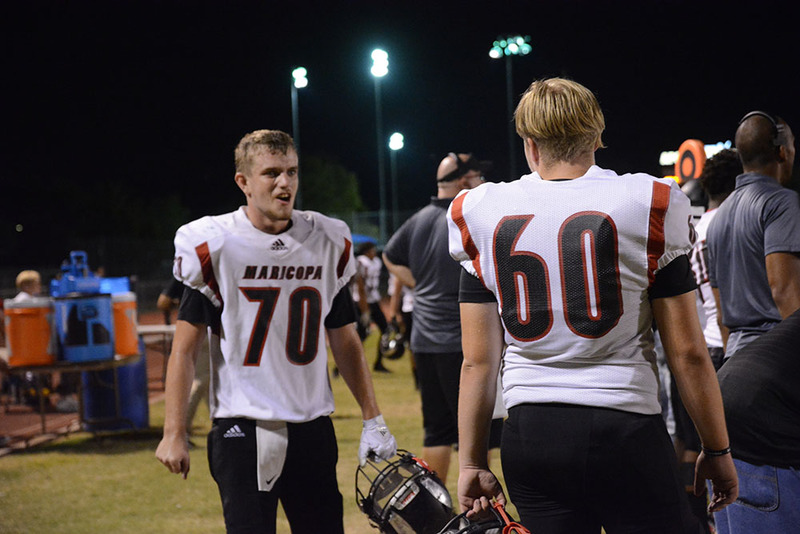 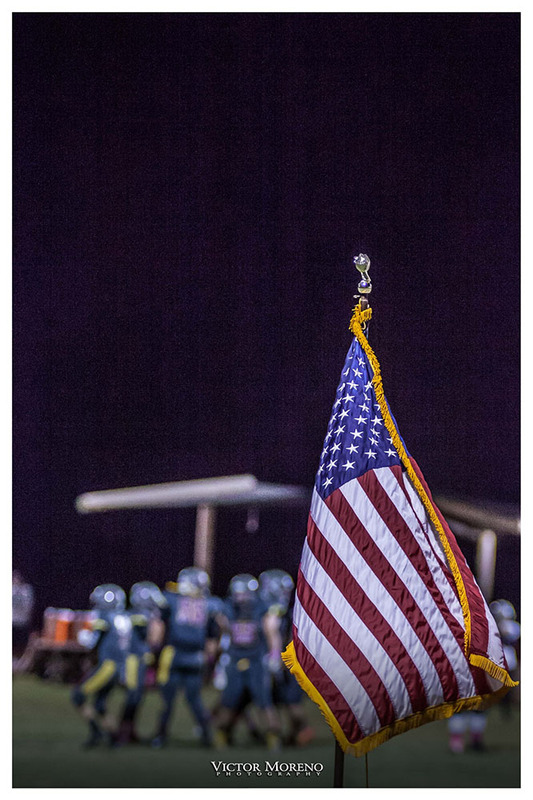 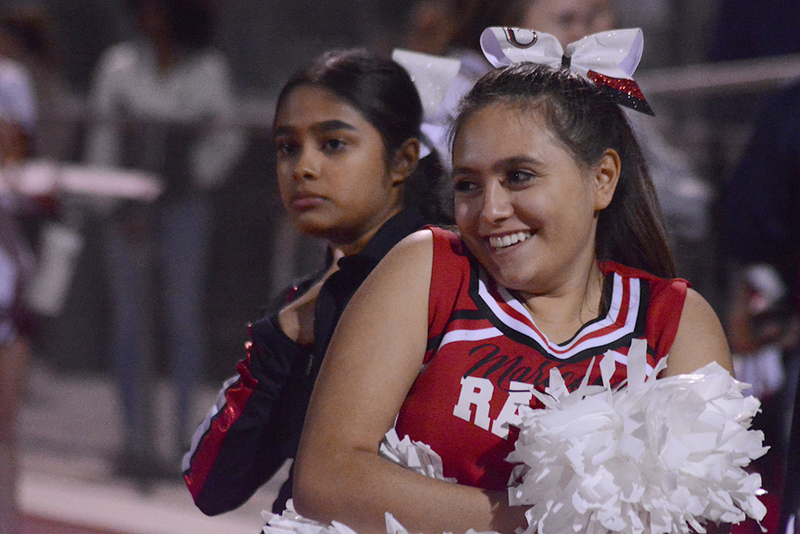 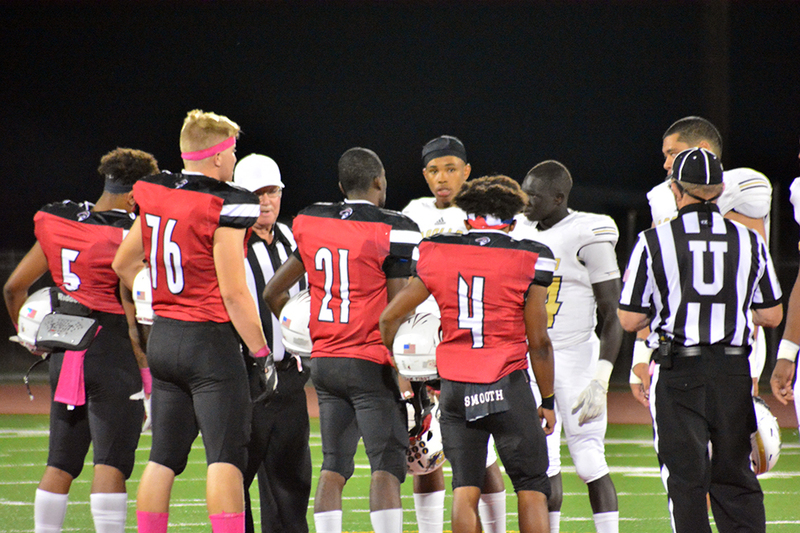 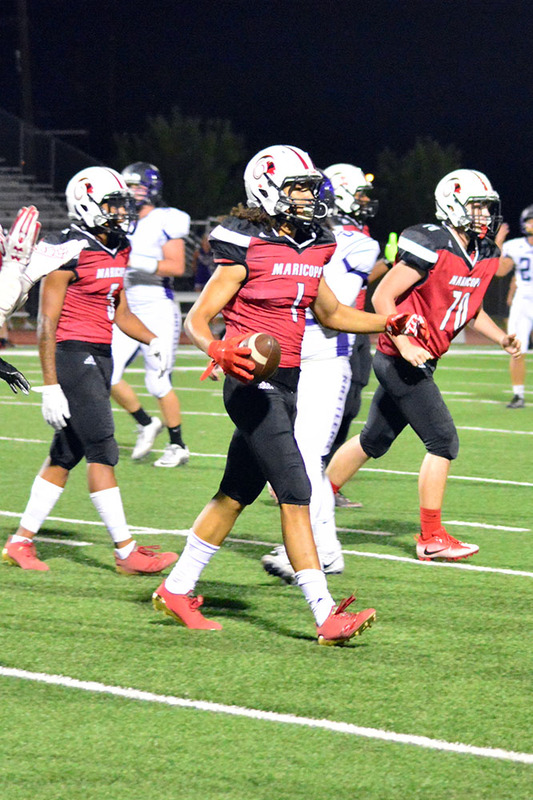 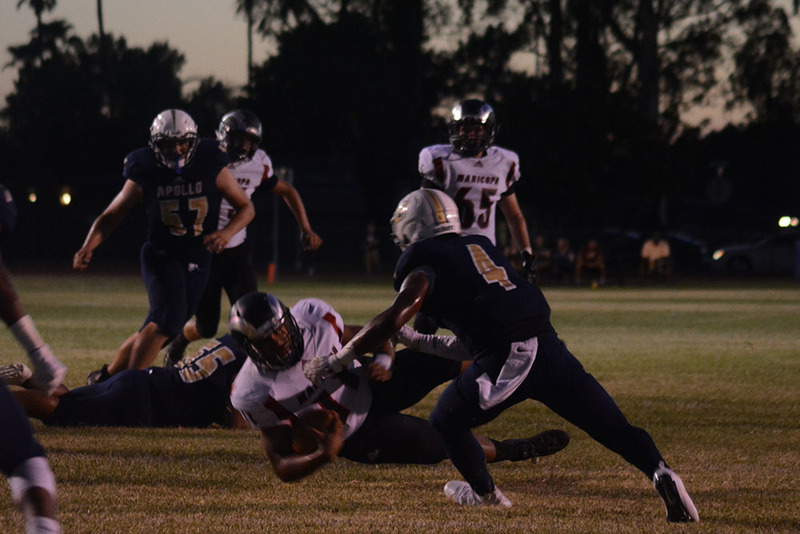 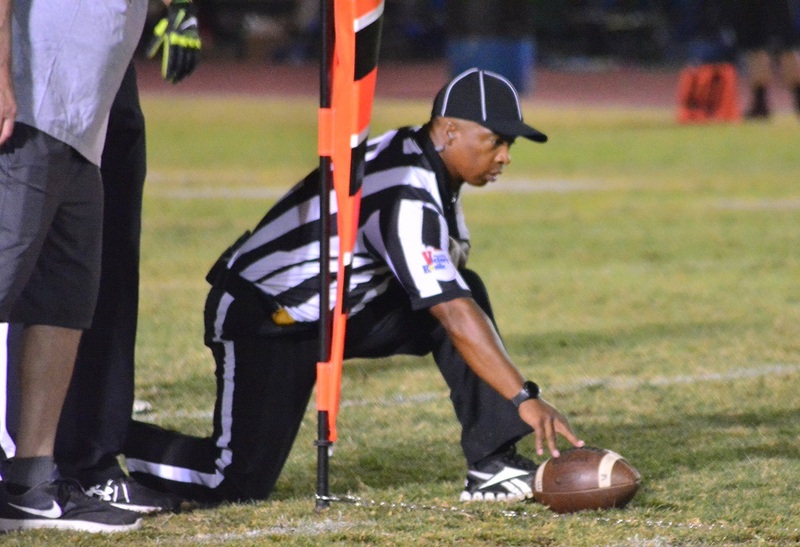 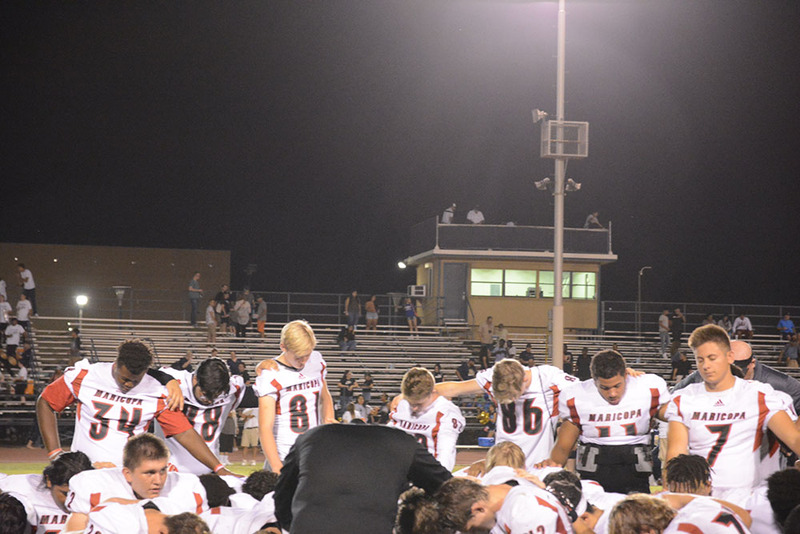 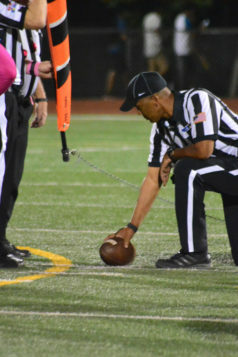 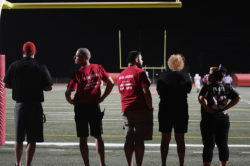 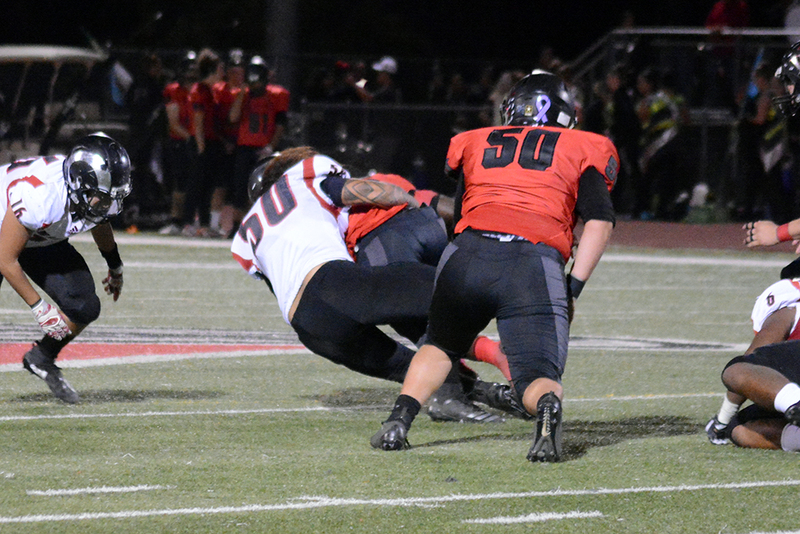 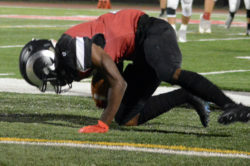 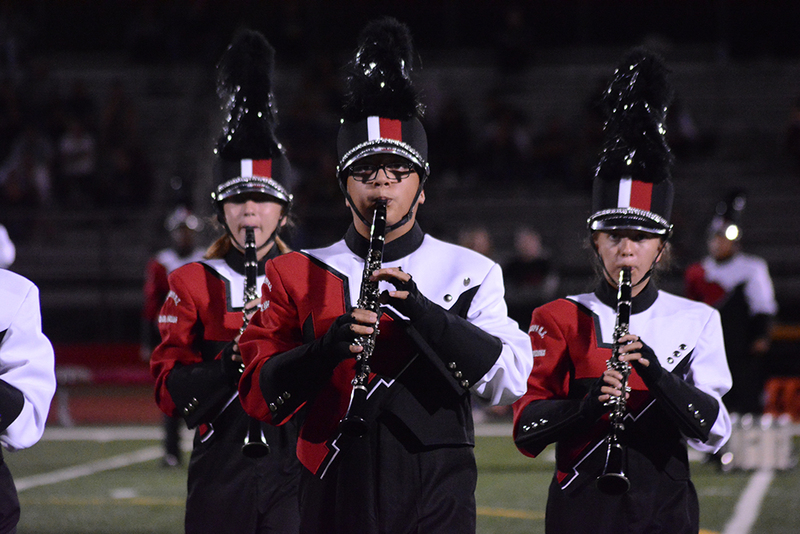 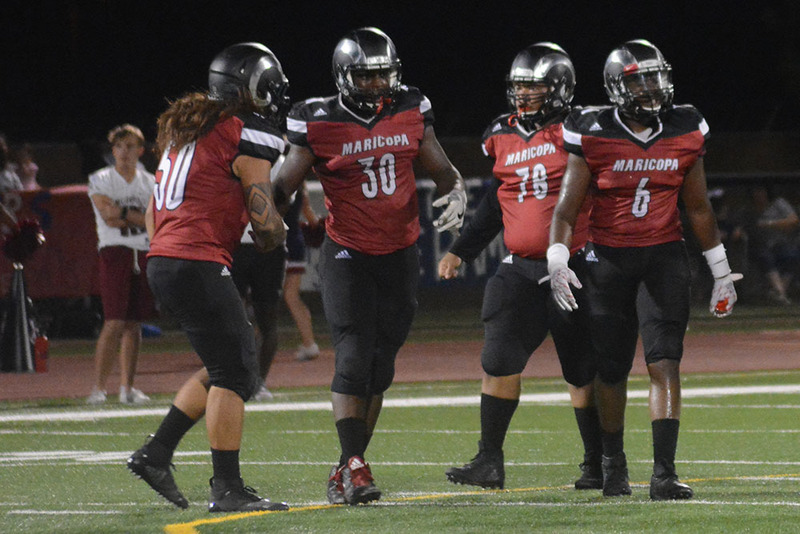 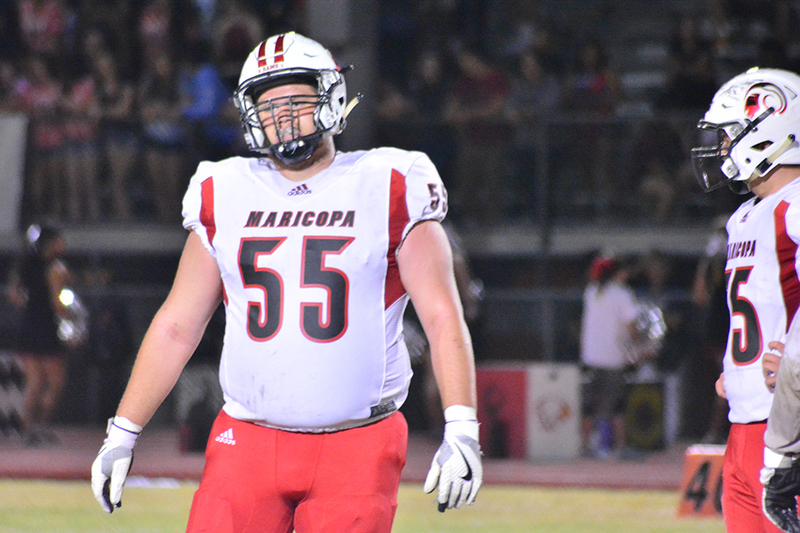 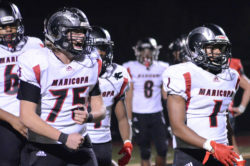 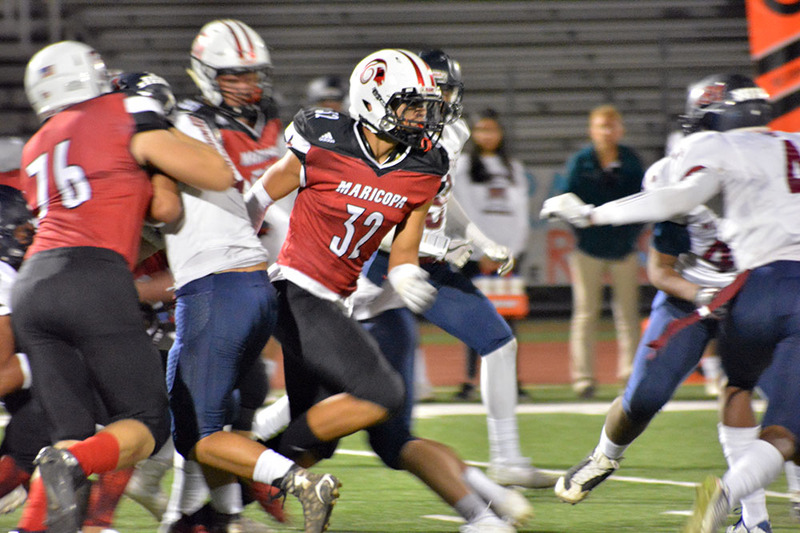 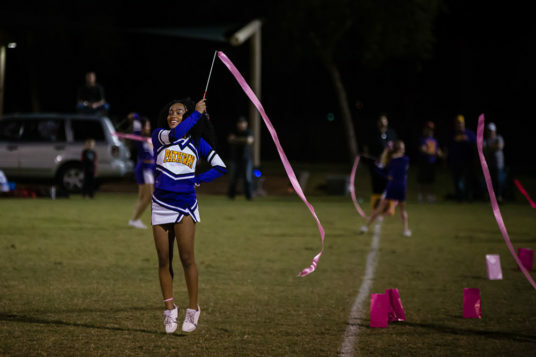 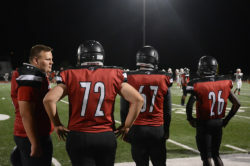 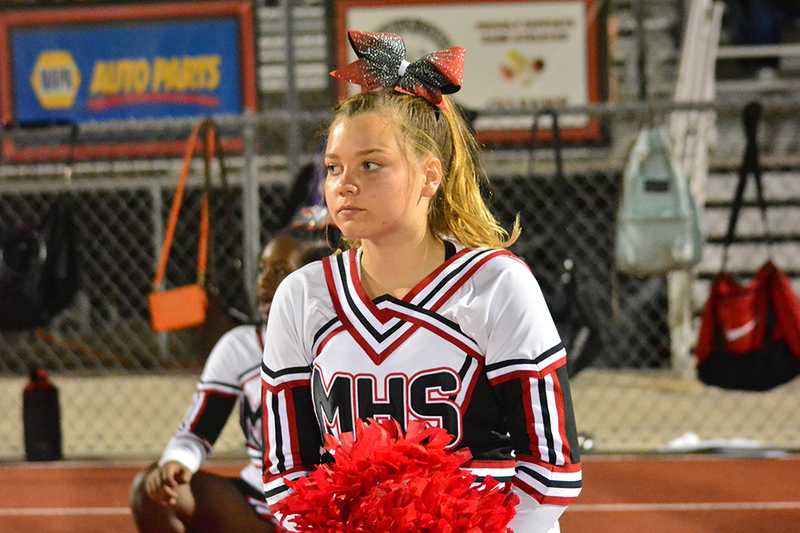 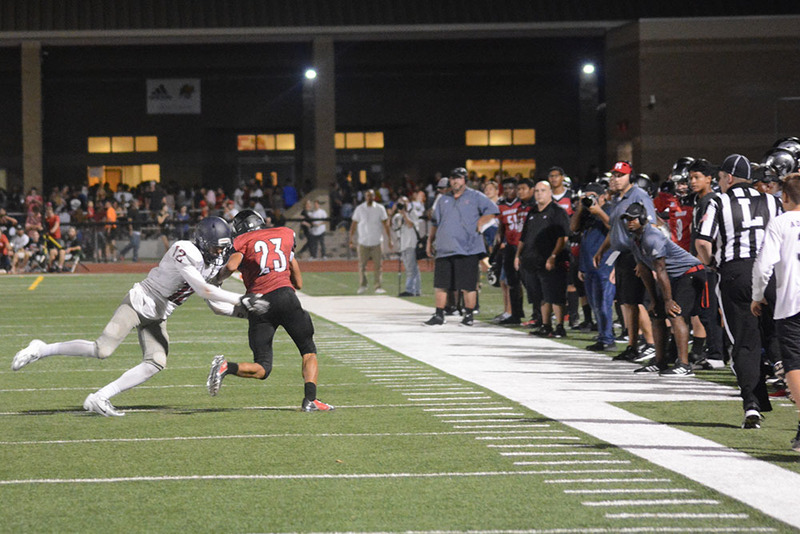 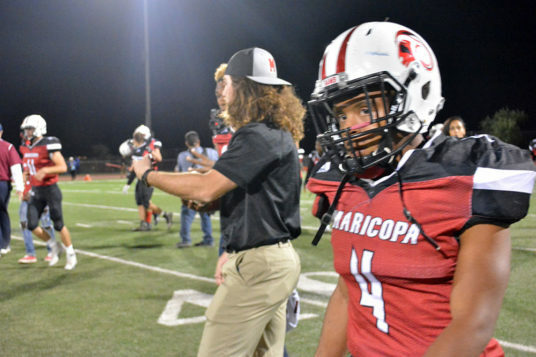 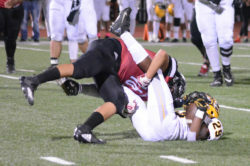 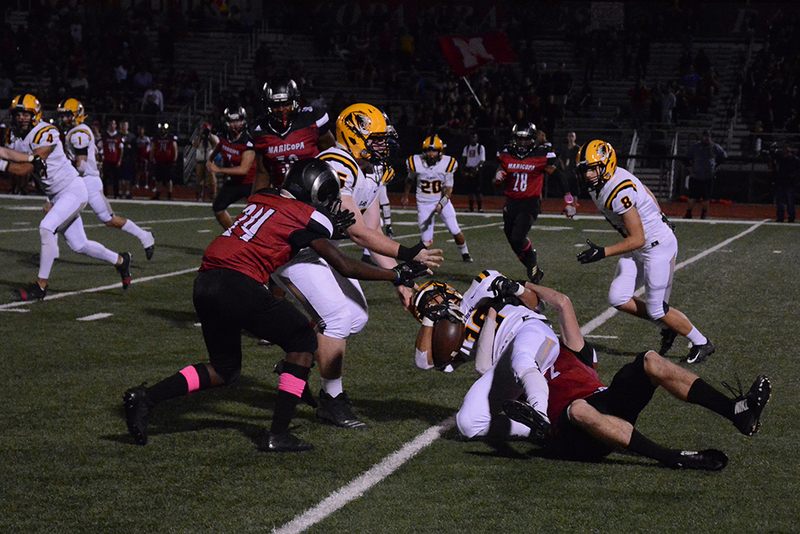 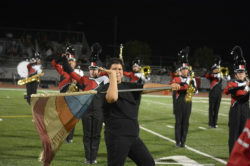 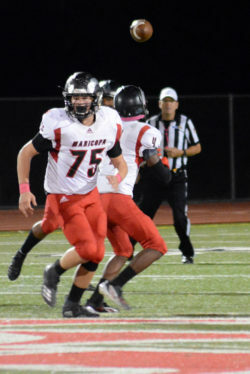 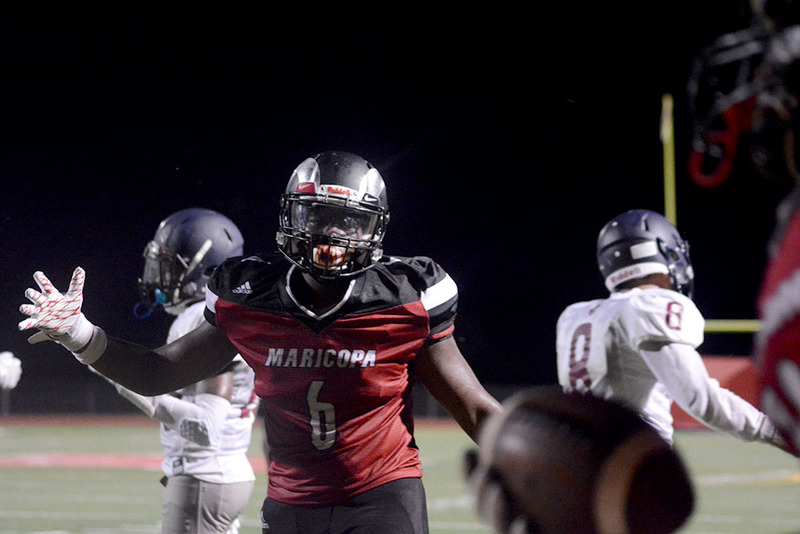 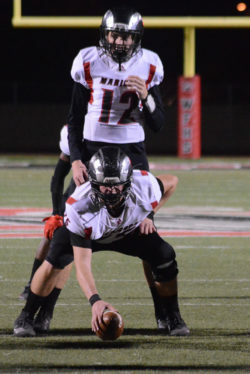 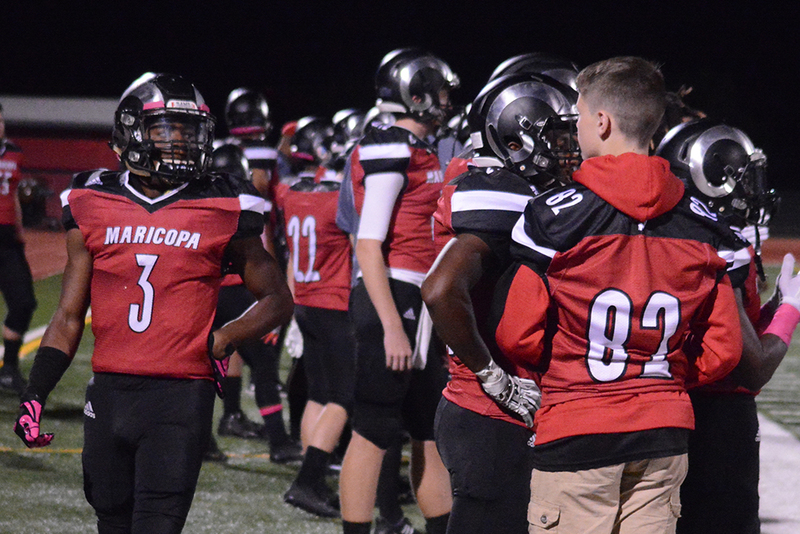 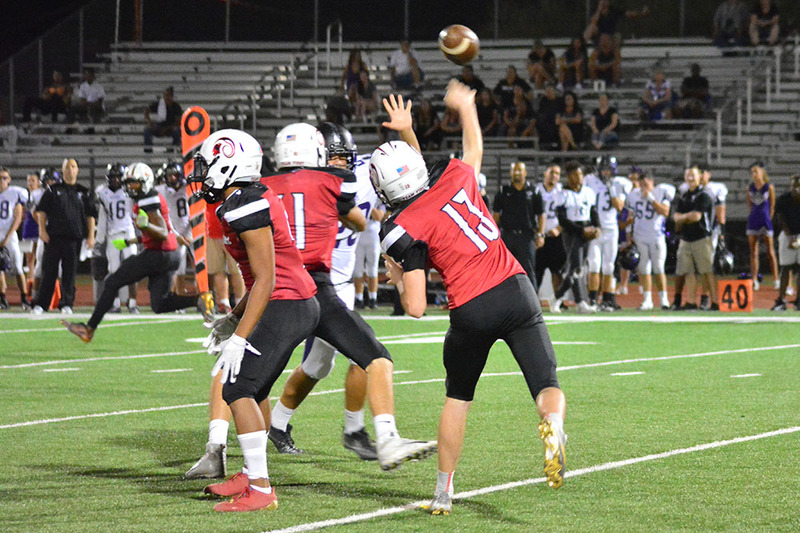 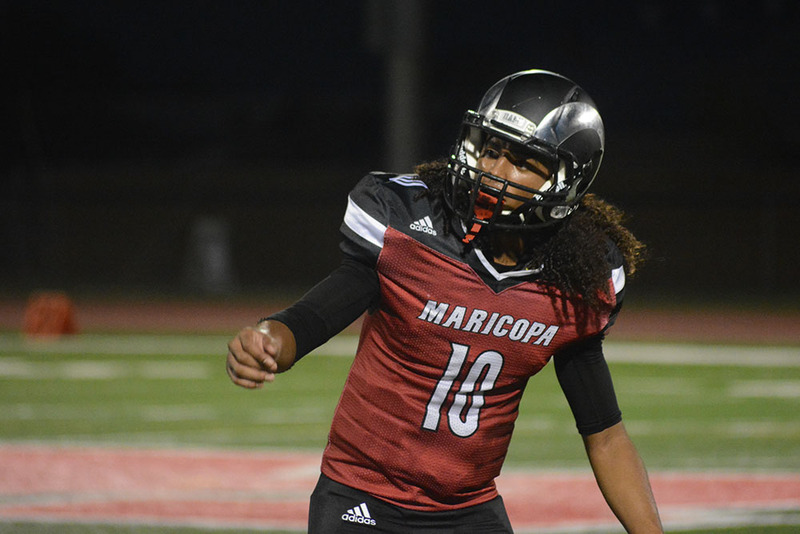 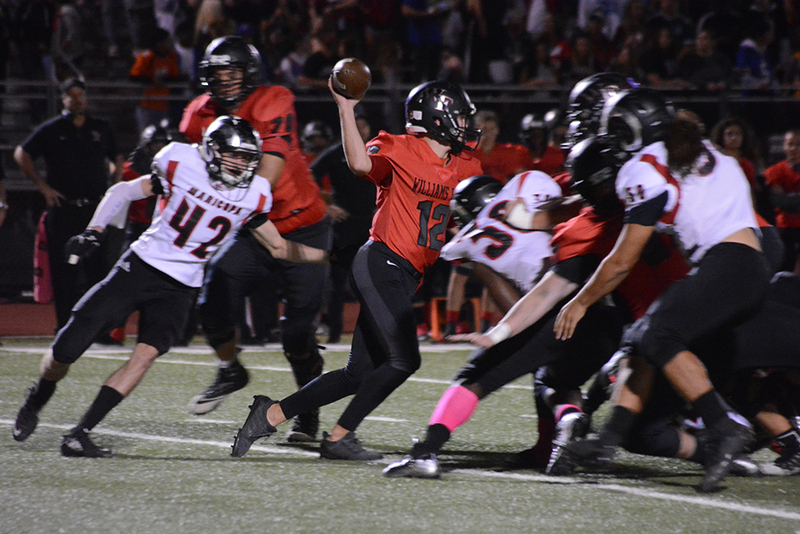 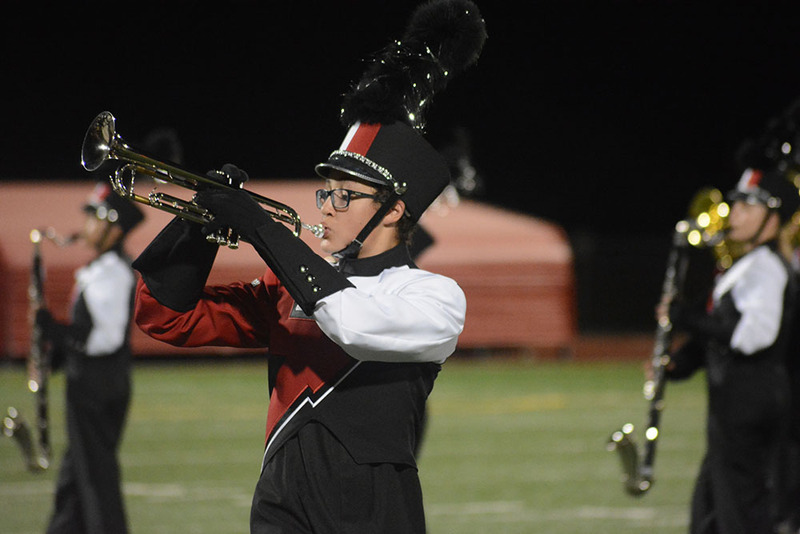 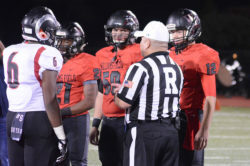 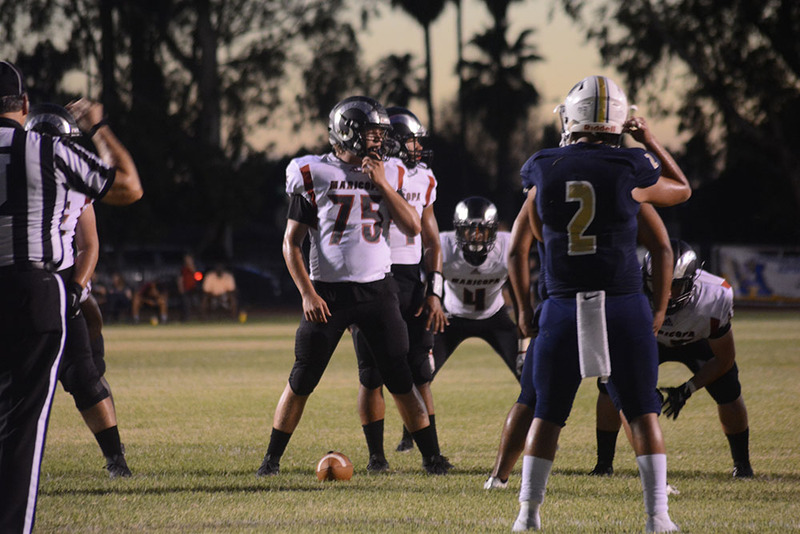 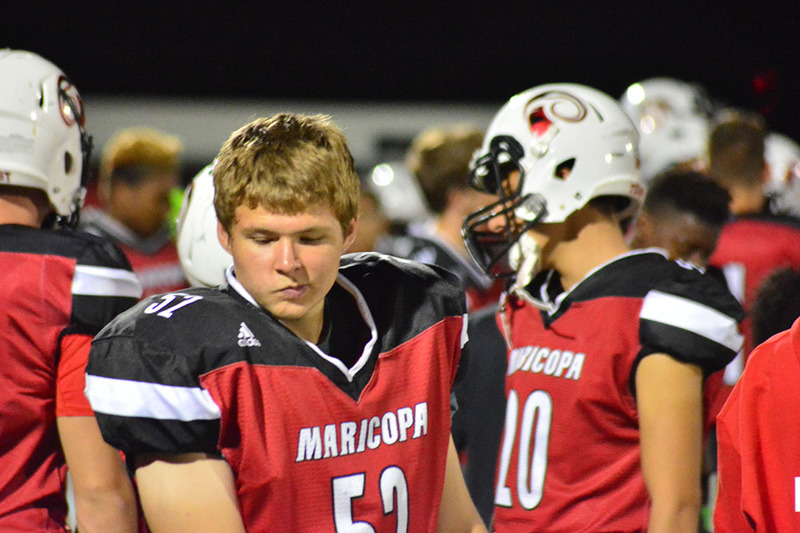 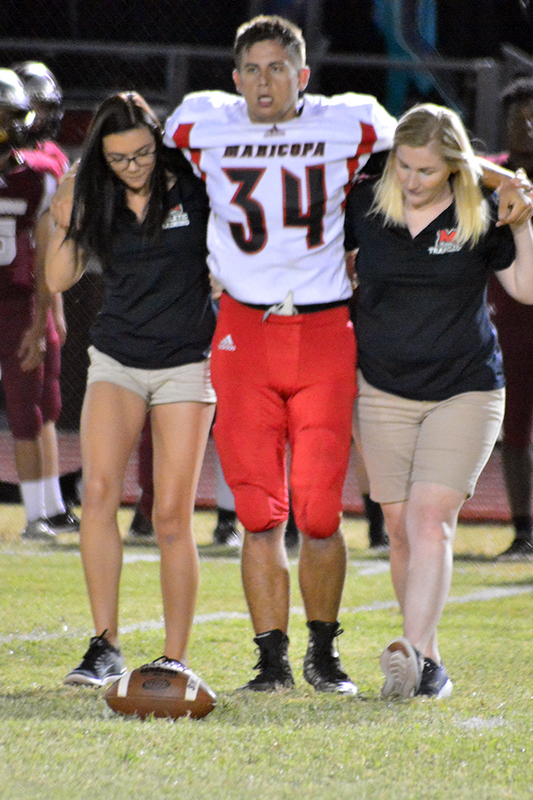 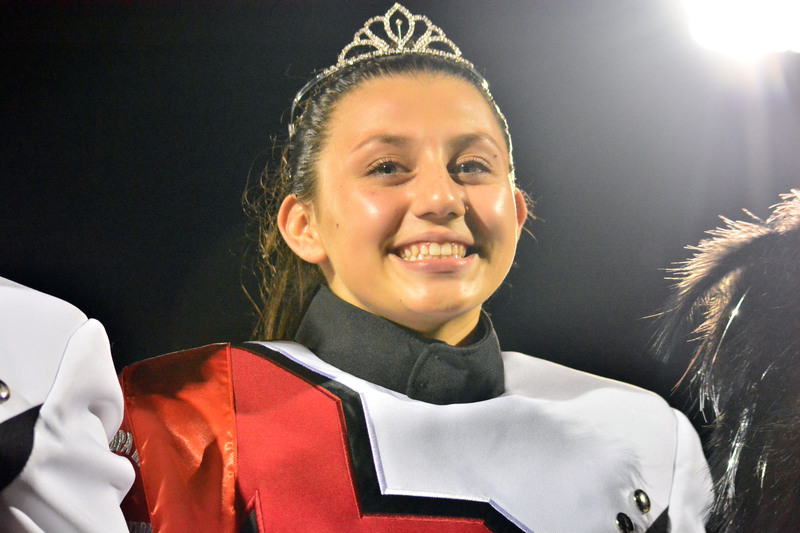 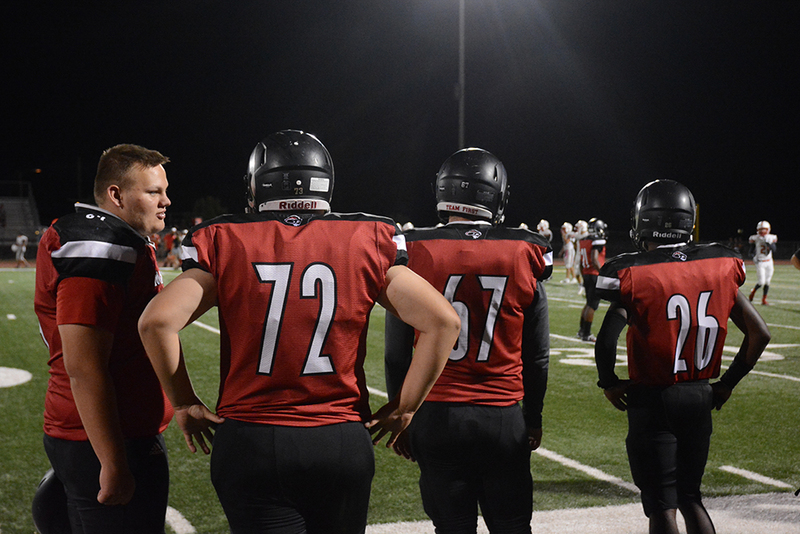 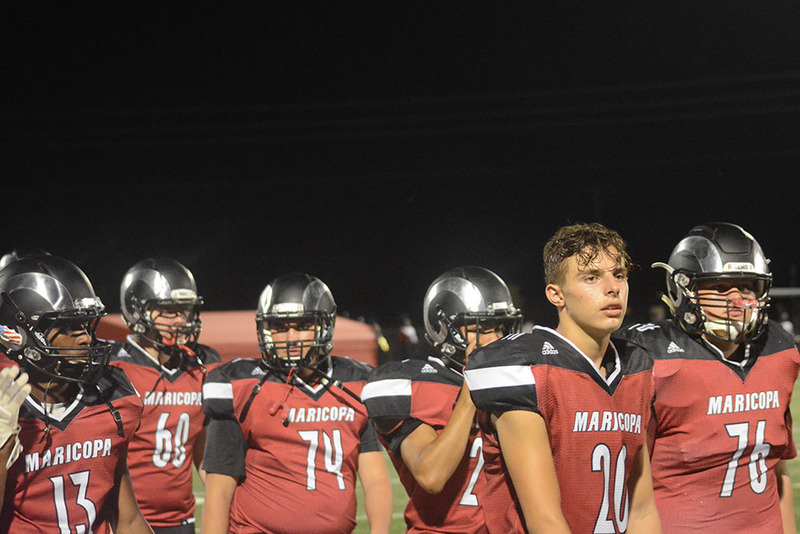 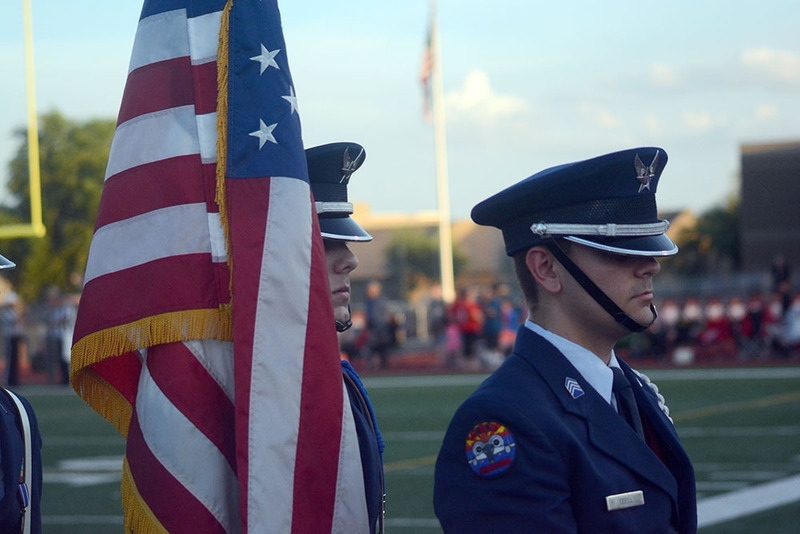 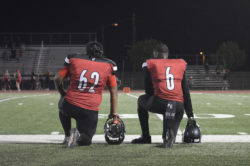 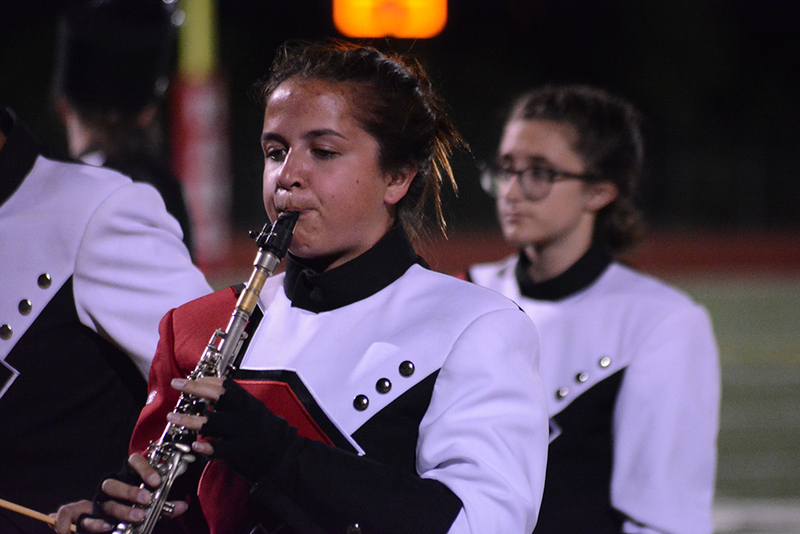 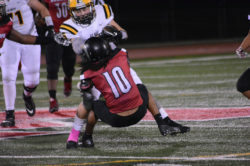 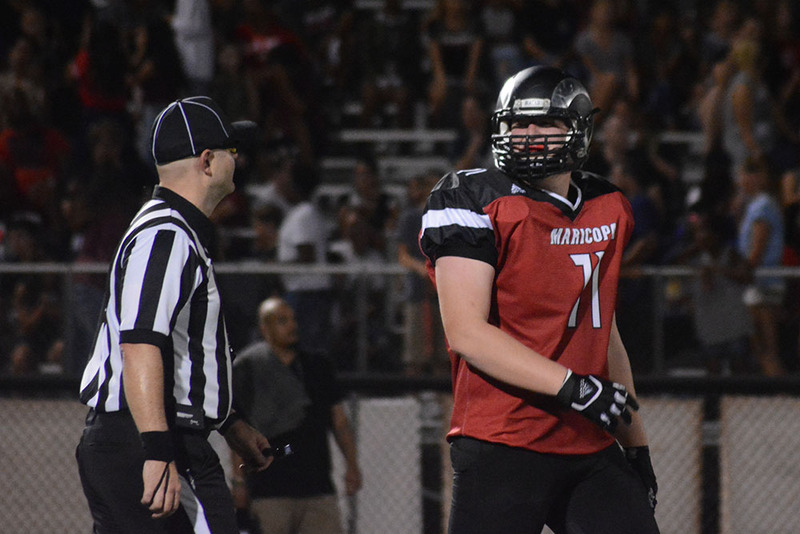 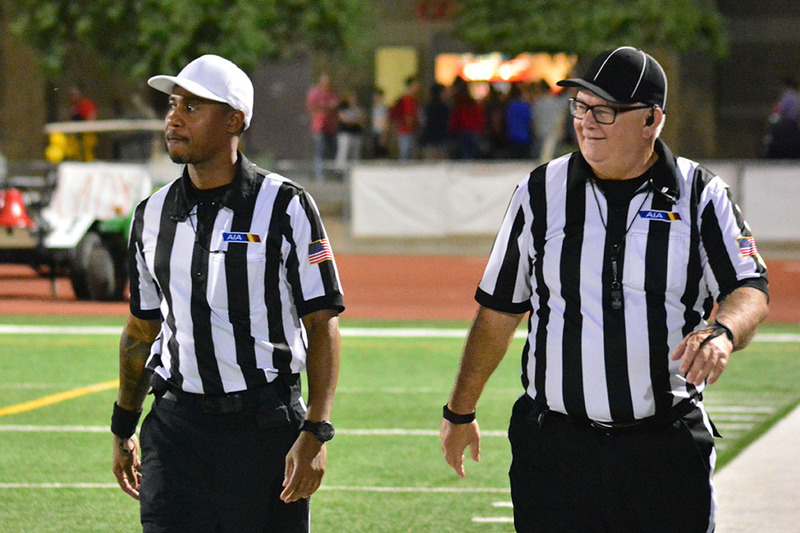 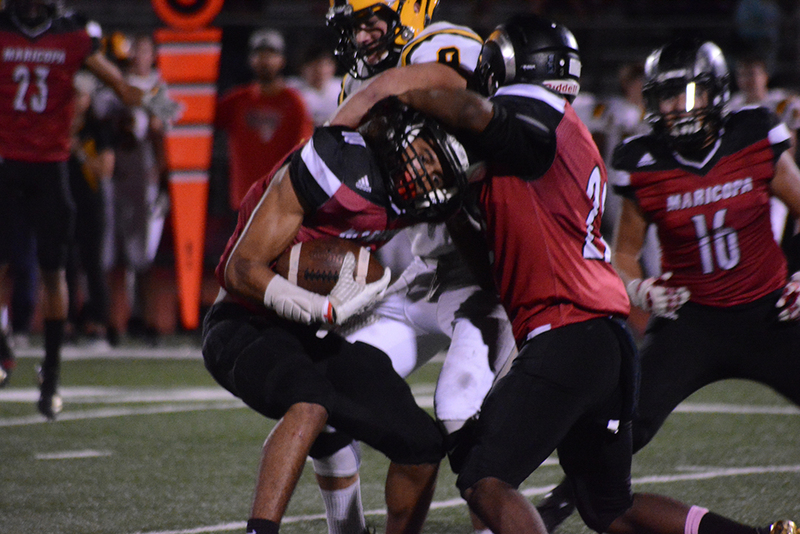 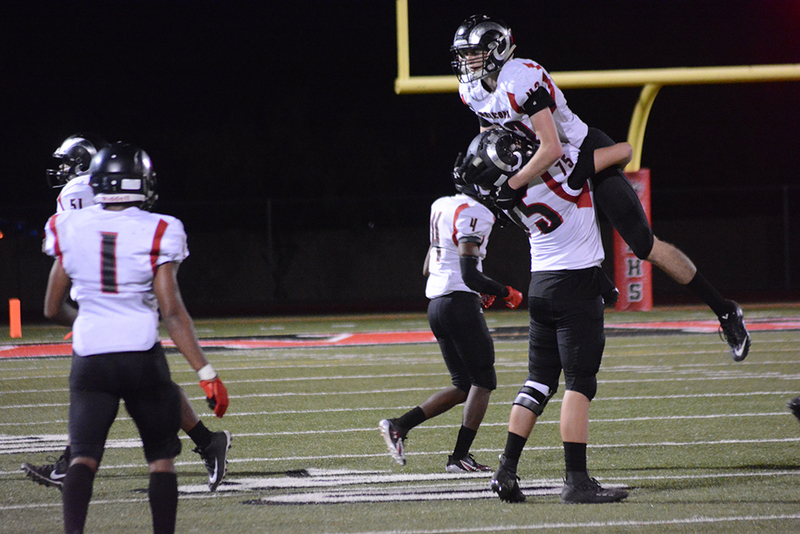 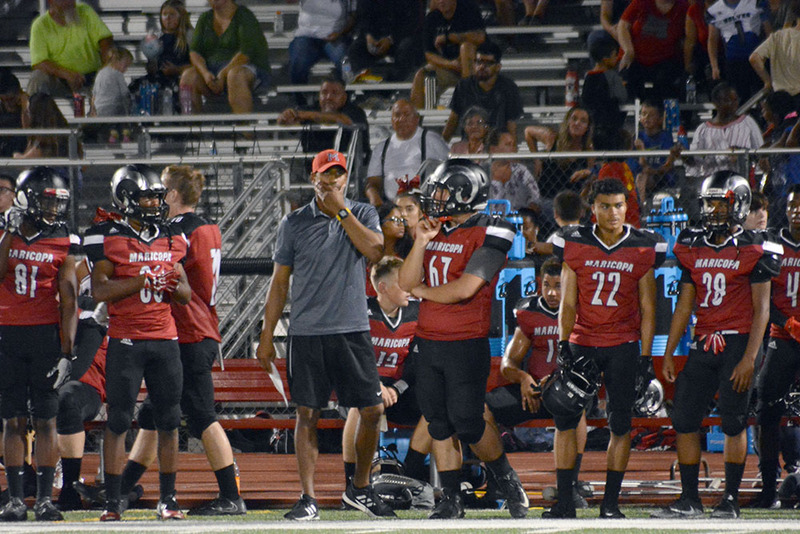 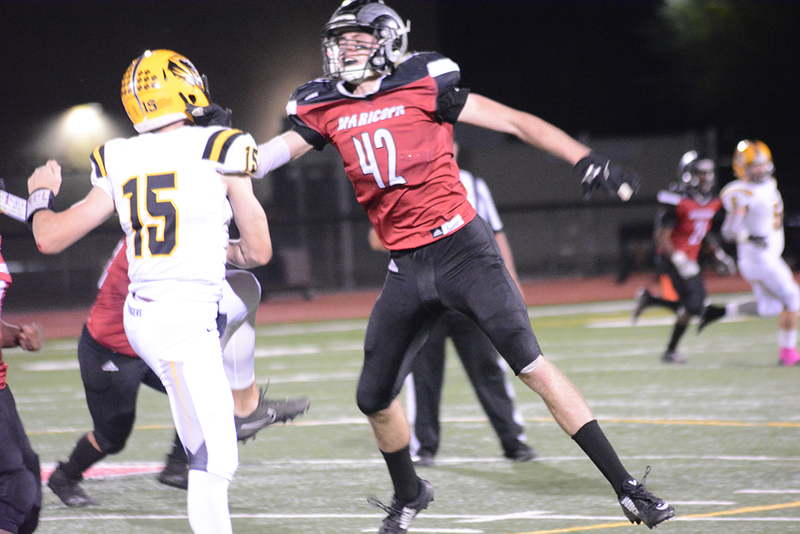 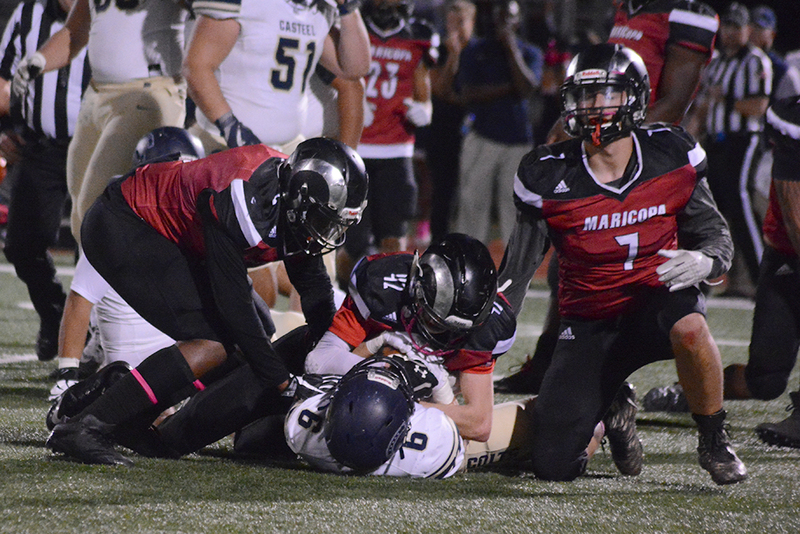 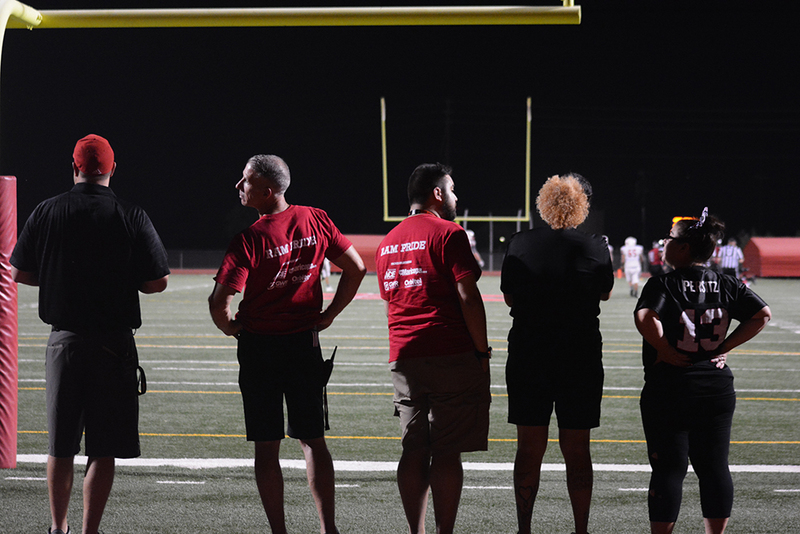 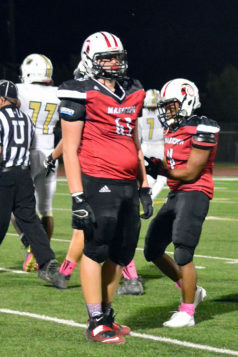 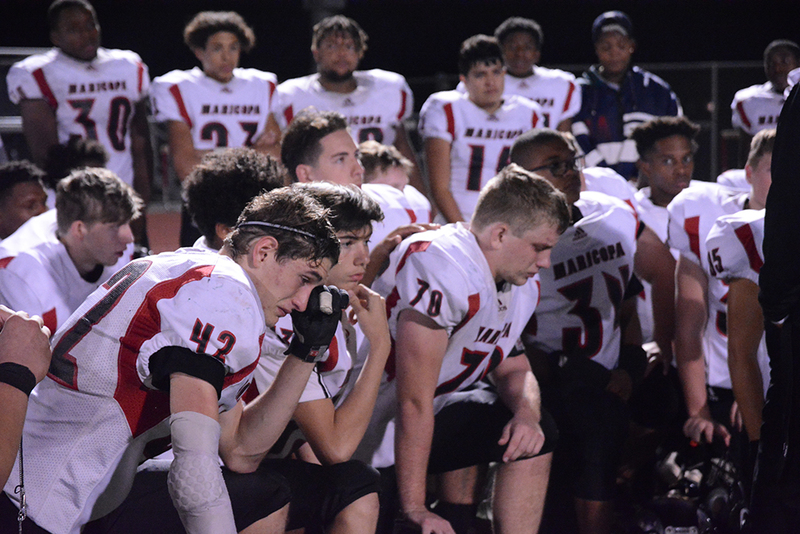 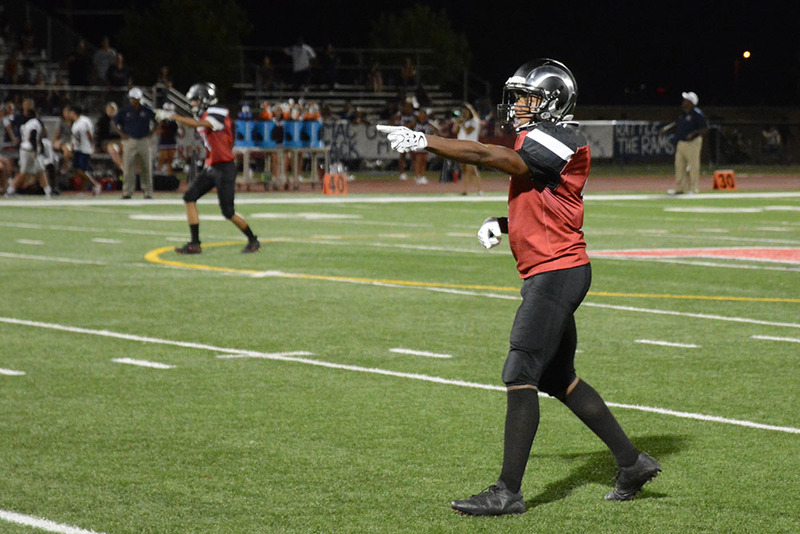 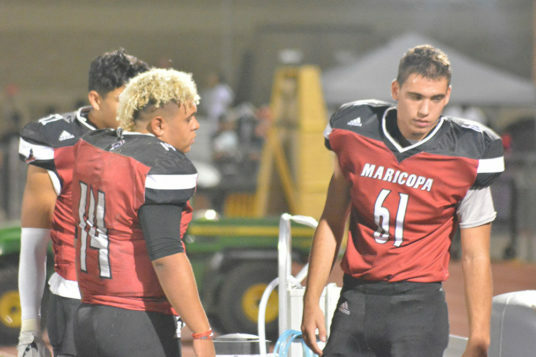 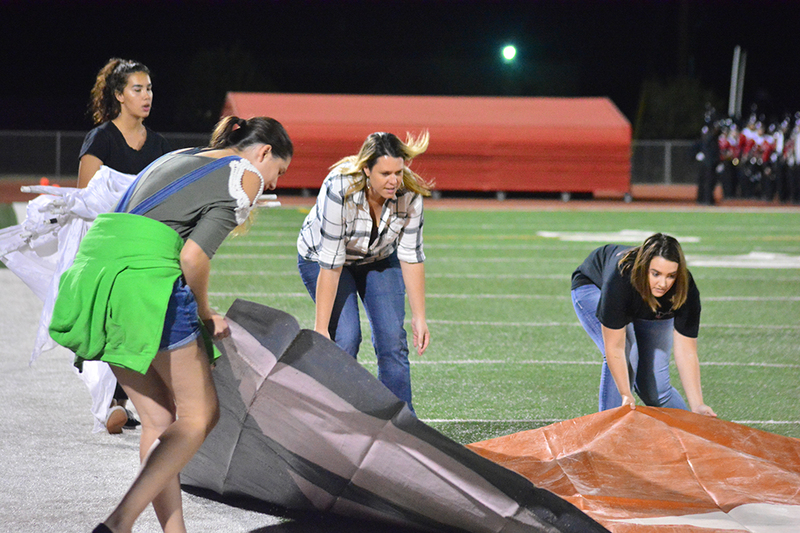 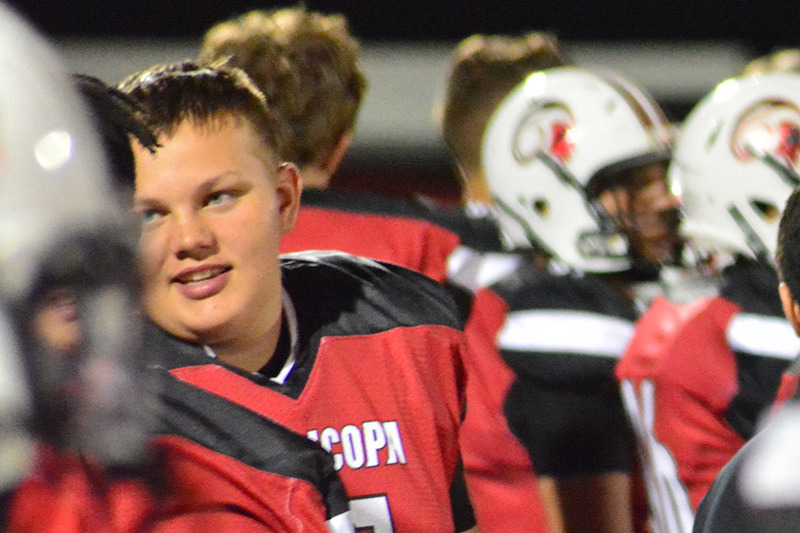 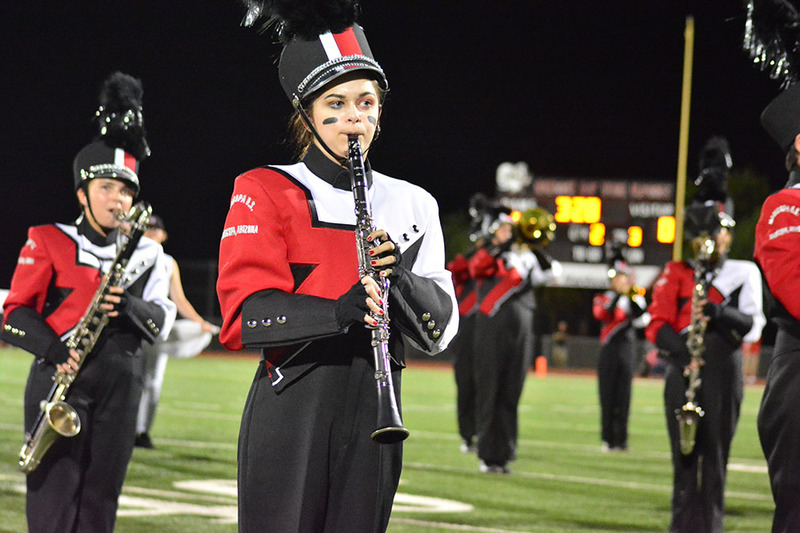 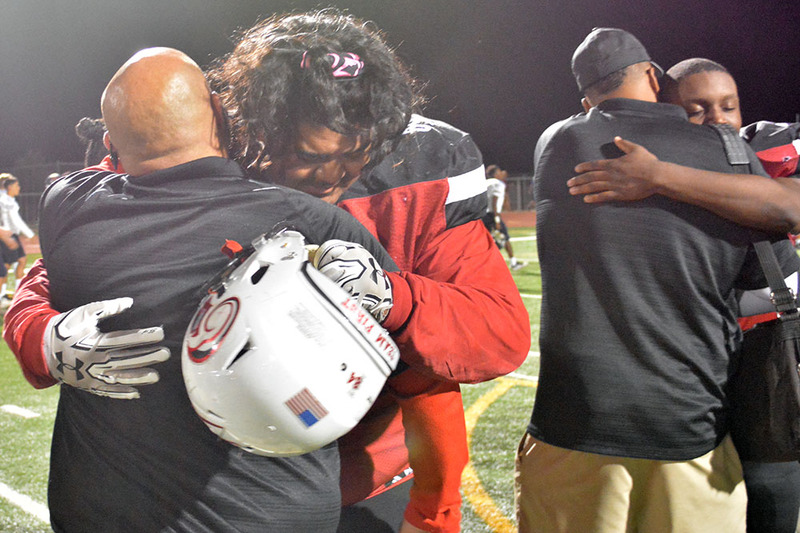 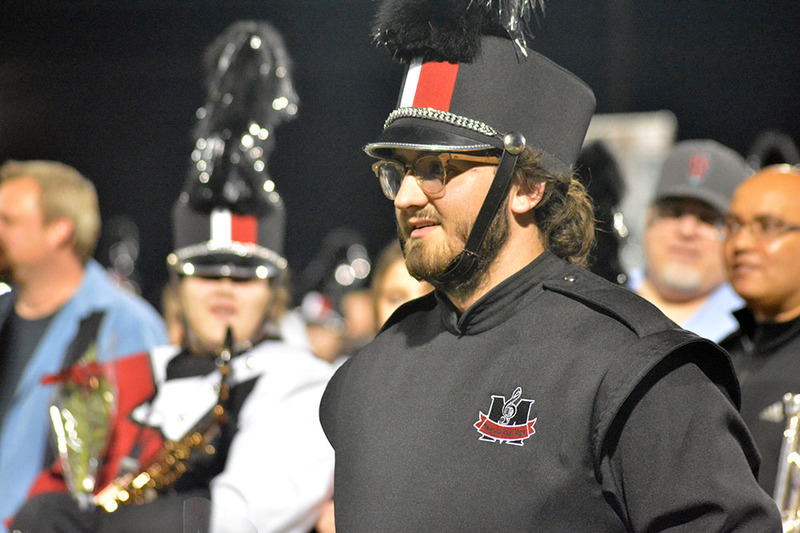 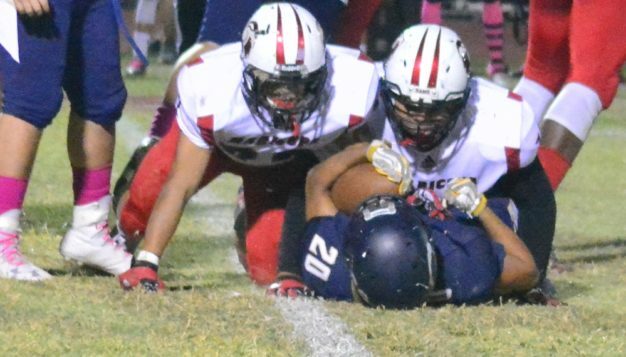 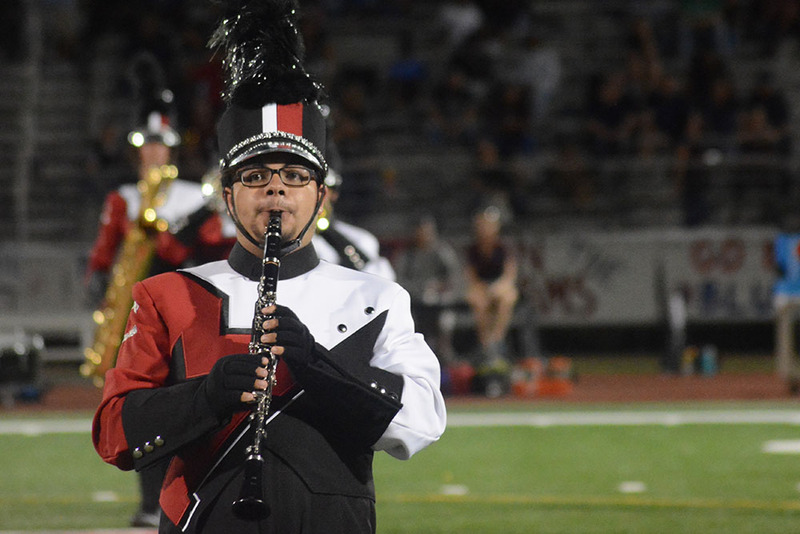 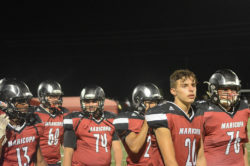 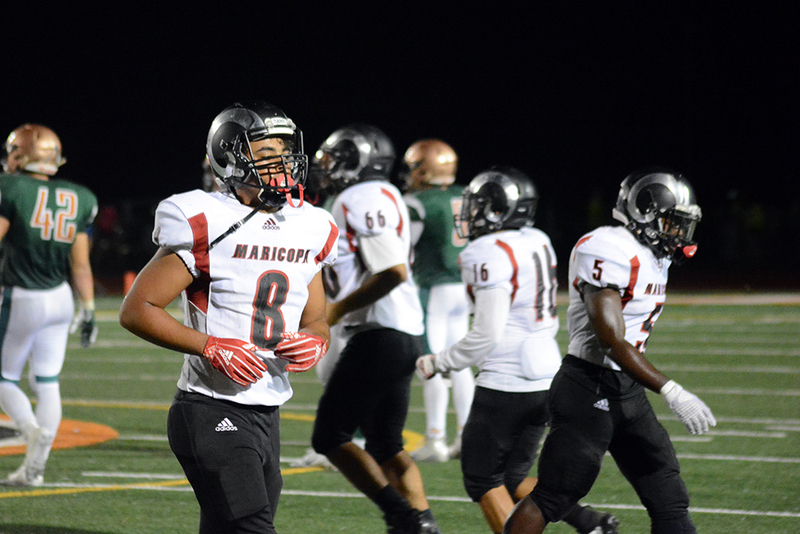 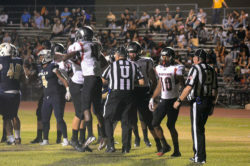 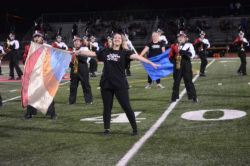 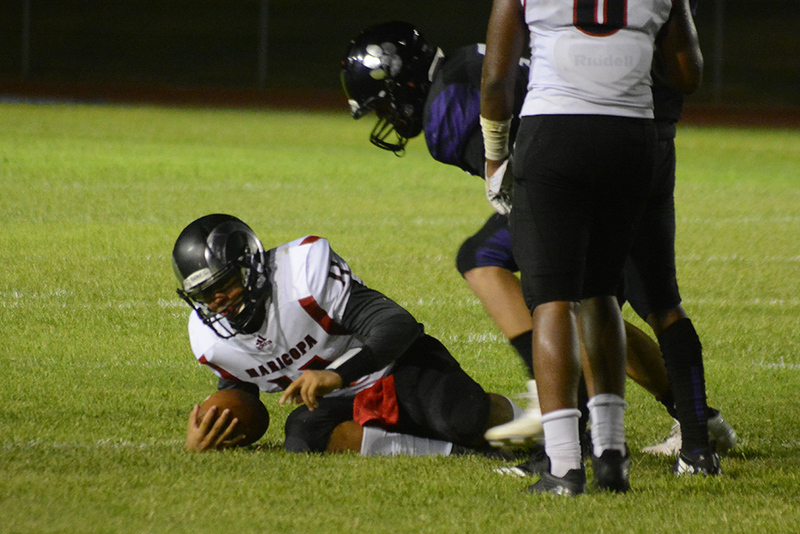 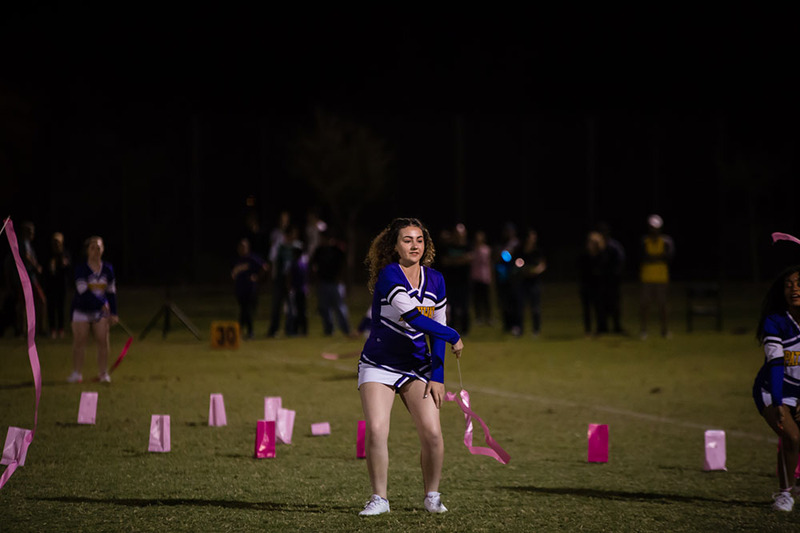 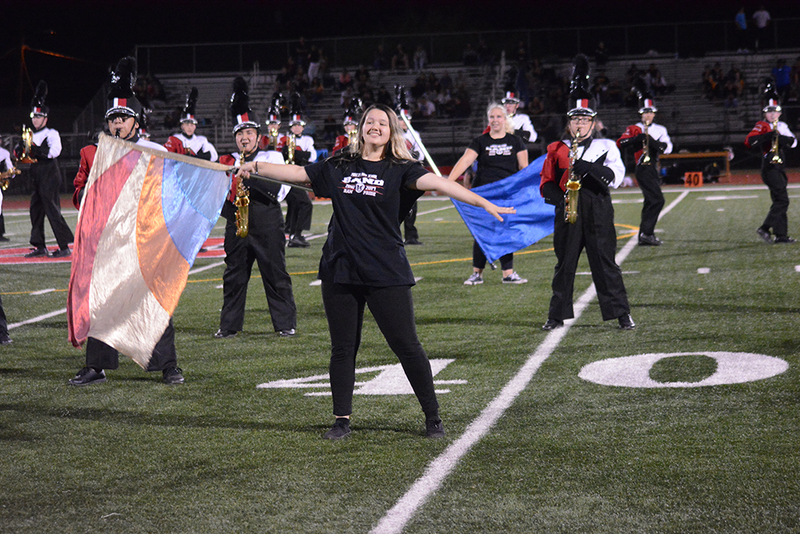 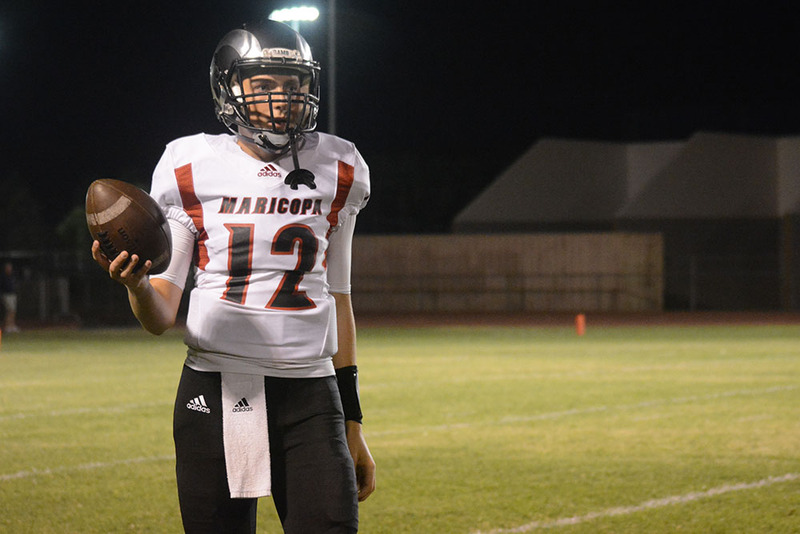 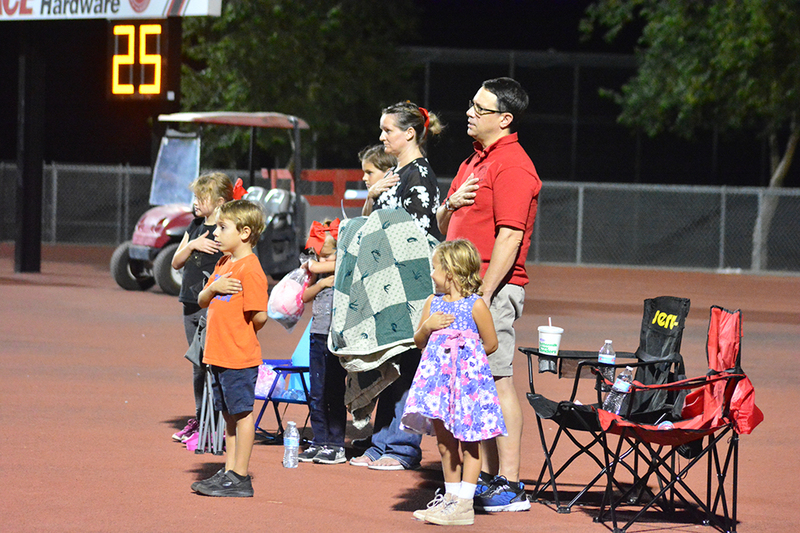 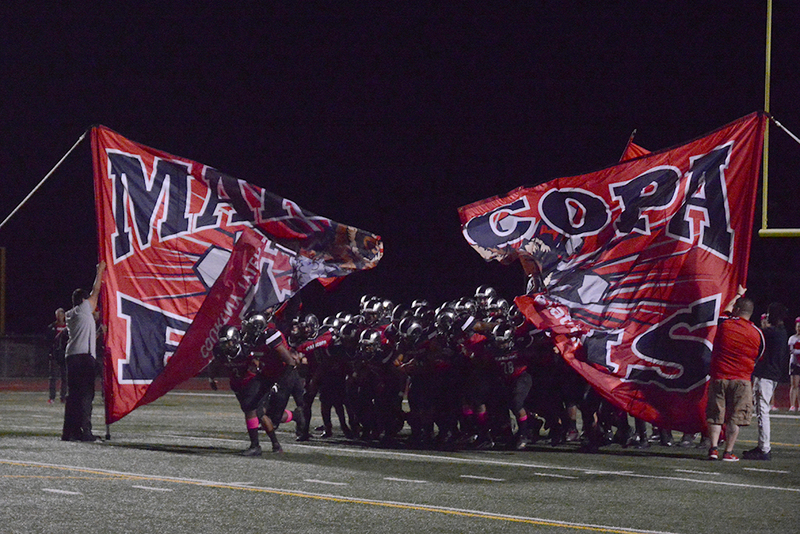 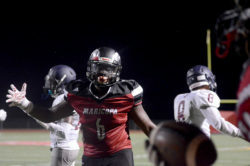 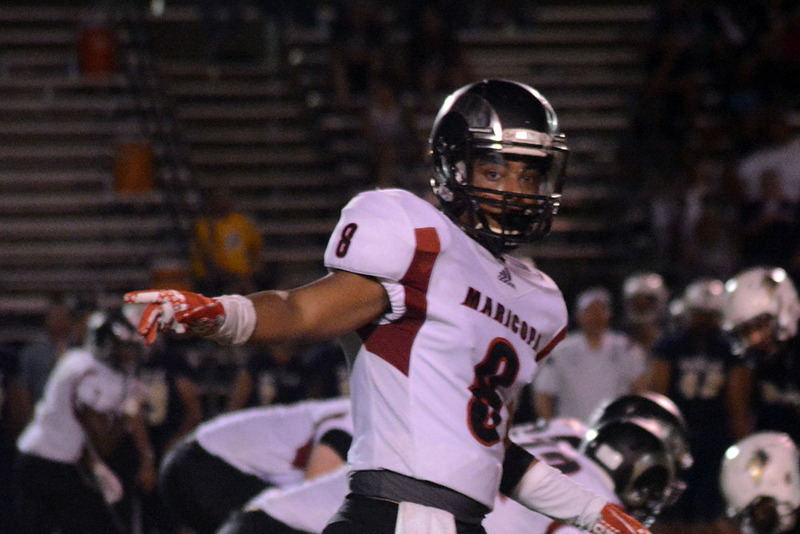 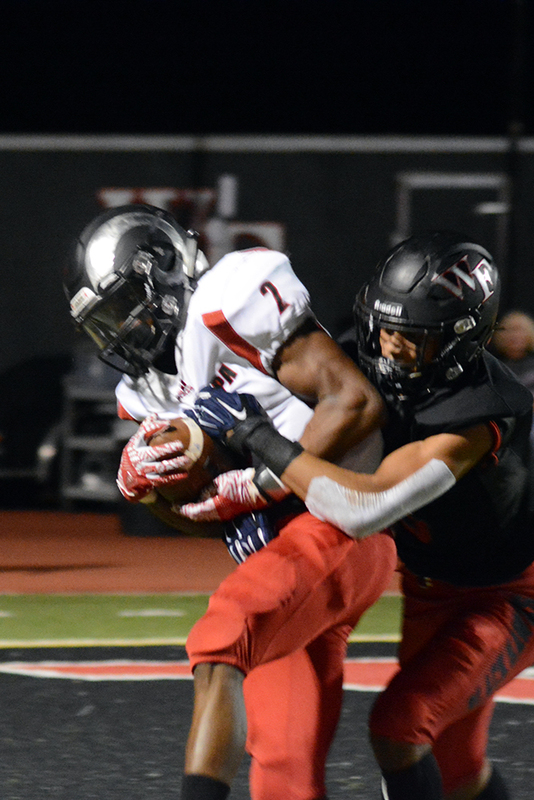 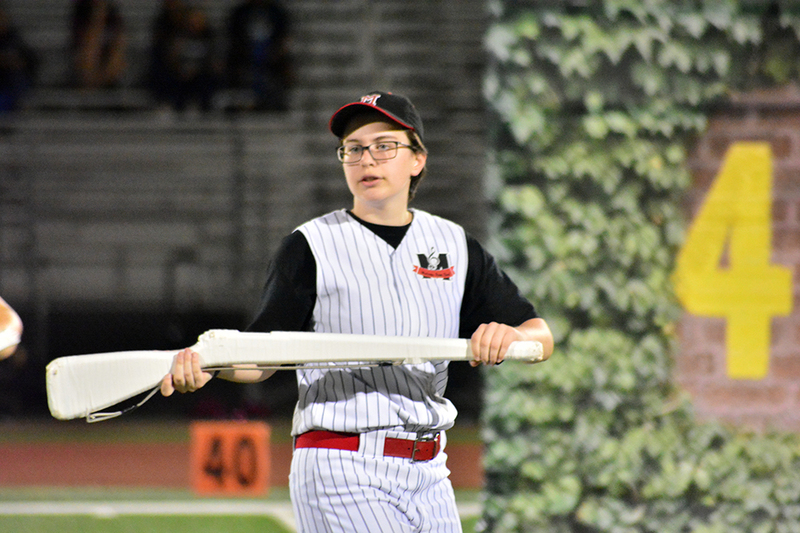 Along with missed assignments and inconsistent execution, flags for personal fouls and unsportsmanlike conduct marred the night for Maricopa. 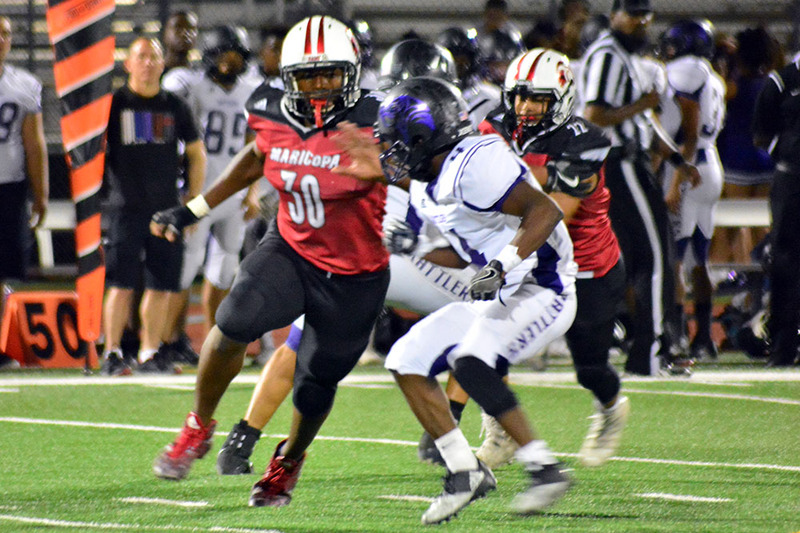 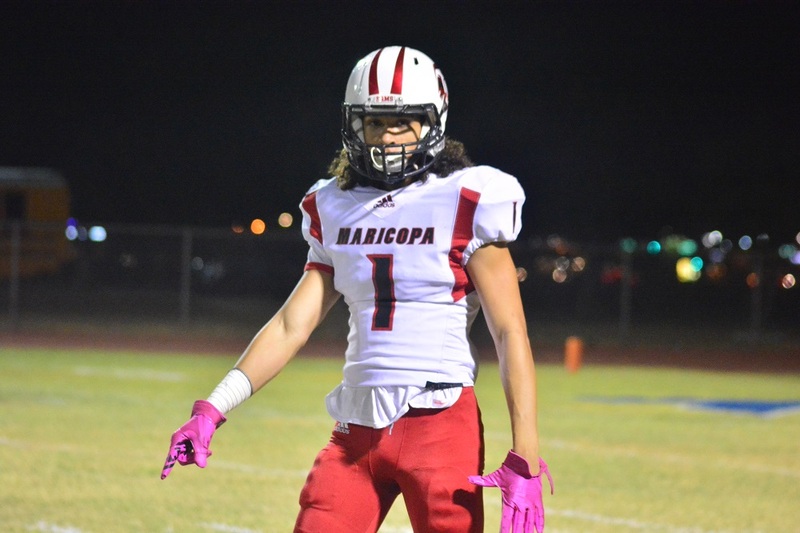 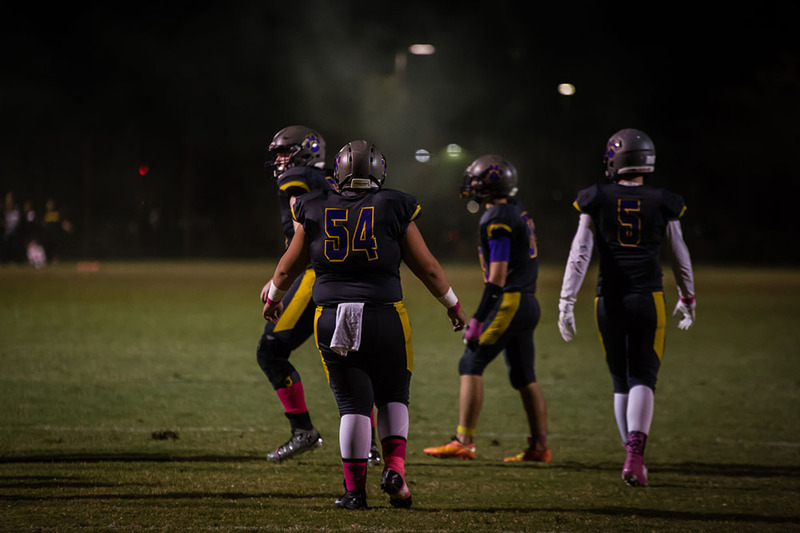 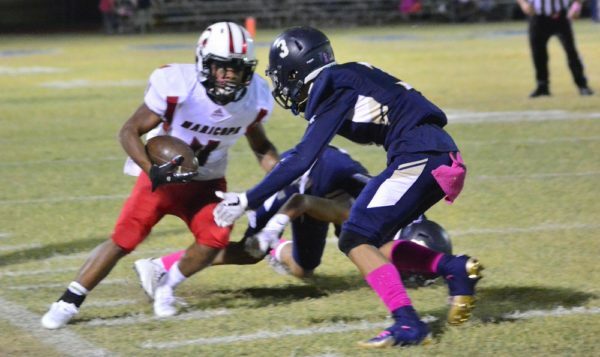 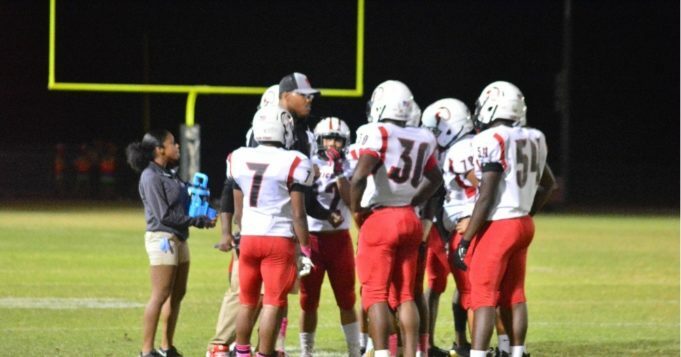 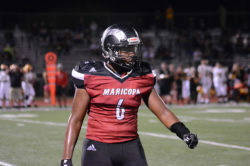 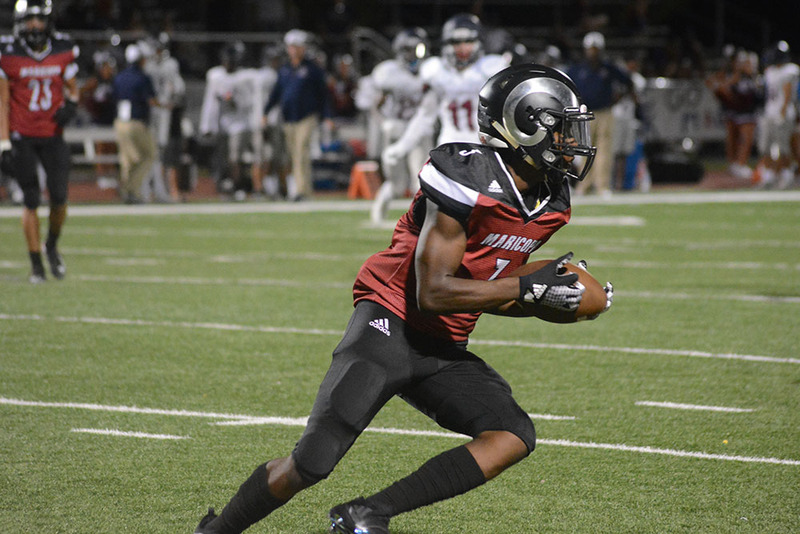 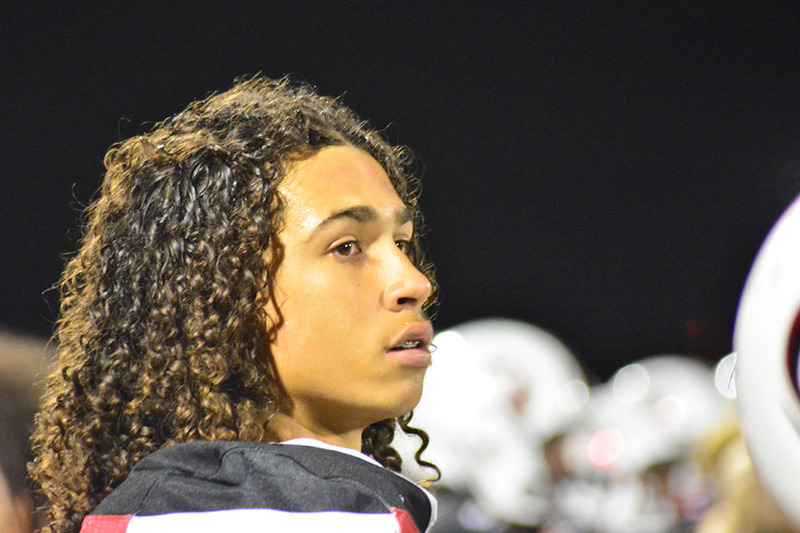 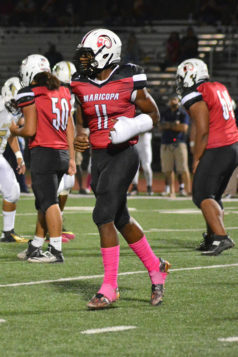 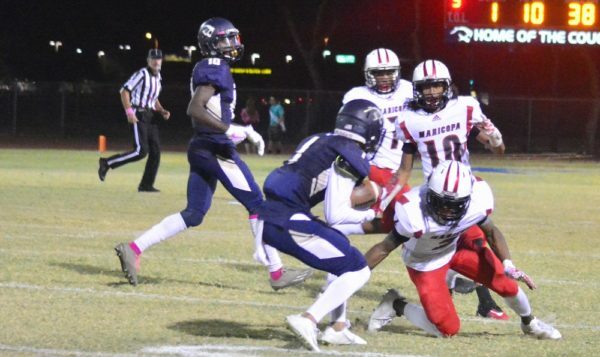 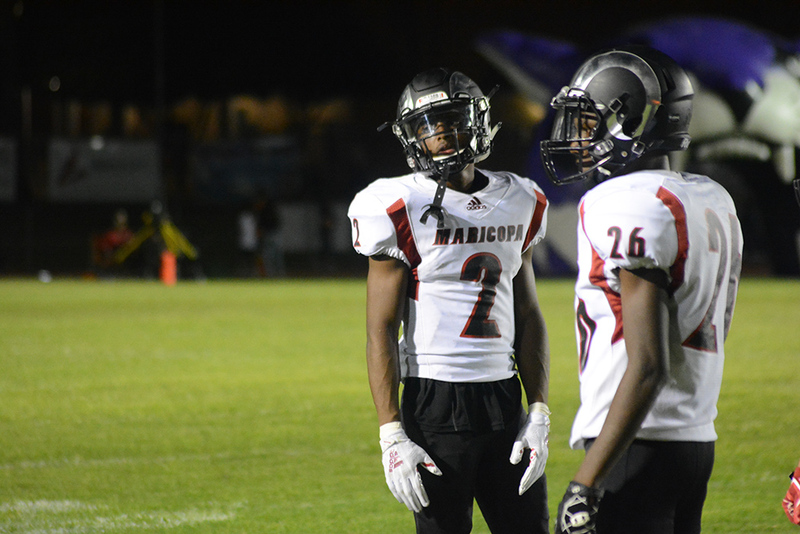 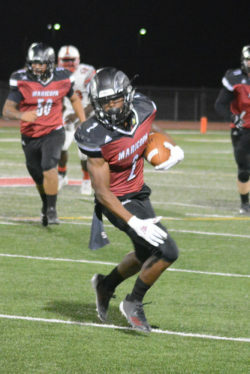 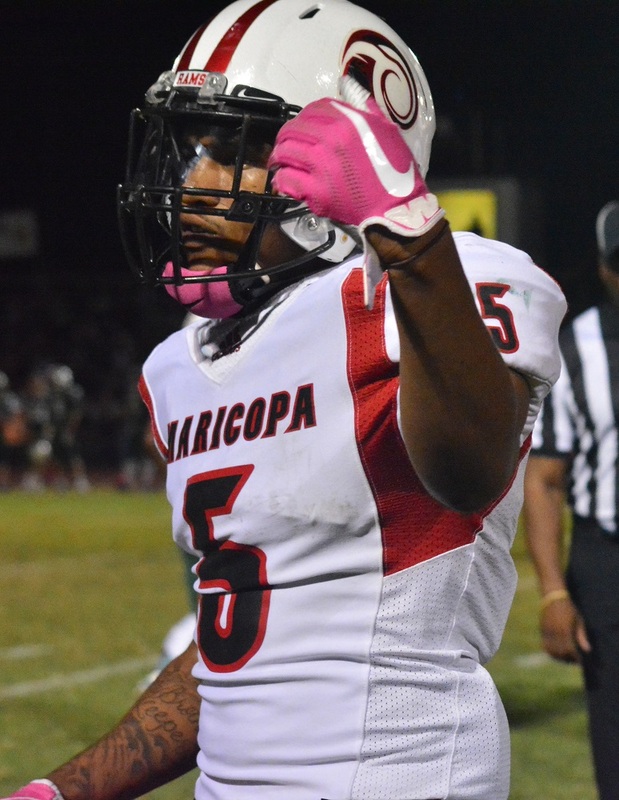 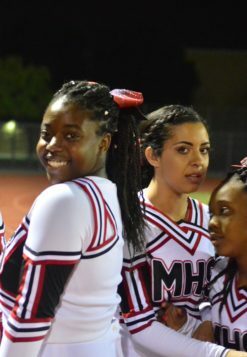 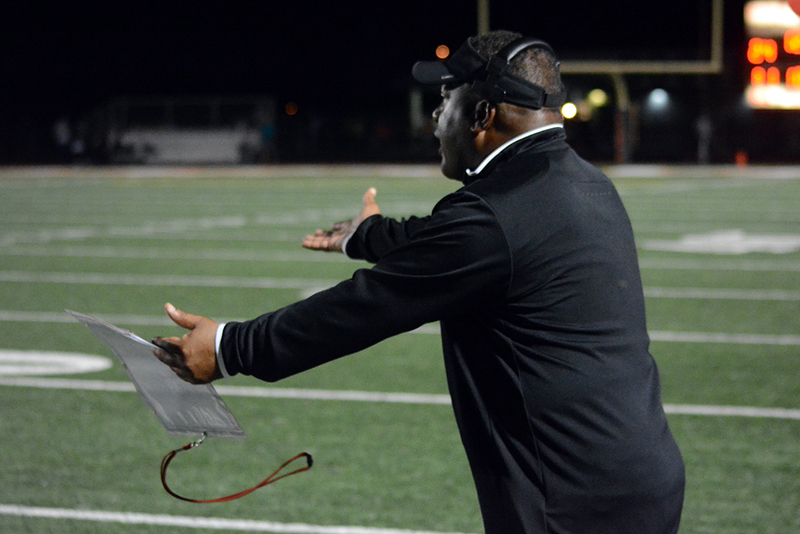 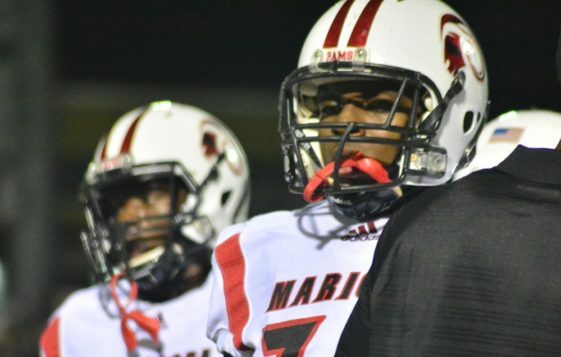 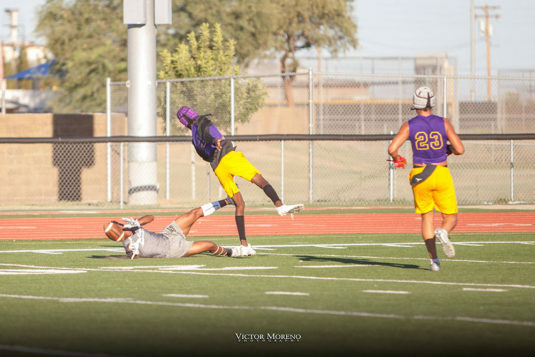 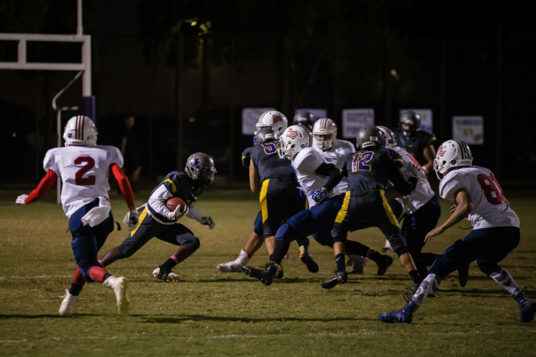 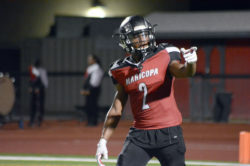 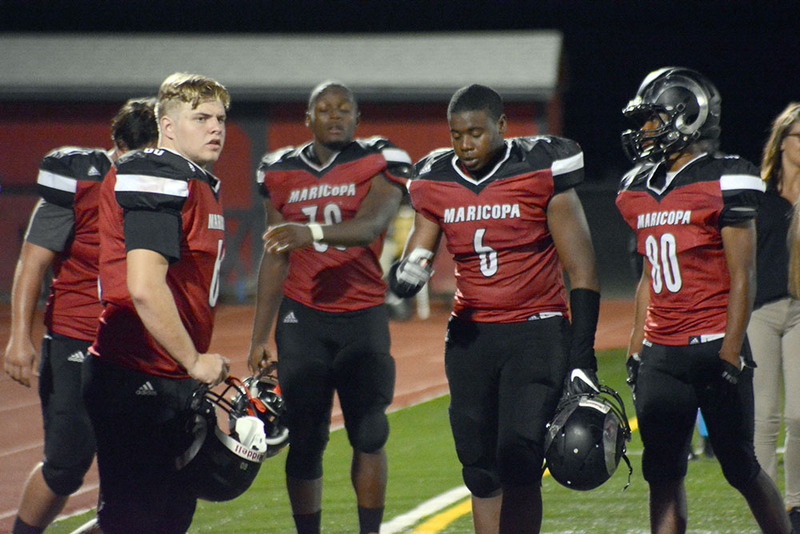 “Disrespecting the game, disrespecting the city of Maricopa, the school, not representing ourselves on the field well,” Harris listed his issues with what occurred. He said it came as a surprise to him and did not reflect the team’s preparations for the game. The Rams scored on their first possession with a 31-yard run by sophomore Mister Chavis and never relinquished the lead. 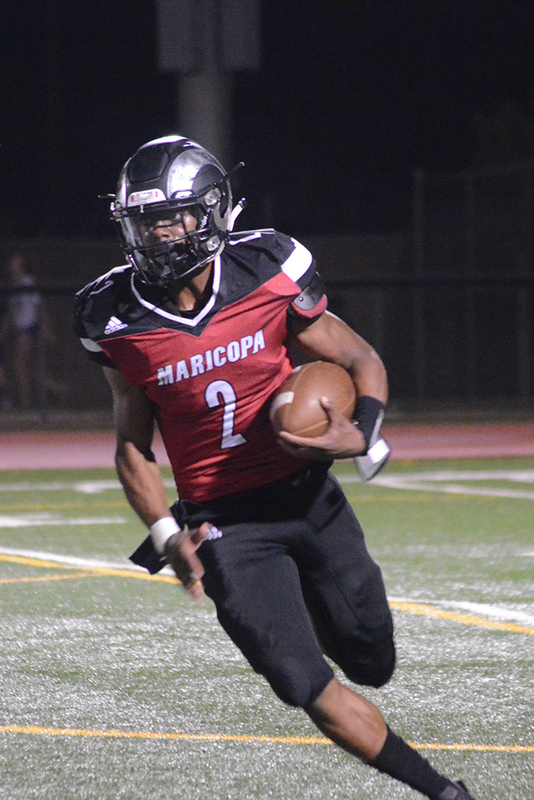 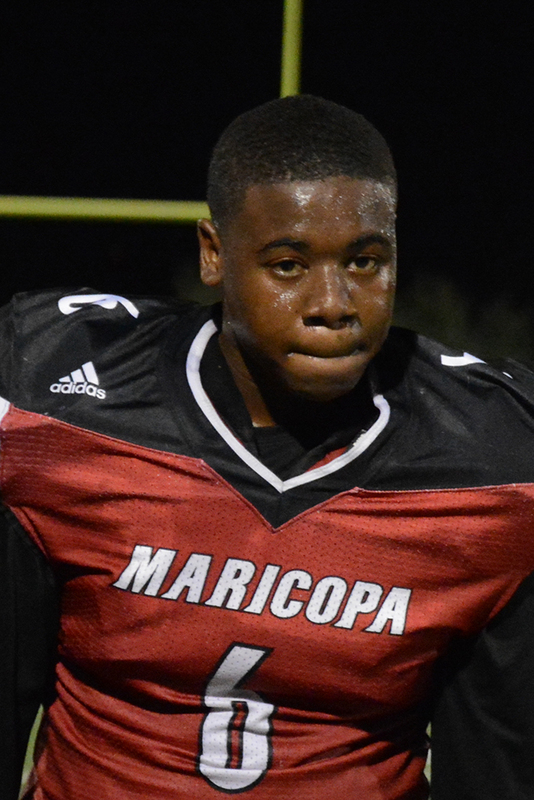 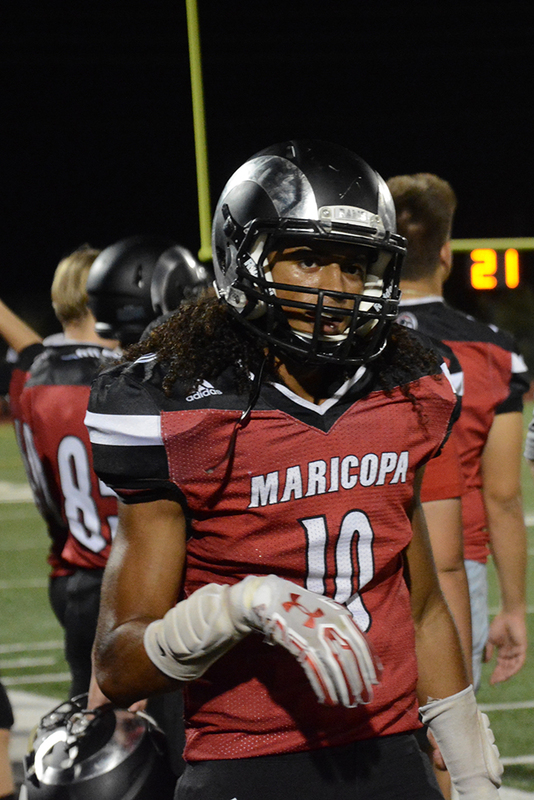 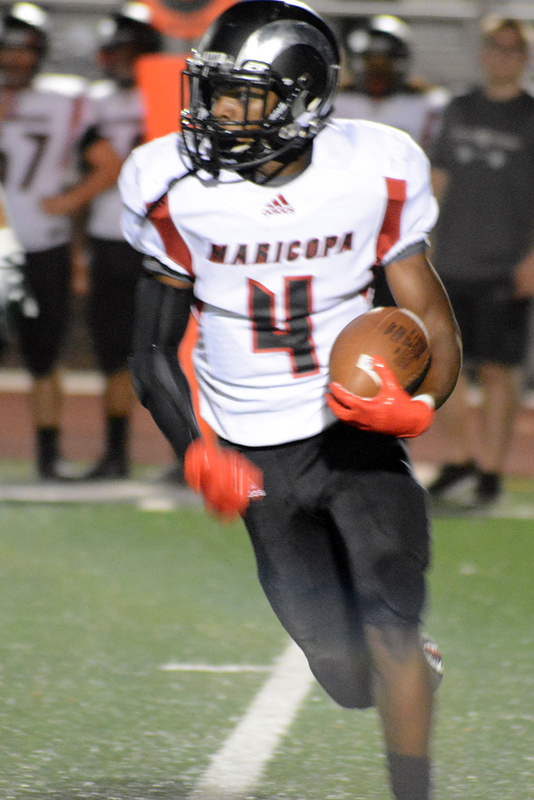 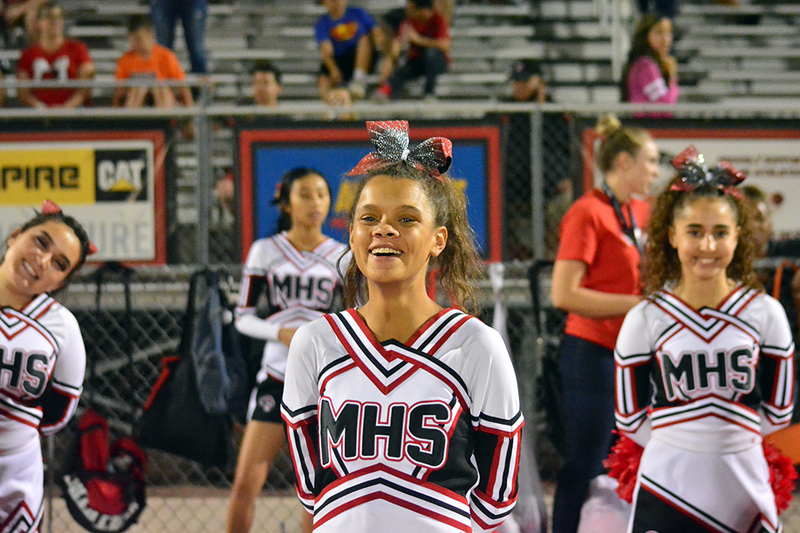 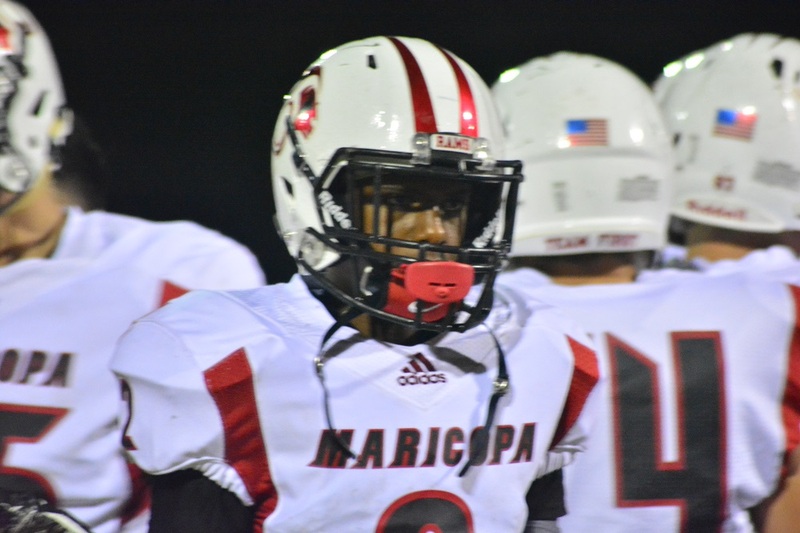 Maricopa scored again early in the second quarter on a 2-yard run by senior Kaireem Moreira. 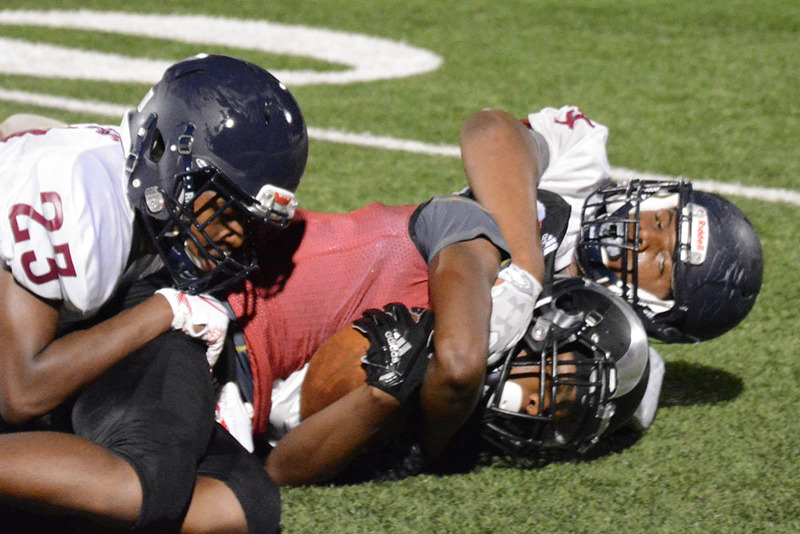 The Jaguars turned a fumble recovery into a quick passing touchdown late in the second. 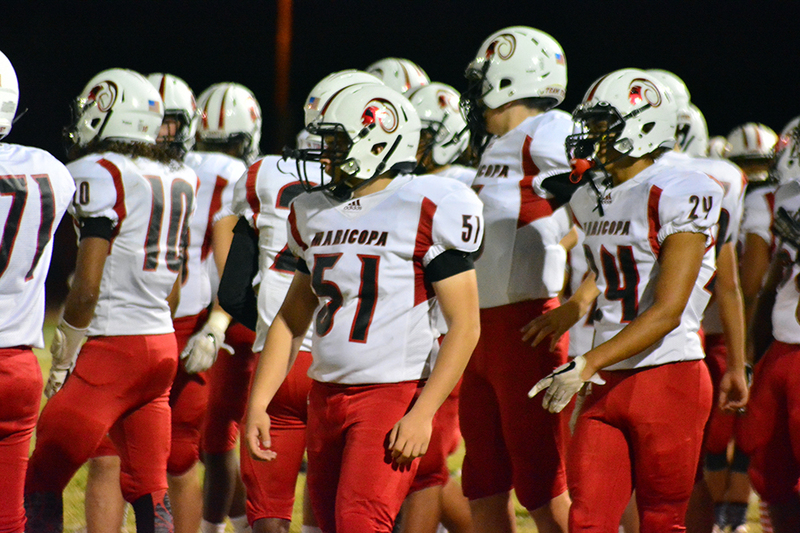 After blocking the point-after kick attempt, Maricopa went into halftime with a 14-6 lead. 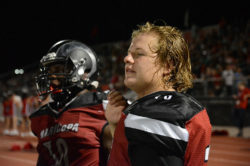 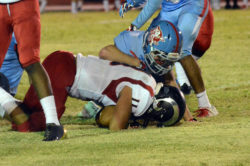 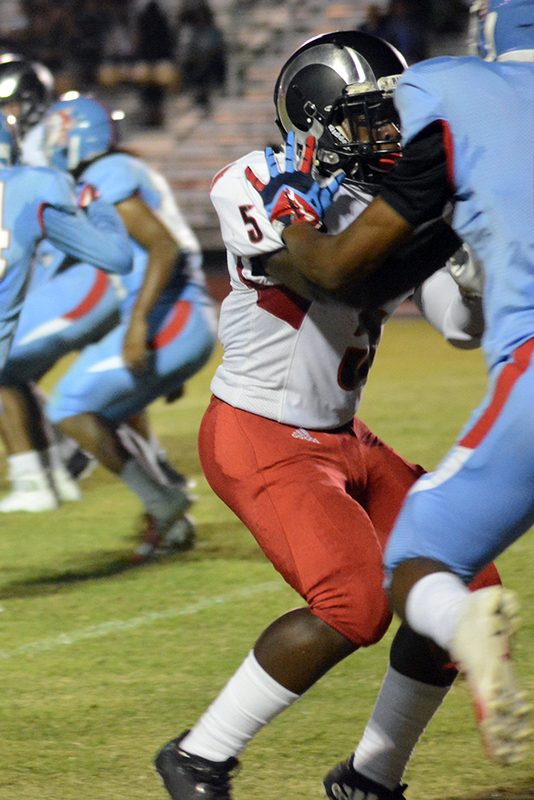 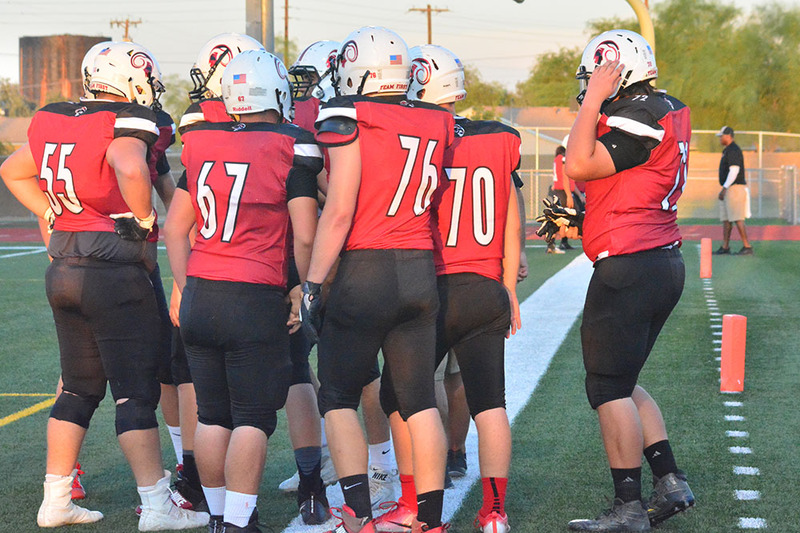 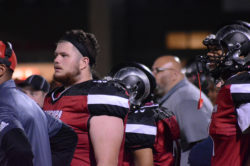 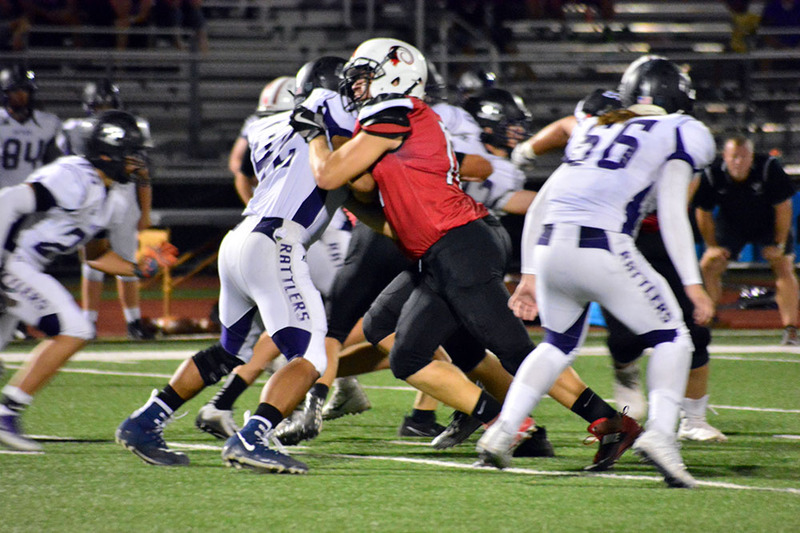 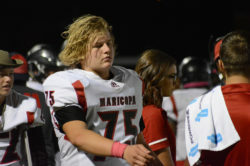 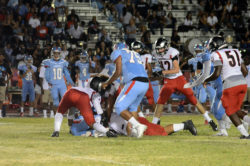 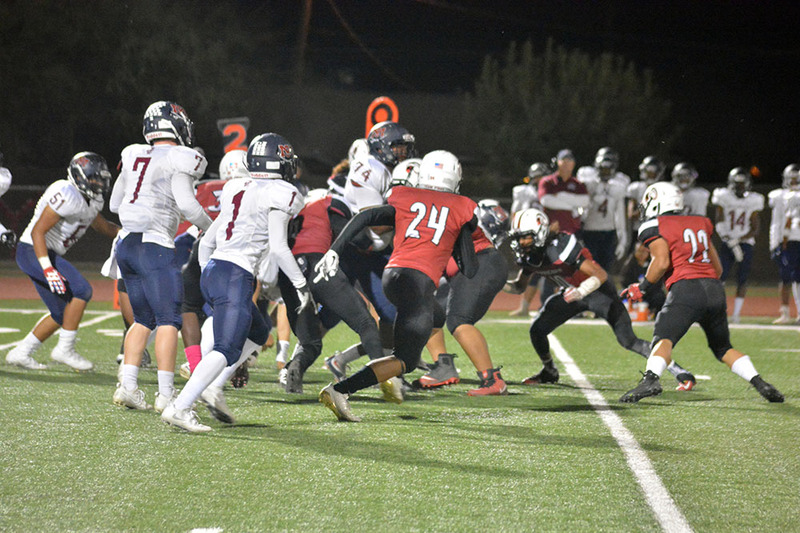 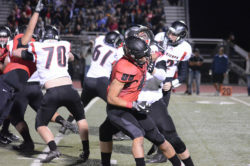 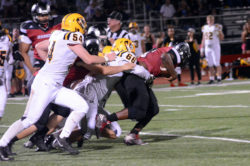 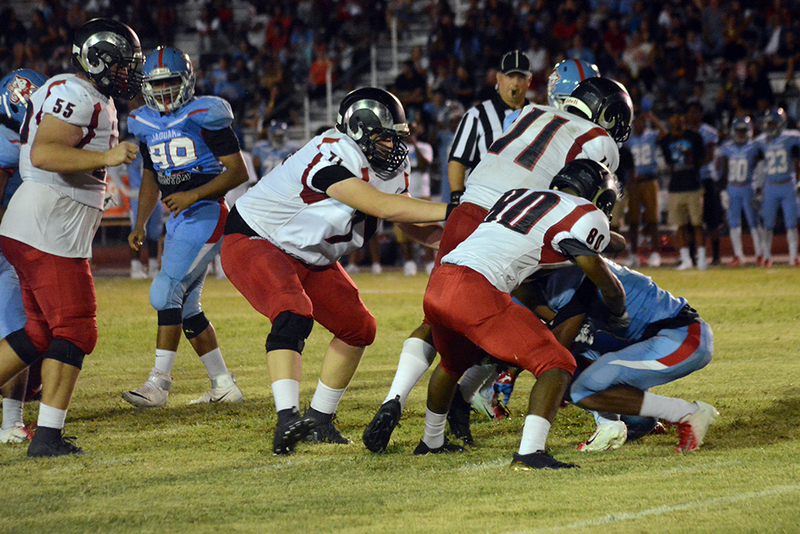 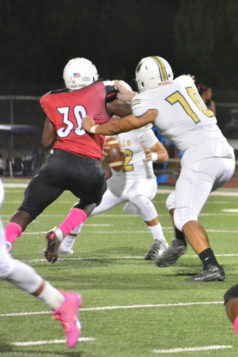 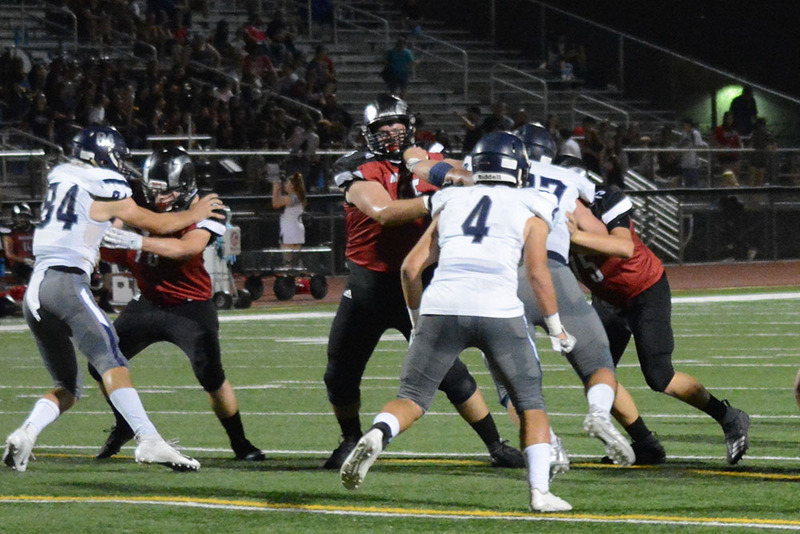 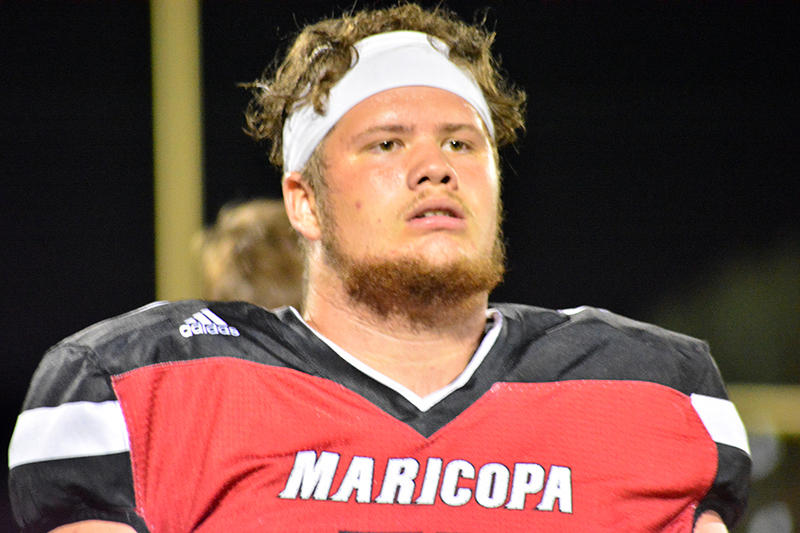 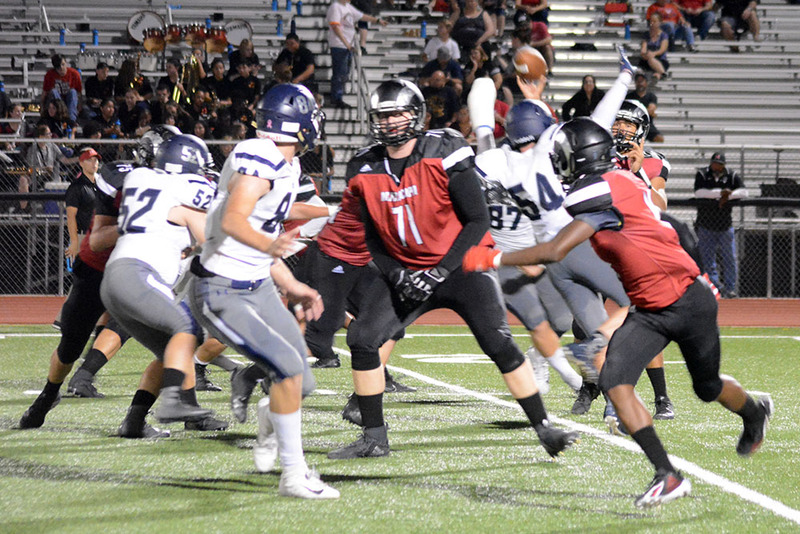 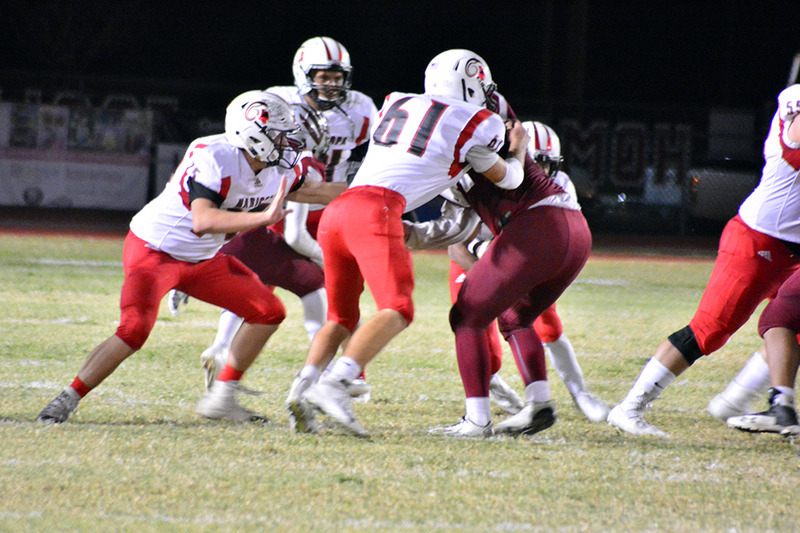 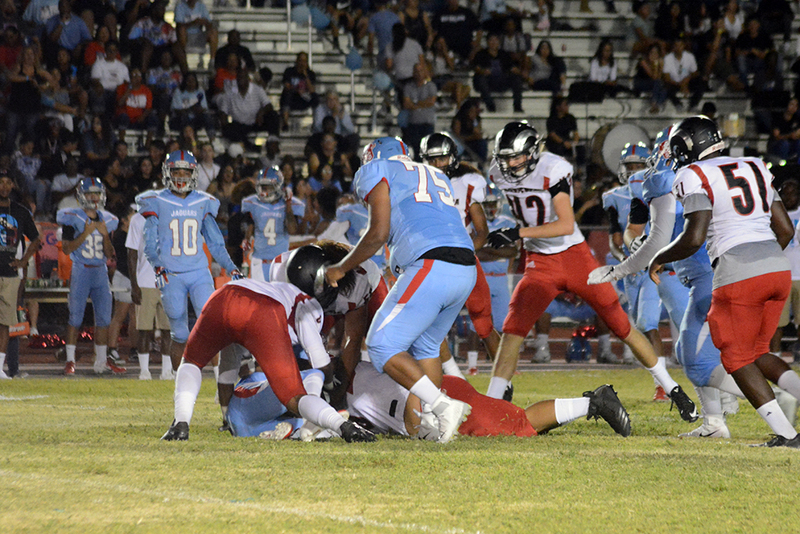 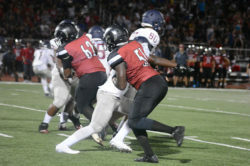 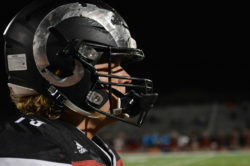 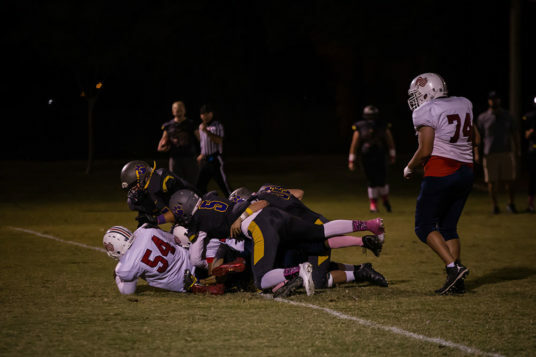 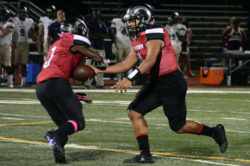 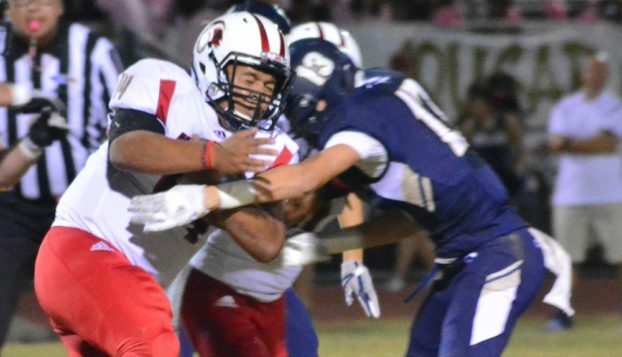 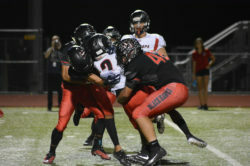 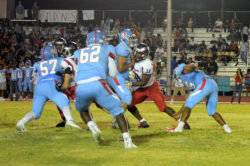 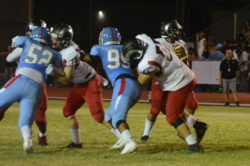 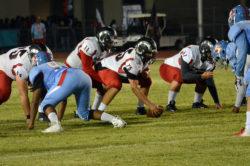 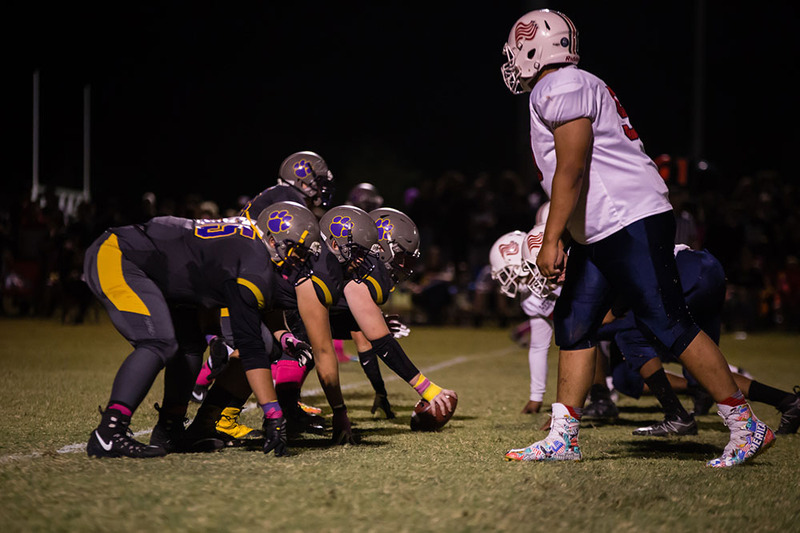 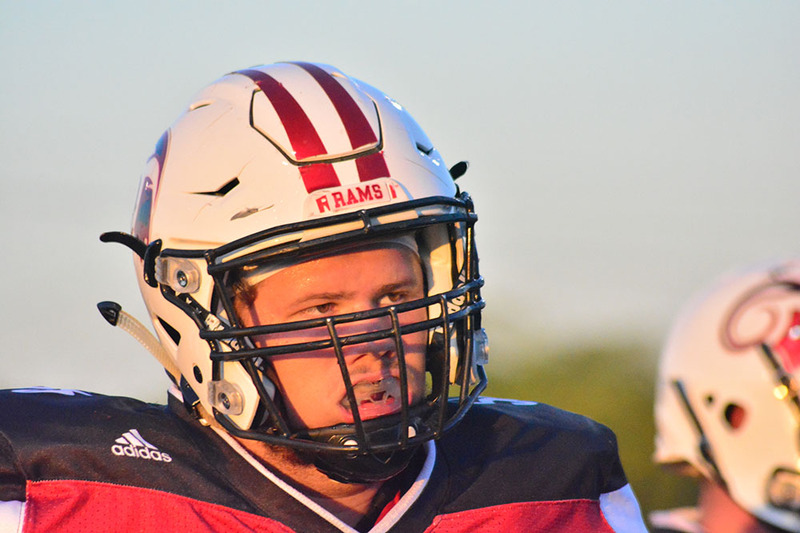 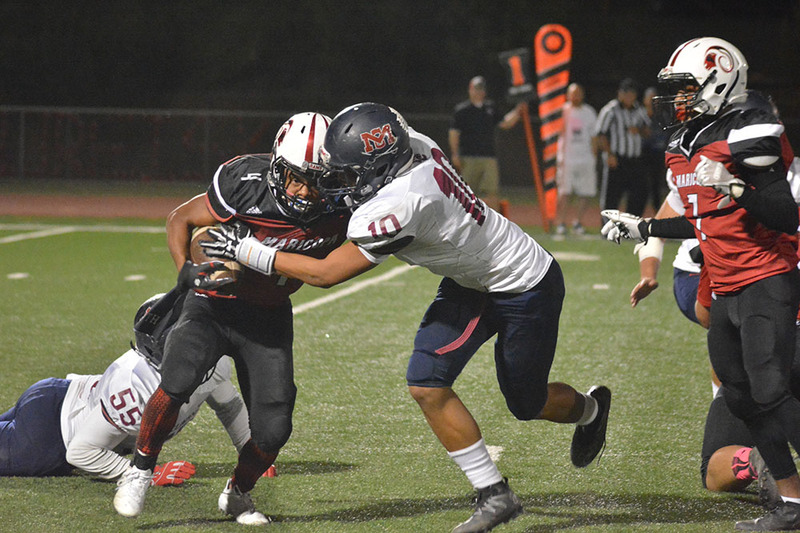 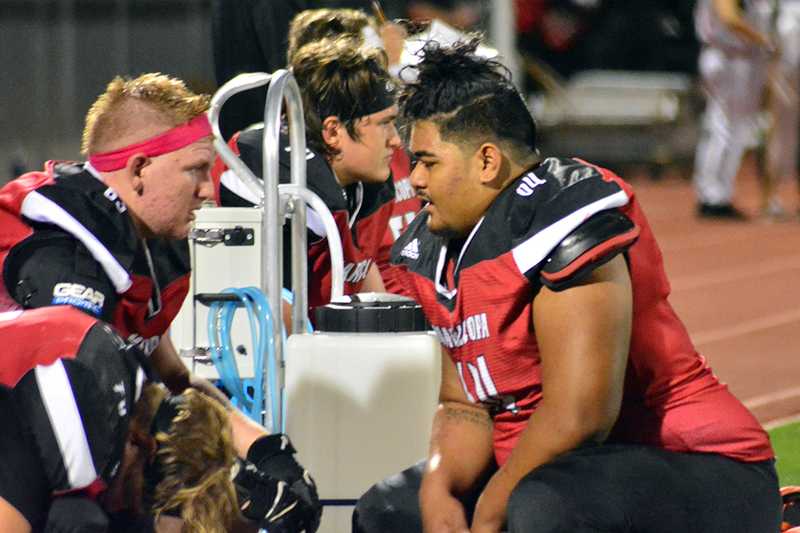 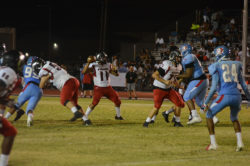 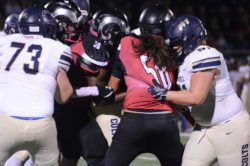 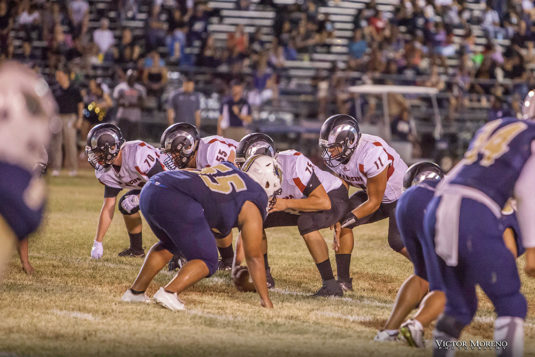 While the Rams relied more heavily on the legs of quarterback Jordan Huddleston than his arm, the Maricopa defensive line stymied South Mountain’s ground attack. Jags quarterback Roghon Arnold had the ball in the air most of the second half. 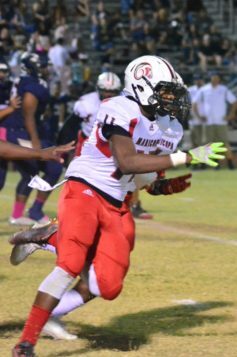 That included a 16-yard touchdown pass to Marvin Cotton to edge close to Maricopa, 14-12, at the start of the fourth quarter. 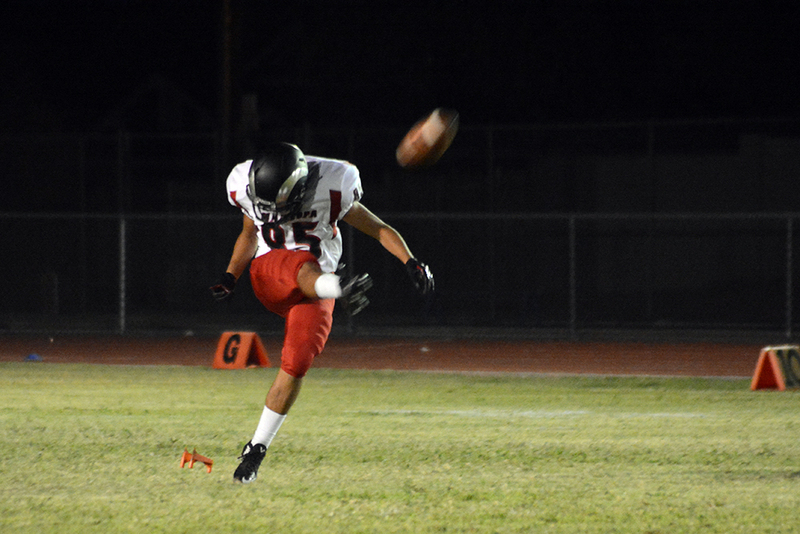 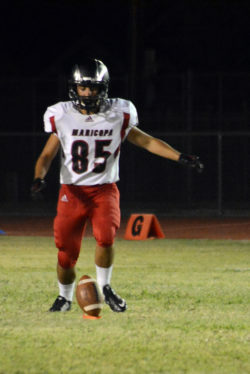 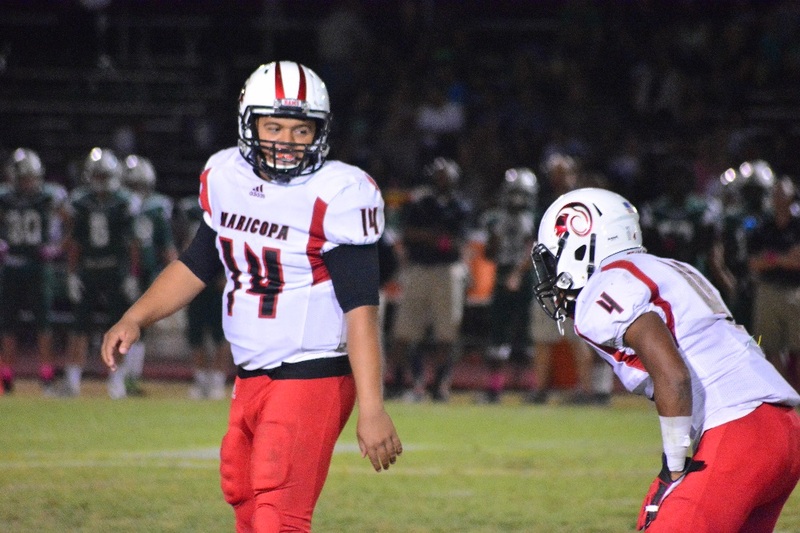 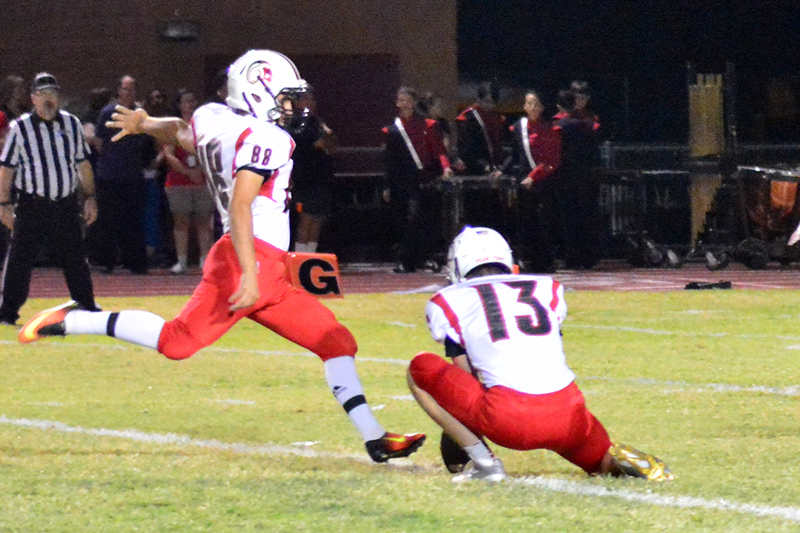 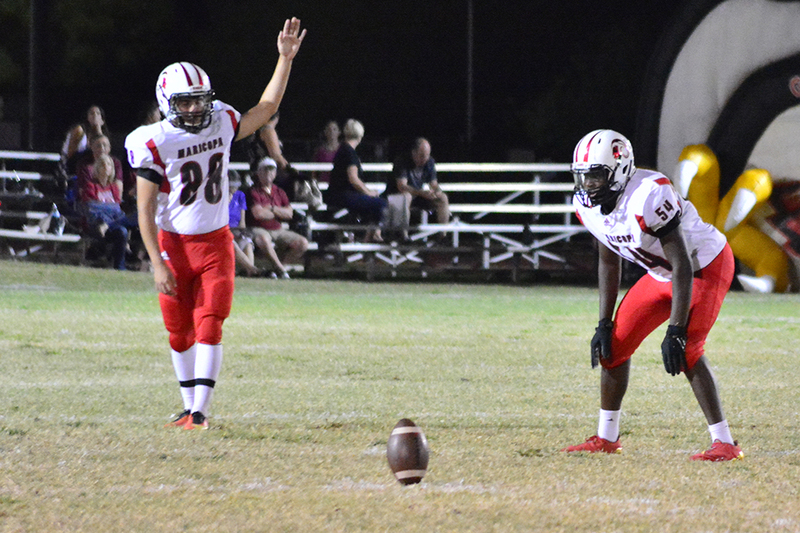 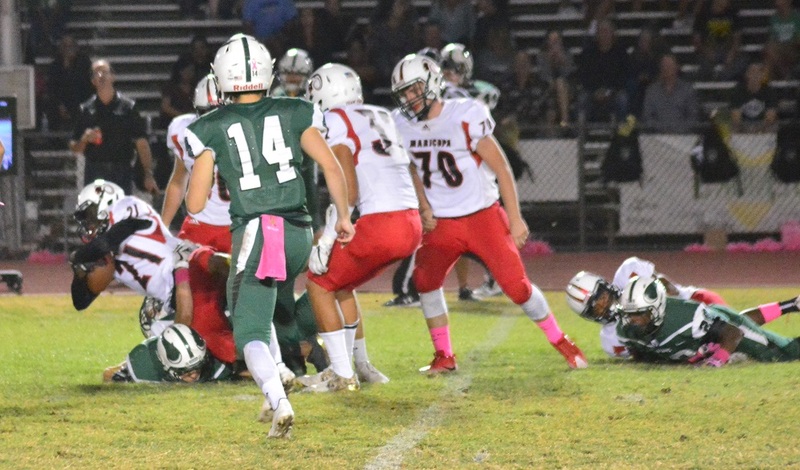 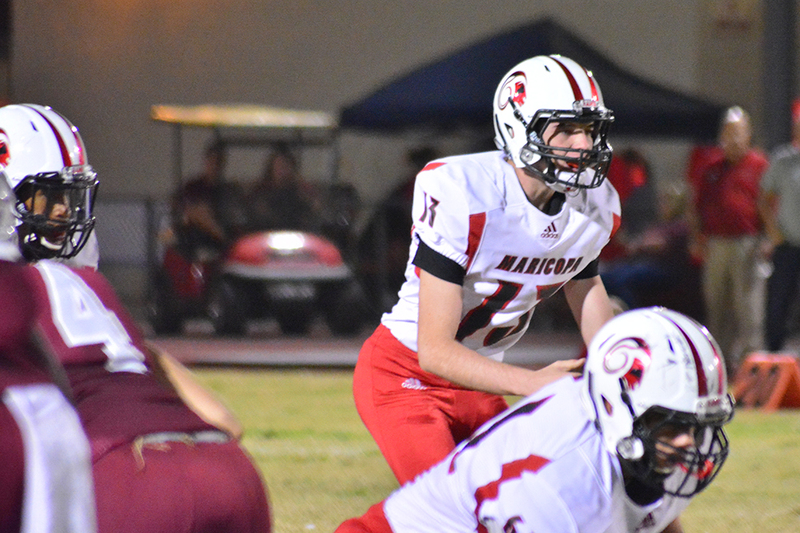 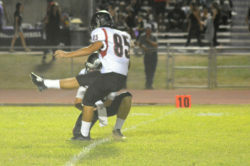 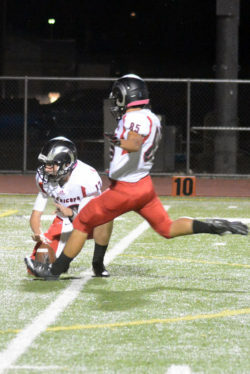 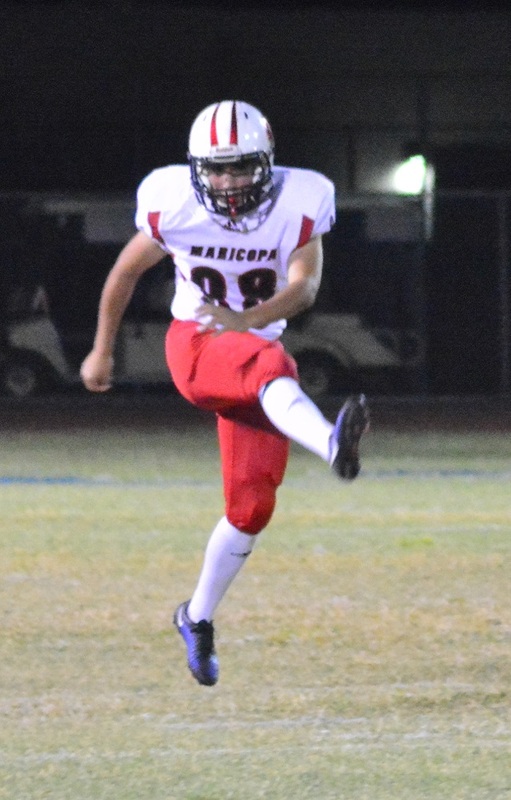 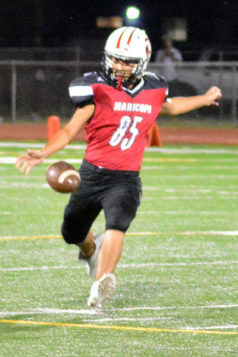 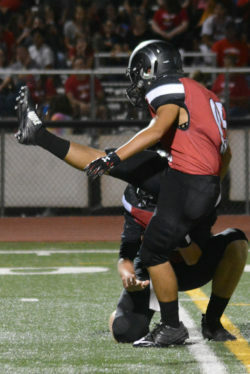 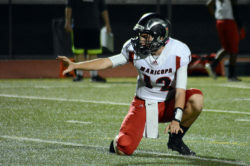 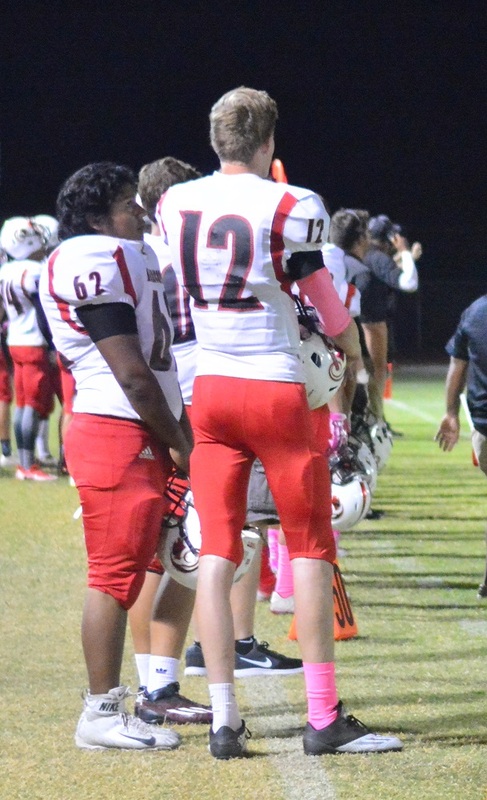 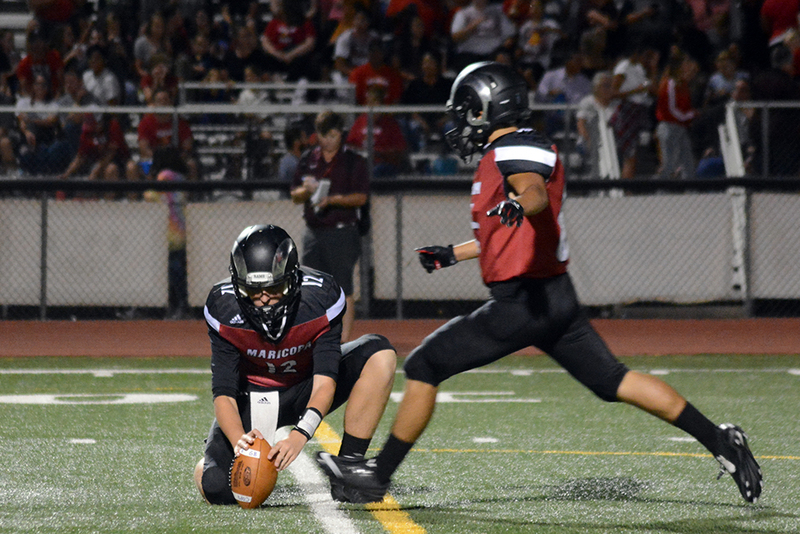 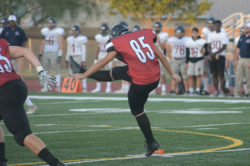 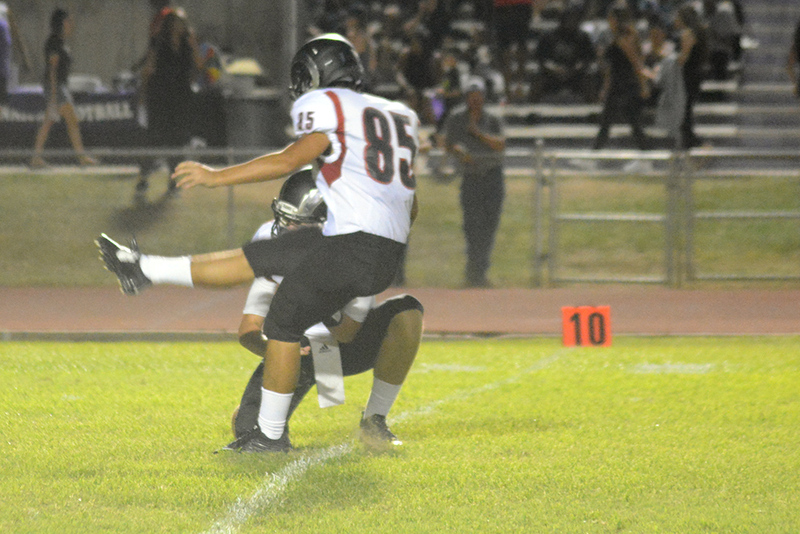 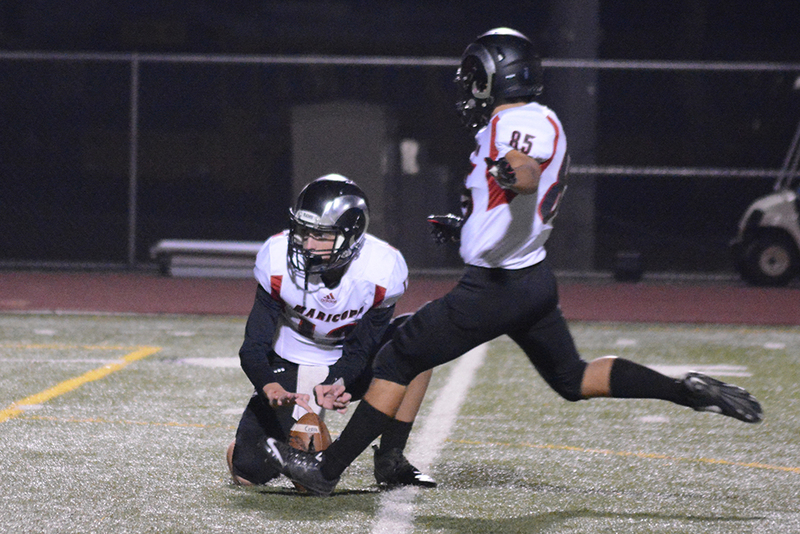 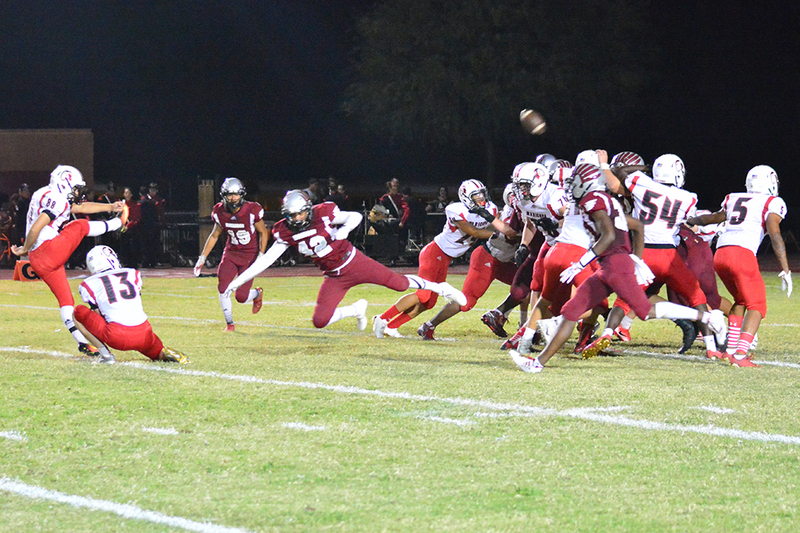 Maricopa’s junior kicker Roberto Esqueda kicked a 31-yard field goal to create a little more breathing room. 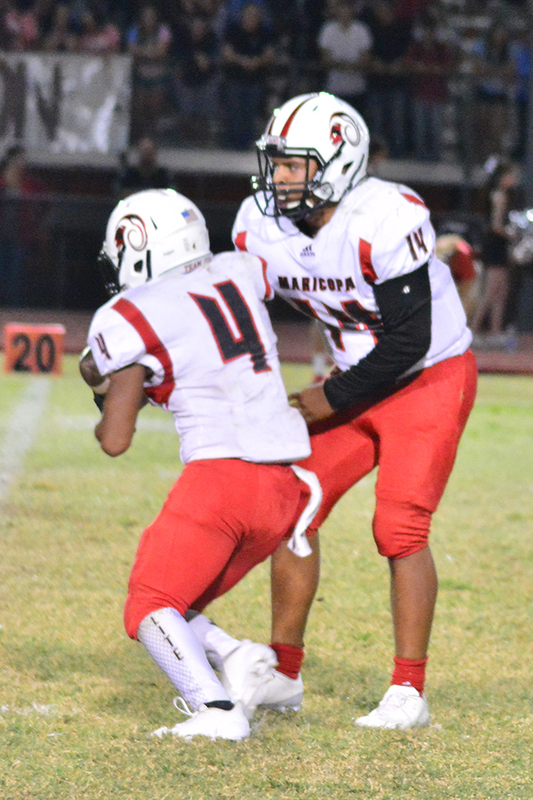 After a Michael Soliz interception near Maricopa’s 15, Chavis took the ball all the way down field to score again with 2:50 remaining in the game. South Mountain capped off the game with a long drive that ended in a quarterback keeper for the final touchdown. 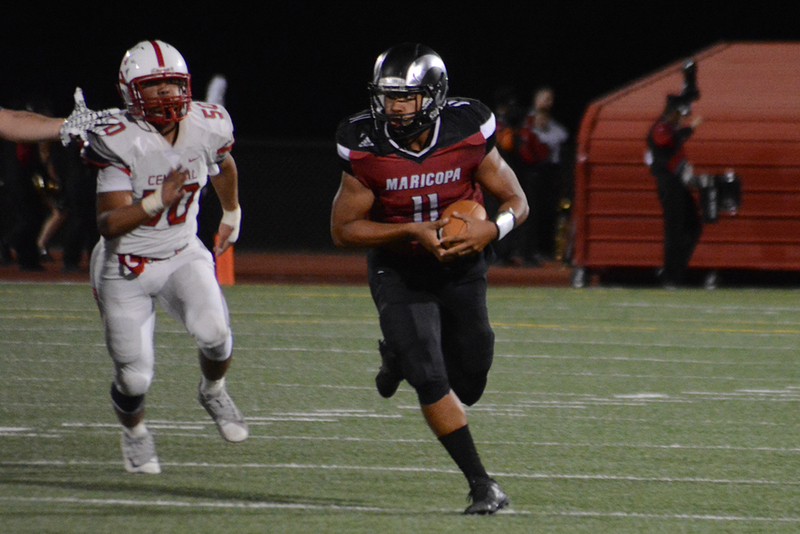 The win kept Maricopa on pace with the rest of the 5A San Tan Region, currently tied for third. 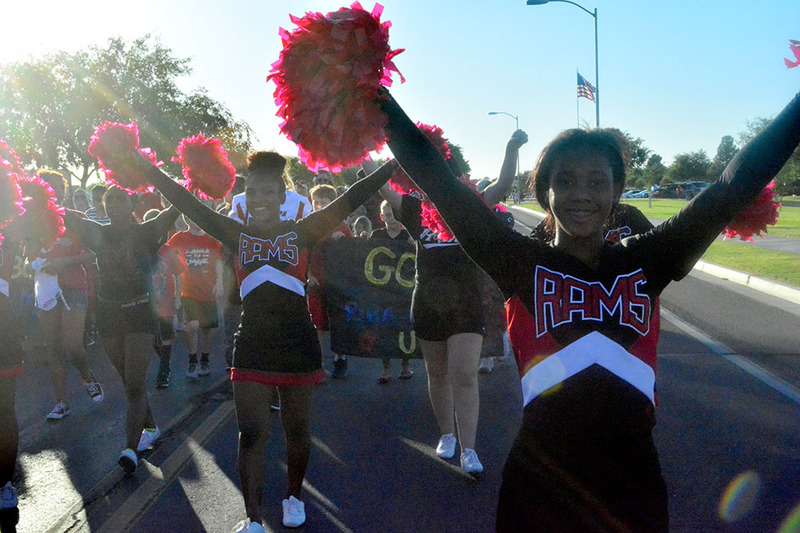 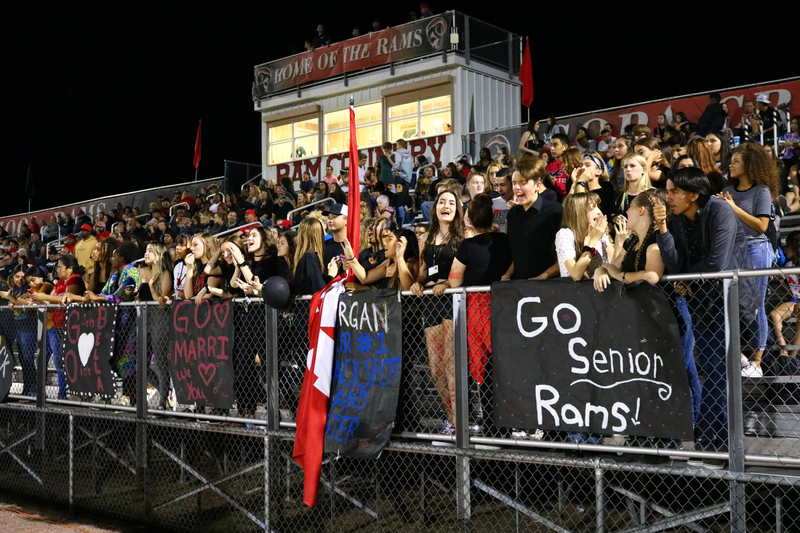 The Rams return home this week for Homecoming against Central on Friday at 7 p.m. 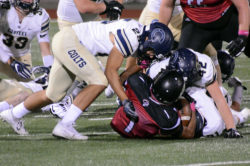 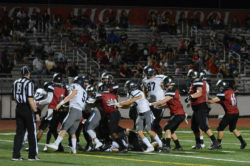 They then start region play with a home game against Higley Sept. 21. 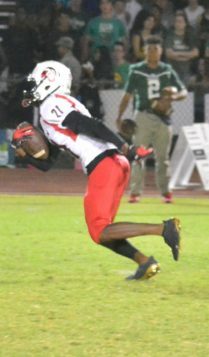 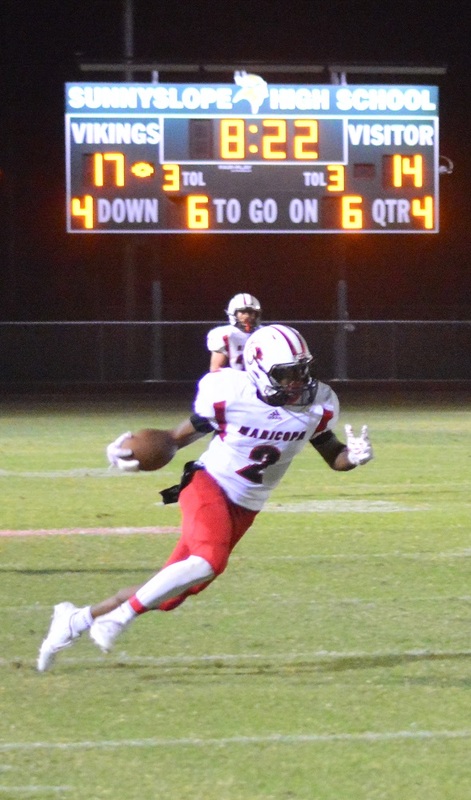 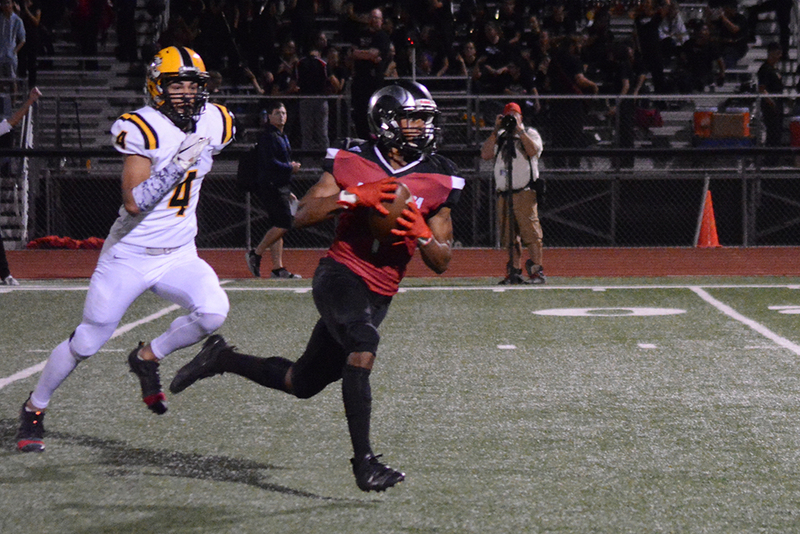 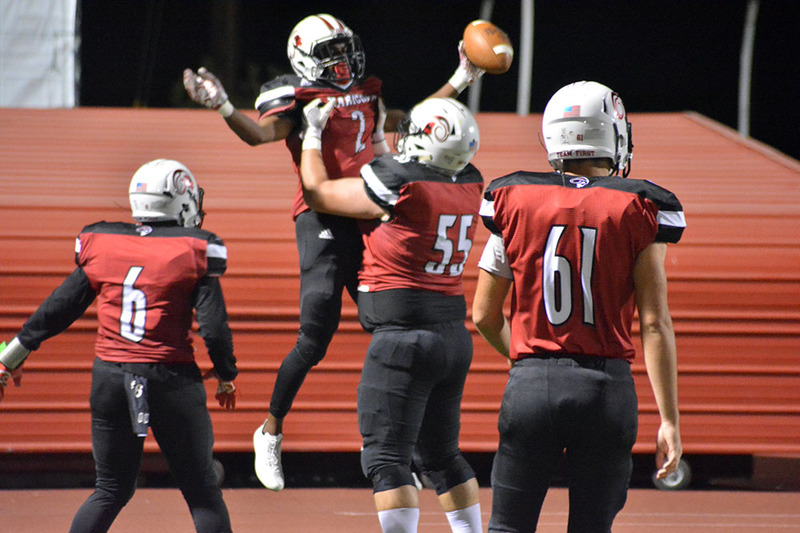 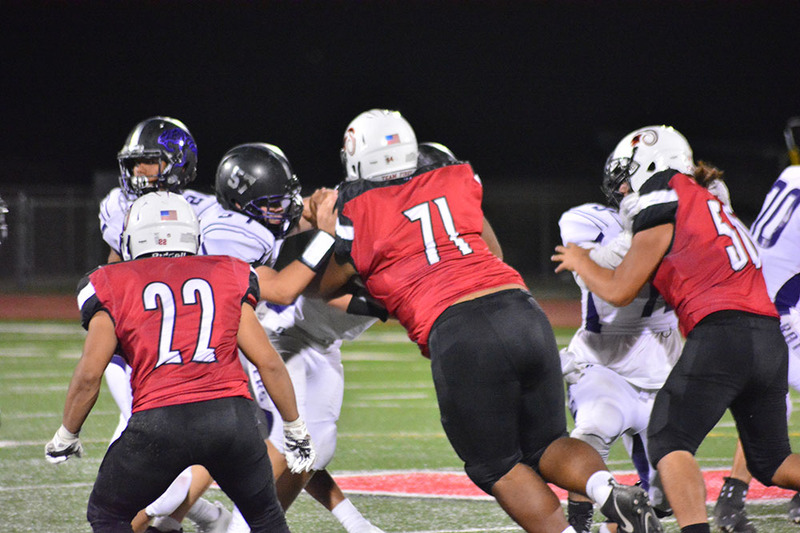 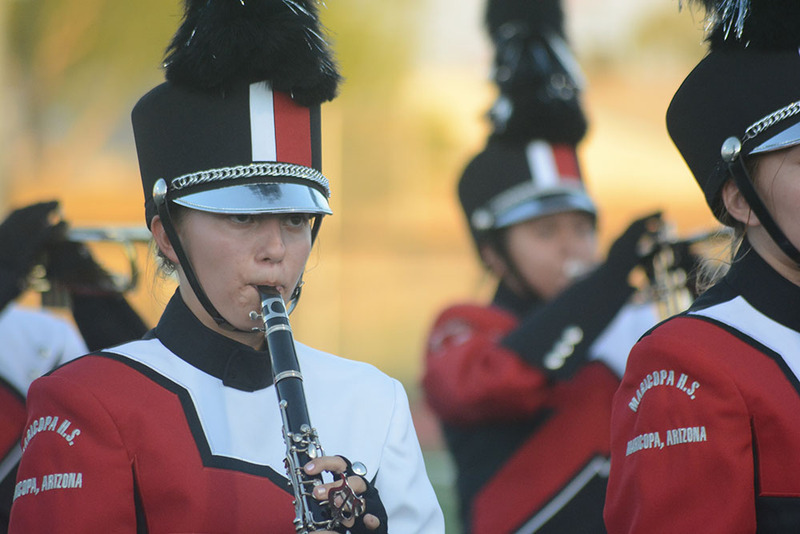 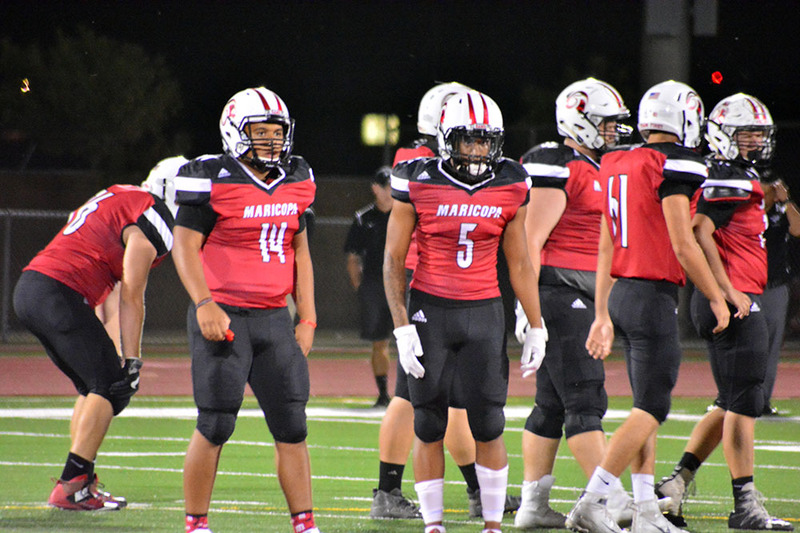 Digging deep in the fourth quarter, the Maricopa High School football team pulled out a win at Apollo in Glendale Friday night, 27-20. 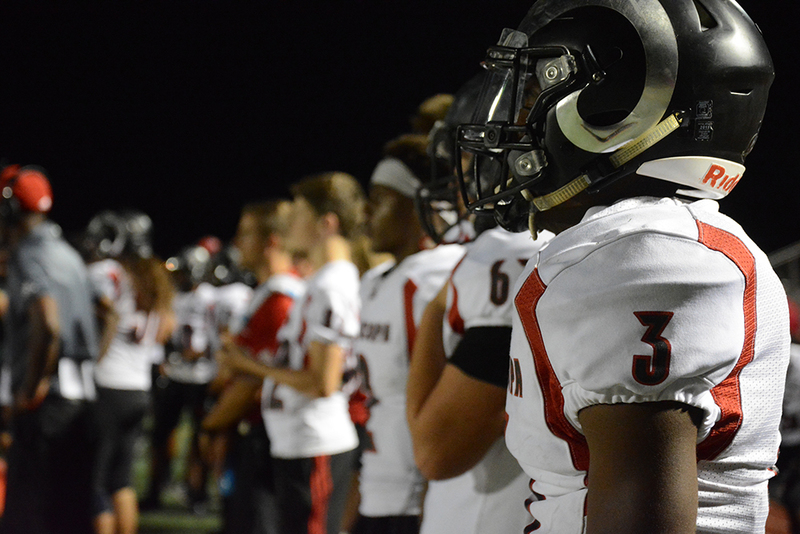 The Rams improved to 2-1 on the season. 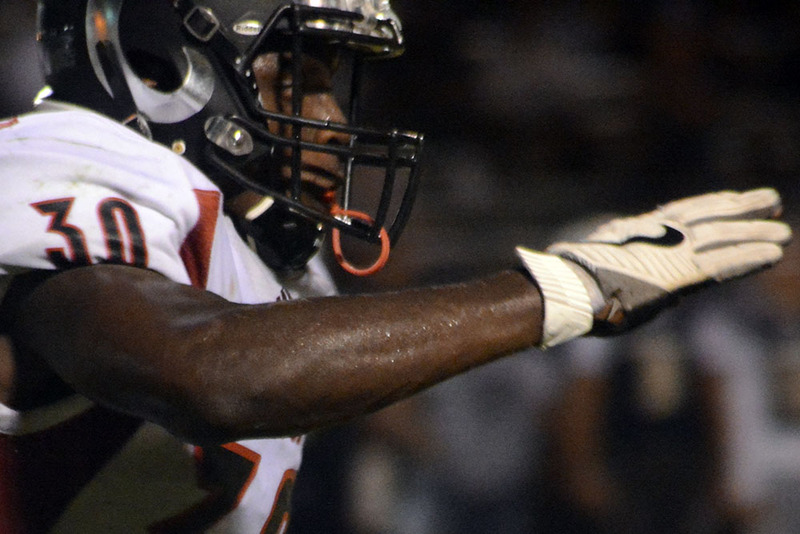 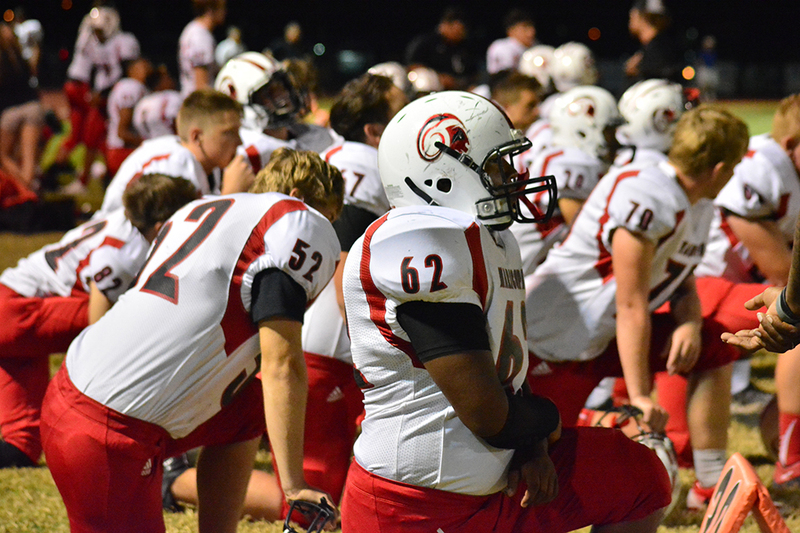 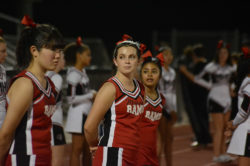 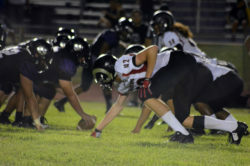 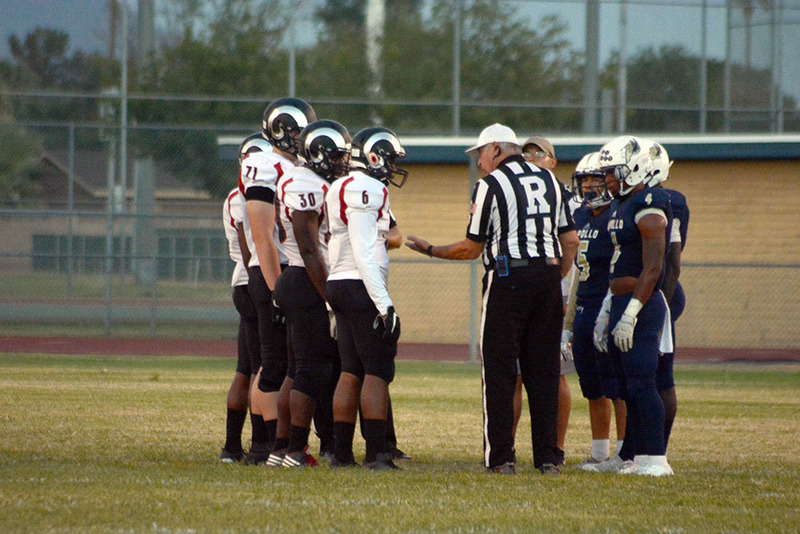 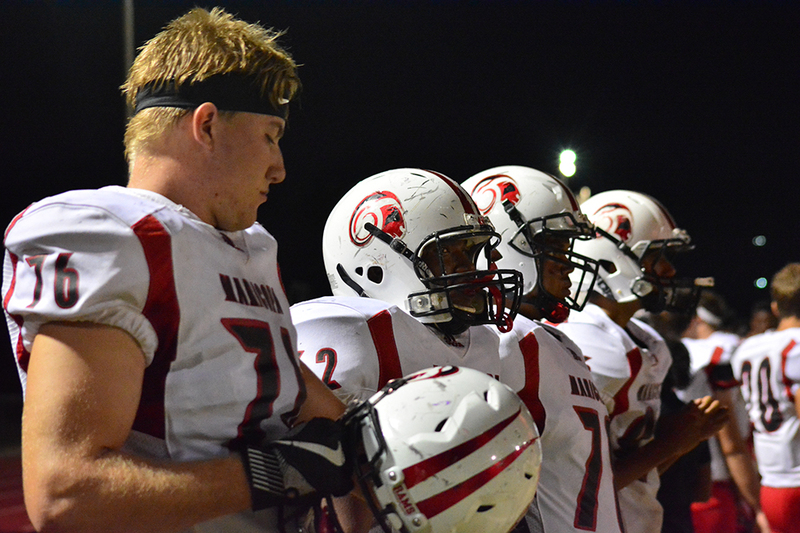 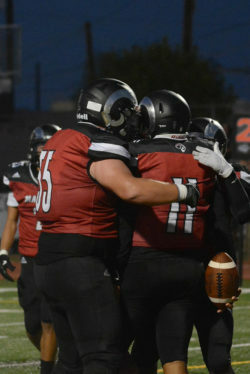 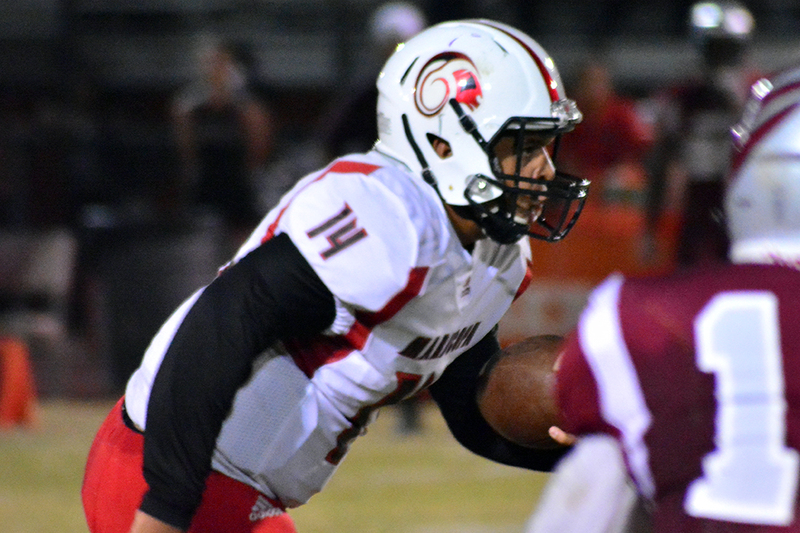 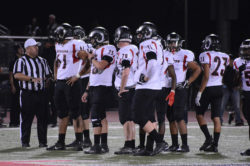 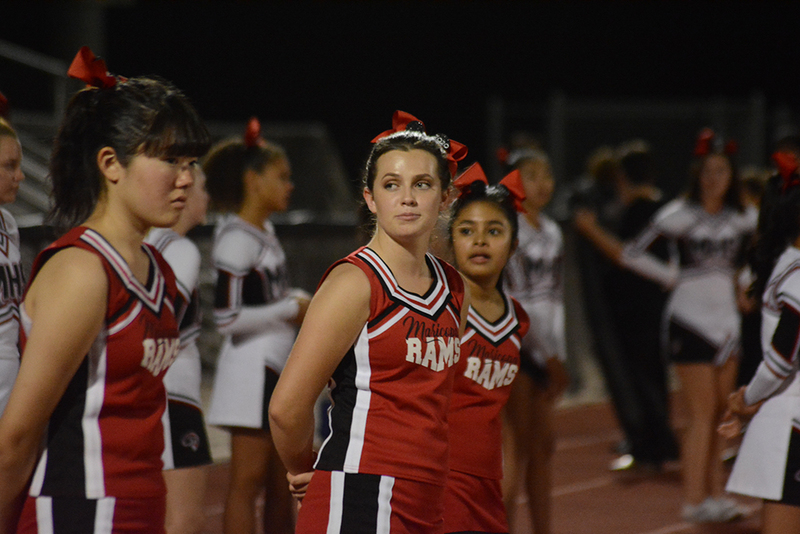 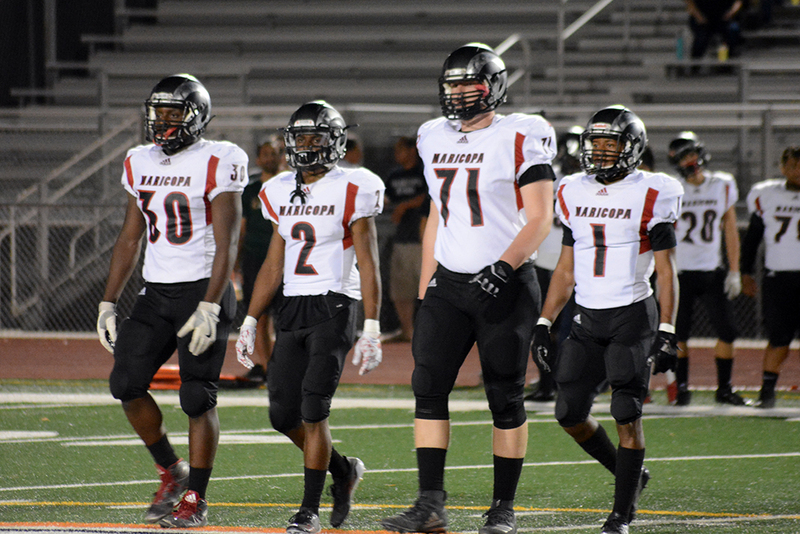 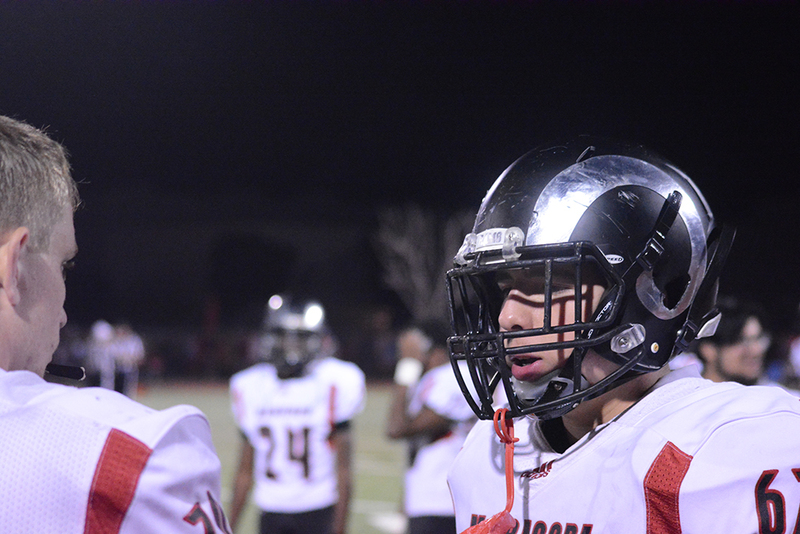 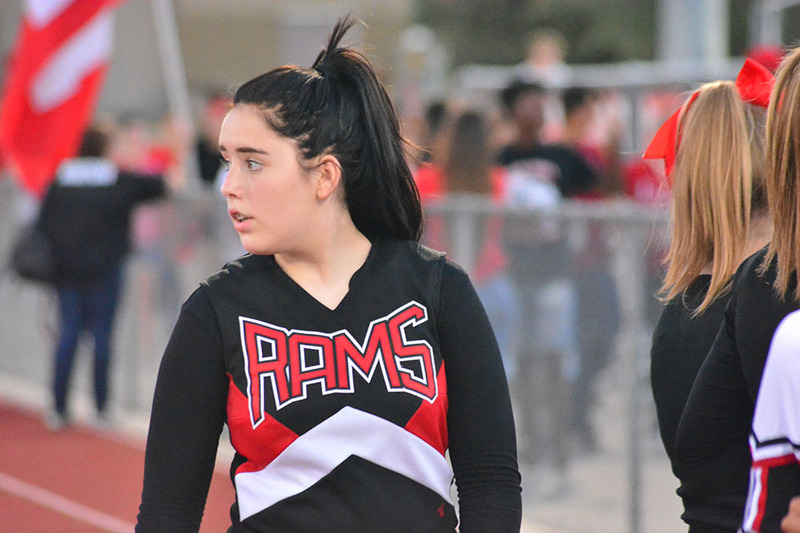 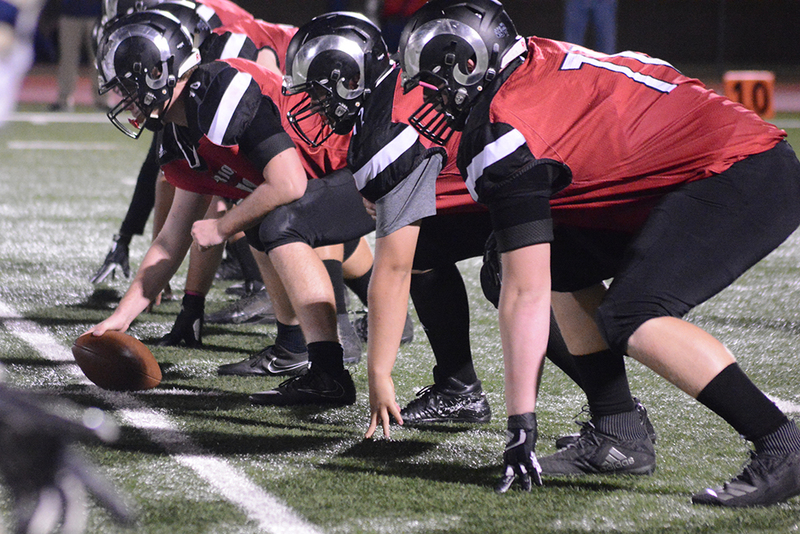 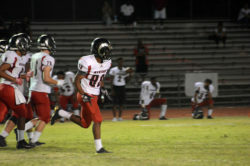 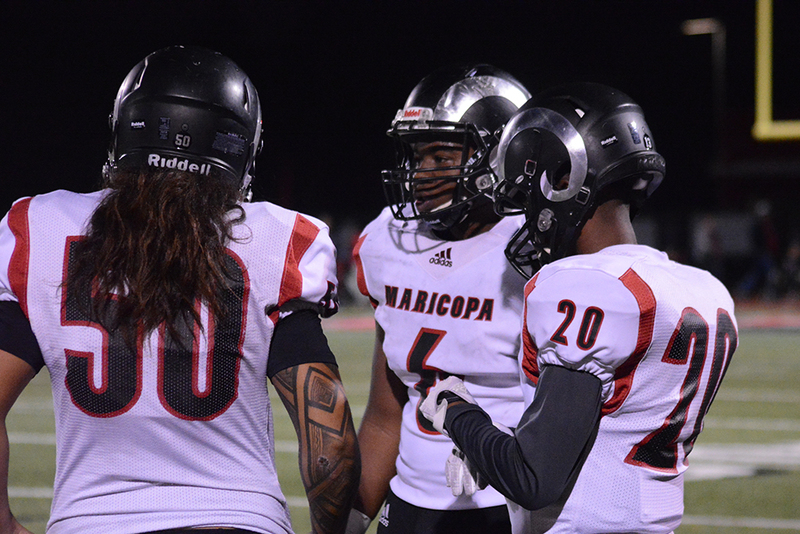 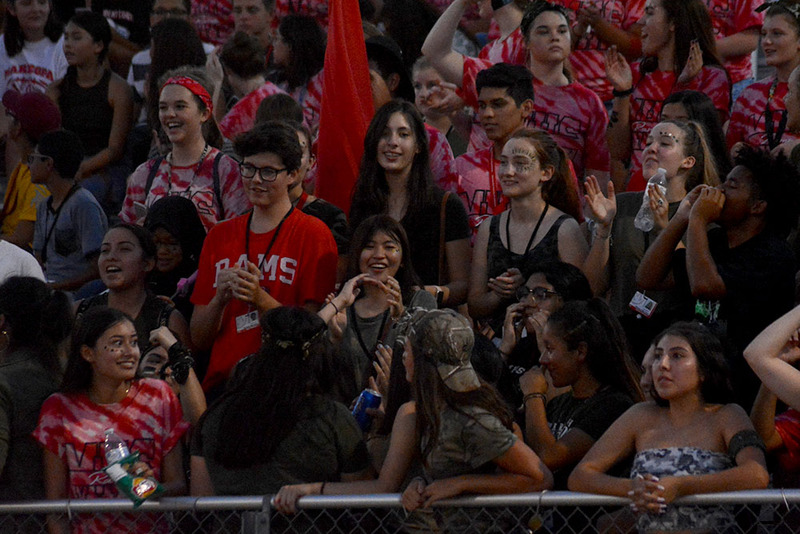 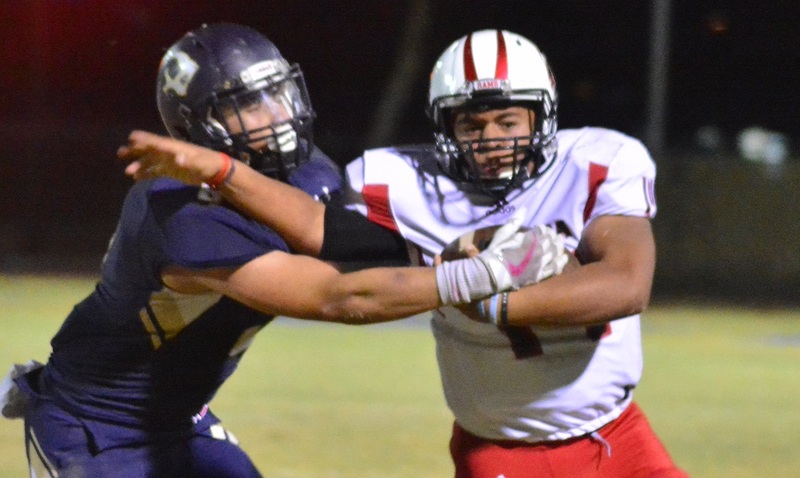 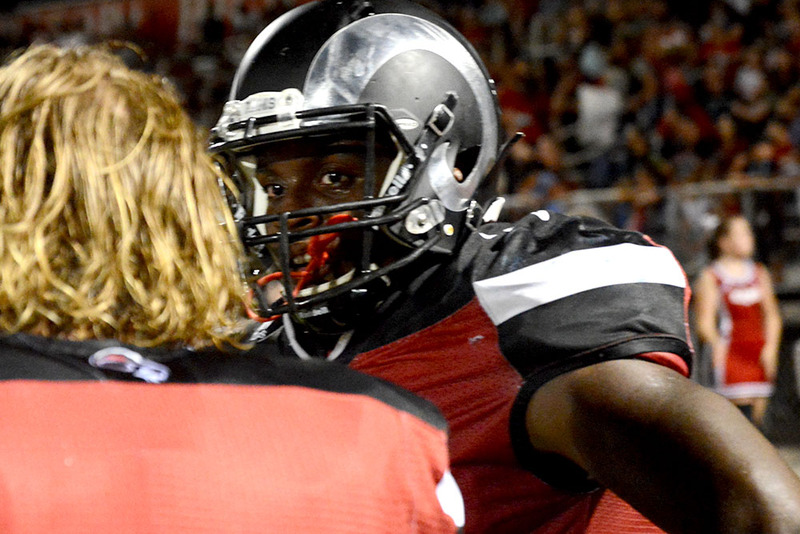 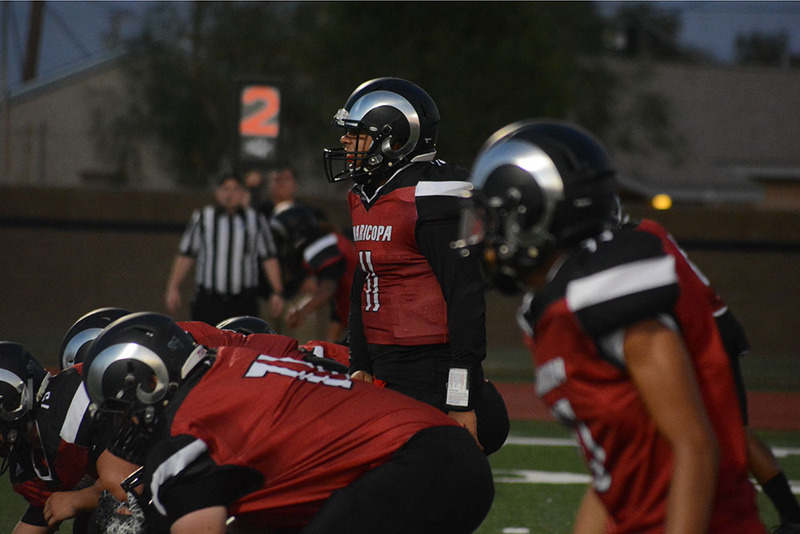 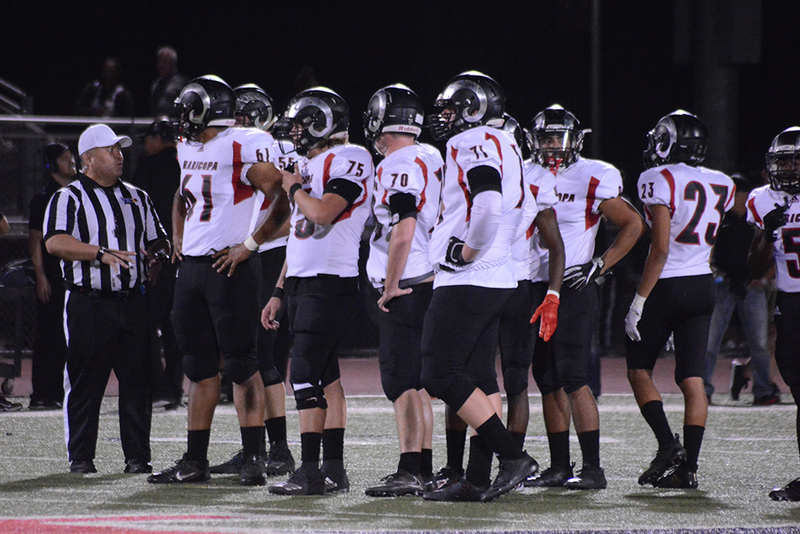 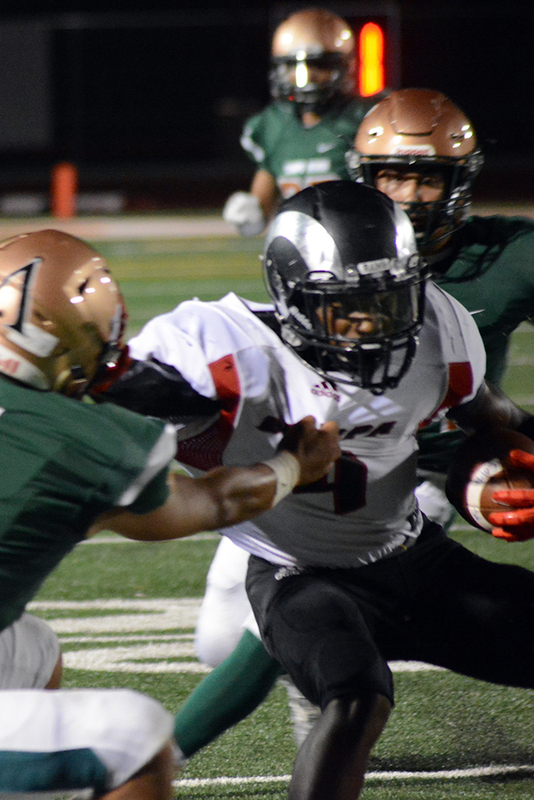 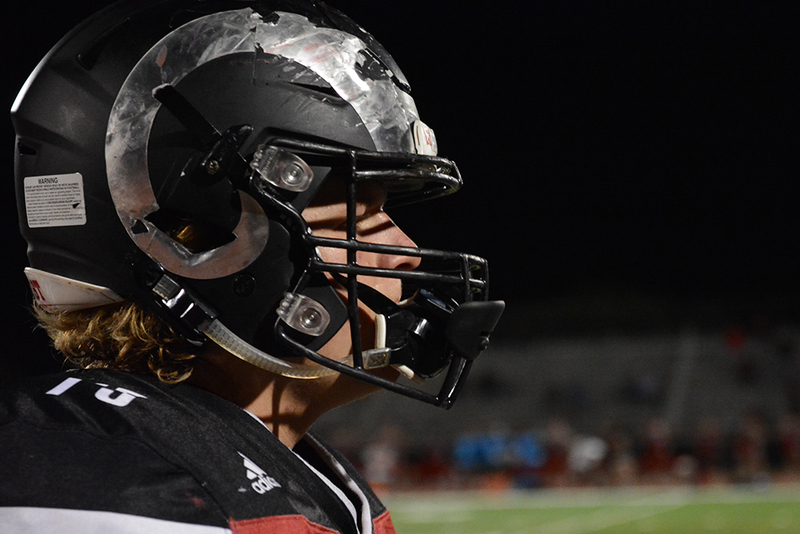 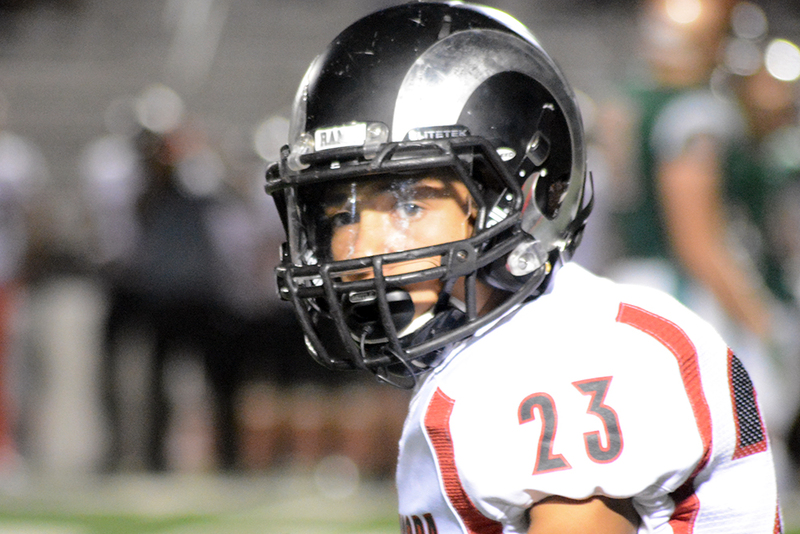 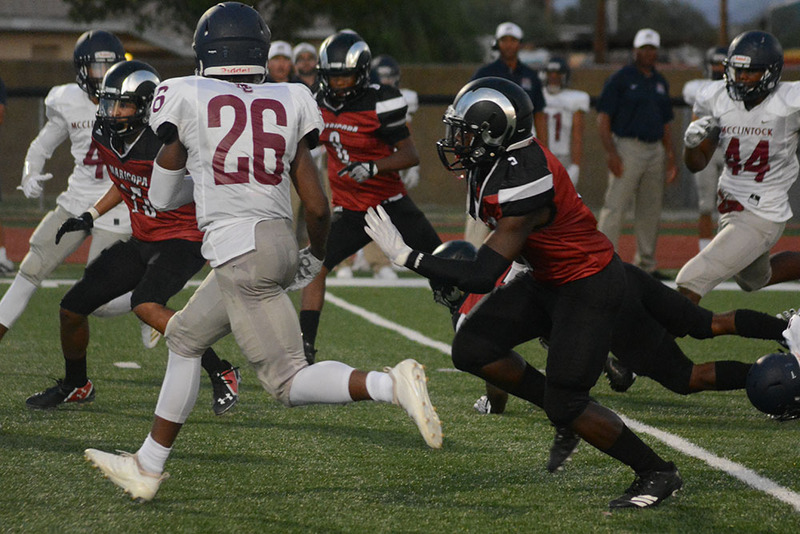 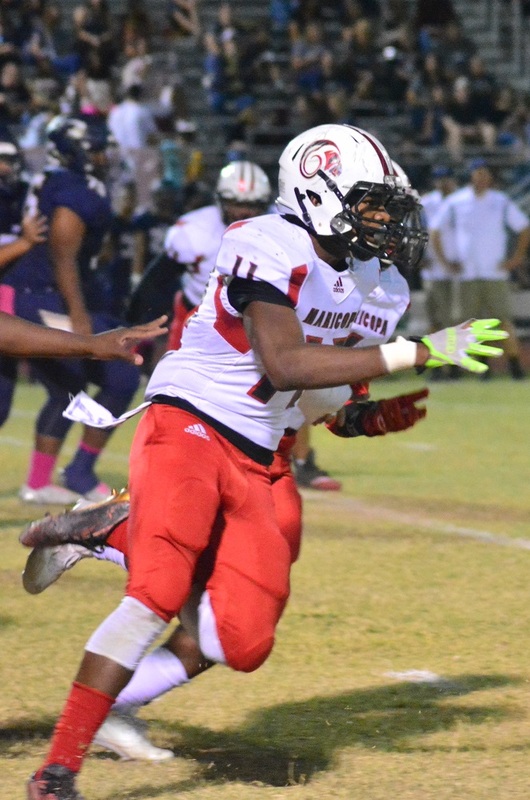 Though Maricopa took a 13-0 lead early, the Rams had to fight back from a 20-13 deficit. 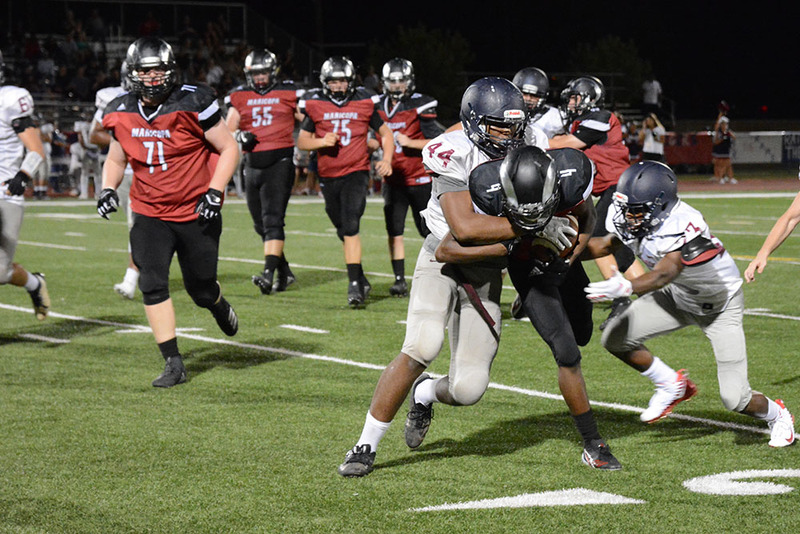 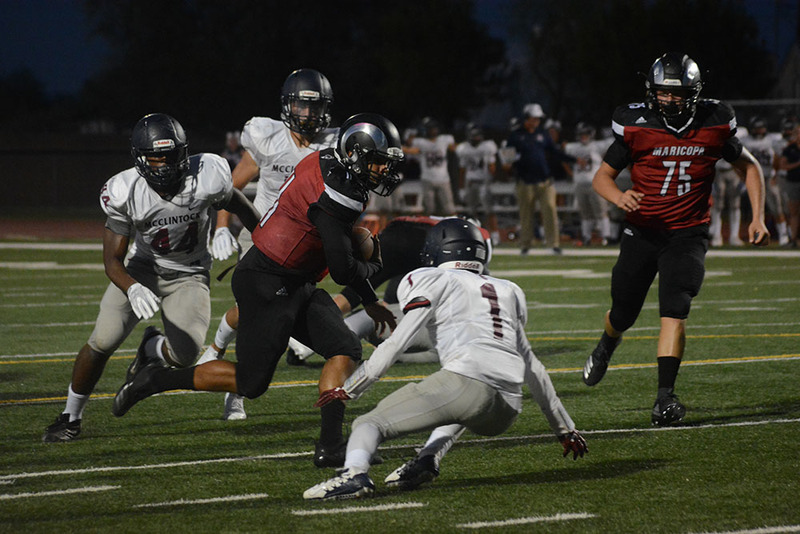 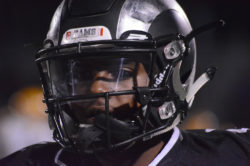 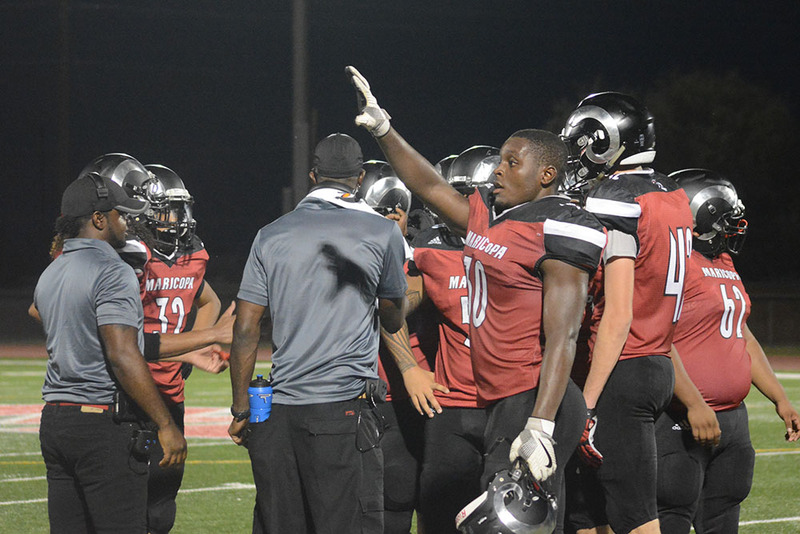 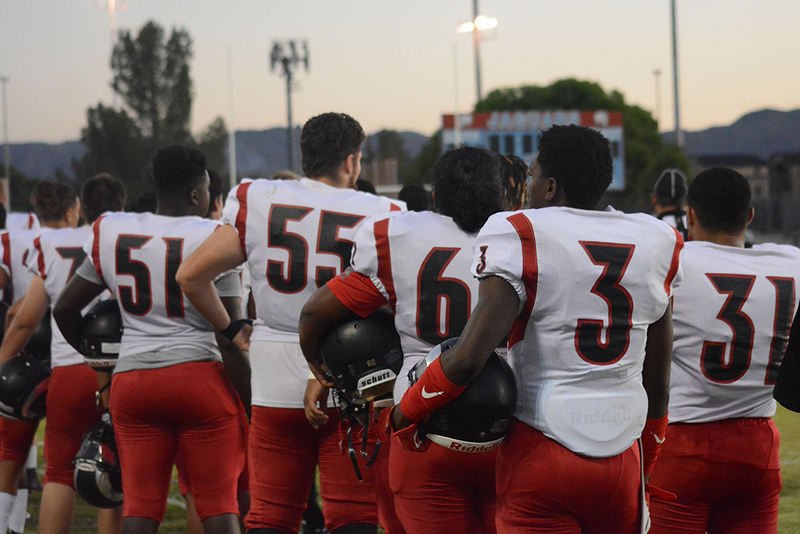 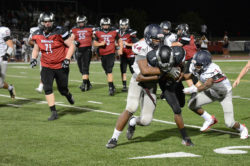 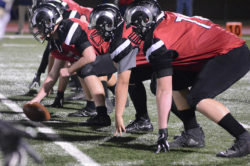 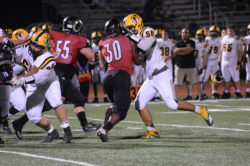 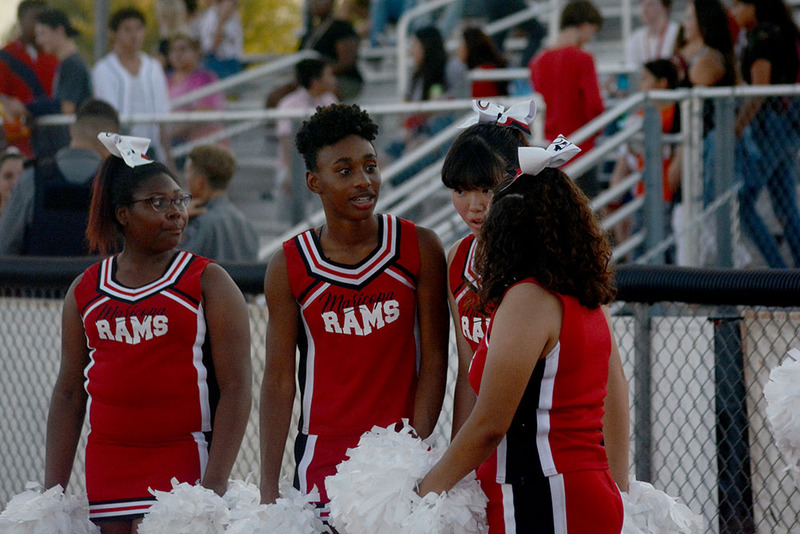 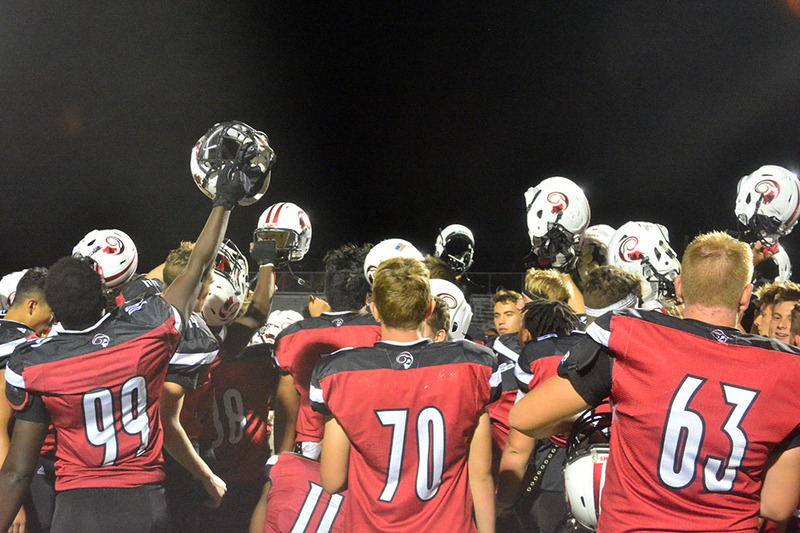 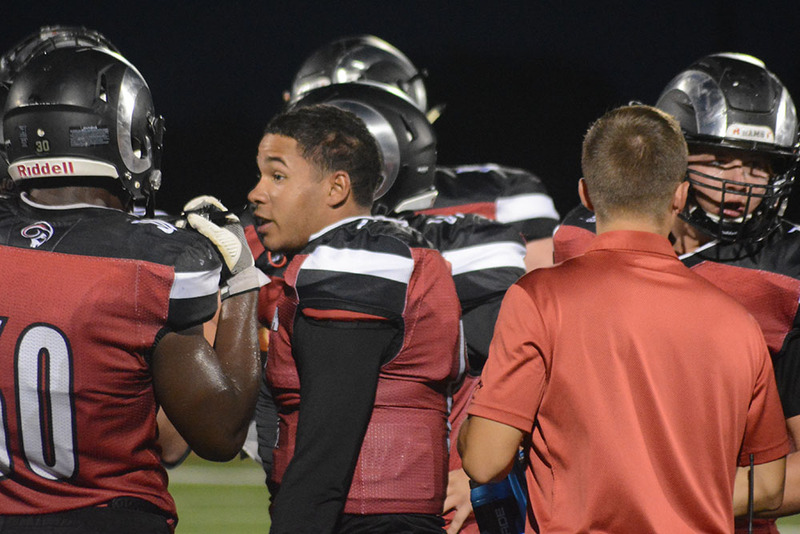 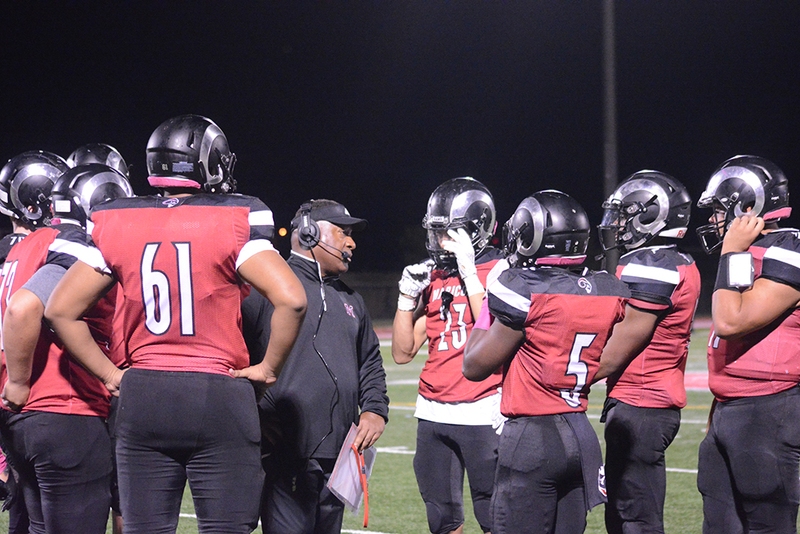 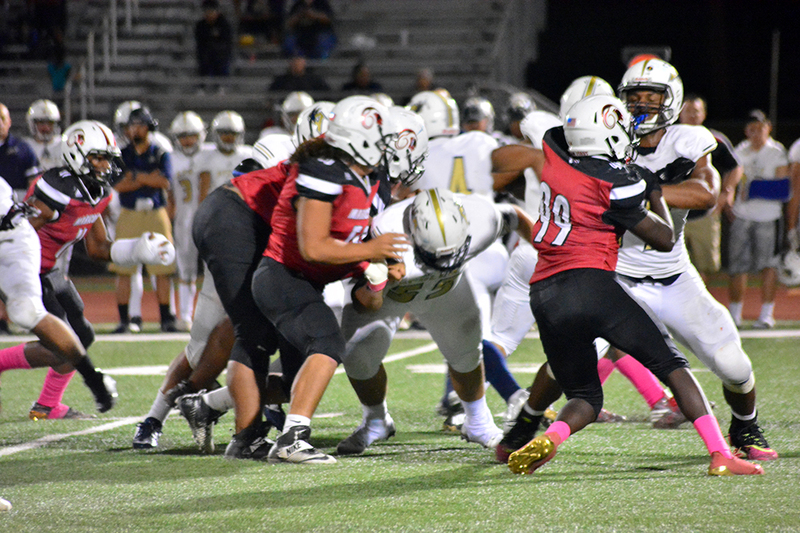 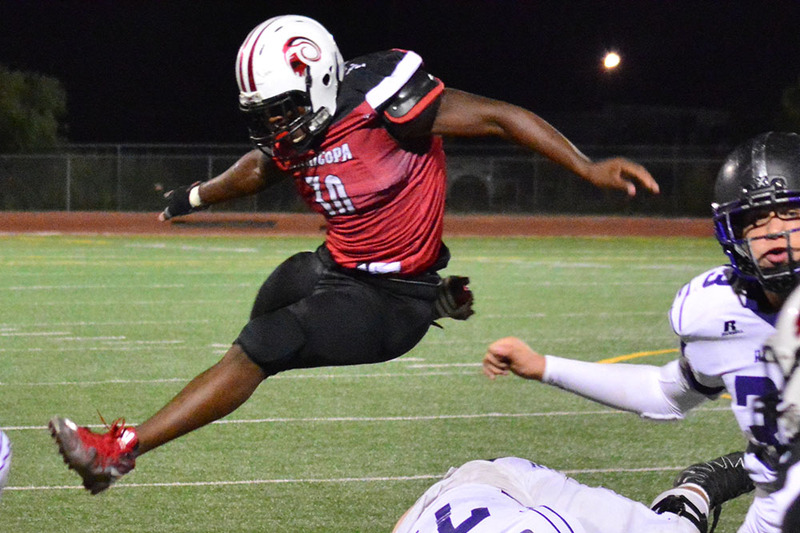 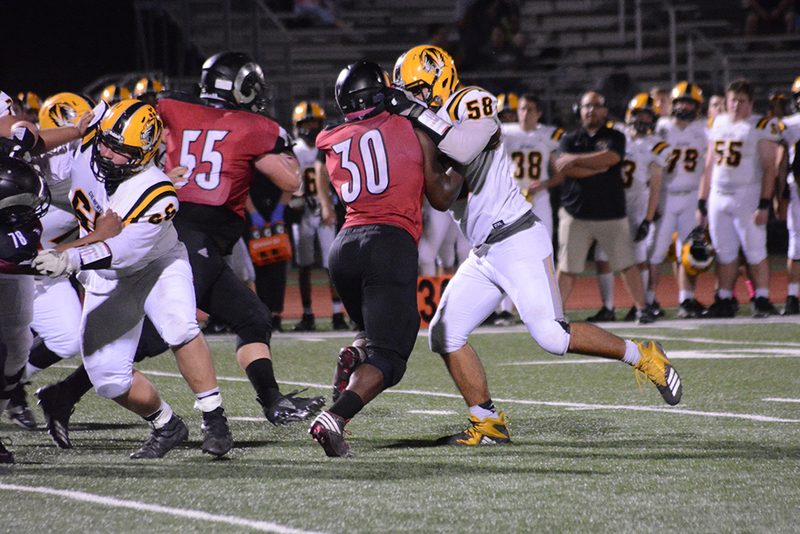 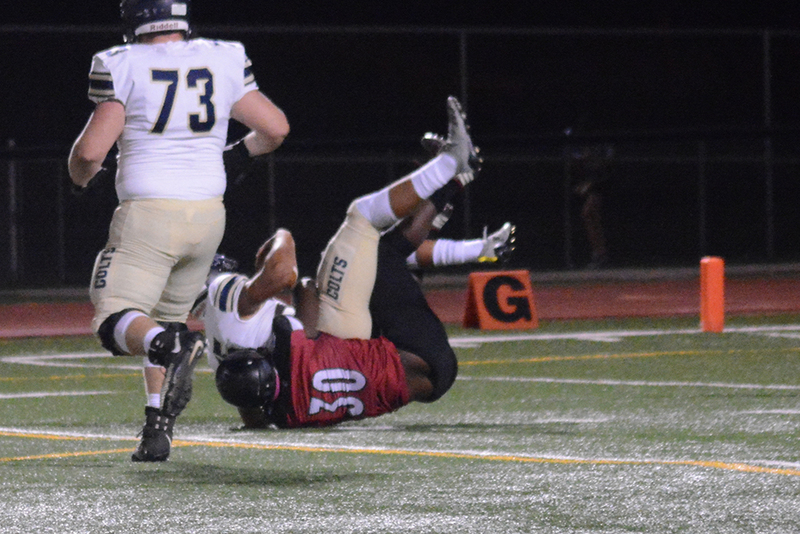 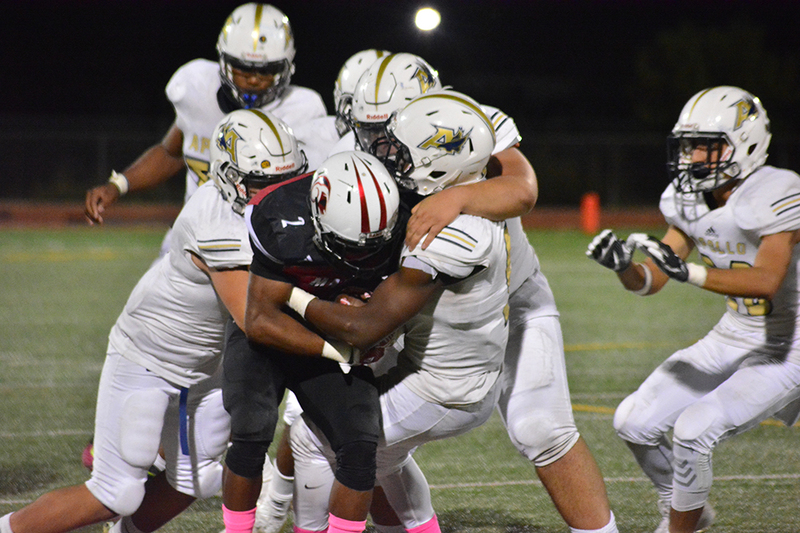 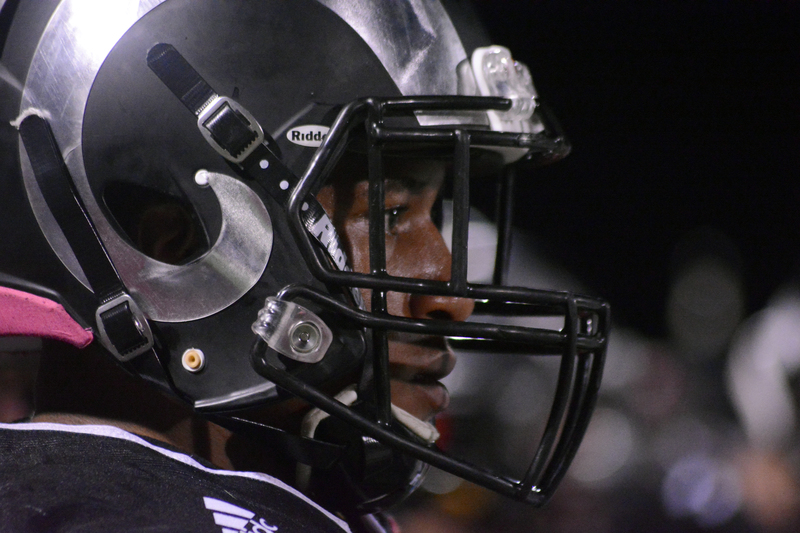 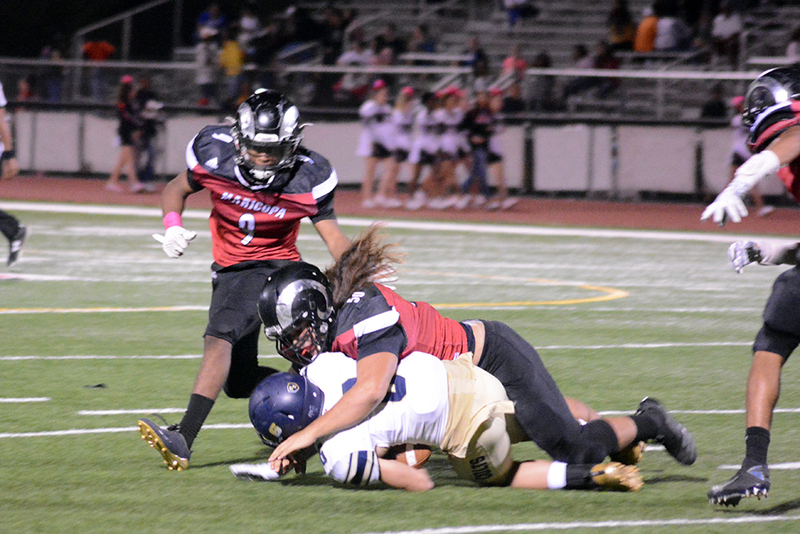 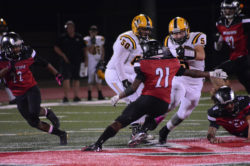 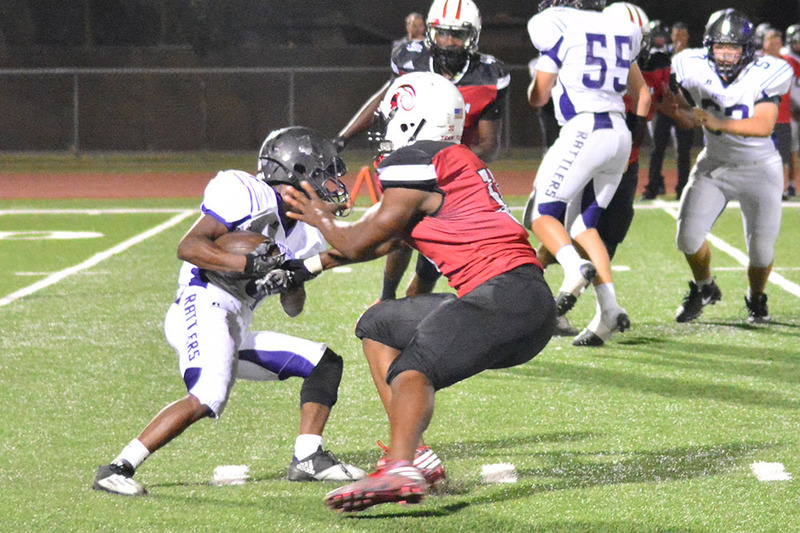 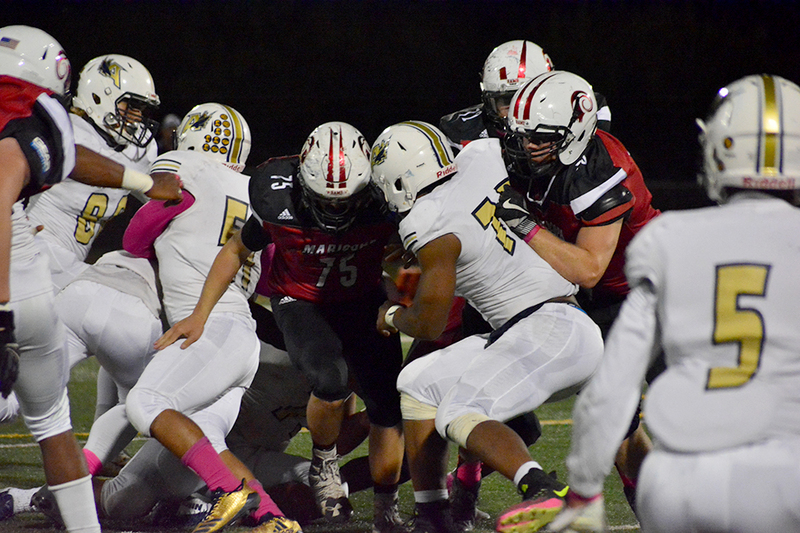 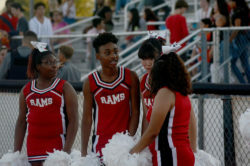 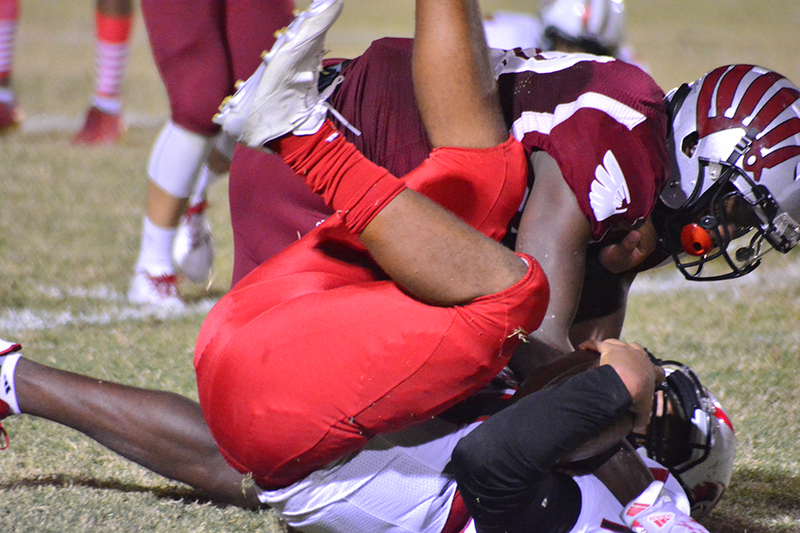 “In the fourth quarter, we just decided we were going to put our foot in the dirt, and we were going to keep driving,” said senior Tylen Coleman, a standout defensive end and running back for the Rams. The Rams scored the first time they touched the football. 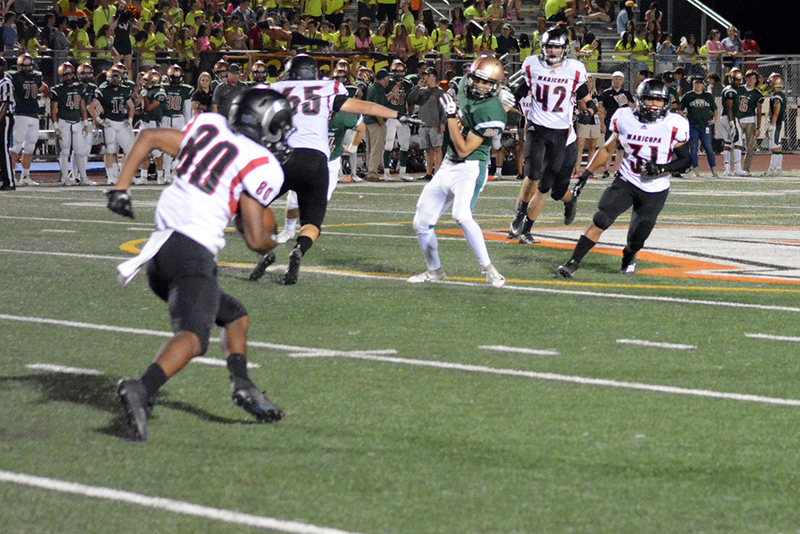 Senior Jacob Cowing grabbed the opening kickoff from the 8 and ran it all the way back for a touchdown. 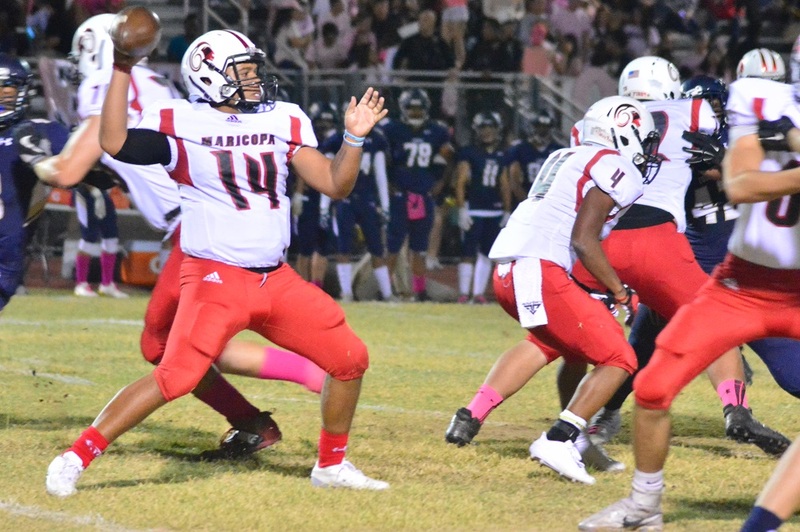 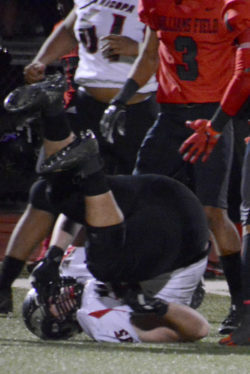 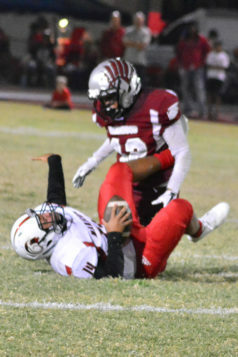 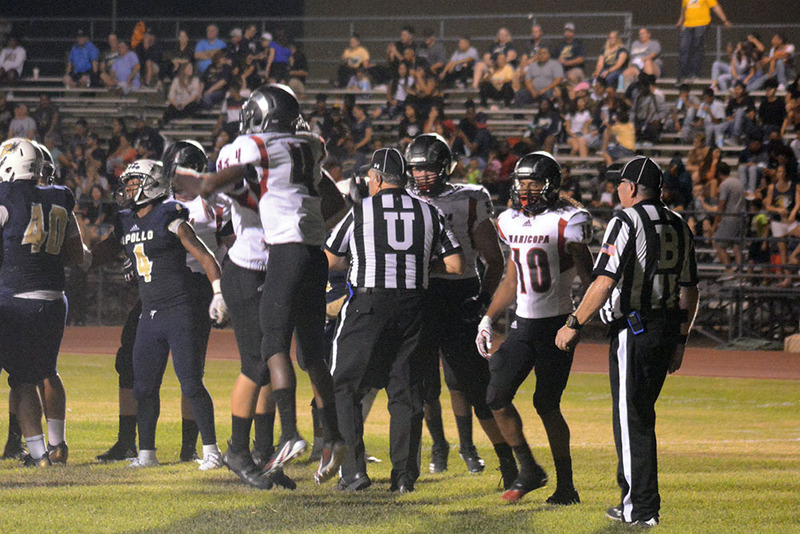 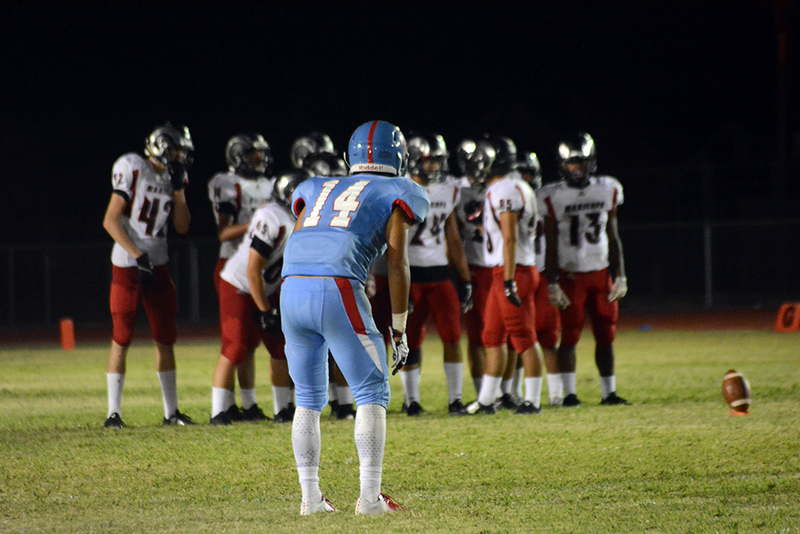 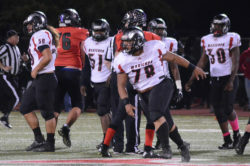 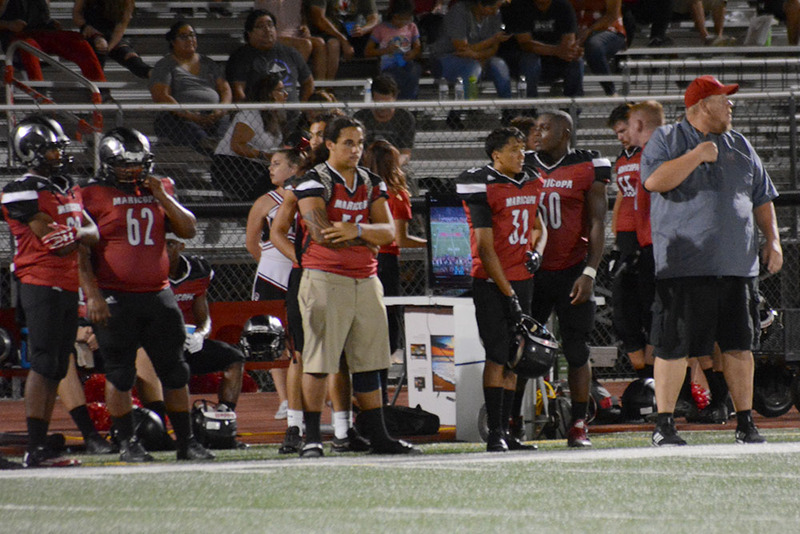 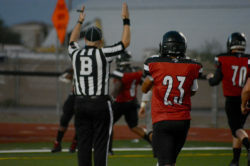 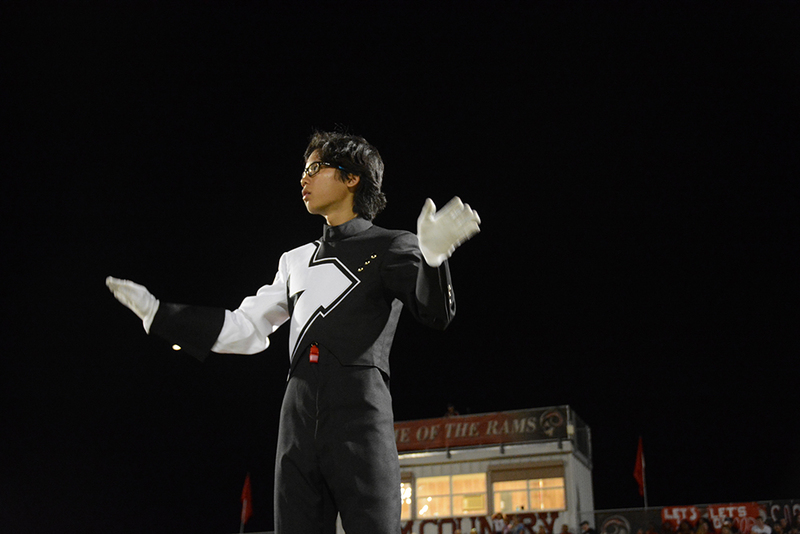 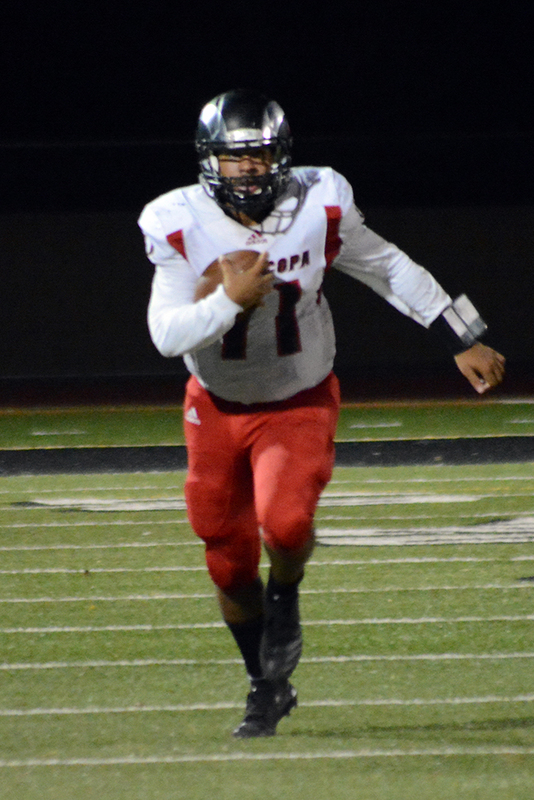 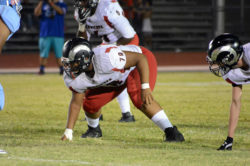 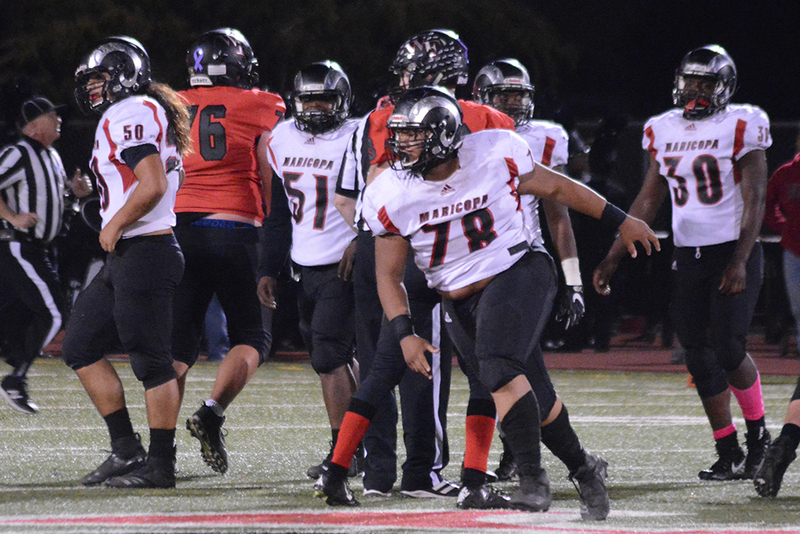 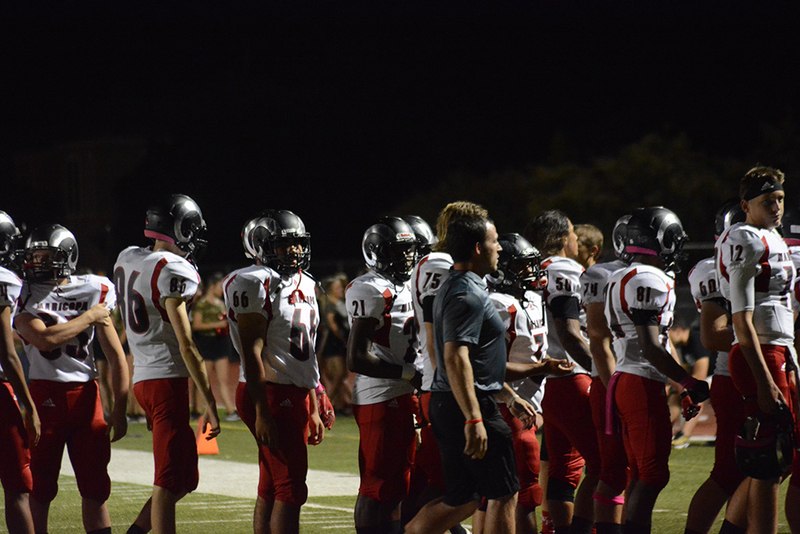 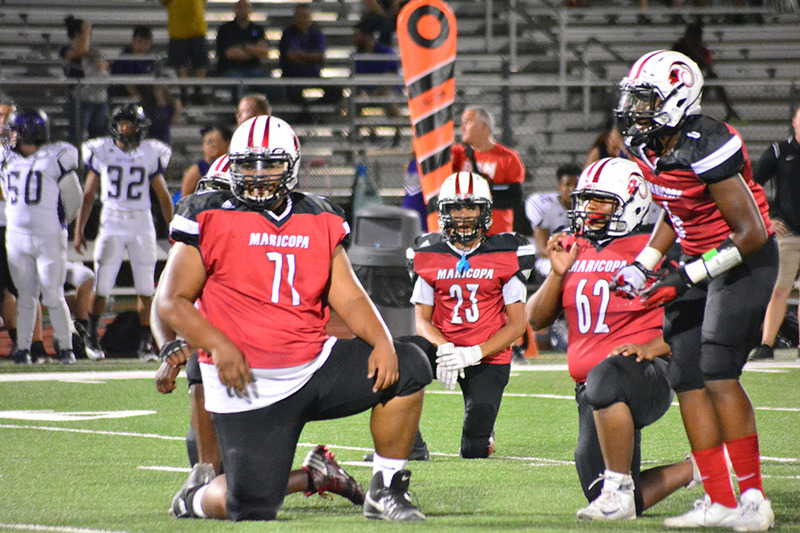 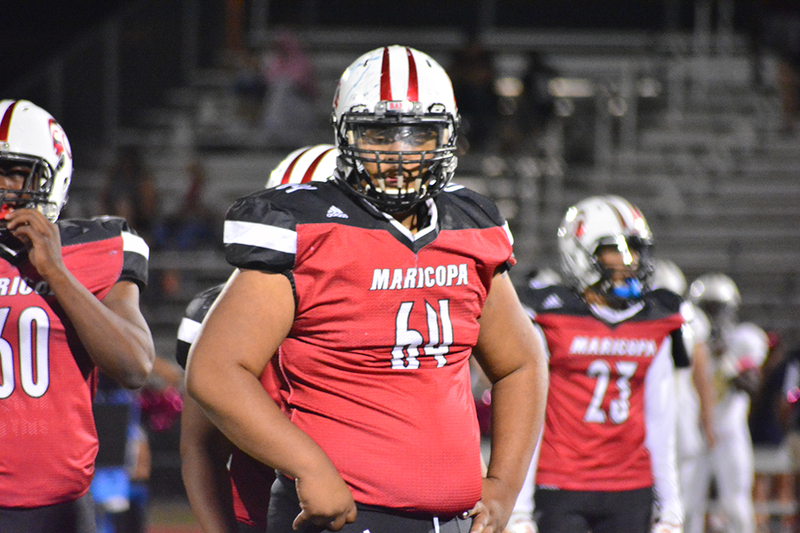 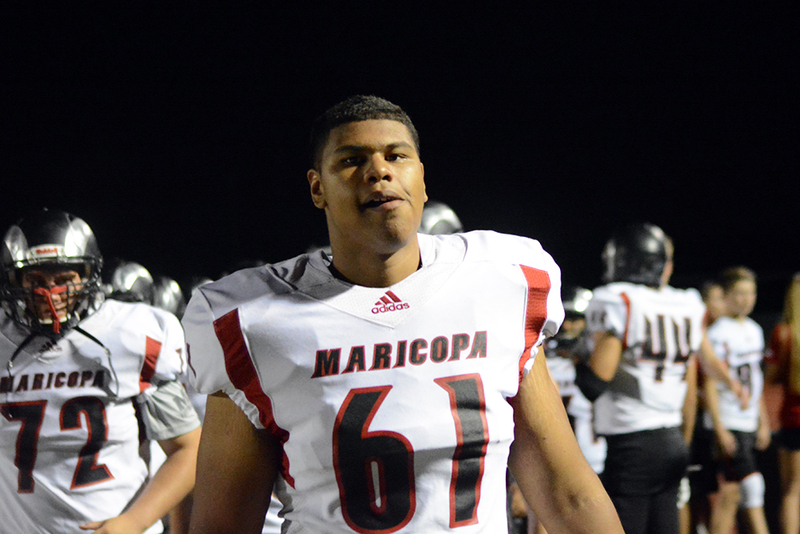 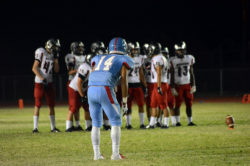 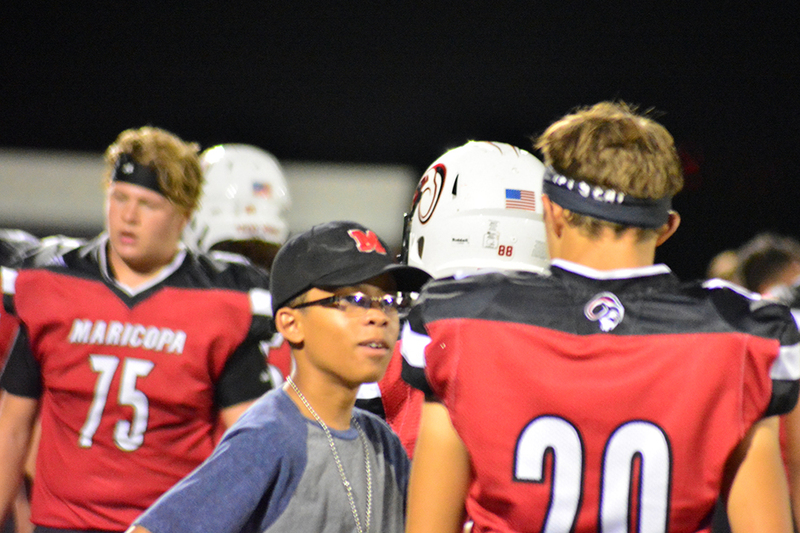 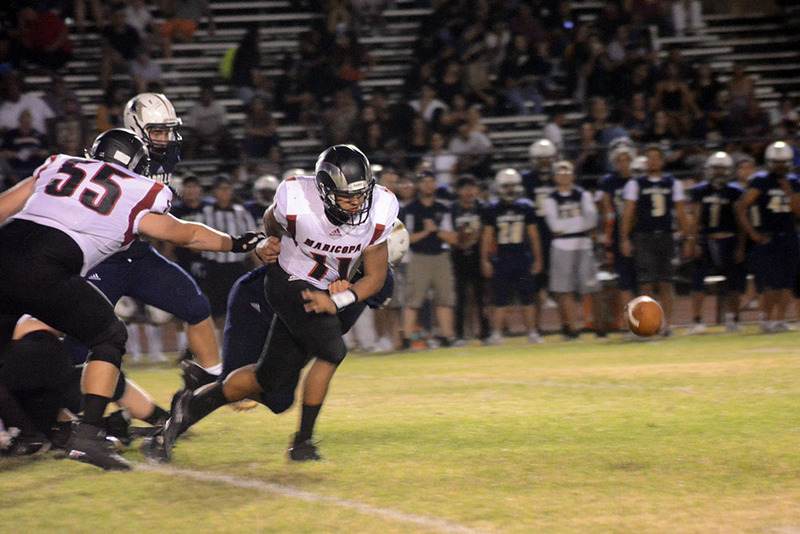 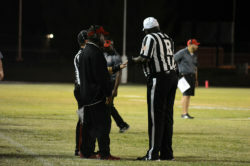 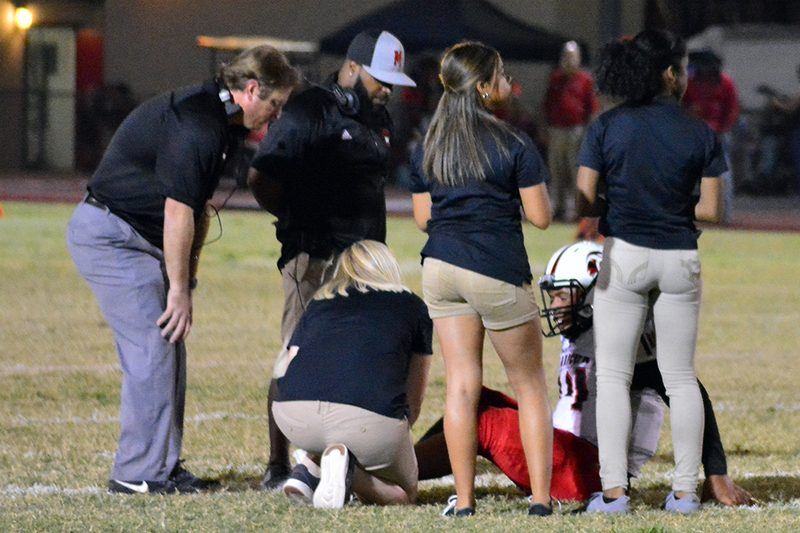 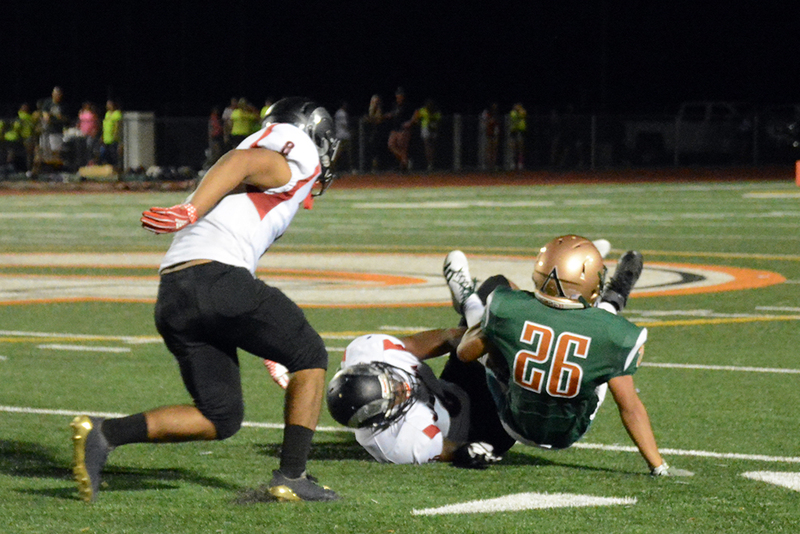 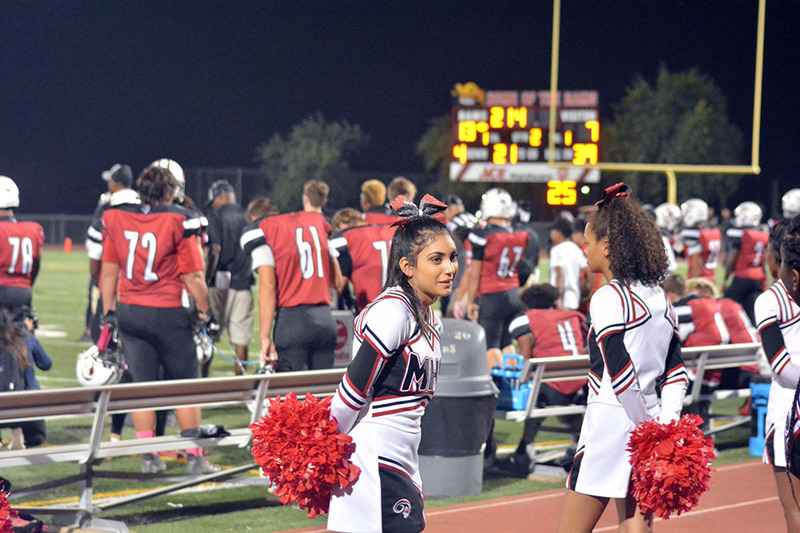 On Roberto Esqueda’s point-after kick, Maricopa went up 7-0 with only 12 second off the clock. 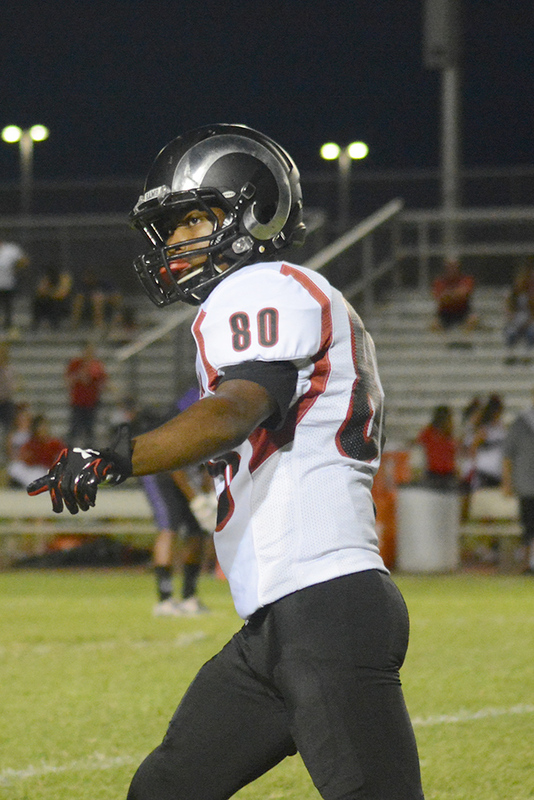 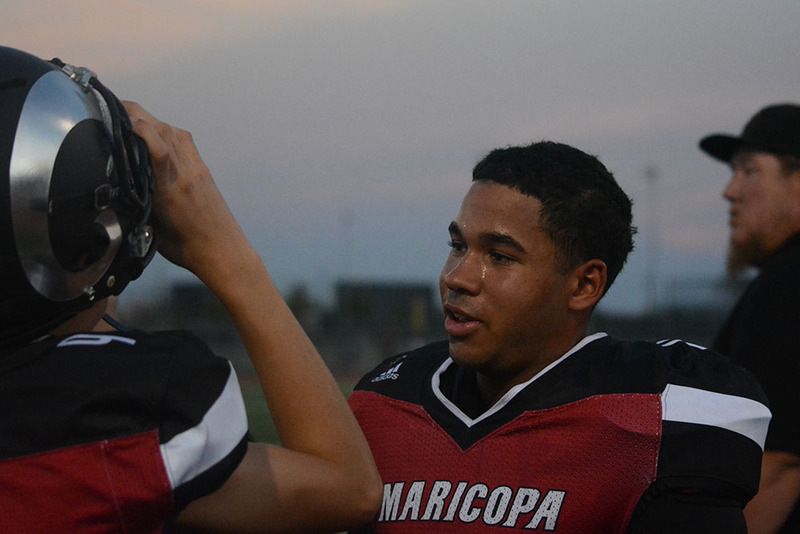 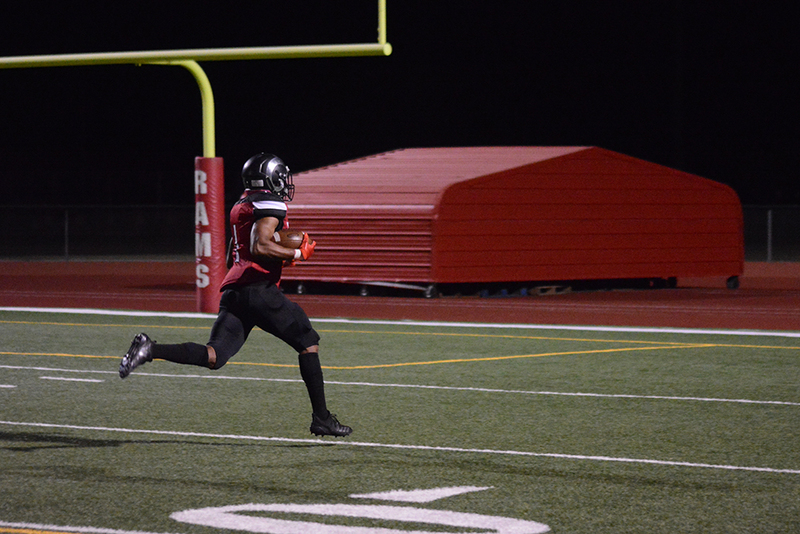 Just seconds into the second quarter, sophomore Mister Chavis scored from the 5, and Maricopa led 13-0. 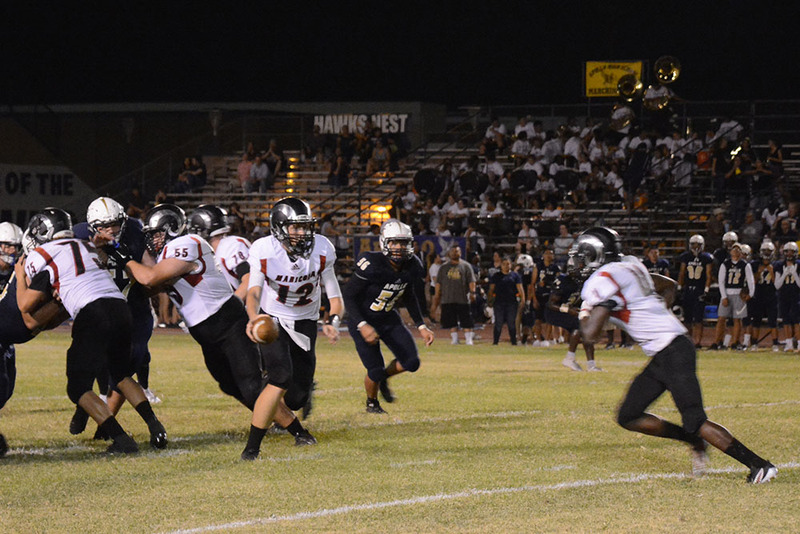 But the Hawks pull themselves together and started to get their offense firing in the middle of the game. 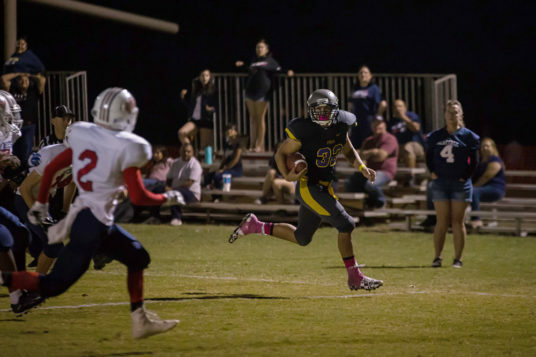 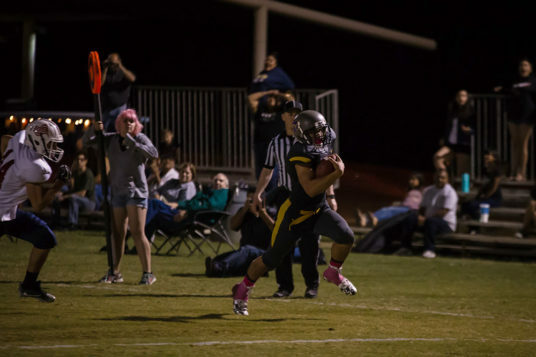 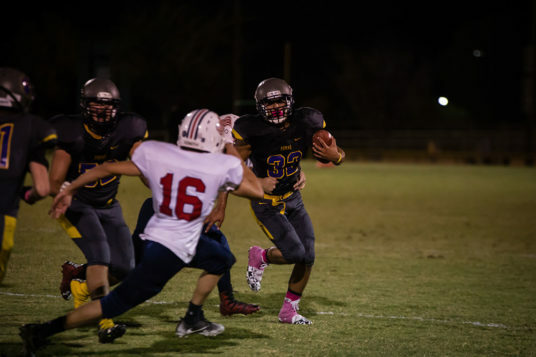 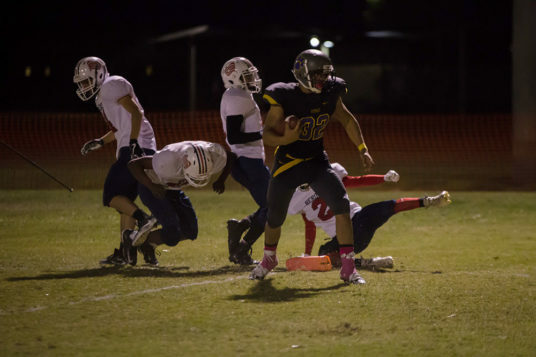 They scored on consecutive possessions to move past Maricopa. 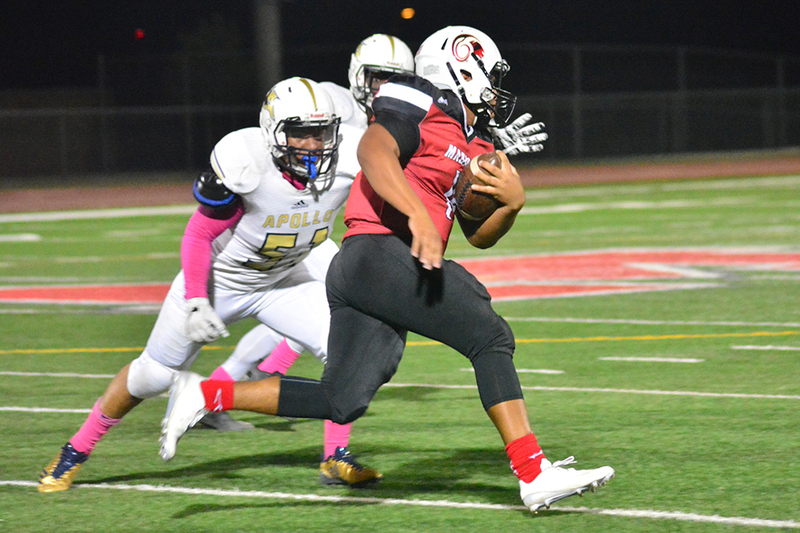 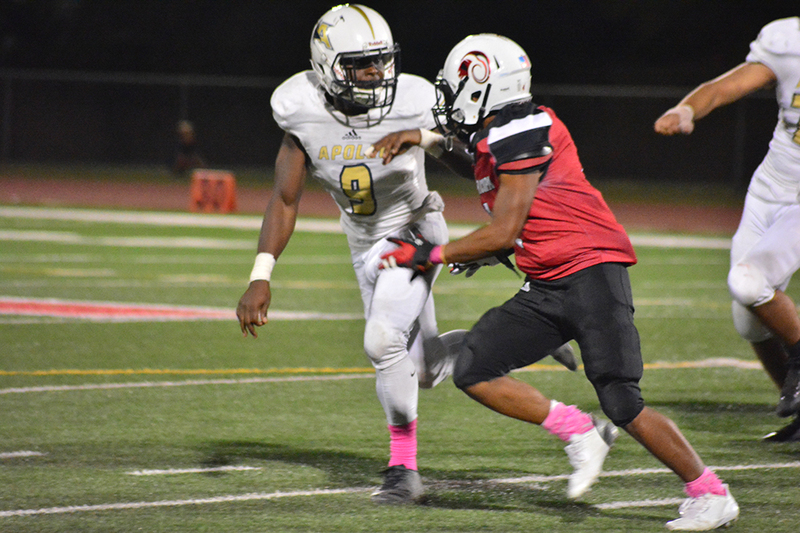 Apollo continued to hold back the Rams throughout the third quarter, then created a 10-play drive that led to a touchdown with 1:15 left in the quarter. Maricopa’s final drive of the third became its first drive of the fourth. 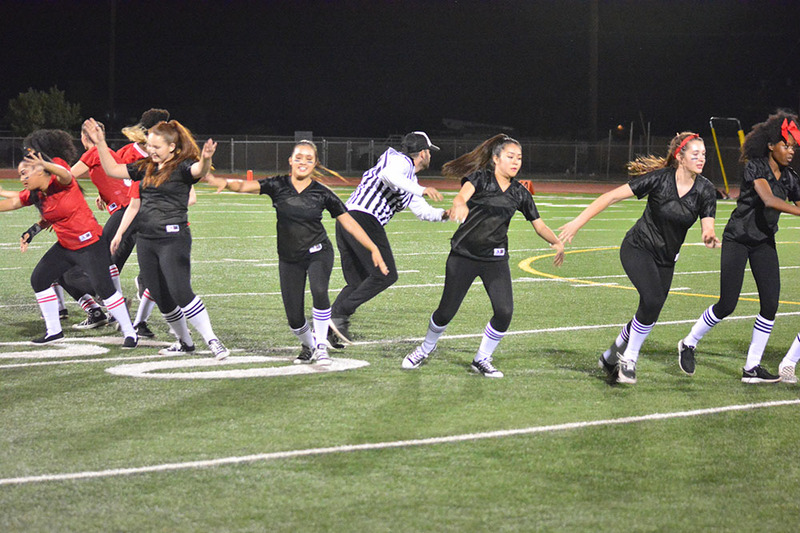 It was capped off by Coleman scampering in from the 35-yard line to tie the score, 20-20. 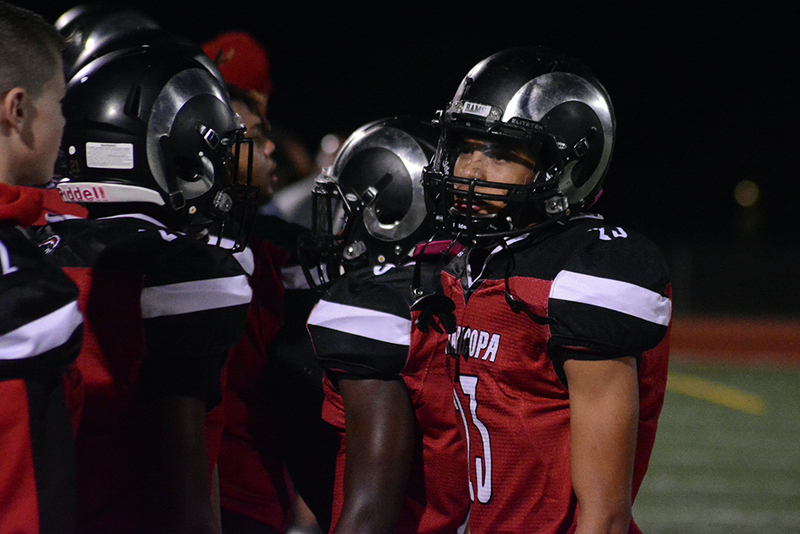 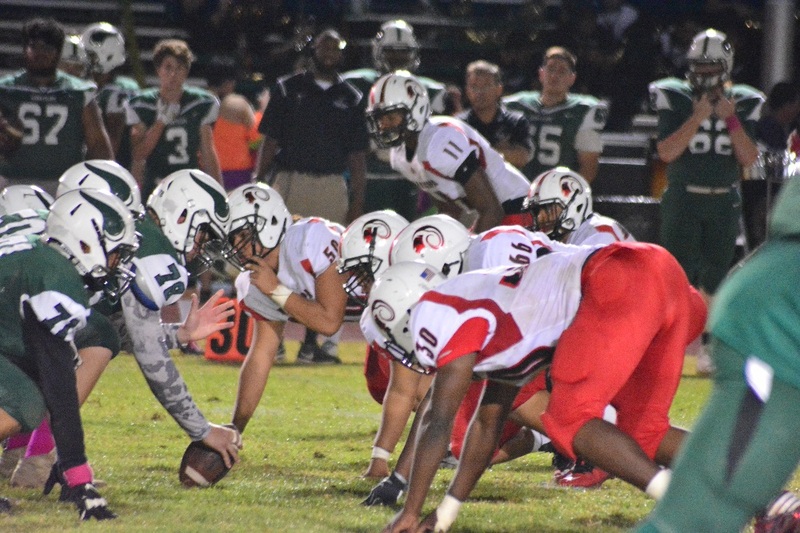 The Rams took advantage of an Apollo fumble to jump start their final scoring drive. 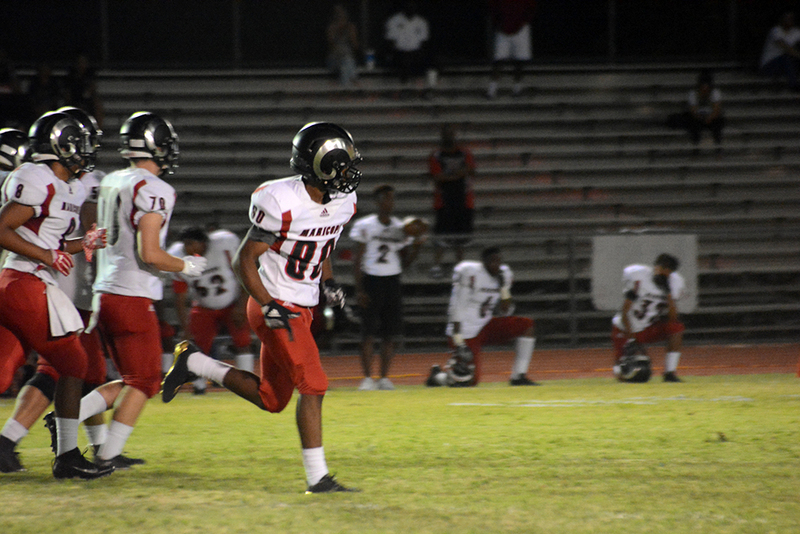 Cowing grabbed a 29-yard pass from Daxton Redfern to score with 7:21 remaining in the game. 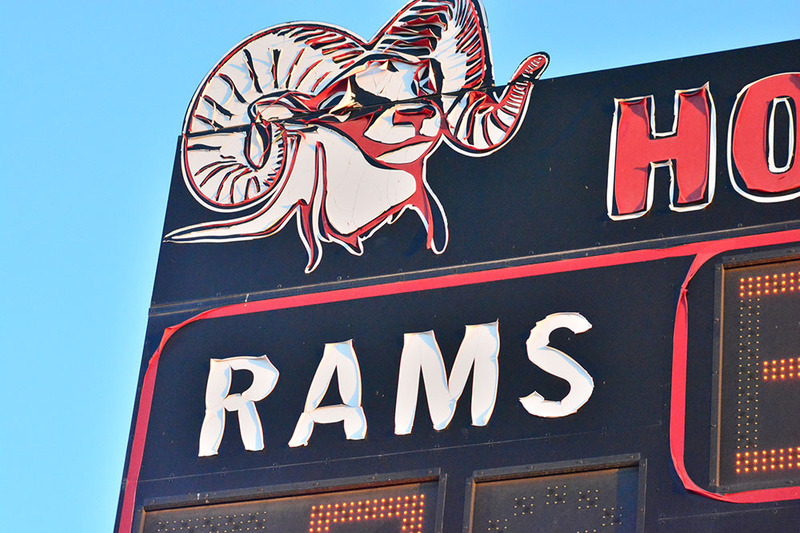 The Rams have scored 12 touchdowns through three games. 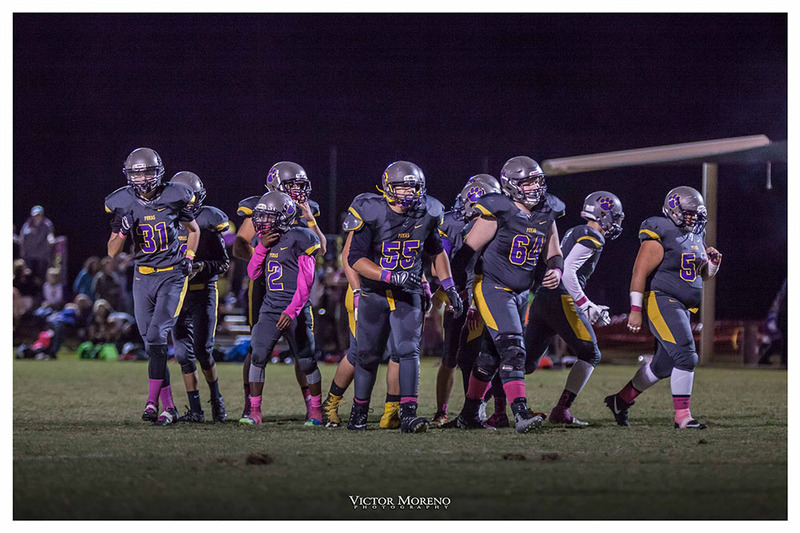 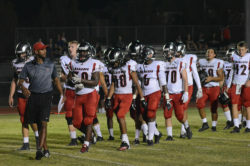 They next play Friday at South Mountain (1-2) in Phoenix. The game starts at 7 p.m. 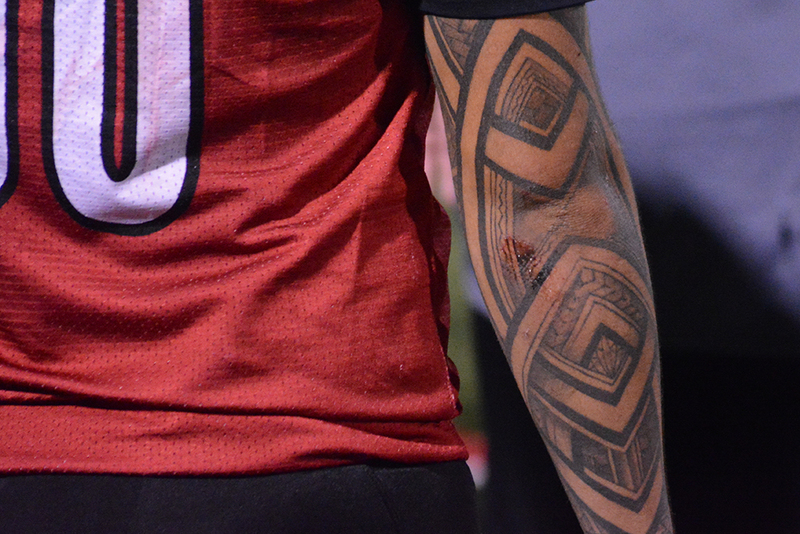 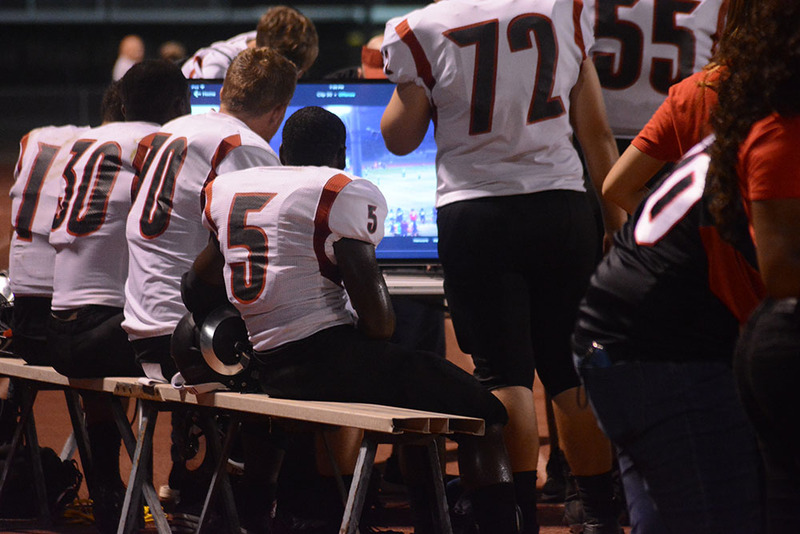 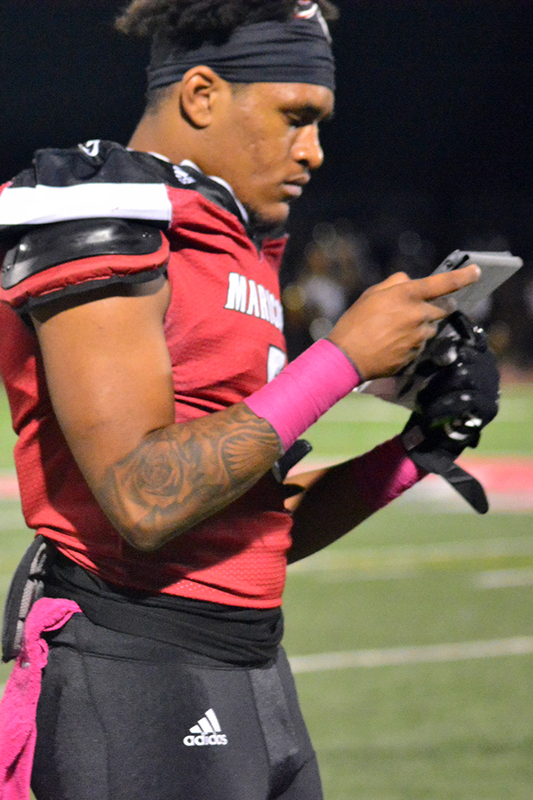 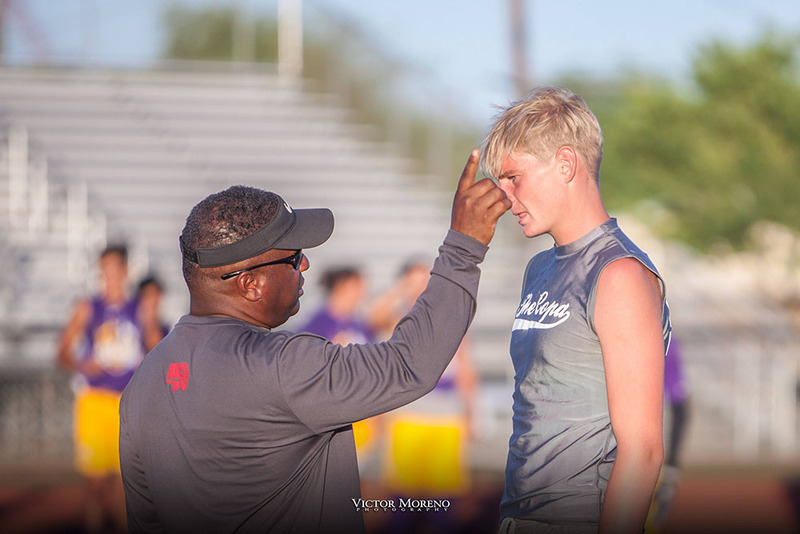 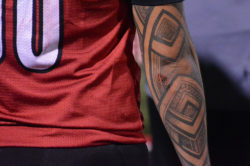 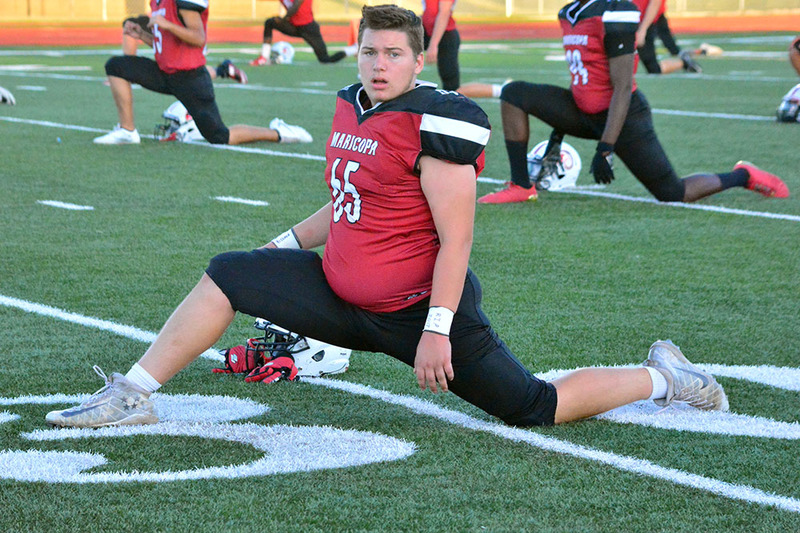 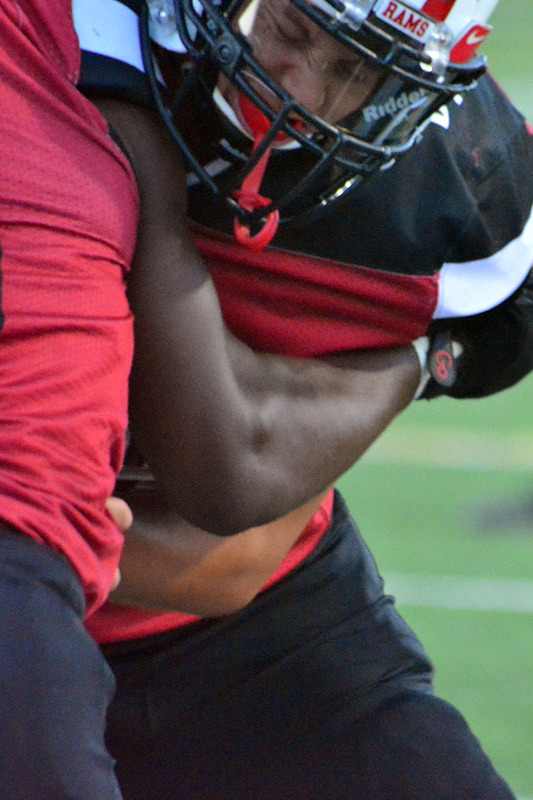 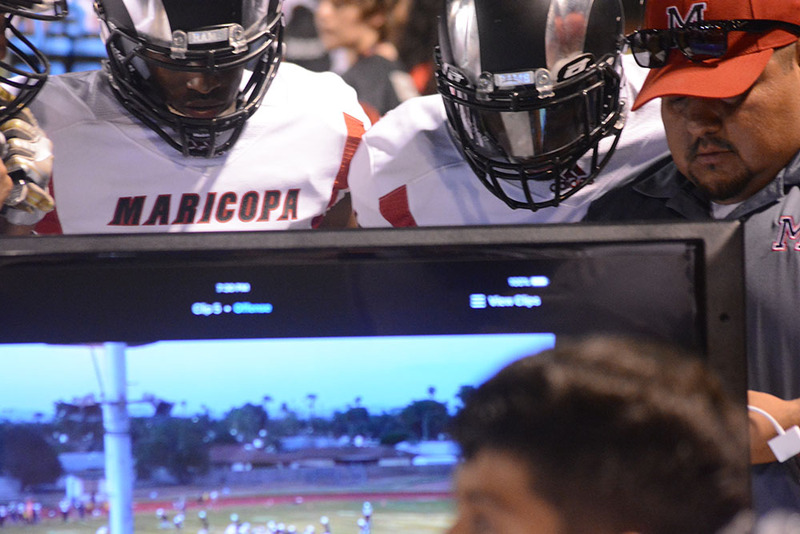 There was very little leisure for Maricopa High School football players this summer. 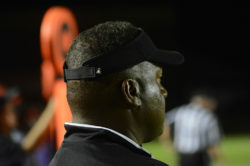 New head coach Brandon Harris ran practices every morning, five days a week. 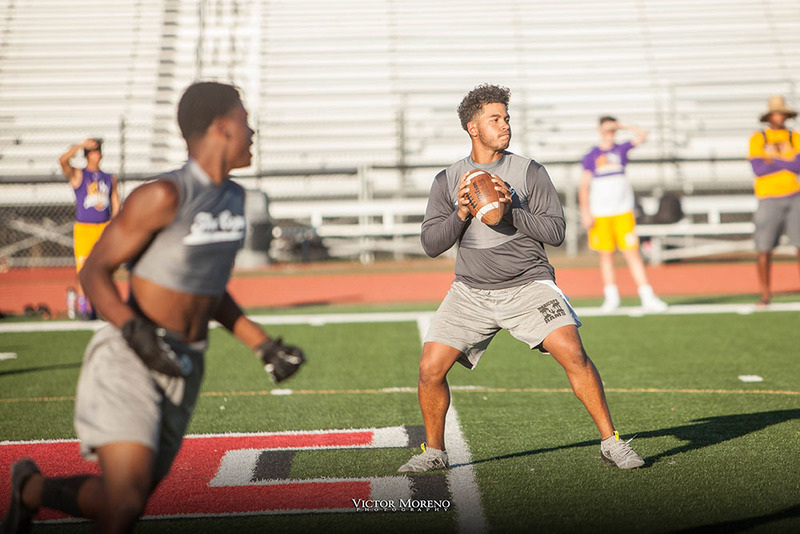 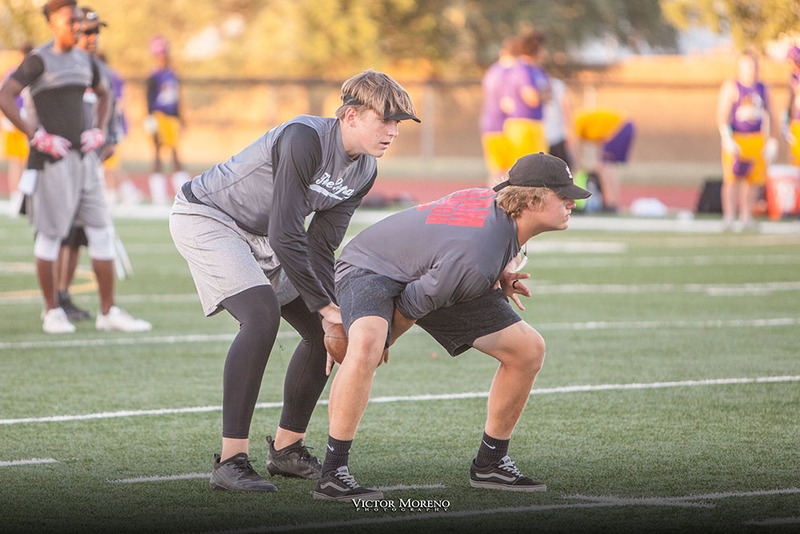 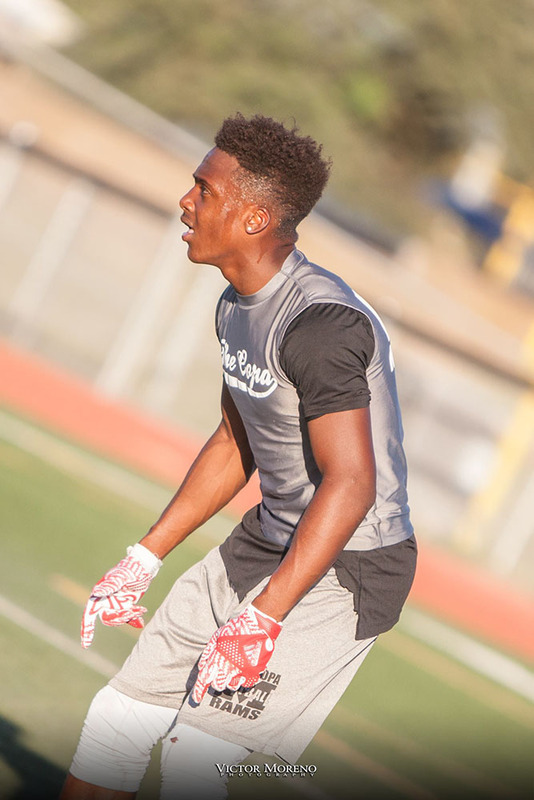 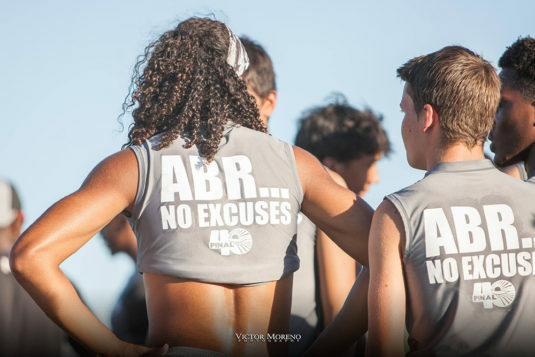 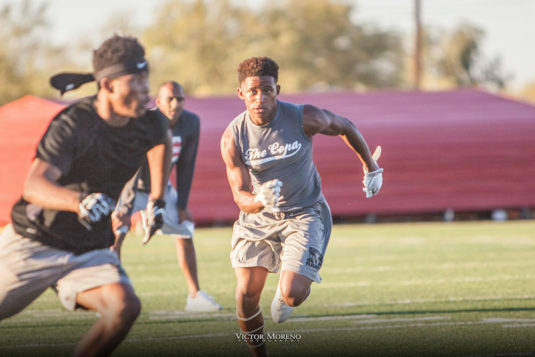 Many nights were filled by 7-on-7 tournaments. 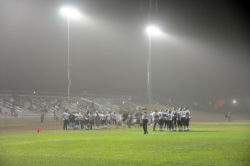 Two weeks before the first day of school, the team left to its annual football camp in Winslow. 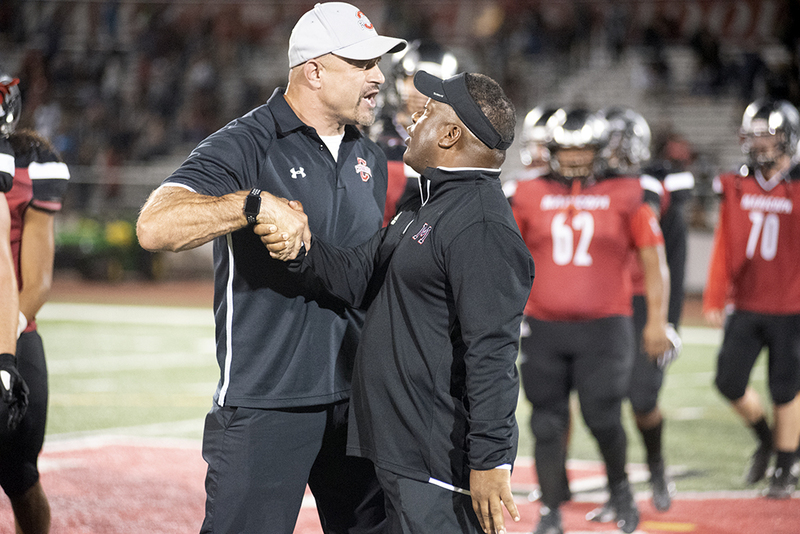 The coaches spend more time with athletes than ever before, Harris said, a practice in measuring the team’s pulse on – and off – the field. 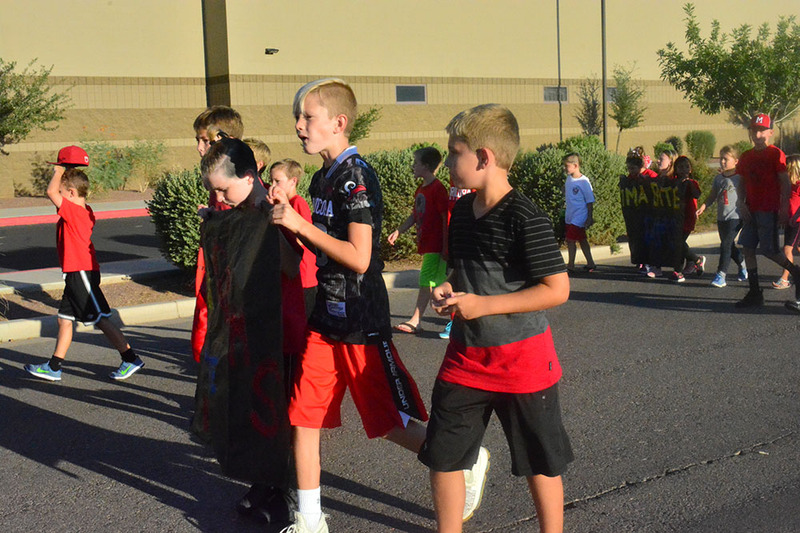 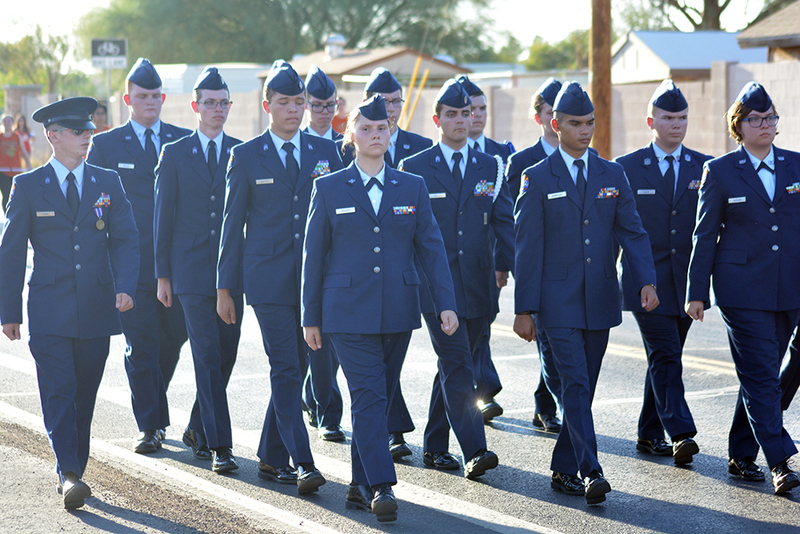 When they weren’t running drills, teammates worked in unison fundraising for the program. 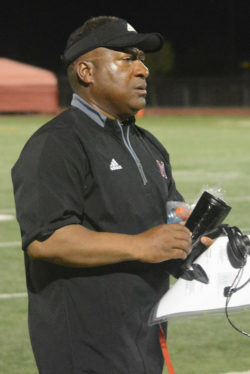 They were coached by Harris on representing the school and the city well, he said. 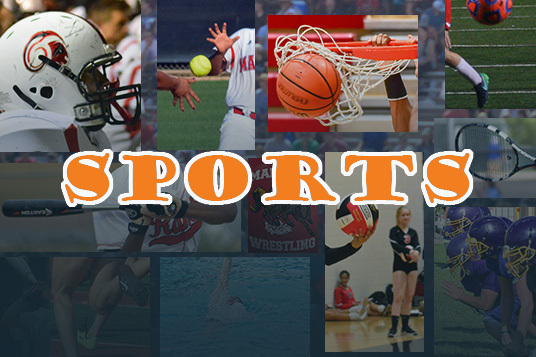 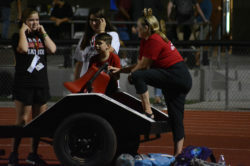 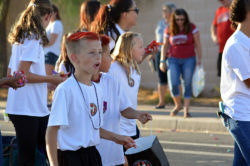 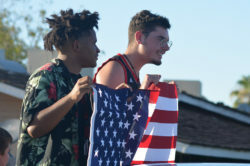 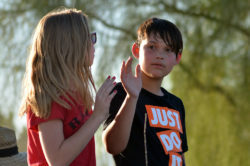 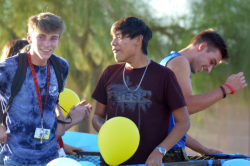 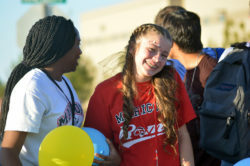 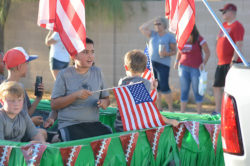 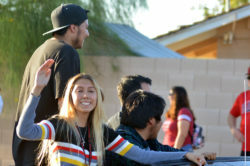 The kids reportedly received compliments on their polite behavior during car washes and other engagements where athletes and coaches introduced themselves to the community. 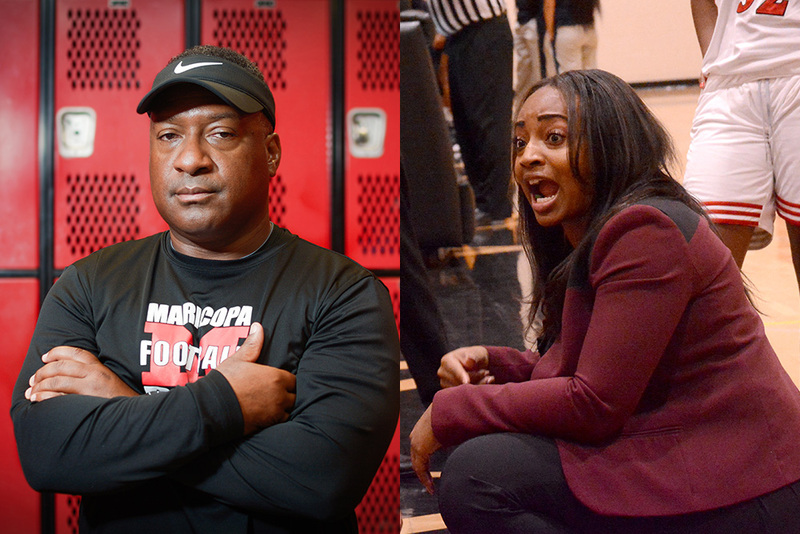 “We are working smart; we’re working hard,” Harris said. 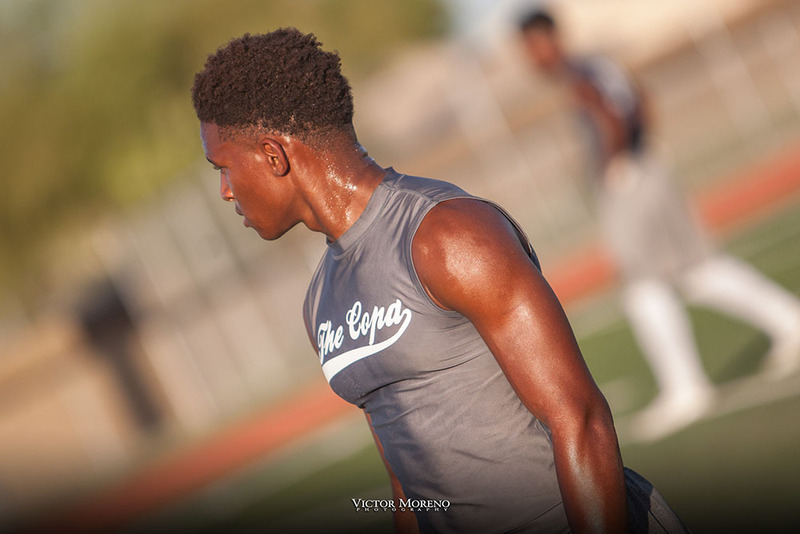 This summer, athletes hit the weight room after their meals – an intake of protein and carbohydrates developed by coaching staff. 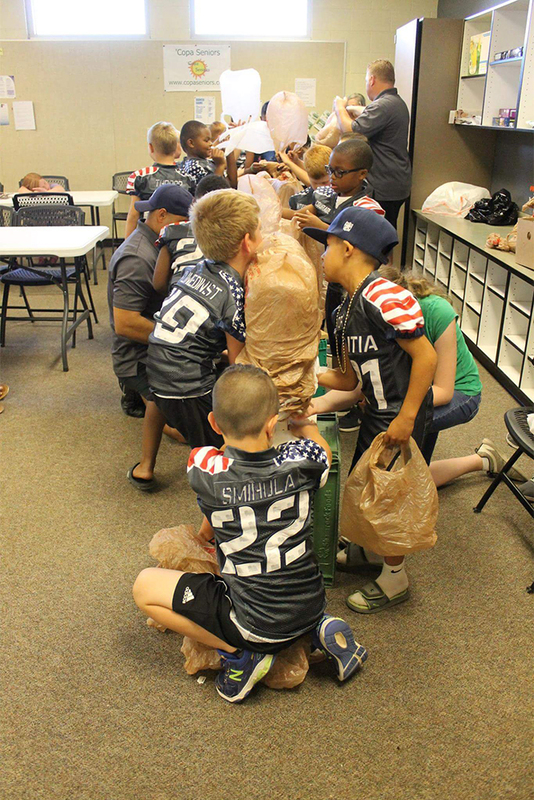 And while participating in any activity together, Harris only allows uplifting communication between the group. 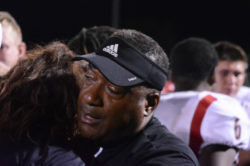 “We don’t coach from any negativity or fear because fear is very close to hatred and you can’t play well with either one of those feelings,” Harris said. 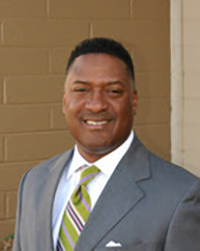 Harris is an experienced leader on the gridiron, having previously coached championship high school state team sand collegiately. 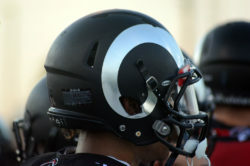 His goal is to reinvent the Rams, who will sport redesigned uniforms, into a team that not only wins games, but wins in life. 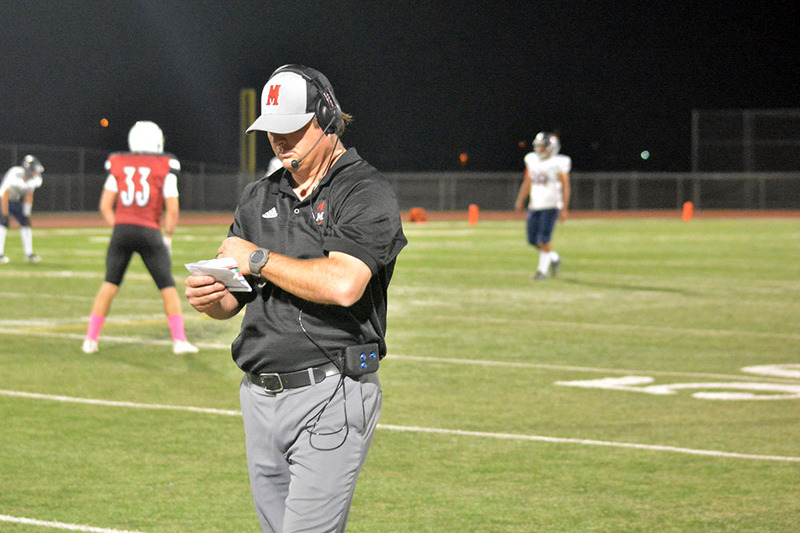 New district Athletic Director Jacob Neill likes the approach. 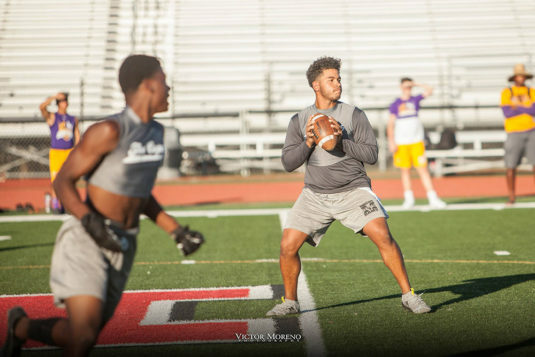 “If you have a high level of participation and you’re successful in what you’re doing with the kids in your program, it’s going to ultimately have a positive impact on the culture of not just your athletics program but your entire school,” Neill said. 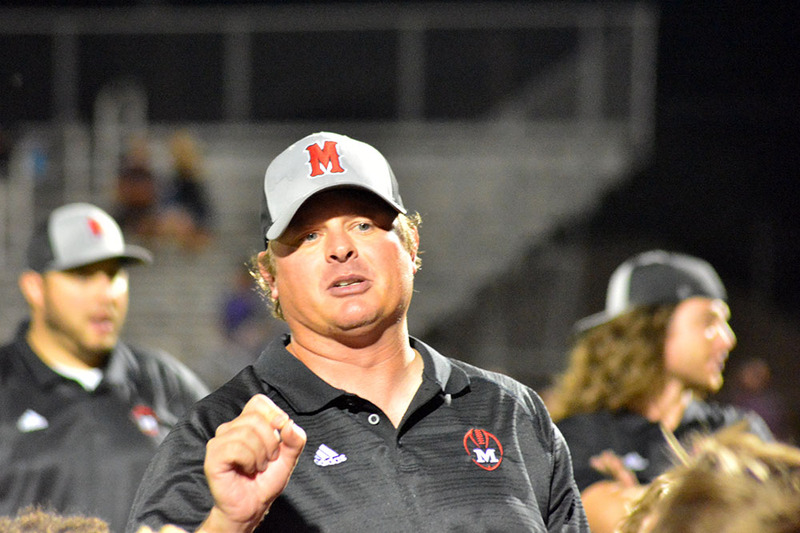 In 2016, Neill left the district after working four years as head basketball coach at MHS. 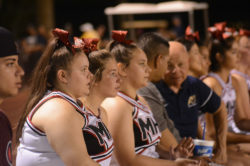 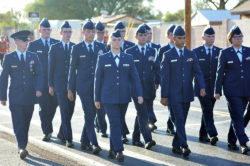 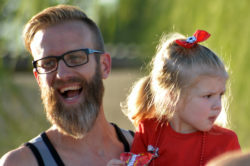 He was the AD and assistant principal of Poston Butte High School in San Tan Valley before his recent return to Maricopa. 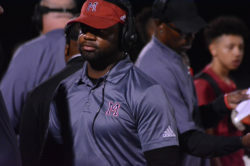 That experience has lent well to the football program under Harris. 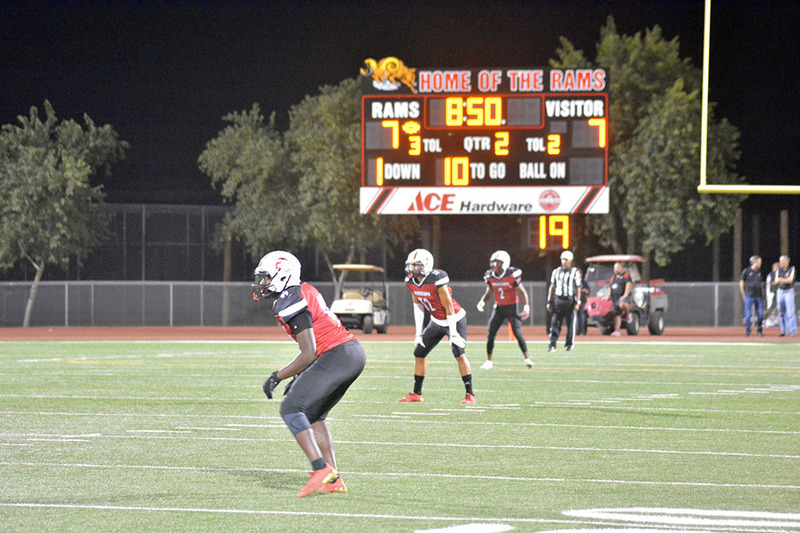 While the Rams work to recreate themselves and improve upon last year’s 6-4 record, the team is also adjusting to a new, competitive region. 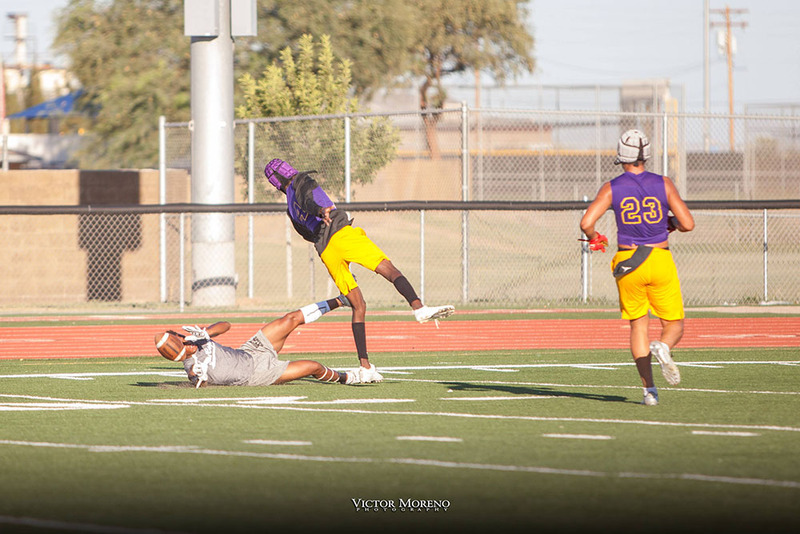 Harris said the team had “flashes of spectacular play” against opponents in the 5A San Tan Region during the 7-on-7s this summer. 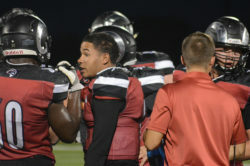 But Neill and Harris agreed the region will be a great test for the program that is still developing its pulse. 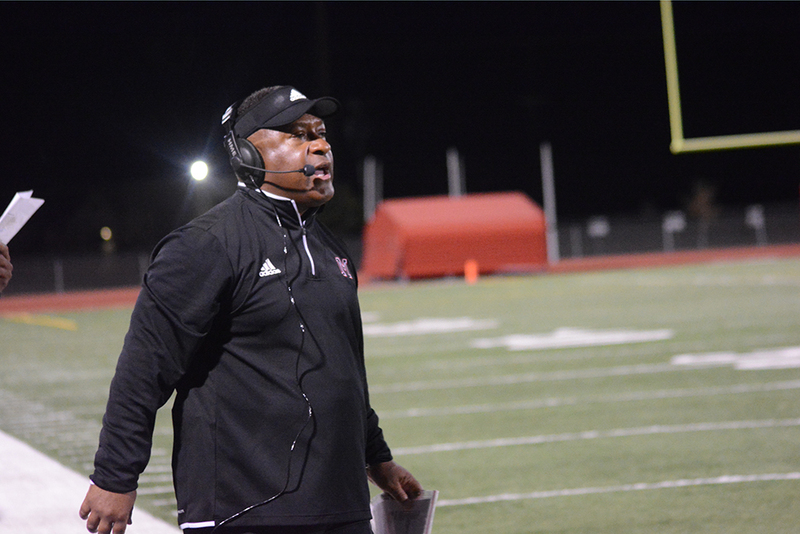 “We are a team that’s loaded with a lot of players and talent, and now it’s just a matter of us putting that talent to use,” Harris said. 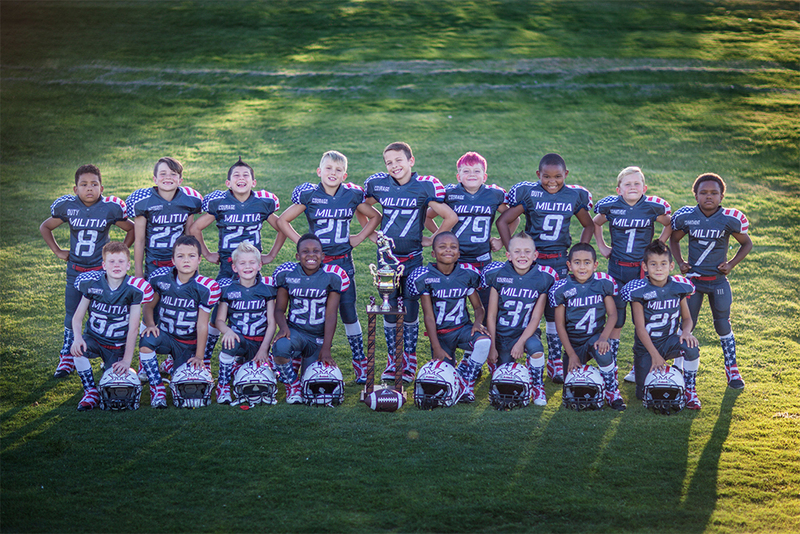 All varsity games at 7 p.m.
A youth tackle football program is recruiting players age 6-9 for a fall season. 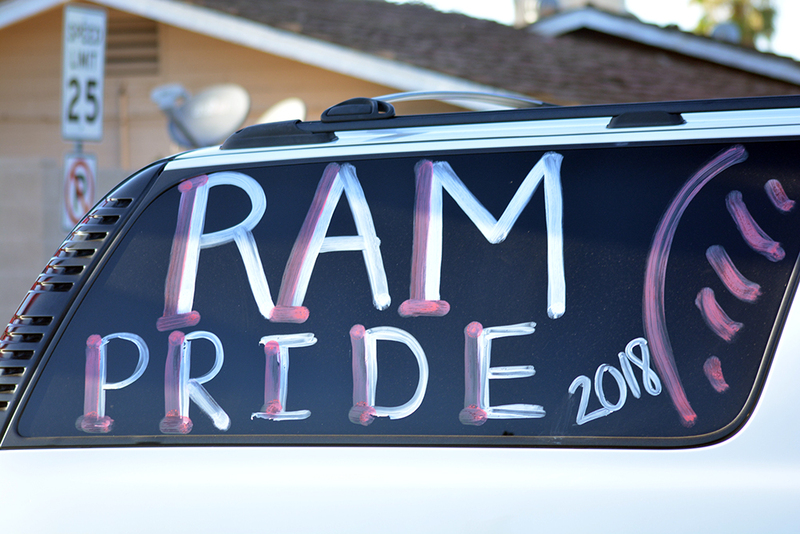 When: June 30, 8-10 a.m. 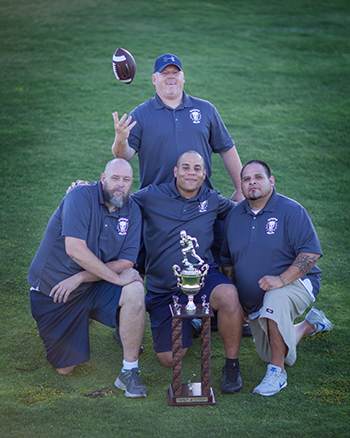 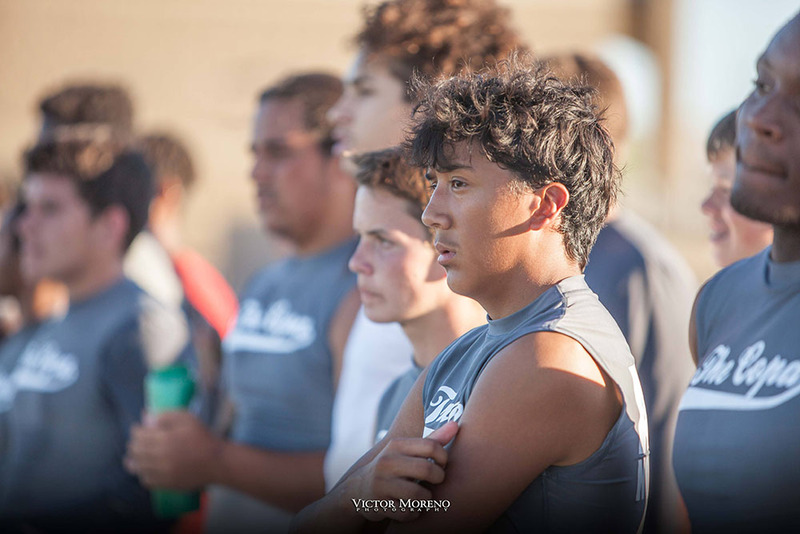 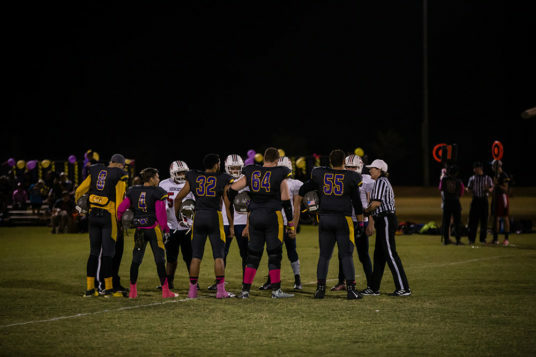 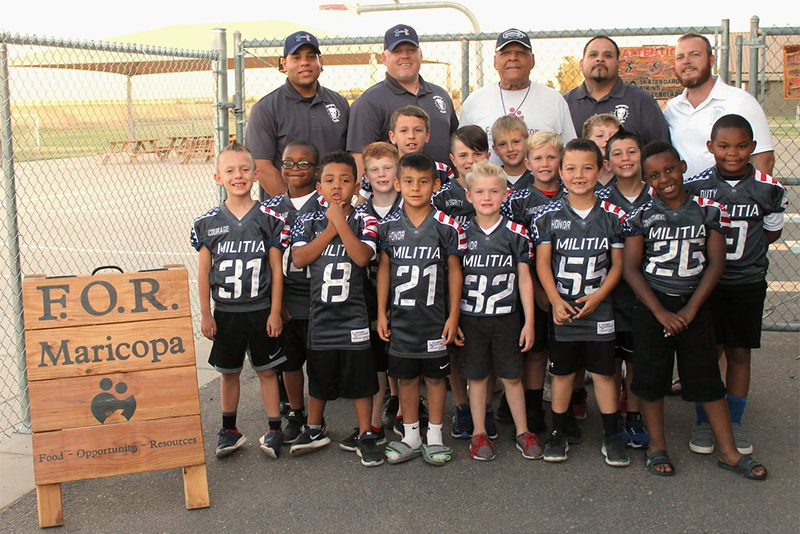 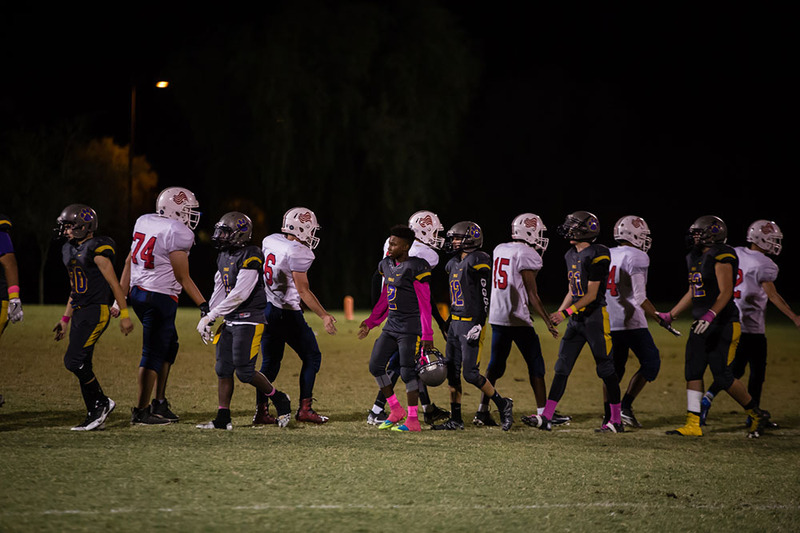 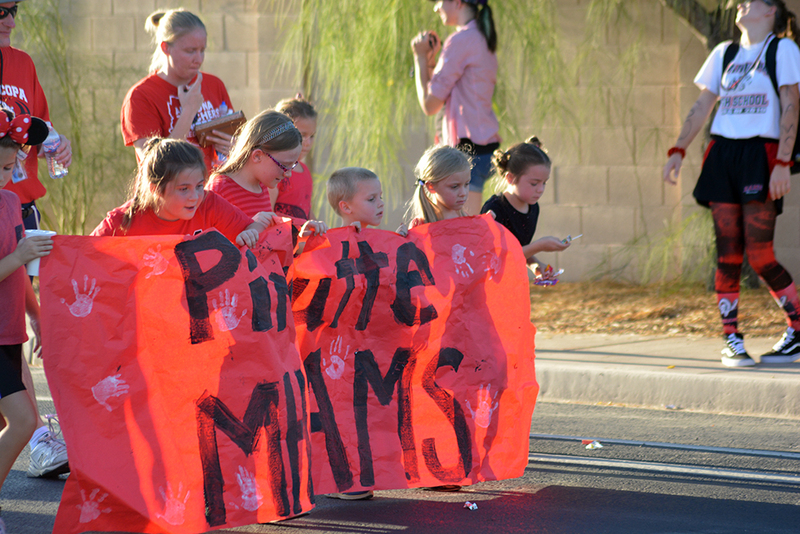 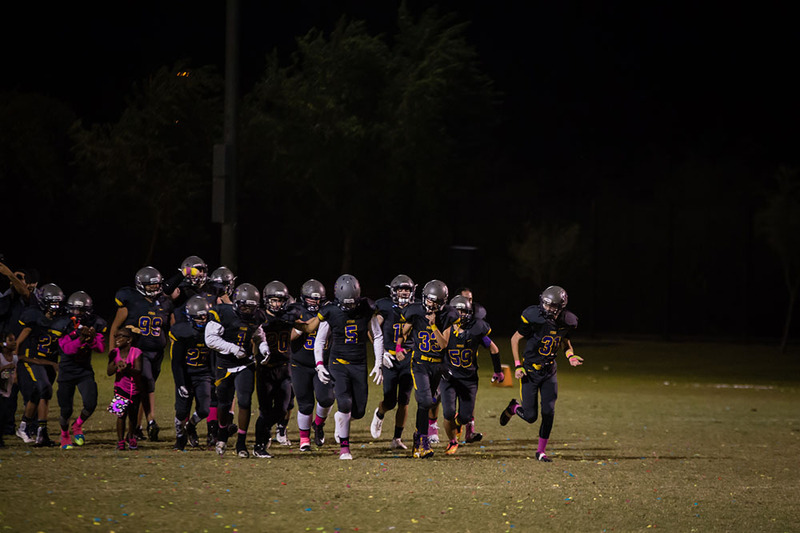 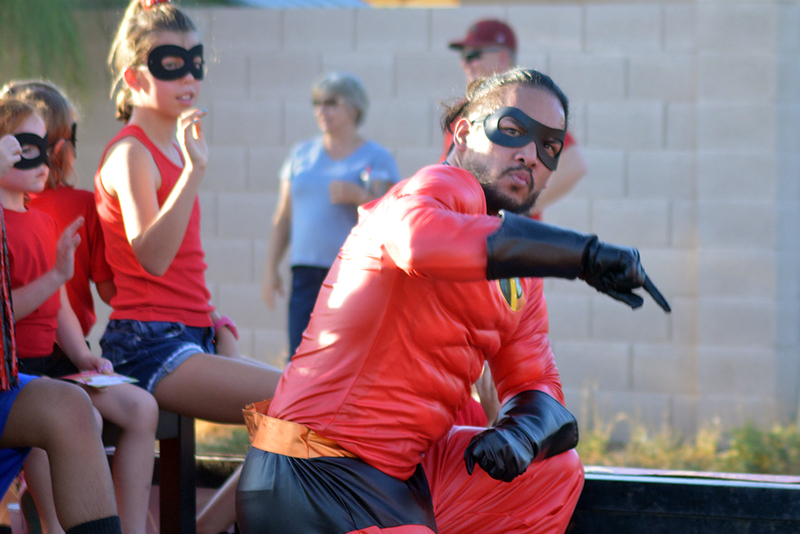 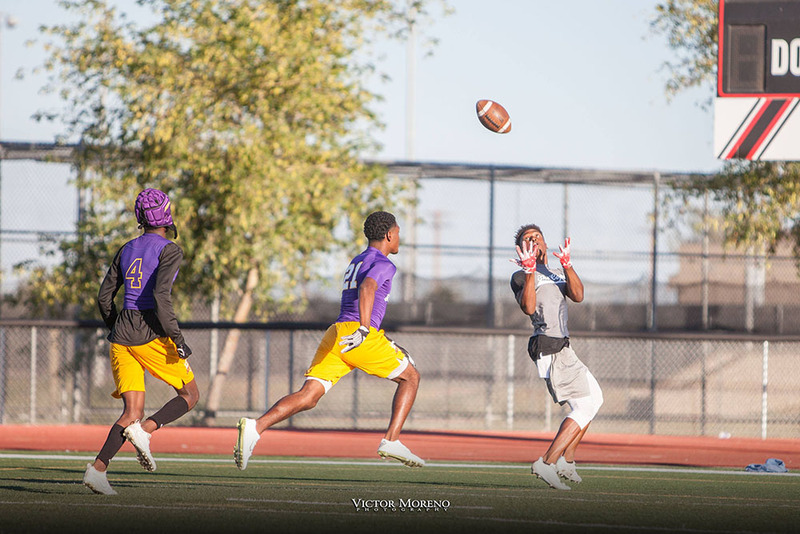 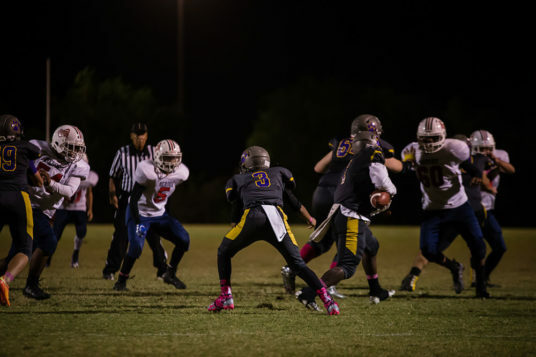 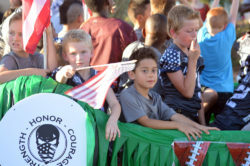 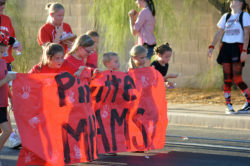 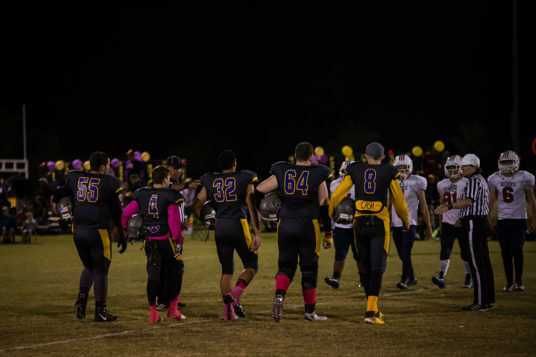 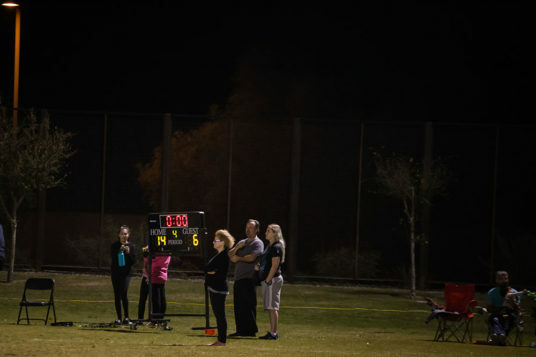 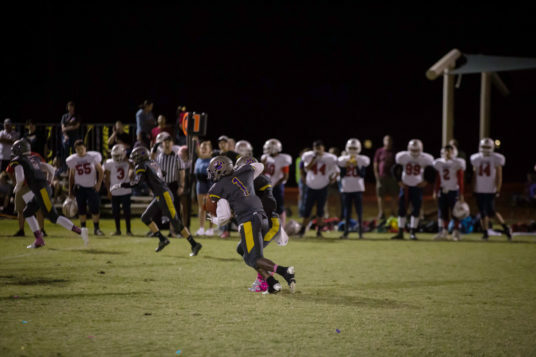 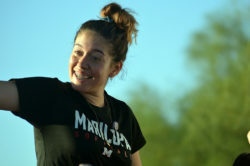 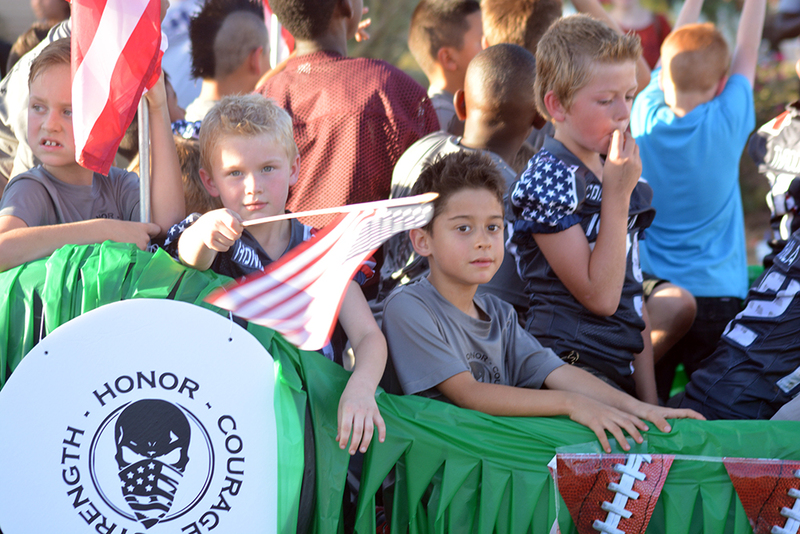 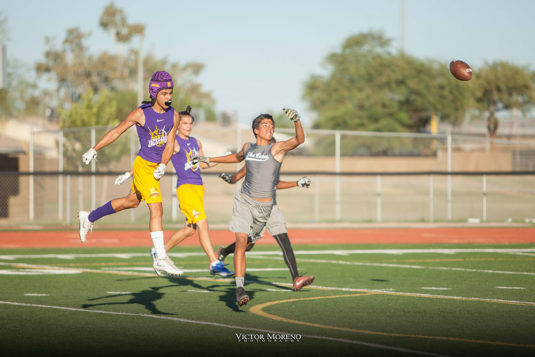 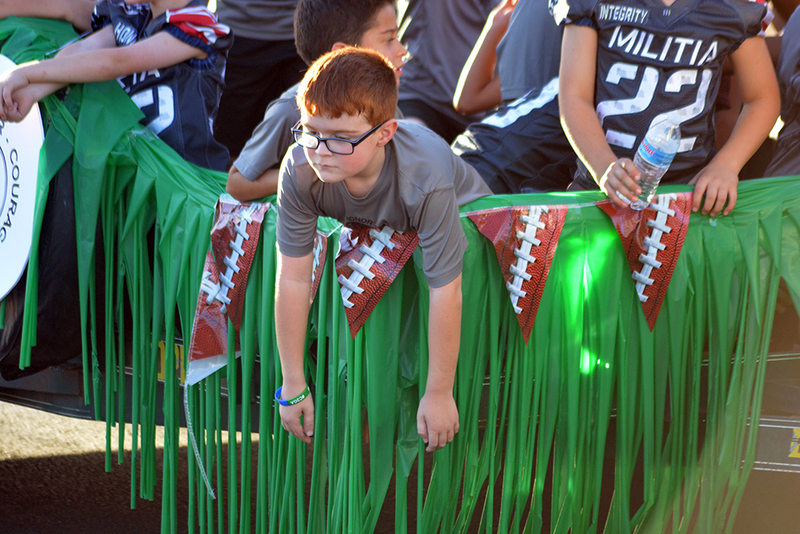 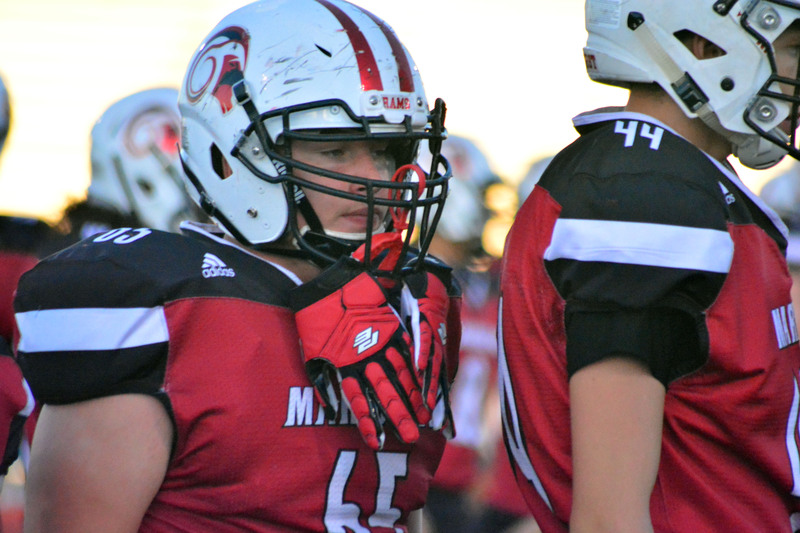 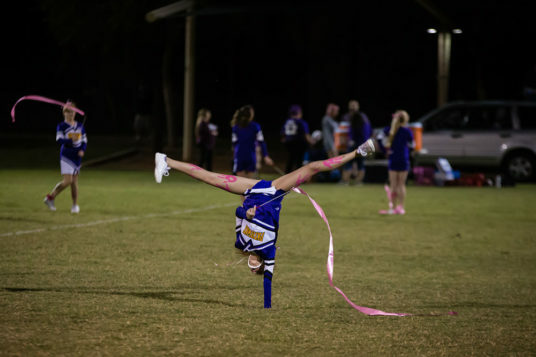 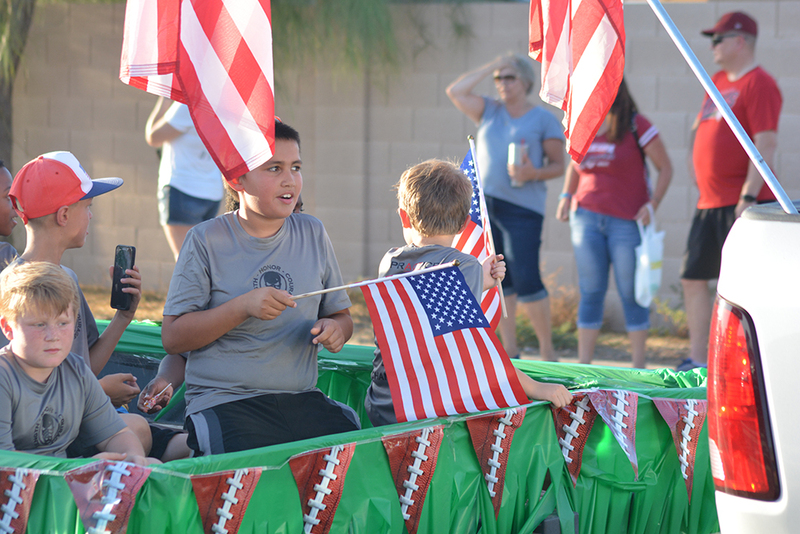 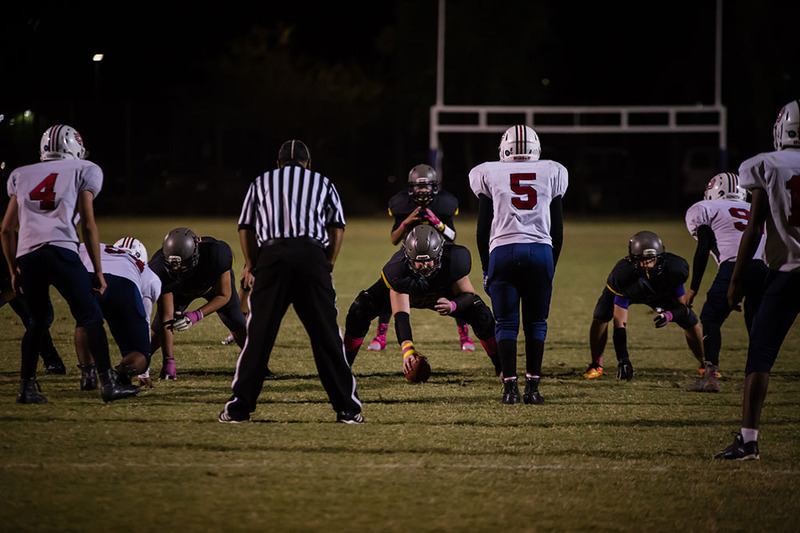 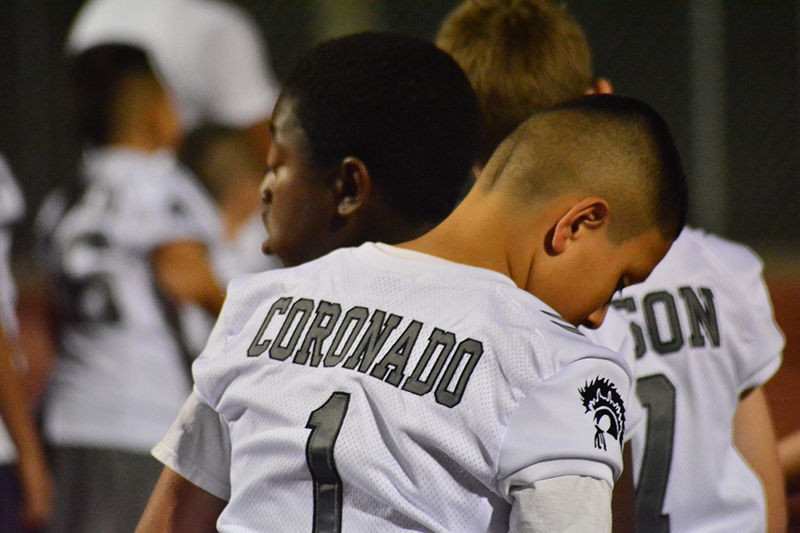 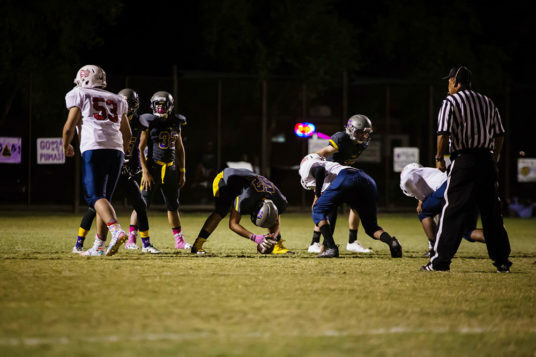 The Maricopa Militia is part of the nonprofit National Youth Sports football league. 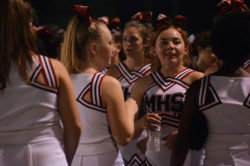 Team manager Joanne Taylor said the team was formed after the disappointment of false starts by other teams that have come and gone. 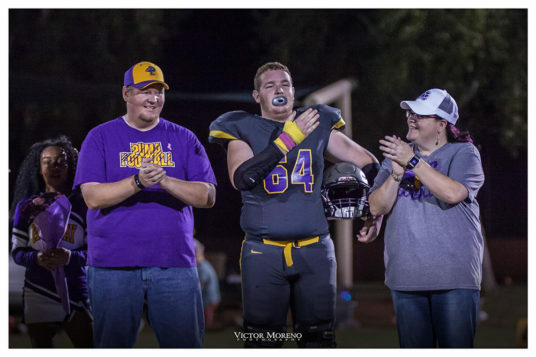 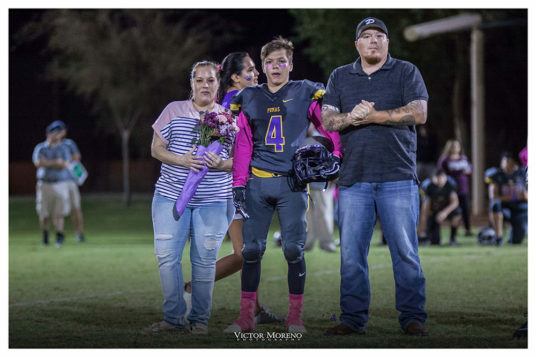 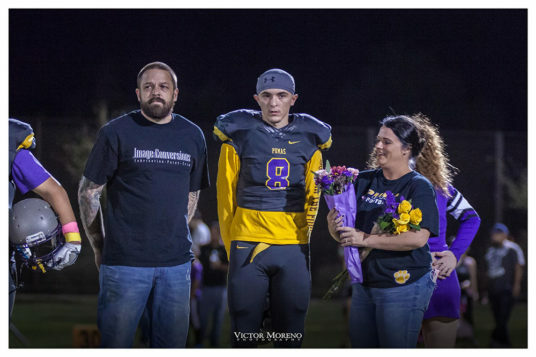 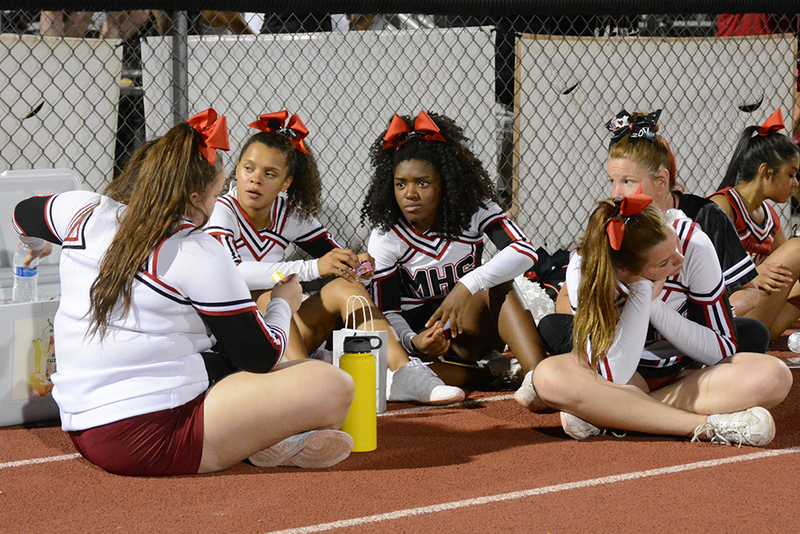 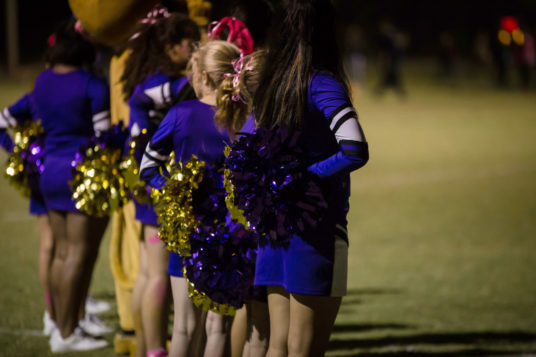 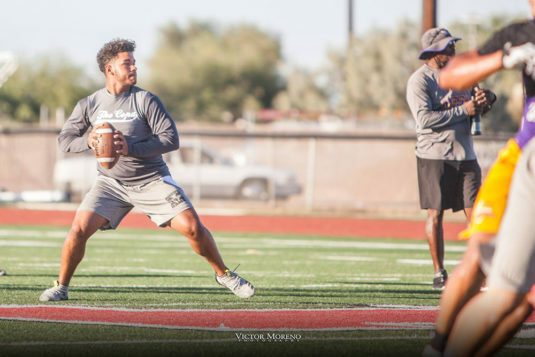 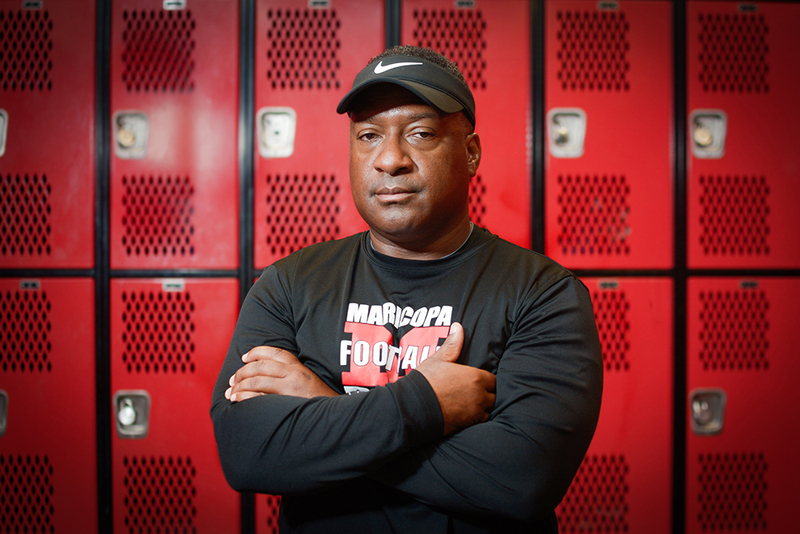 “Some of our players and coaches have been playing tackle football here in Maricopa for the past four to five years and have had to endure many empty promises, failed leadership, belittlement and discrimination,” Taylor said. 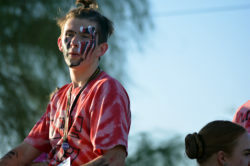 The Militia was conceived as a way to change all that. 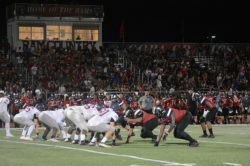 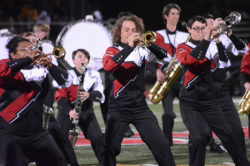 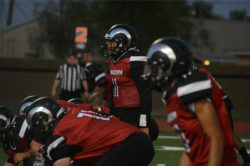 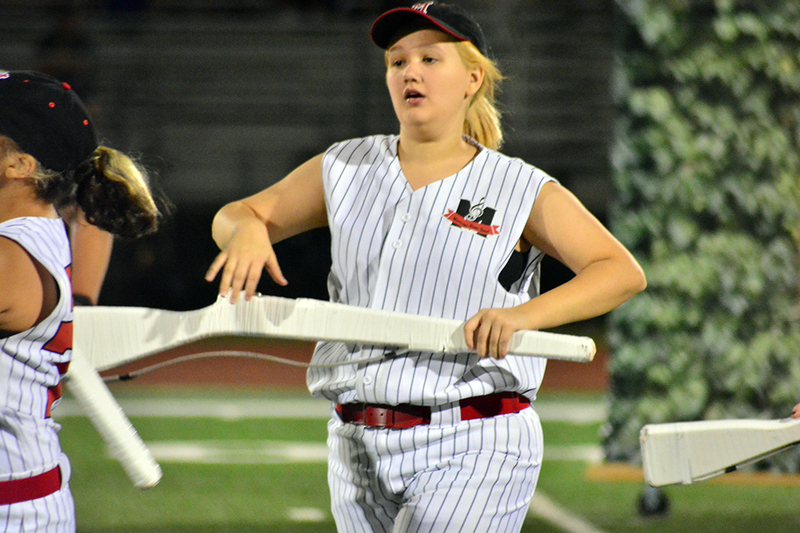 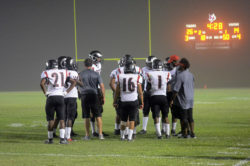 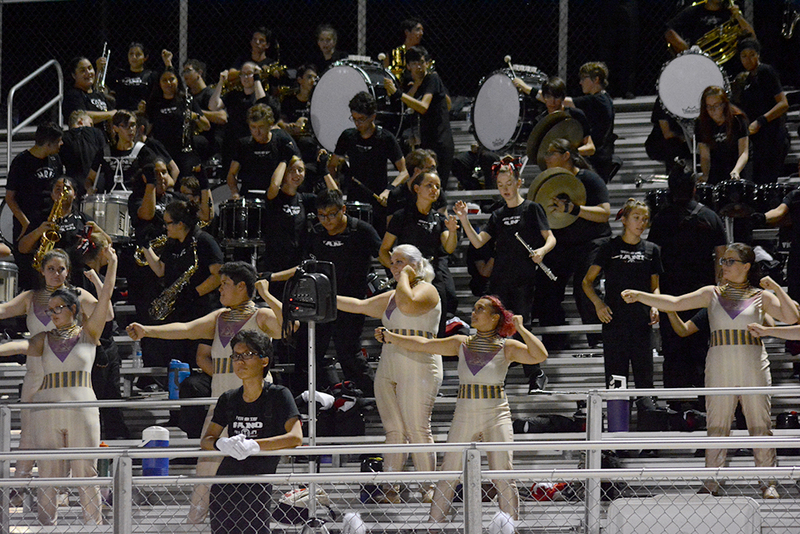 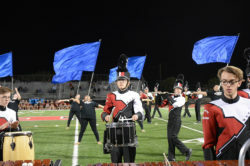 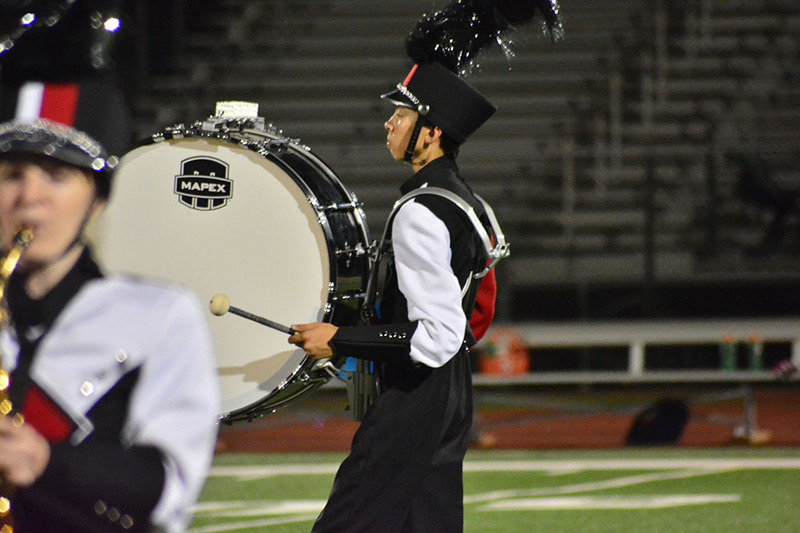 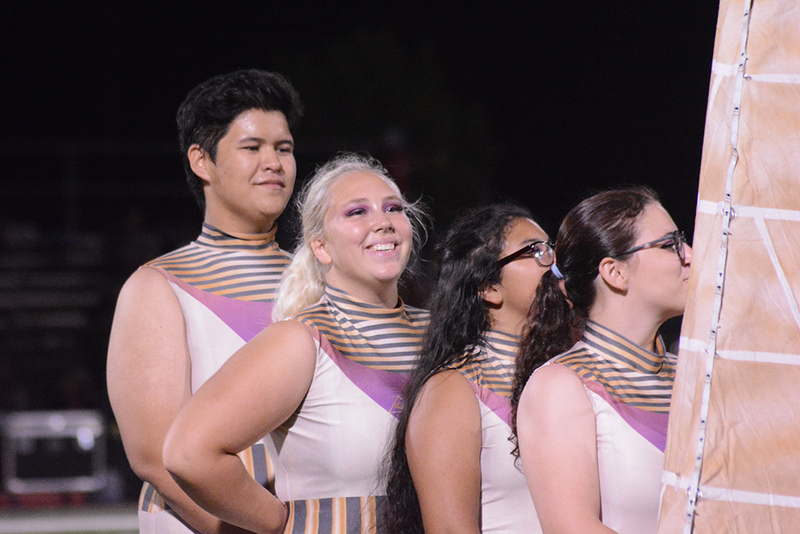 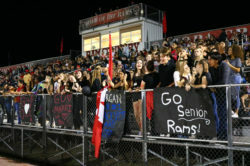 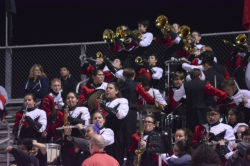 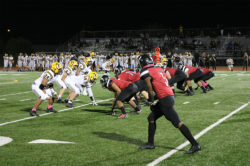 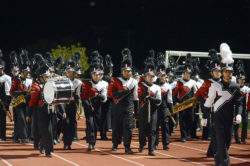 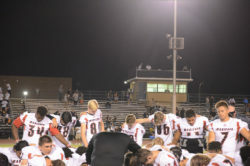 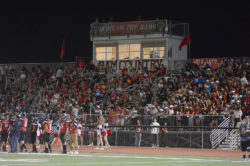 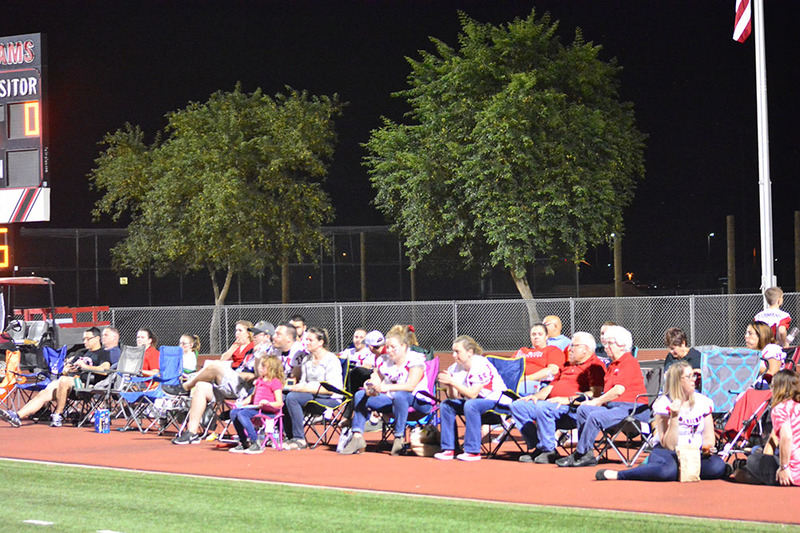 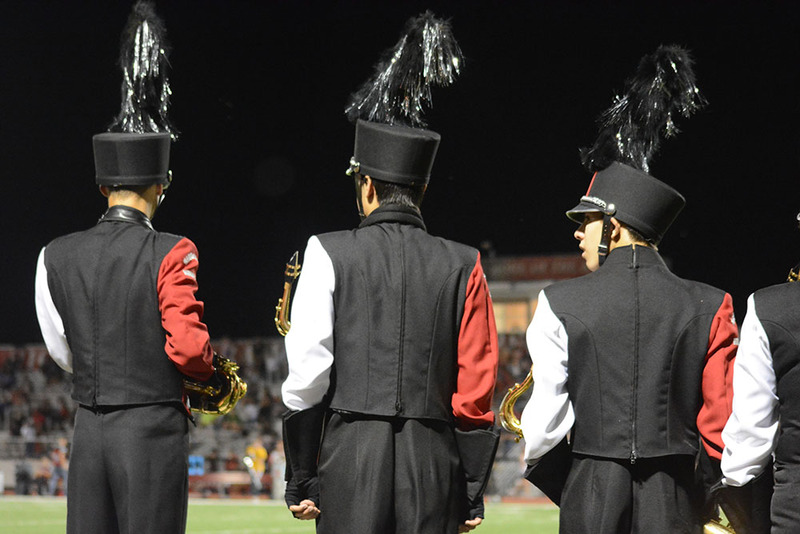 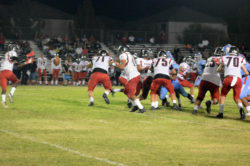 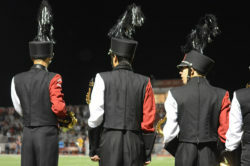 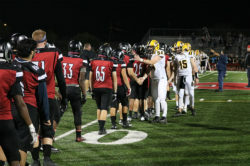 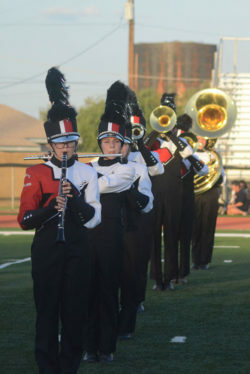 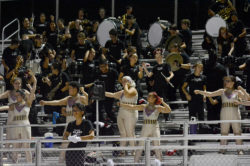 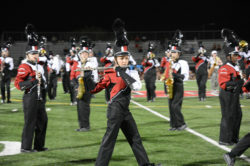 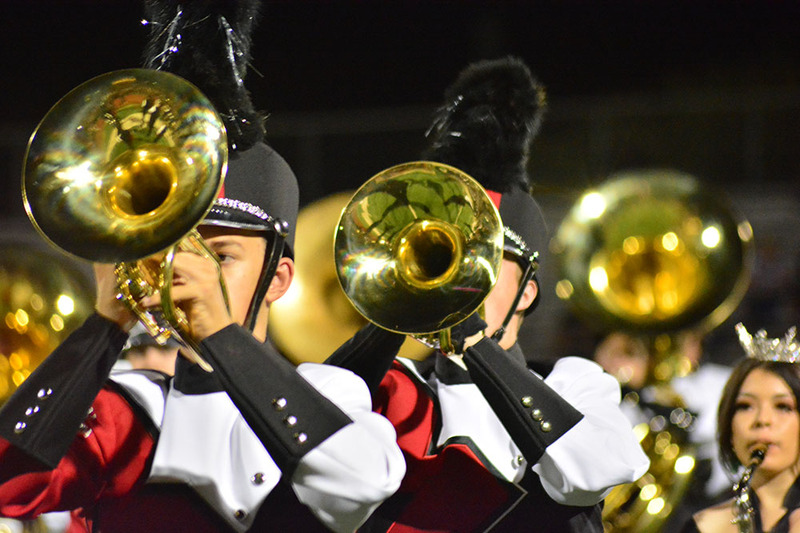 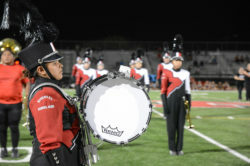 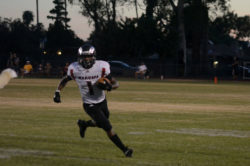 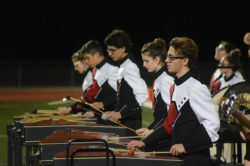 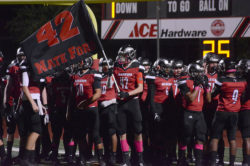 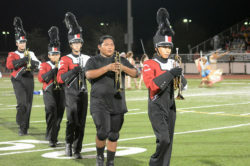 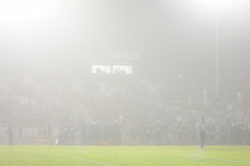 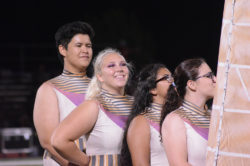 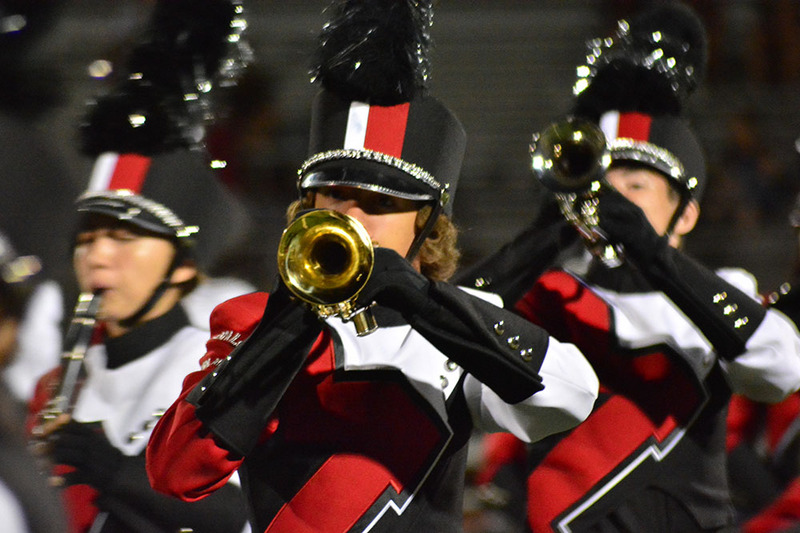 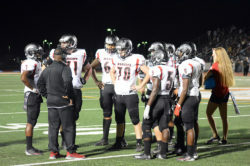 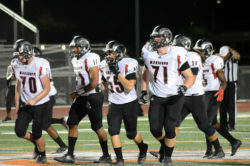 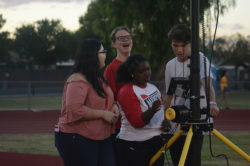 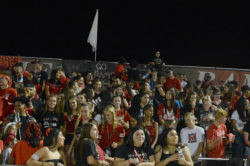 The Militia’s home games are played on the Maricopa High School field. 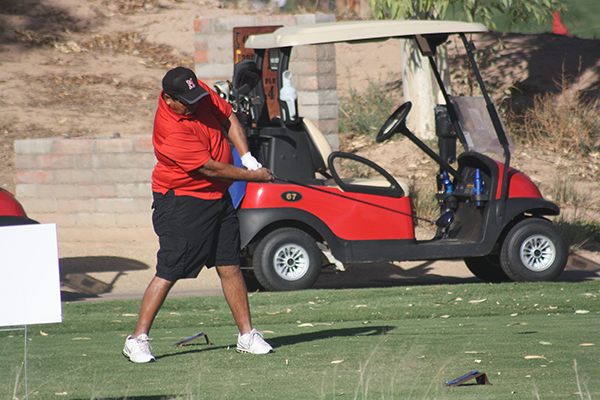 Head coach for 7-under and 8-under teams is Josh Taylor, assisted by Dave Taylor, Jay Owens, Ruben Adame and Louie Placencio. 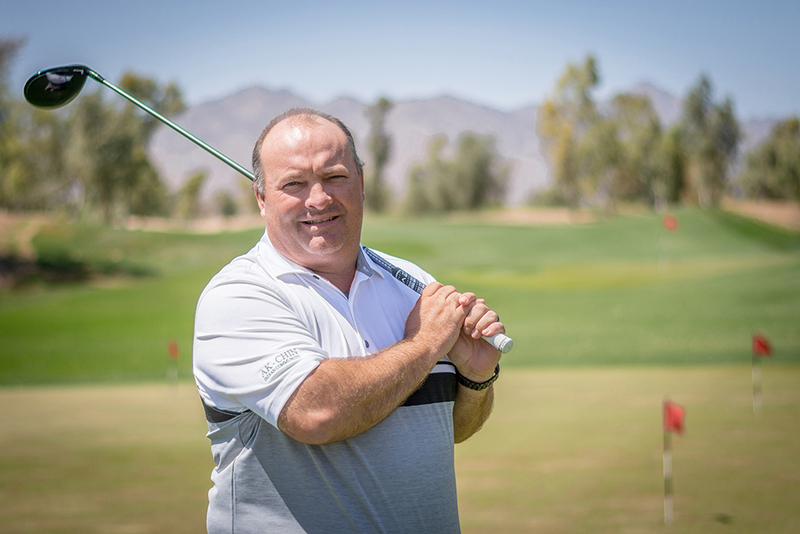 If the 9-under team comes to be, another coach will be added. 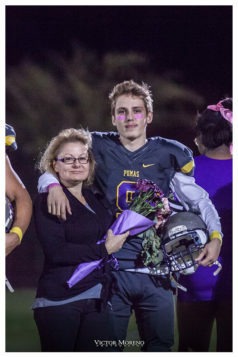 Matt Rivett handles the finances, and team mom is Tara Owens. The Militia will host a speed and conditioning clinic on June 30 at Copper Sky Regional Park from 8 to 10 a.m. This free clinic is for current and prospective players to display and build new skills. 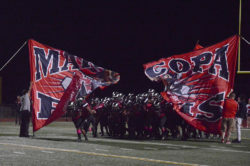 The fall season starts July 30. 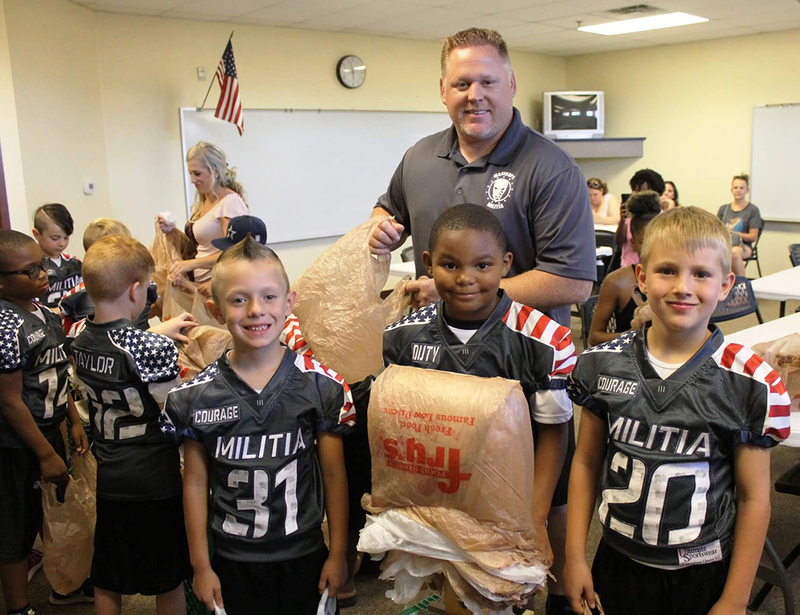 Besides learning tackle football, the Militia players are urged to participate in community service. “Our goal is to perform at least one act of service as a team per season. 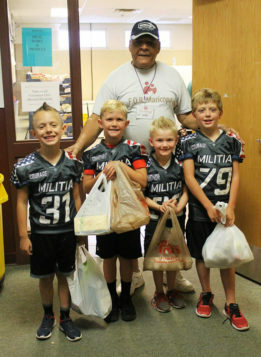 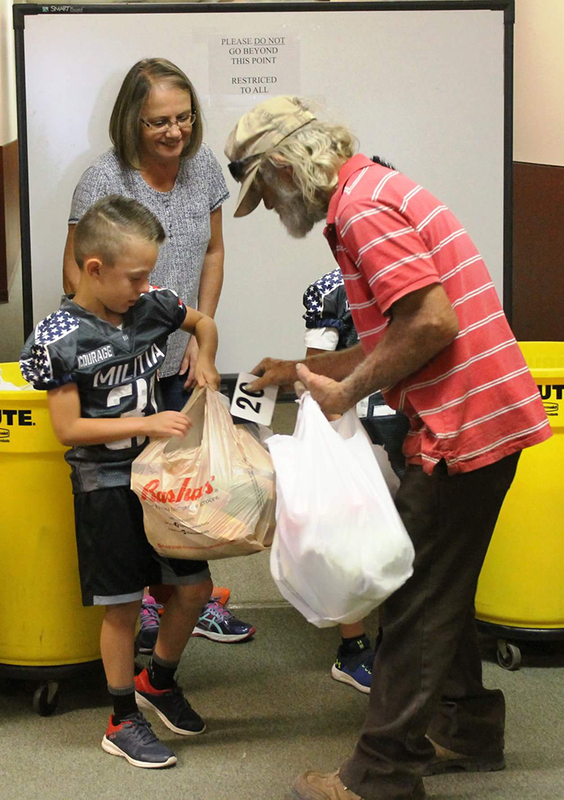 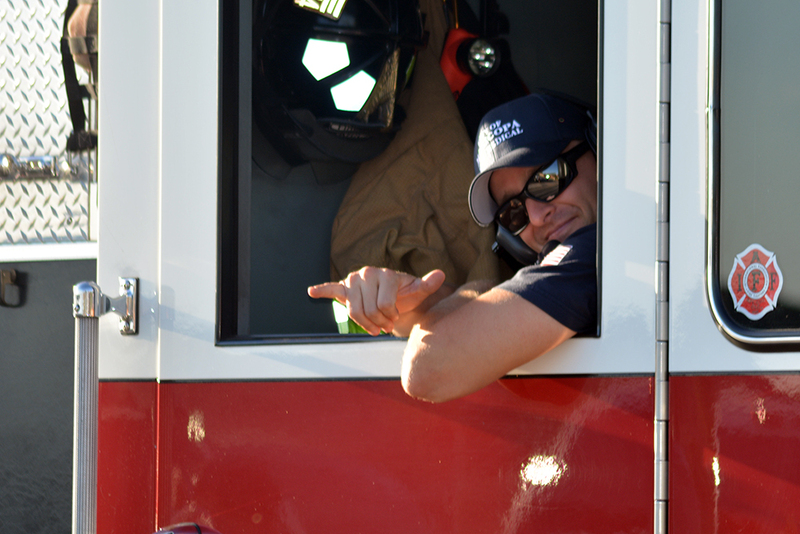 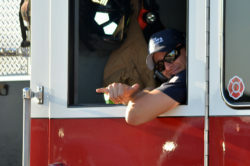 This past season we assisted the Maricopa Food Bank (located at Santa Cruz Elementary School),” Taylor said. 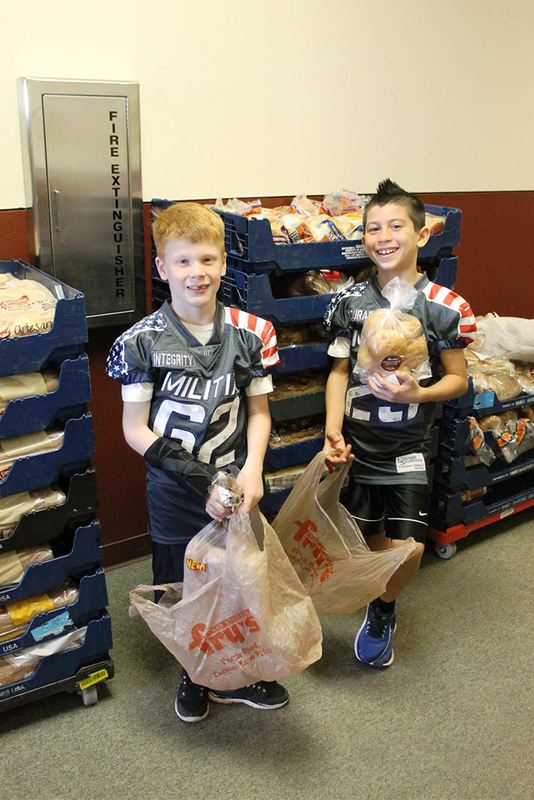 “This was a great opportunity for us to support and give back to our community. 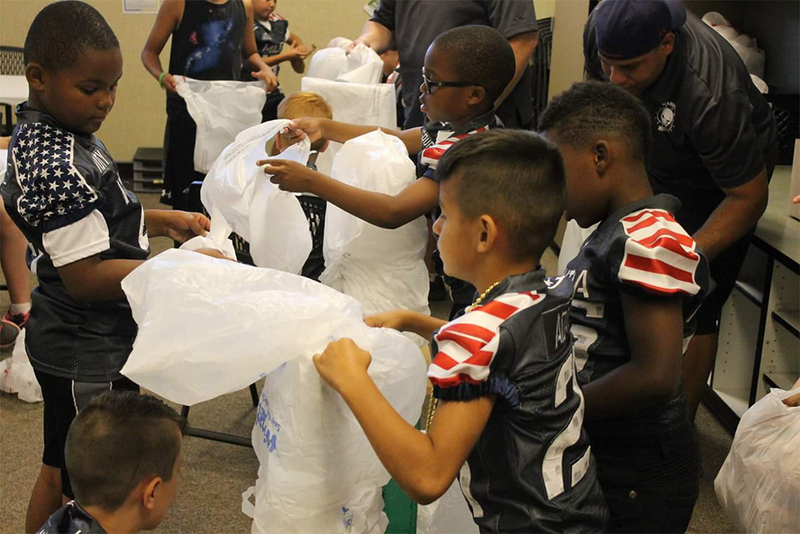 While at the Food Bank, our players were able to sort and prepare new and donated plastic bags to be filled with vital canned goods and grocery items for the families in need in our community.” See photos below. 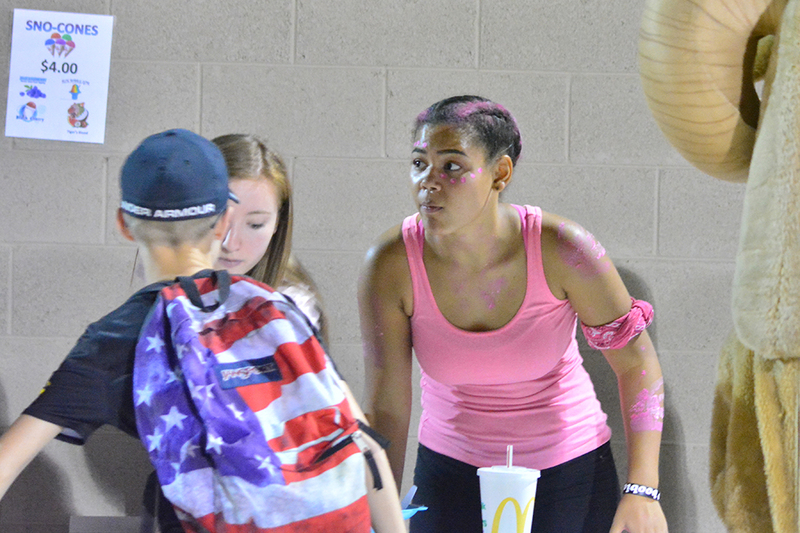 Taylor said community service helps the players feel good about themselves through helping others. 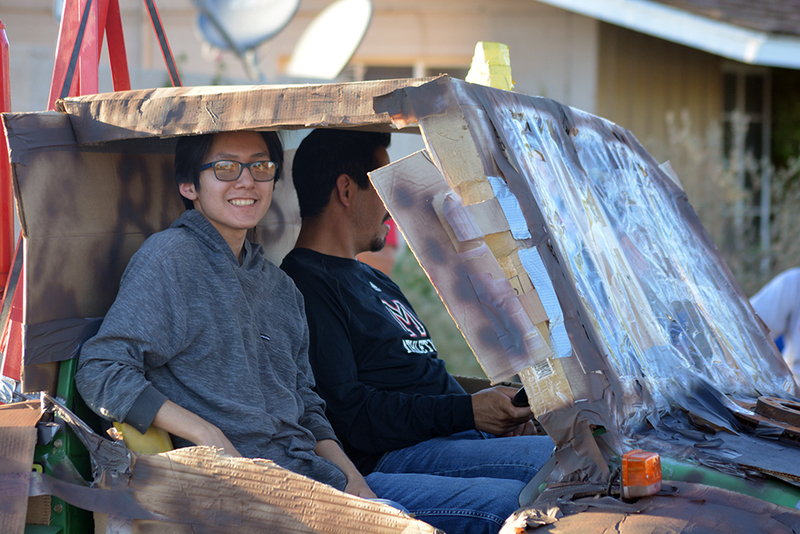 It also engages them in the community and creates bonds outside the football field. Organizers chose the name Militia to echo the military comparisons intrinsic to football. 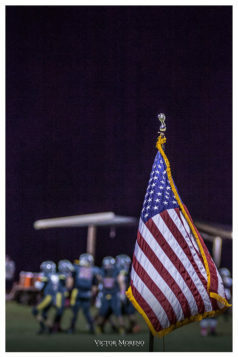 Being part of NYS allows the team to keep its costs down and keep the program affordable. 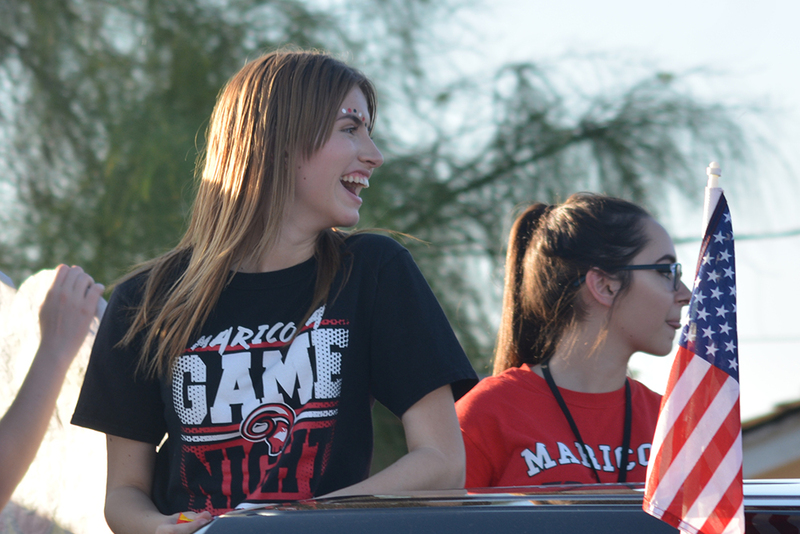 Taylor said the team also benefits from “generous donations” from Maricopa businesses like Water and Ice and Native Grill & Wings. 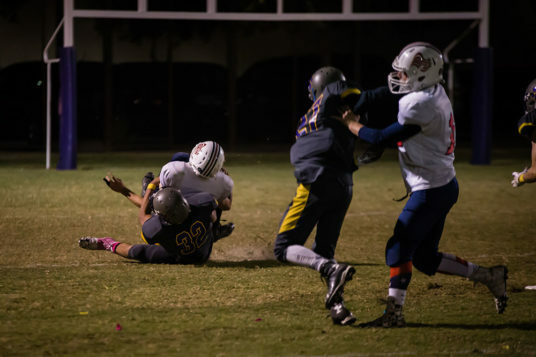 This year’s goal is to play in the NYS National Tackle Championship tournament in San Diego. 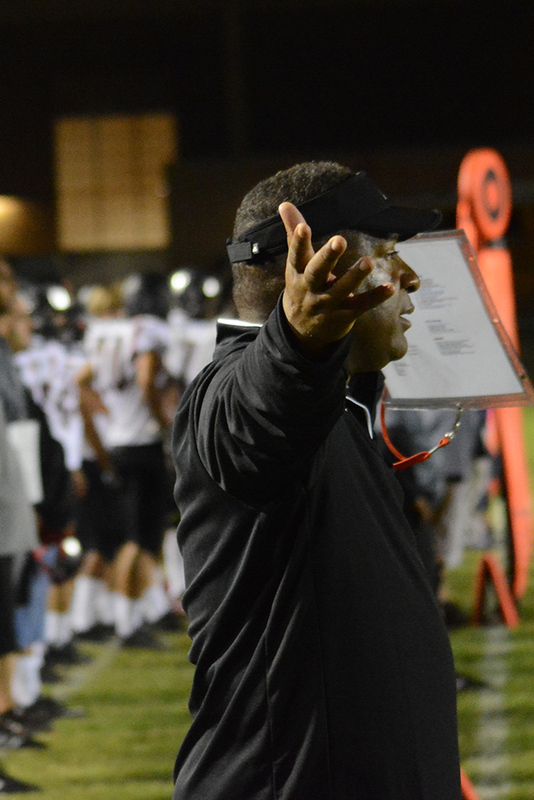 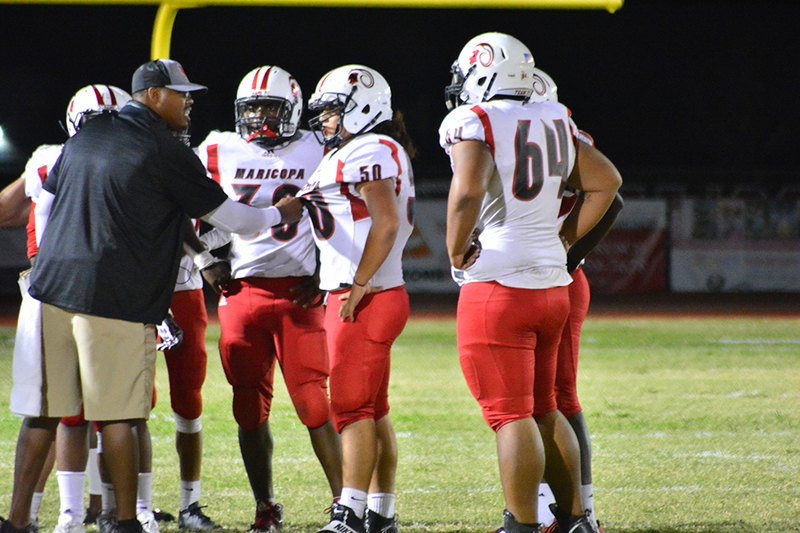 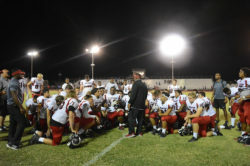 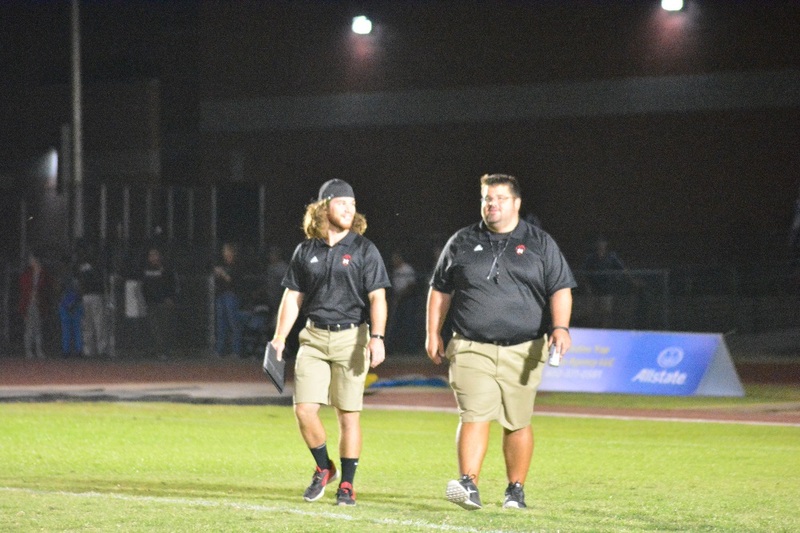 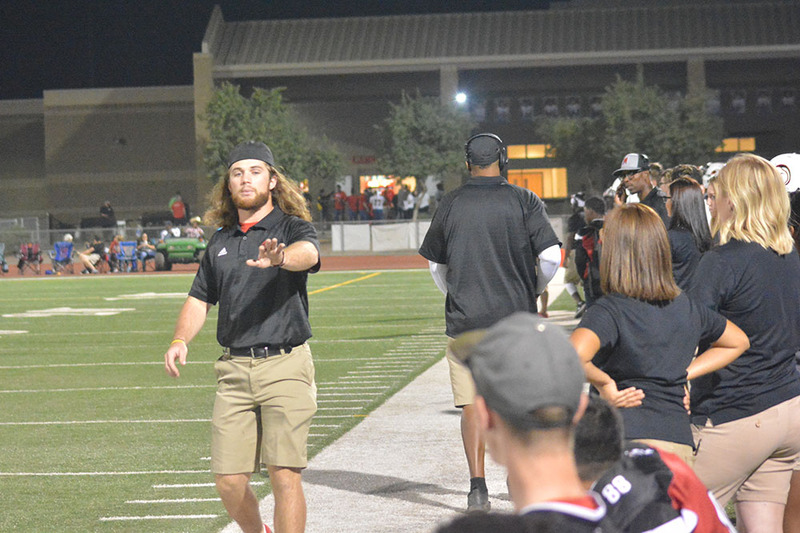 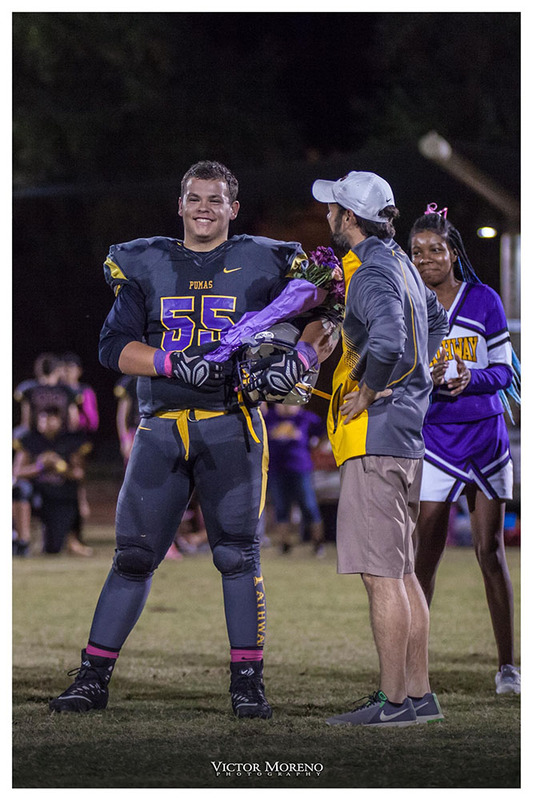 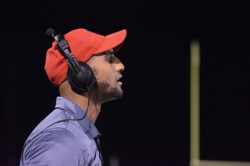 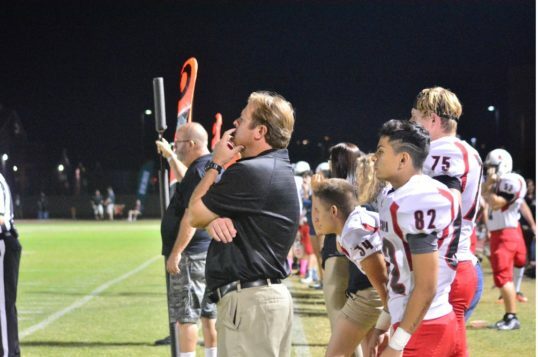 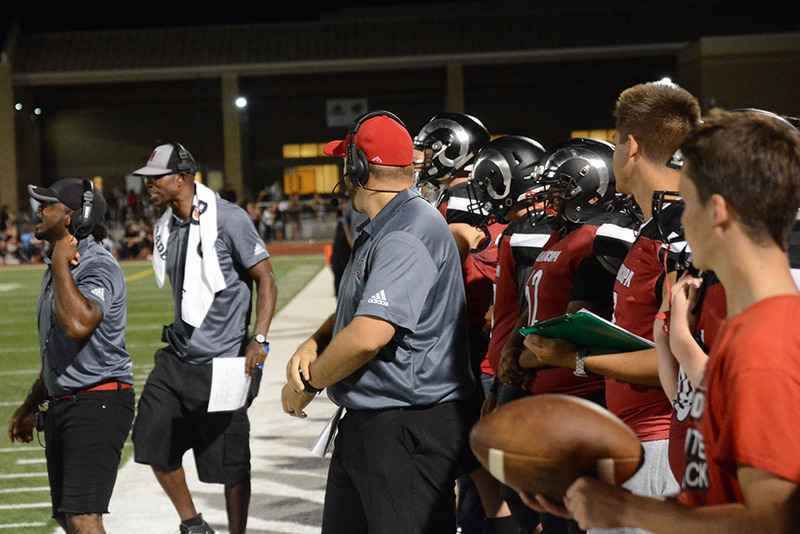 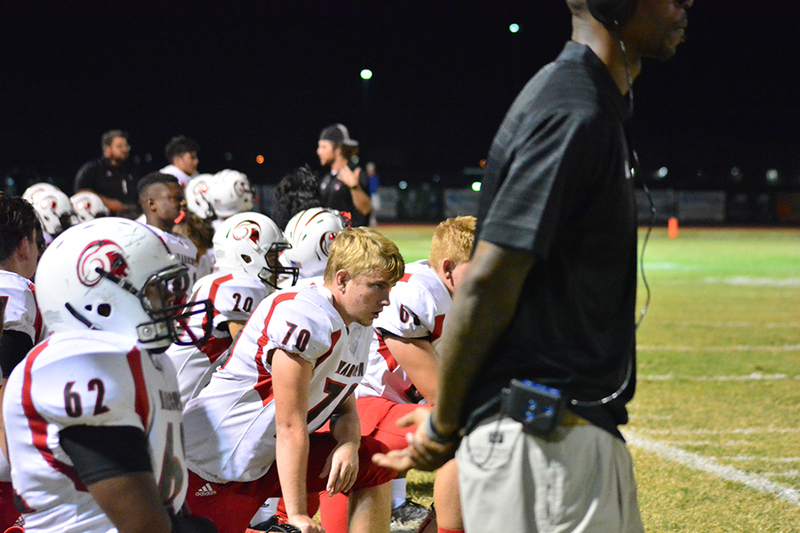 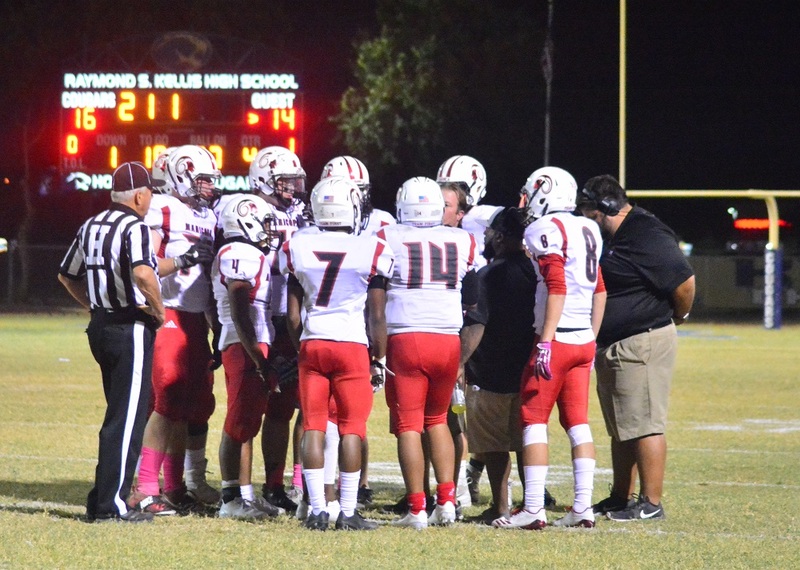 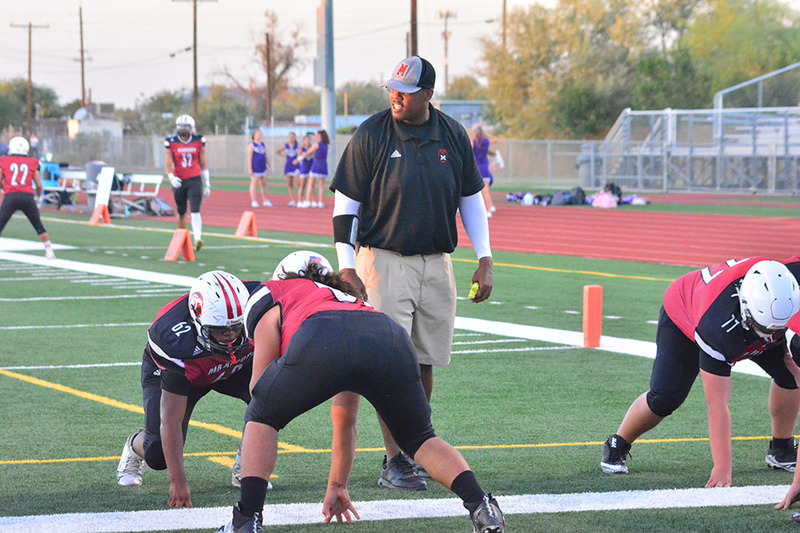 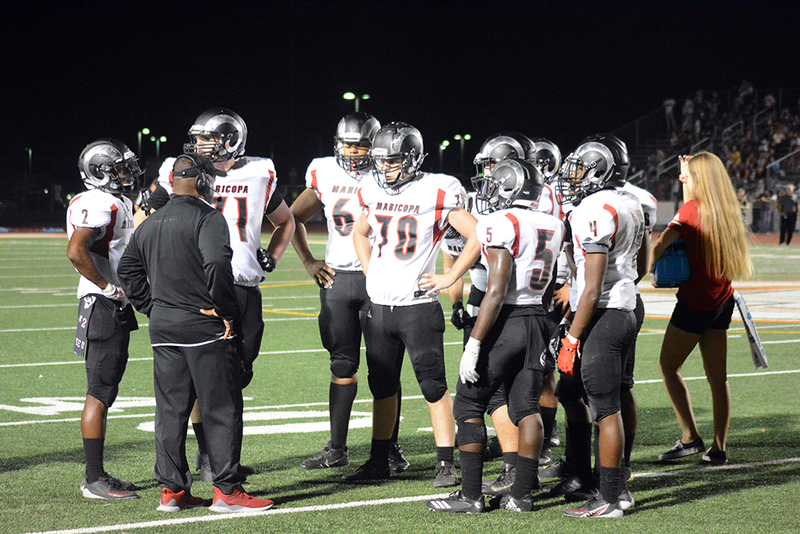 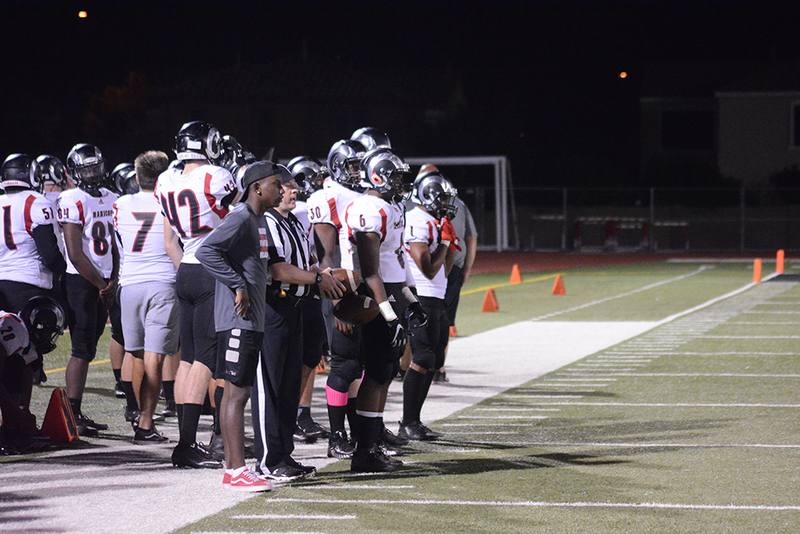 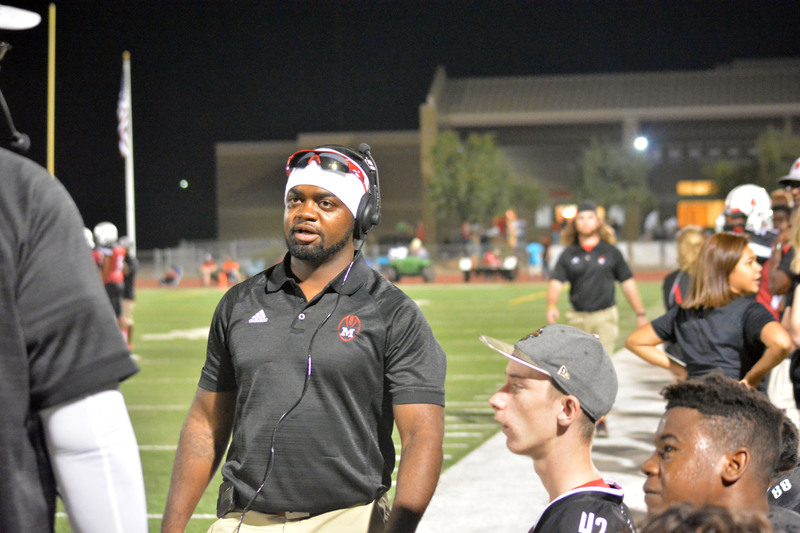 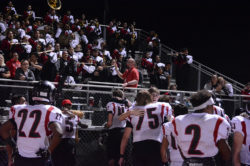 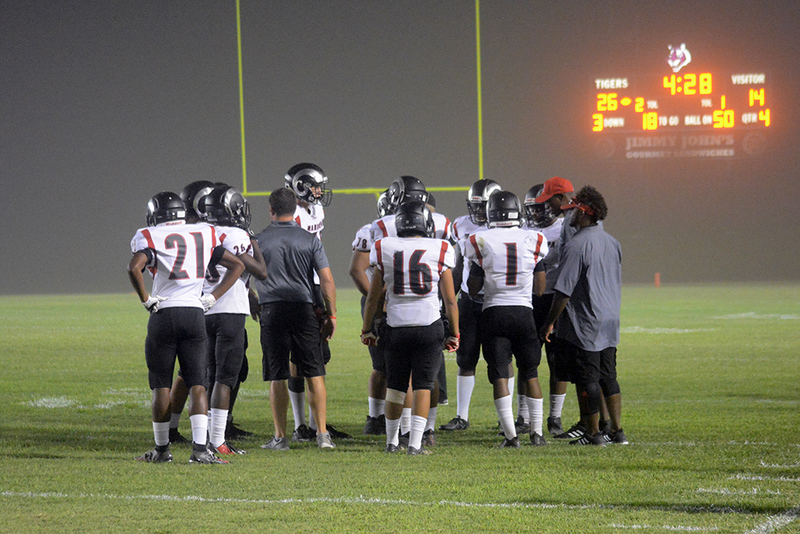 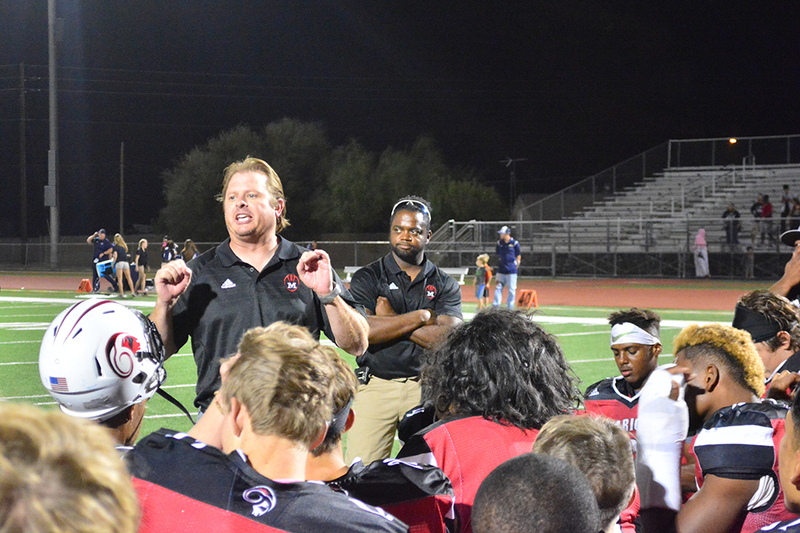 Maricopa High School named its new head football coach this week, pending board approval. 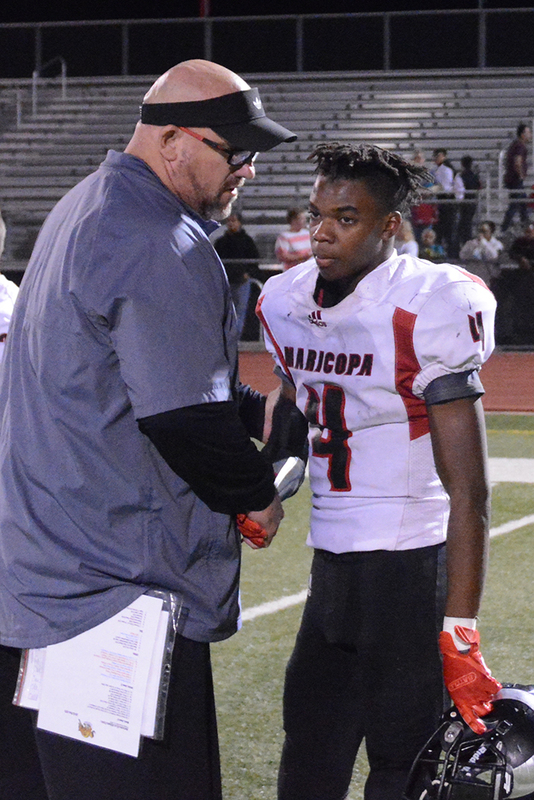 District Athletic Director Brian Winter confirmed Brandon Harris, 47, will lead the varsity team in the upcoming school year. 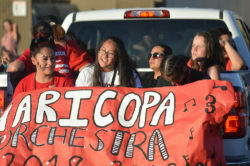 The Maricopa Unified School District Governing Board will officially vote to approve the new hire March 28. 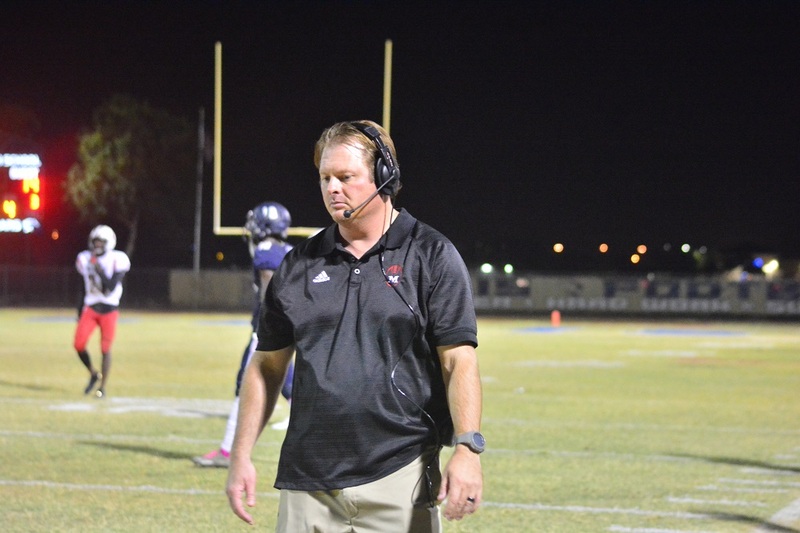 Harris replaces Chris McDonald, who was recently hired as Basha head football coach. 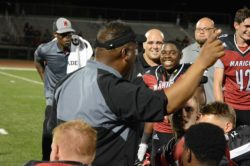 Harris’ resume includes high school head coaching positions in Arizona, New York and most recently, Florida’s University School of Southeastern University. He’s held administration and assistant coaching positions at Seton Catholic Preparatory in Chandler, was passing game coordinator at Brophy College Preparatory in Phoenix and offensive coordinator at Desert Vista High School, among others. Harris played for University of Idaho and later professionally with the Sacramento Surge in the World League of American Football. 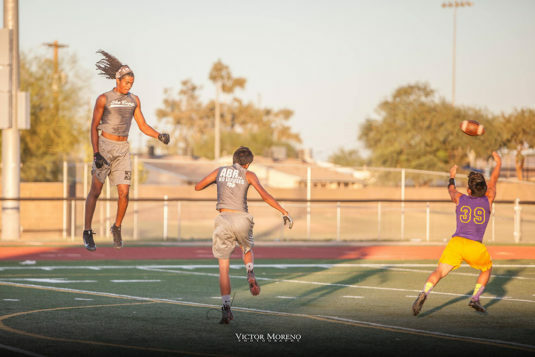 Harris has co-owned RedLine Athletics training facility in Chandler since 2015. An Arcadia resident and Southern California native, Harris is no stranger to Maricopa. 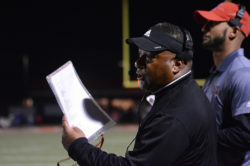 He owned a home in The Villages in 2007 before he relocated to Buffalo, New York, for a head coaching position at Canisius High School, which won a state championship in 2009. He now plans to move back to Maricopa. 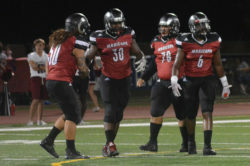 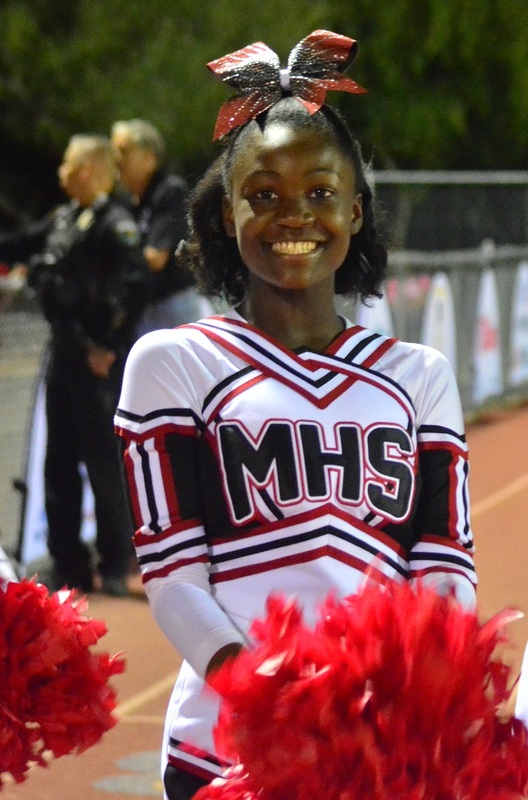 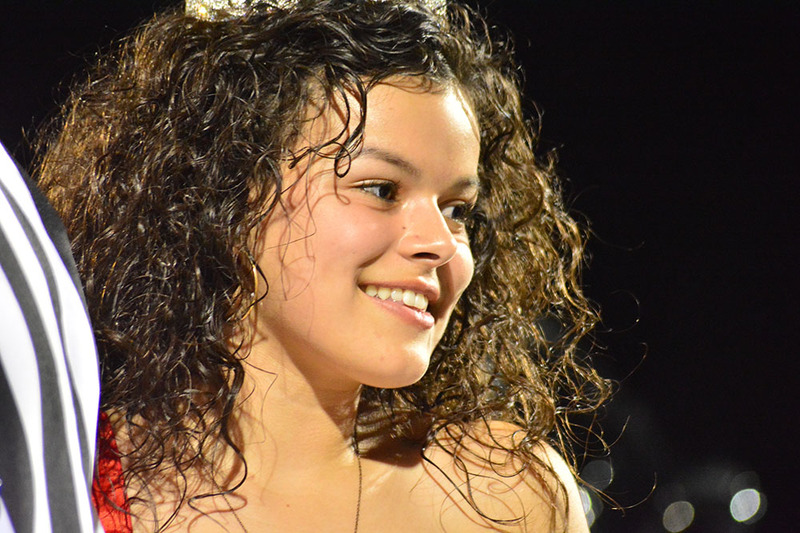 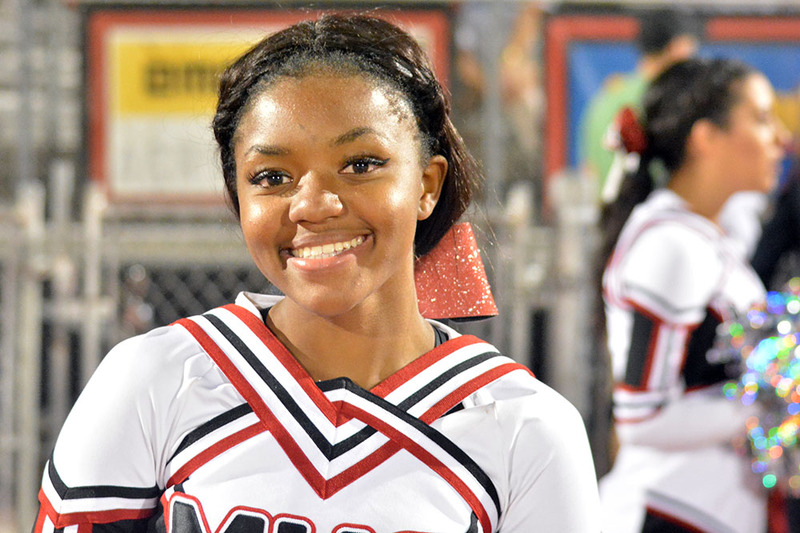 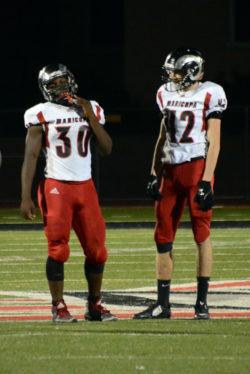 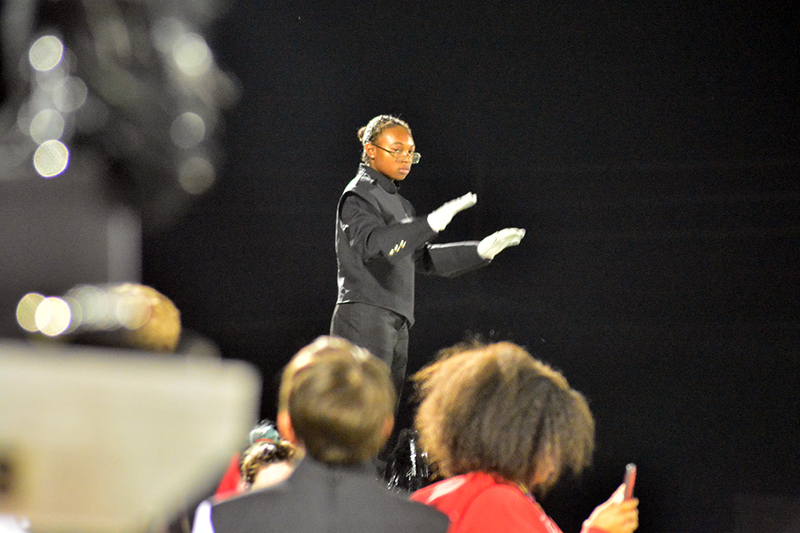 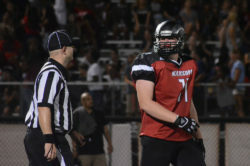 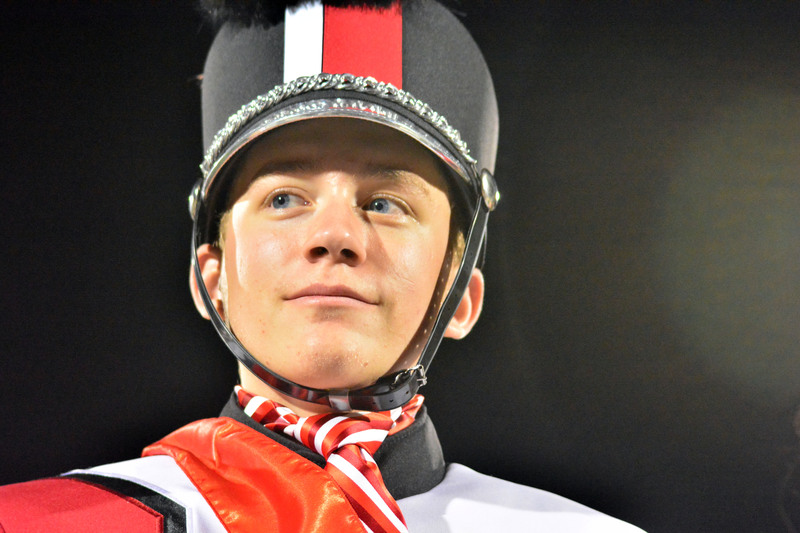 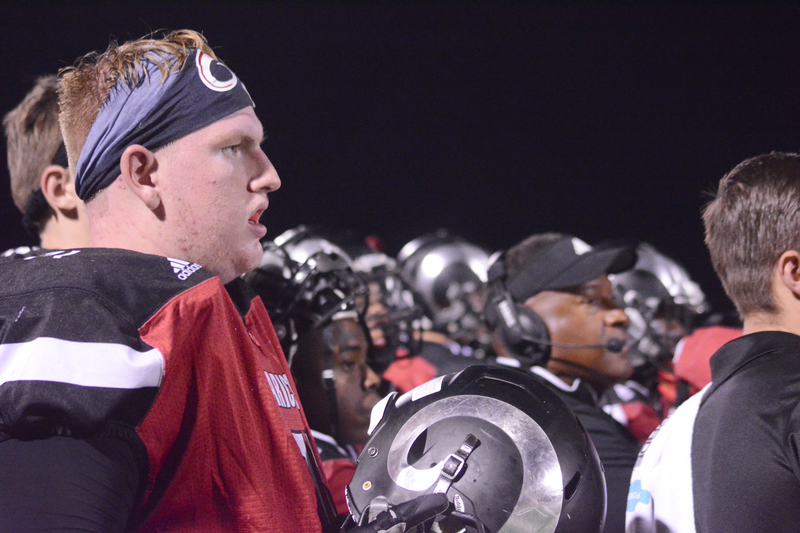 “(MHS) just needs someone that really wants to be there, and I want to be there,” Harris said. 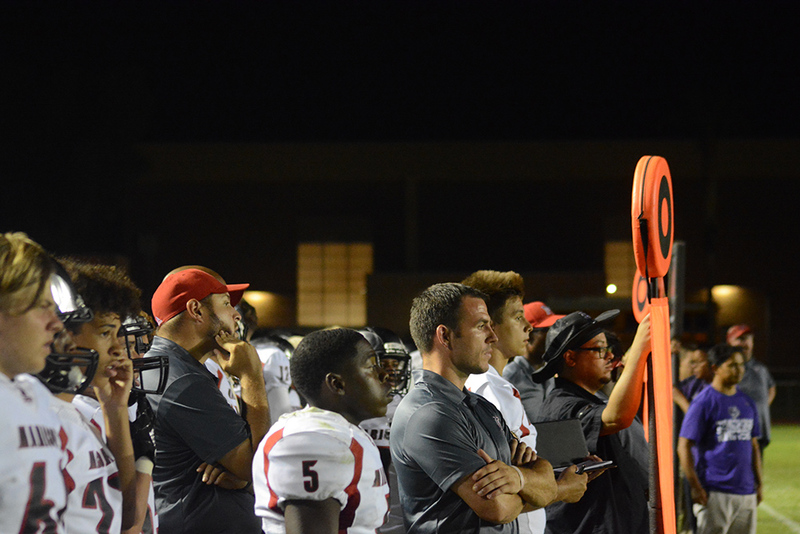 The new head coach began watching tape and evaluating his new players recently. Harris said he wants to work with the existing culture at MHS to continue creating excitement on Friday nights. 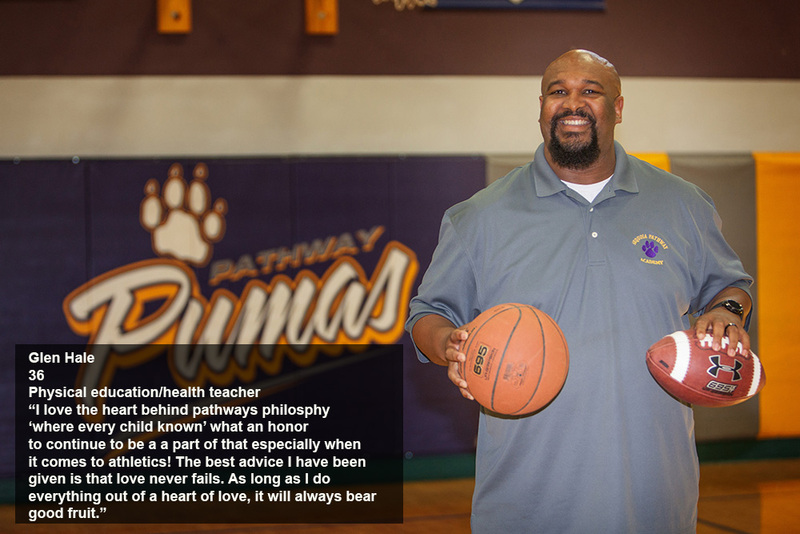 Most importantly, he said, is his goal of encouraging the personal growth of his players. 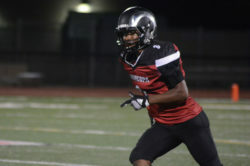 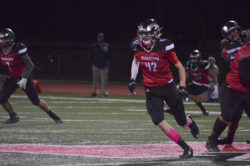 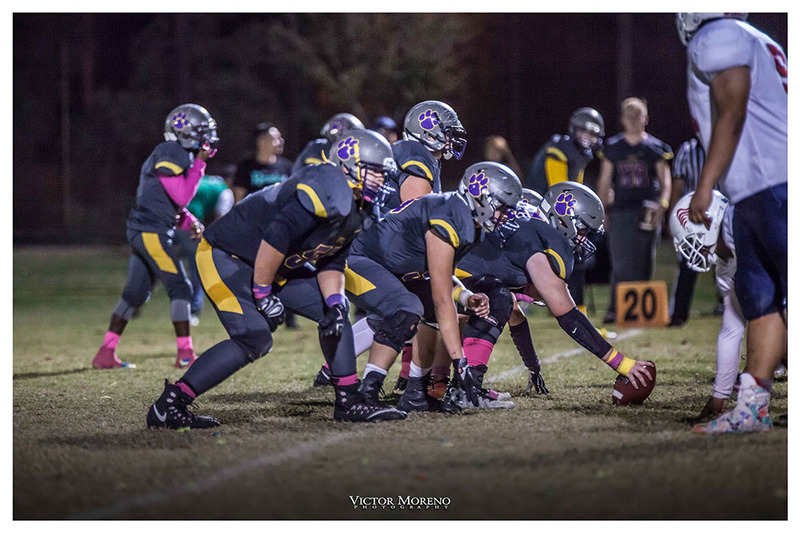 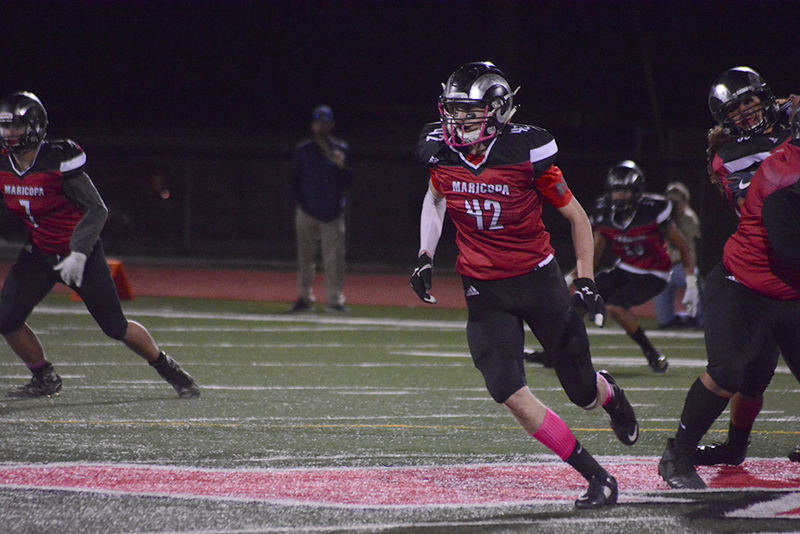 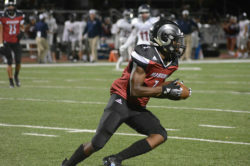 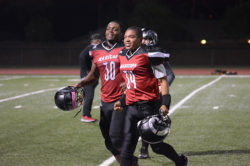 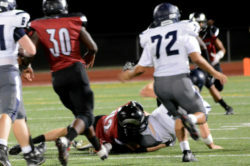 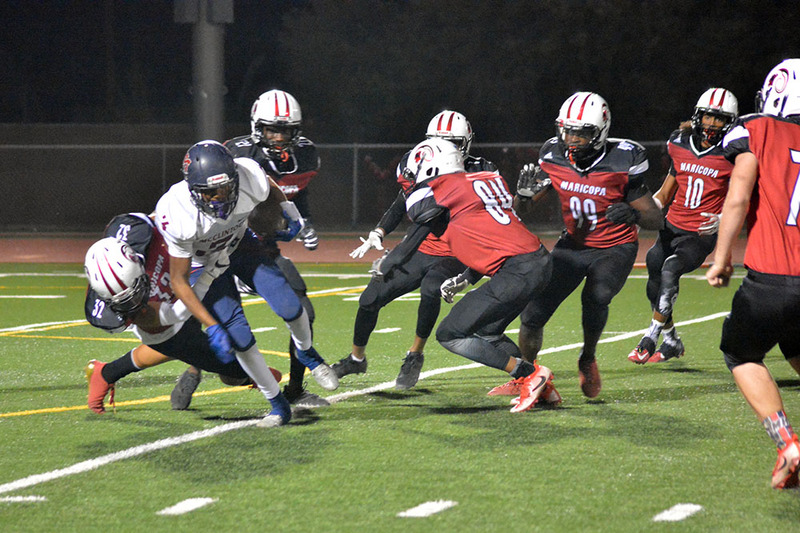 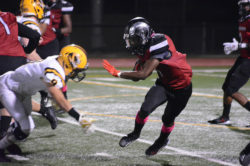 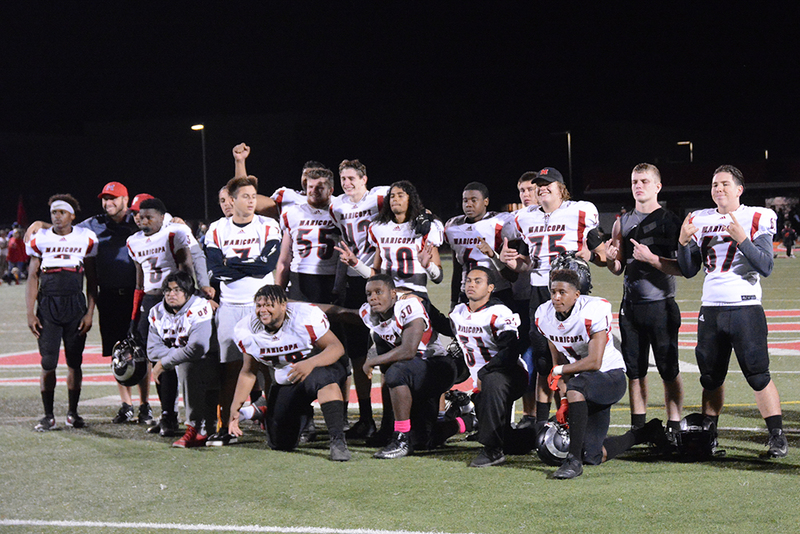 Sequoia Pathway Academy’s varsity football team moved to 4-3 on the season with a victory in its final home game Friday. 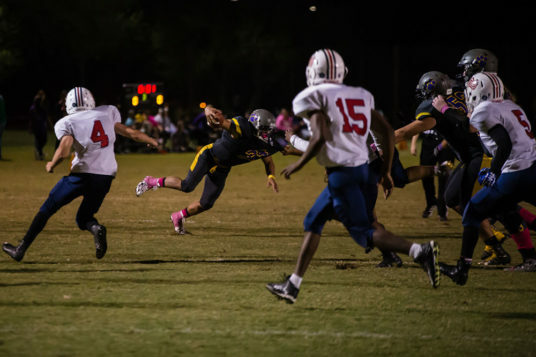 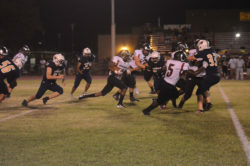 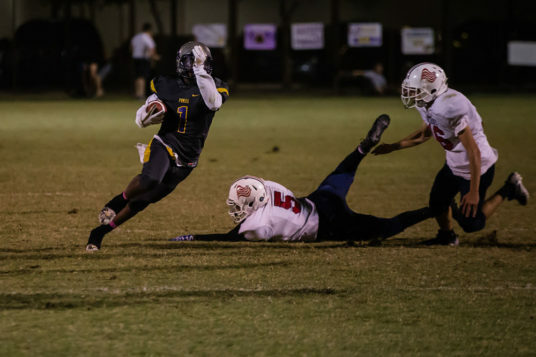 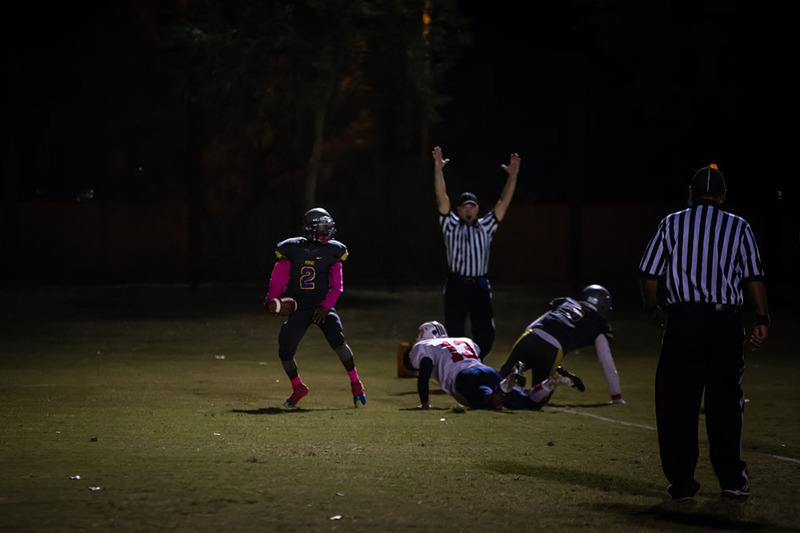 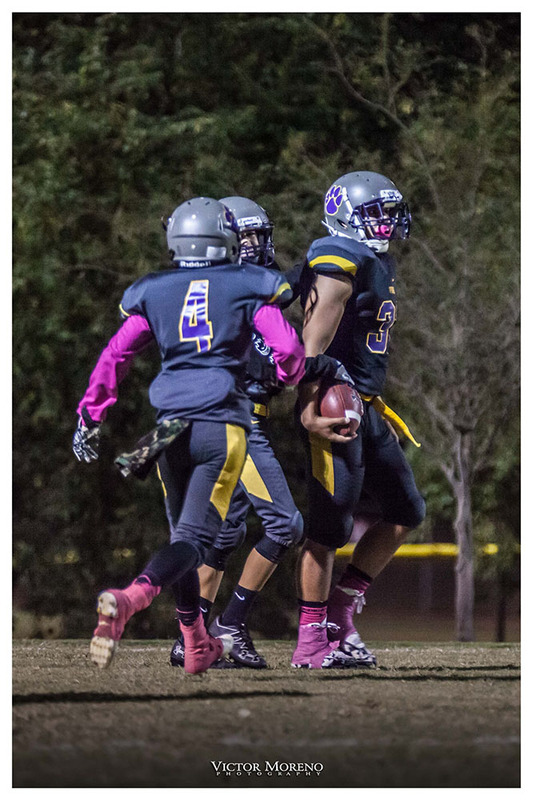 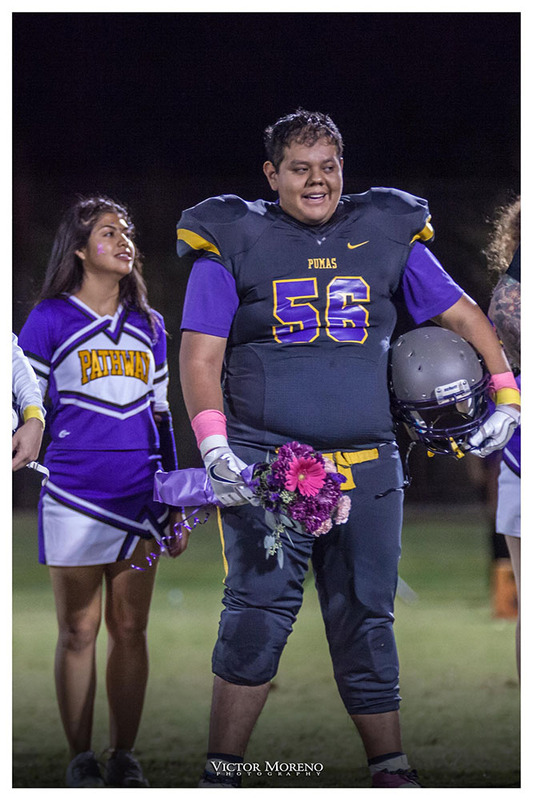 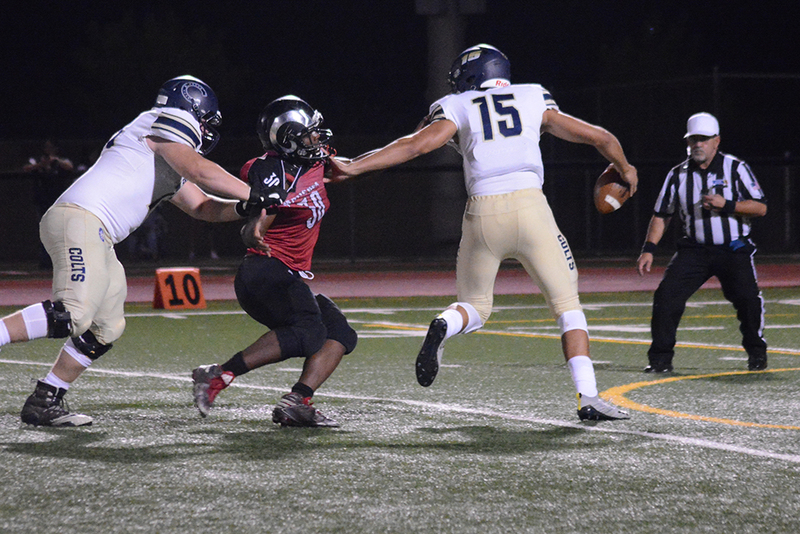 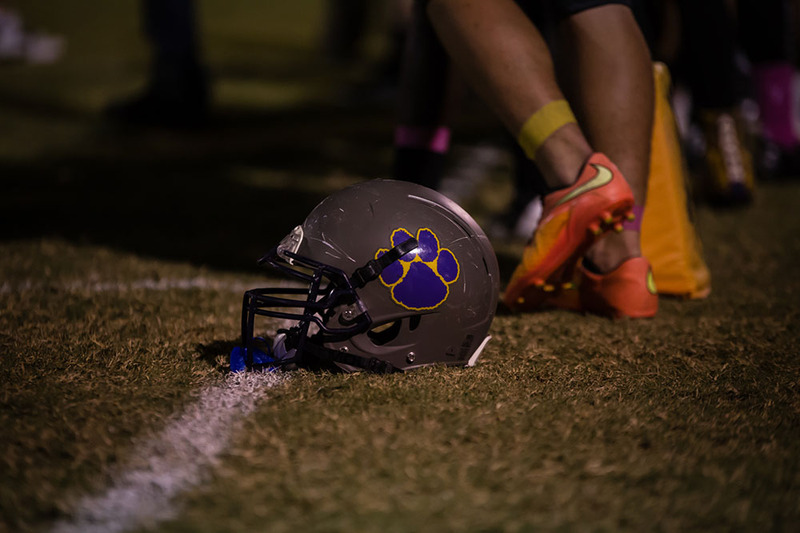 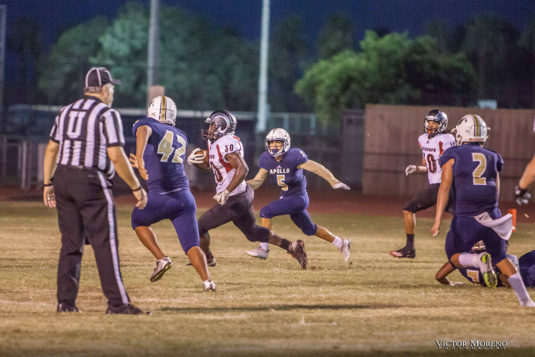 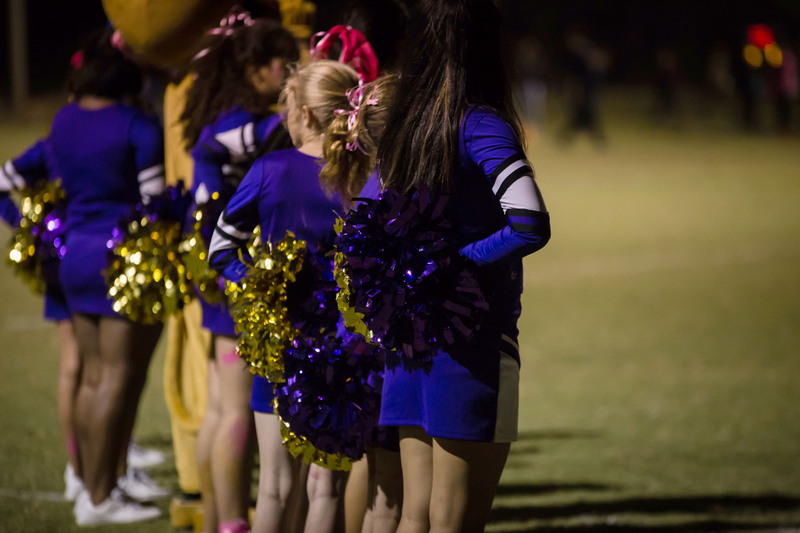 The Pumas defeated Heritage Academy-Laveen, 14-6. 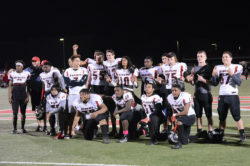 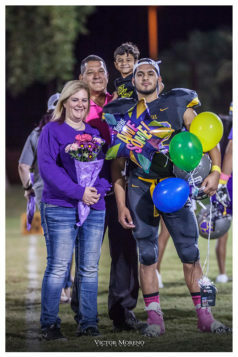 The school also celebrated Senior Night for the young team. 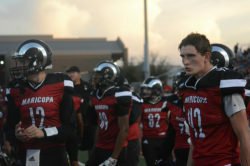 SPA is scheduled to finish its season Oct. 27 against Harvest Prep at Desert Sun Stadium. 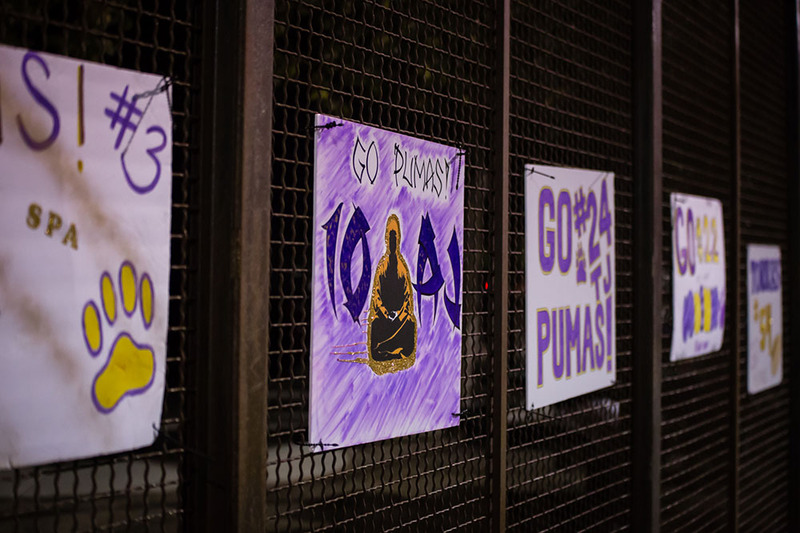 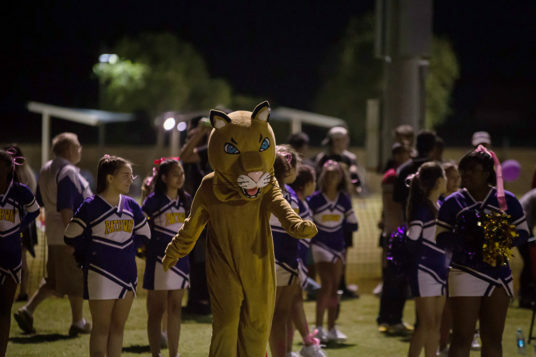 The Pumas are in second place in the Fiesta Conference of the Canyon Athletic Association. 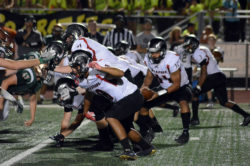 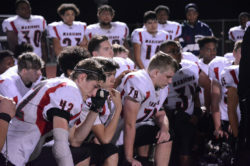 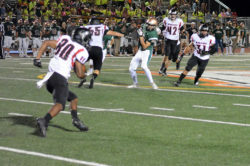 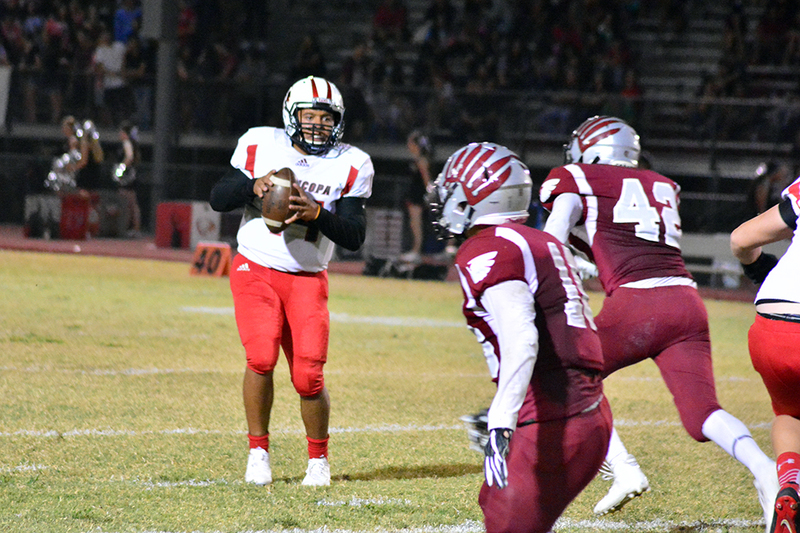 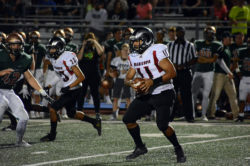 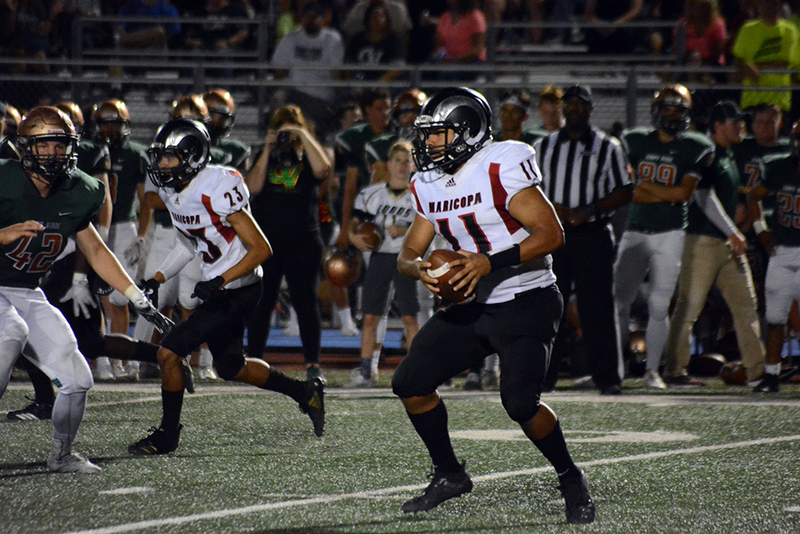 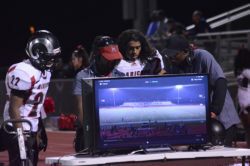 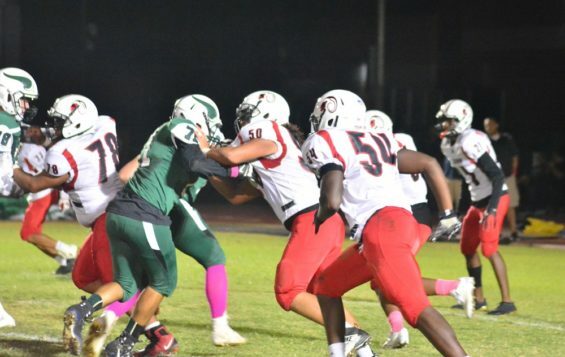 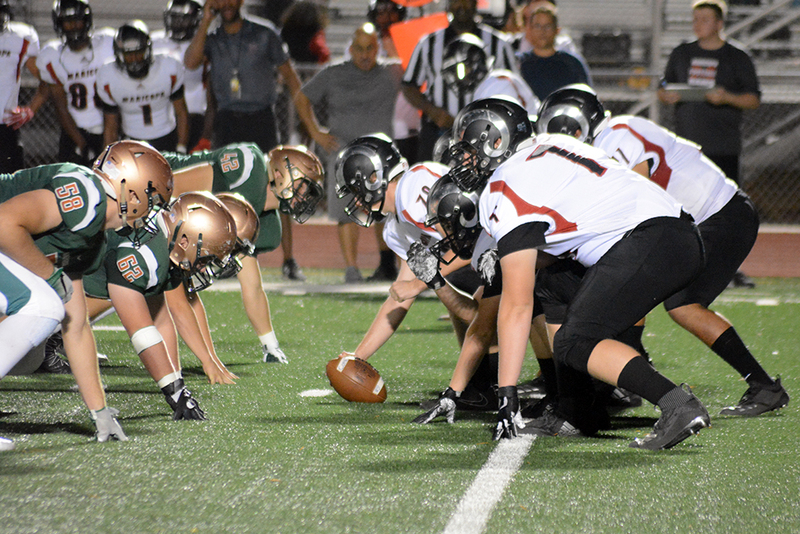 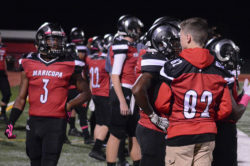 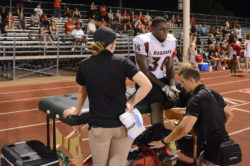 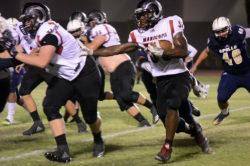 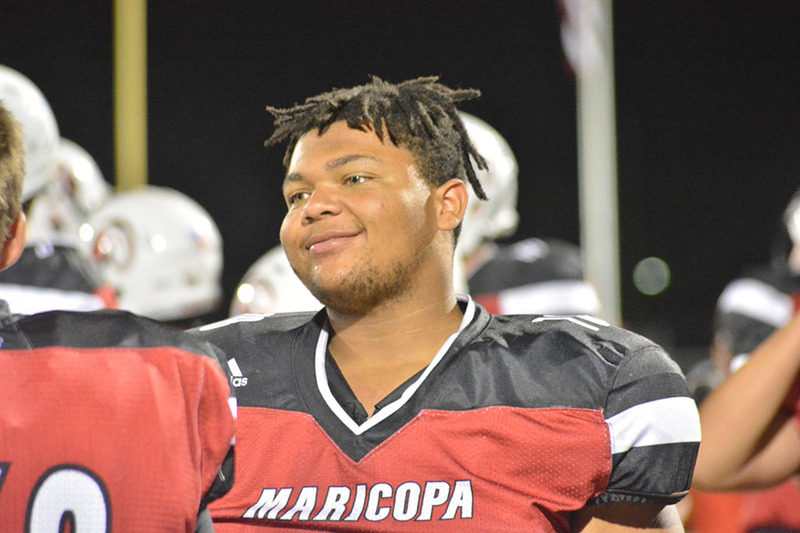 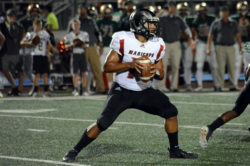 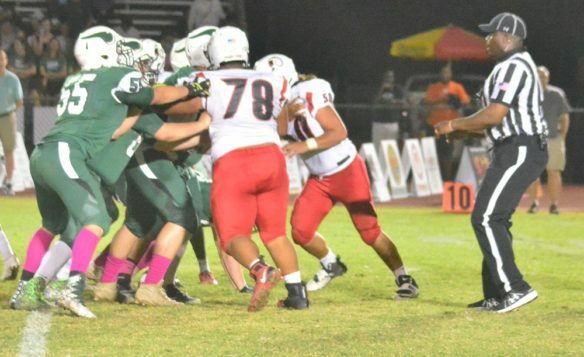 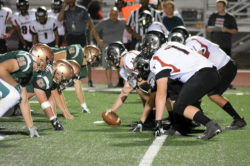 An episodic game that switched from slow-starter to barn-burner to heart-burner, the Maricopa High School football team lost a region game to Sunnyslope on Friday, 33-20. After the Rams had fought to a tied score and seemed destined for overtime, the Vikings scored 13 points in the final 10 seconds. 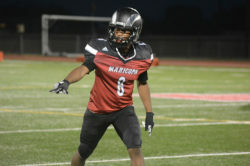 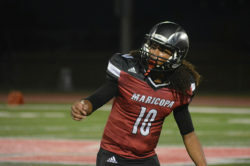 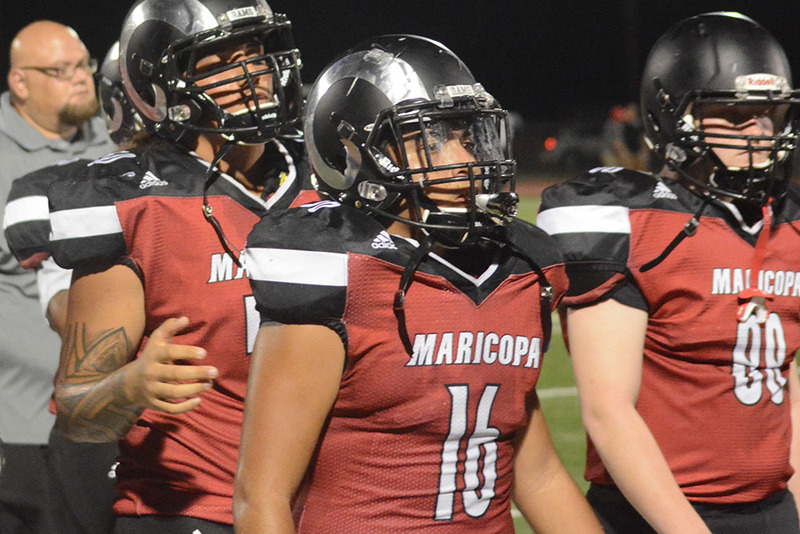 The loss moved Maricopa’s record to 5-3. 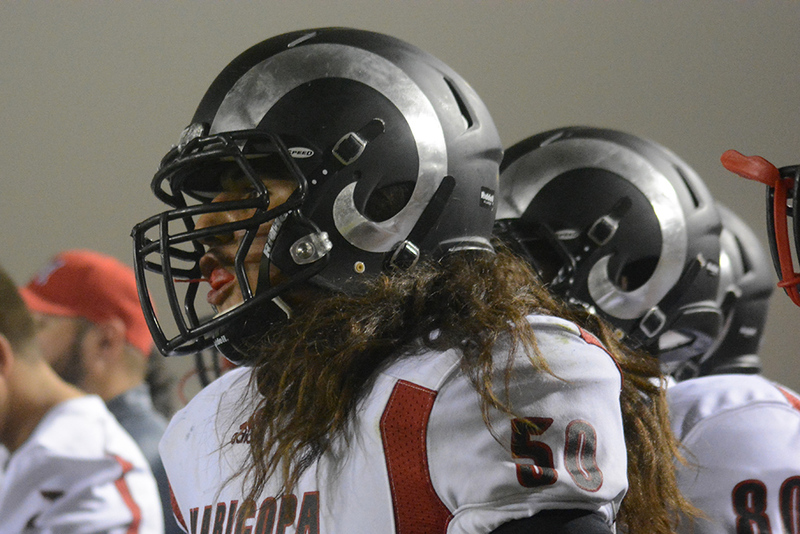 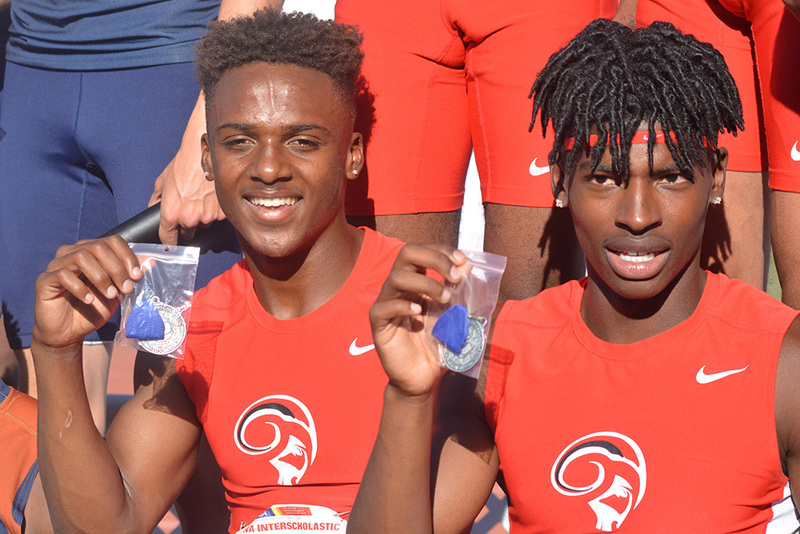 The Rams are 1-2 in the 5A Metro region and in fourth place. 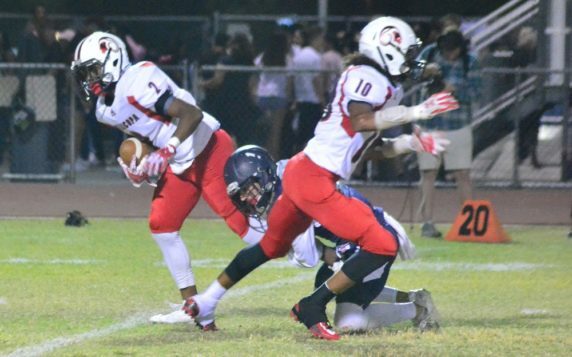 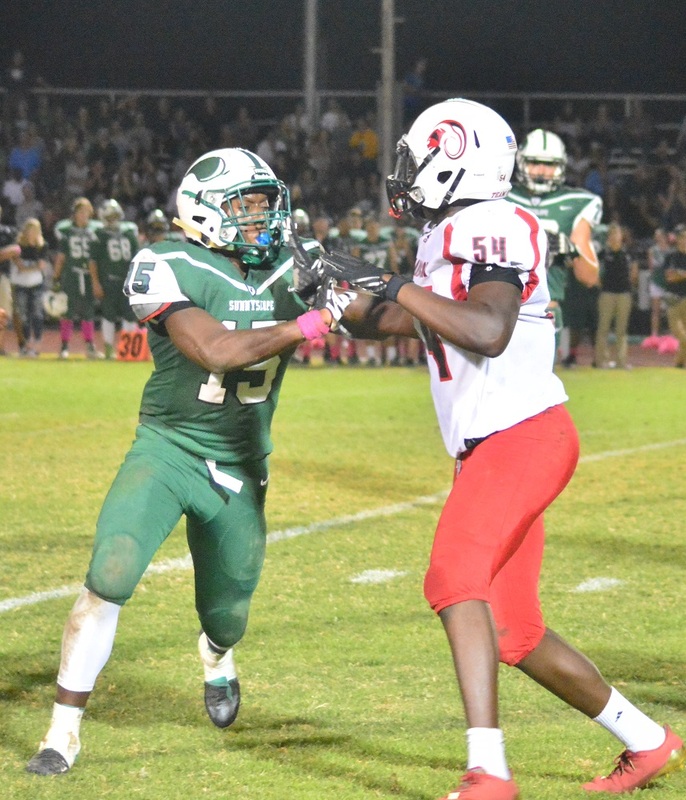 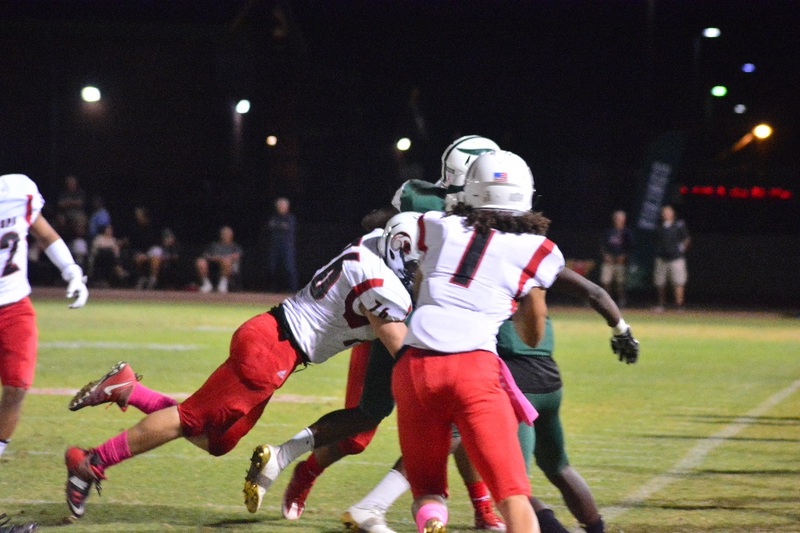 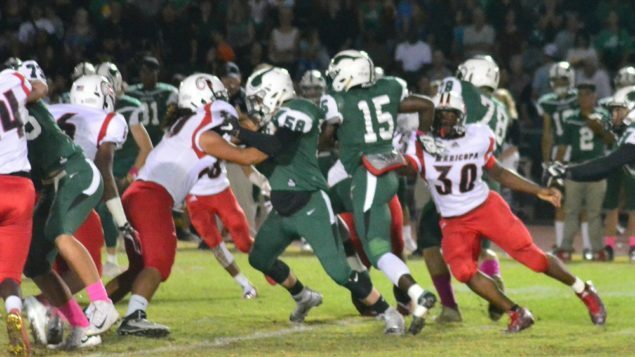 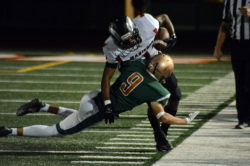 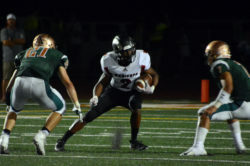 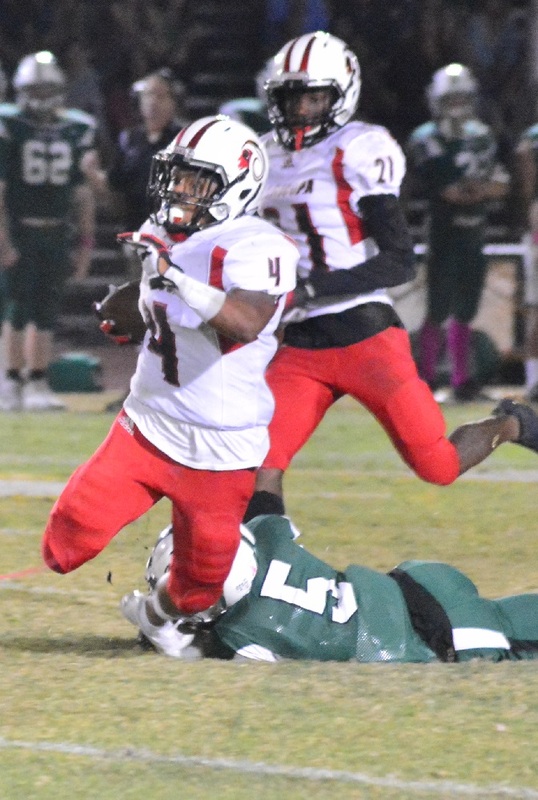 Maricopa had its hands full with Sunnyslope running back Xamoi Penn and wide receiver Tanner Hill. 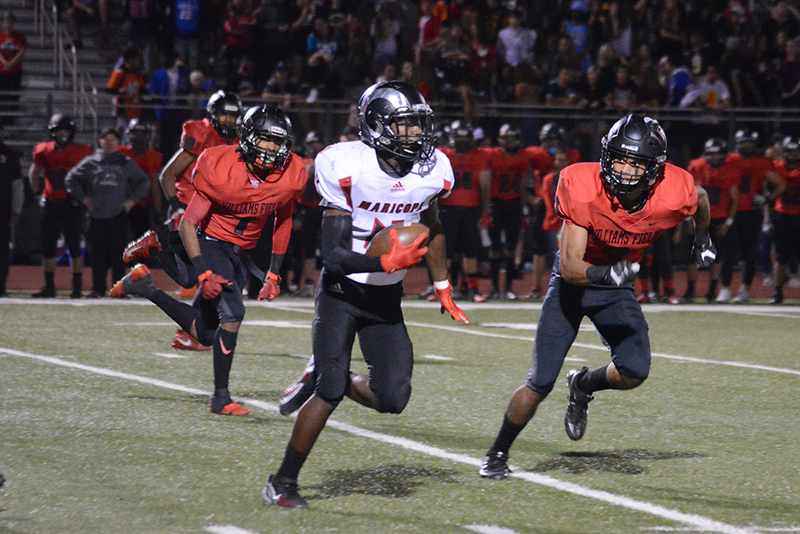 They did not help themselves with a sluggish start. 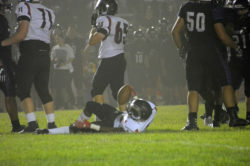 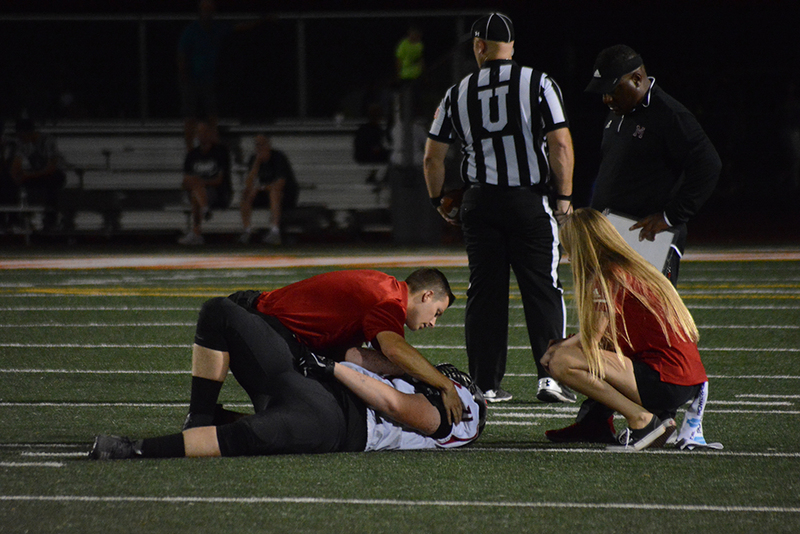 To pile it on, the Rams’ top receiver, Jacob Cowing, nursed an injured hand much of the game. 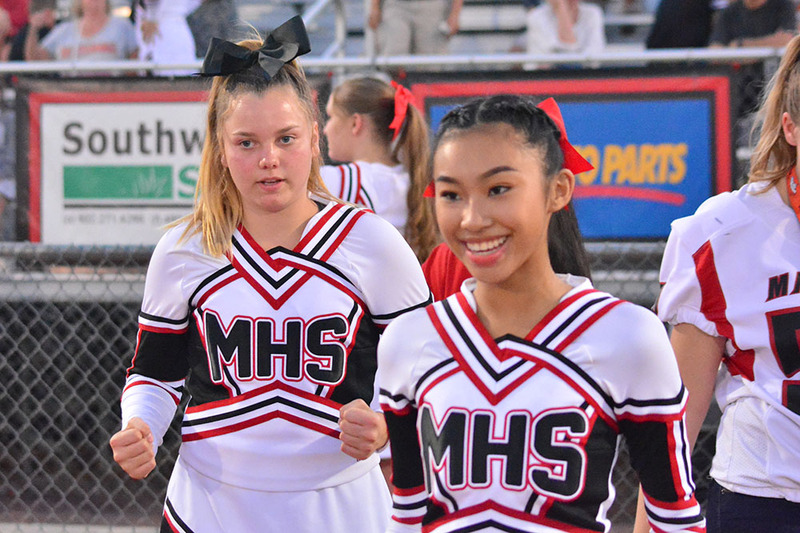 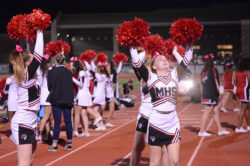 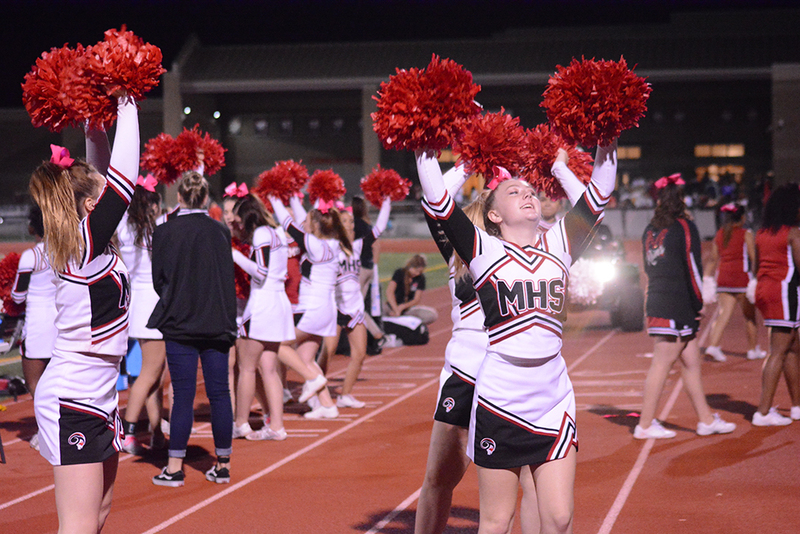 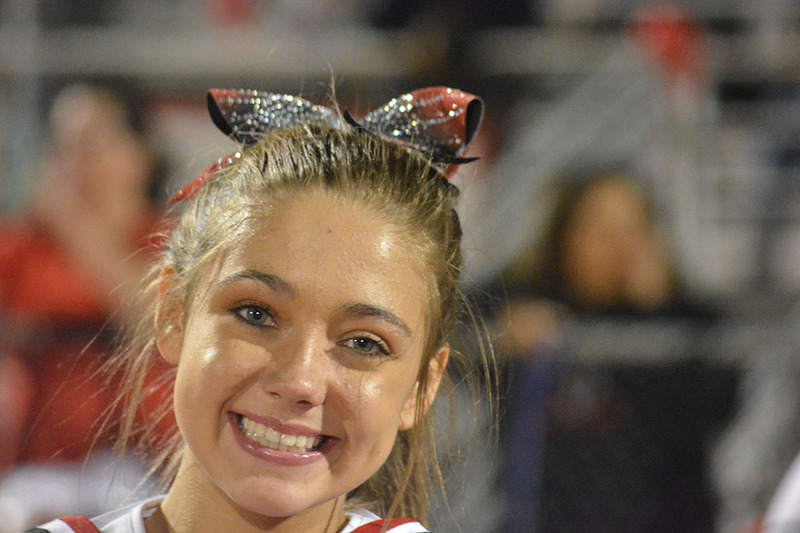 “It took us a little bit to get going,” MHS head coach Chris McDonald said. 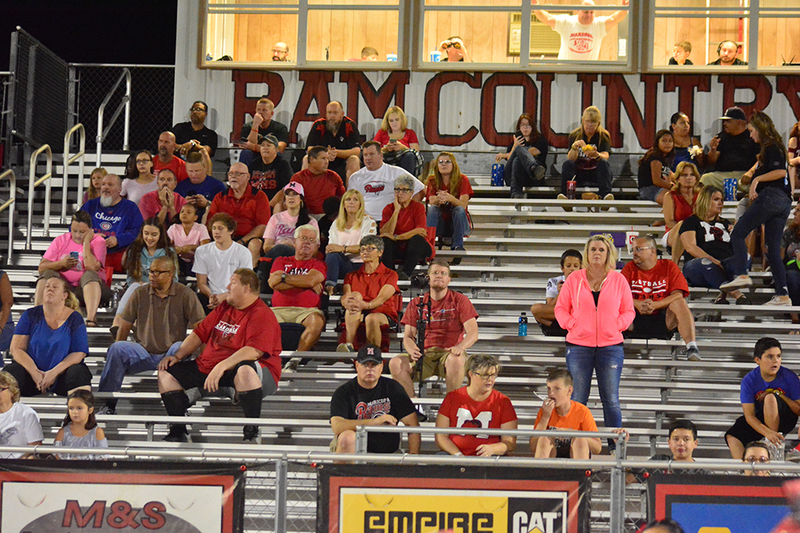 When the Rams did get going in the second quarter, they were already trailing 10-0. 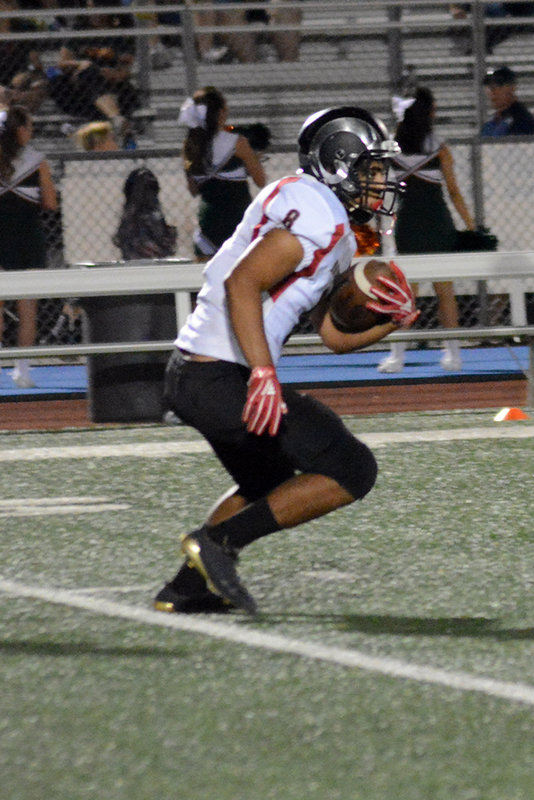 A strong kickoff return to the 31-yard line by senior Longman Pyne started an impressive scoring drive of less than two minutes. 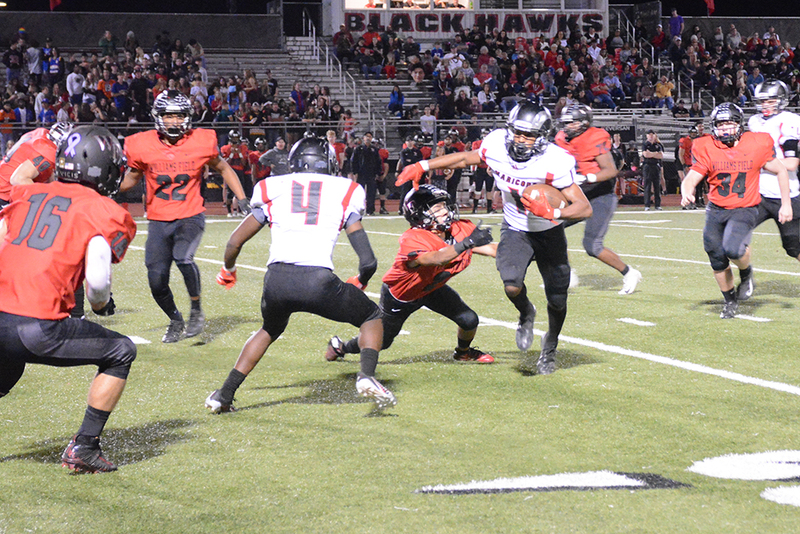 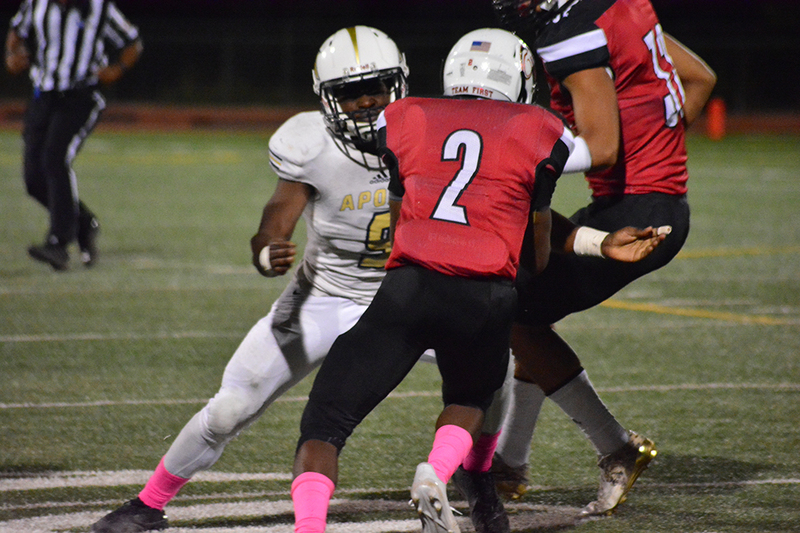 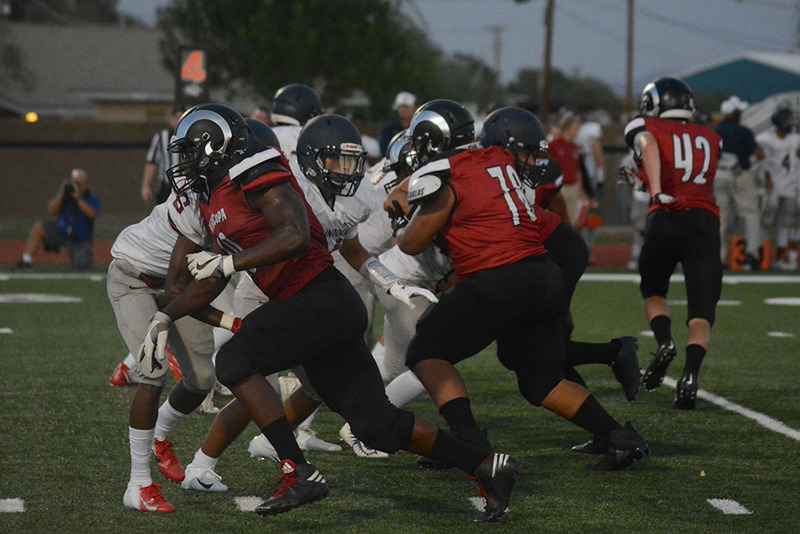 In the middle of it, senior Kemo Akins had a 35-yard run and, at the end of it, Akins grabbed a toss from senior quarterback Alec Smith and ran in from the 7. 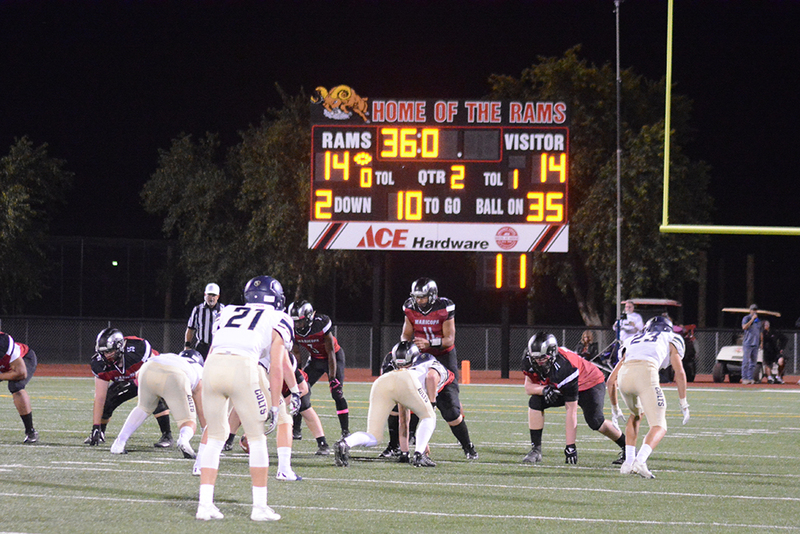 The Ram defense completely stymied the Vikings in their next, brief possession. 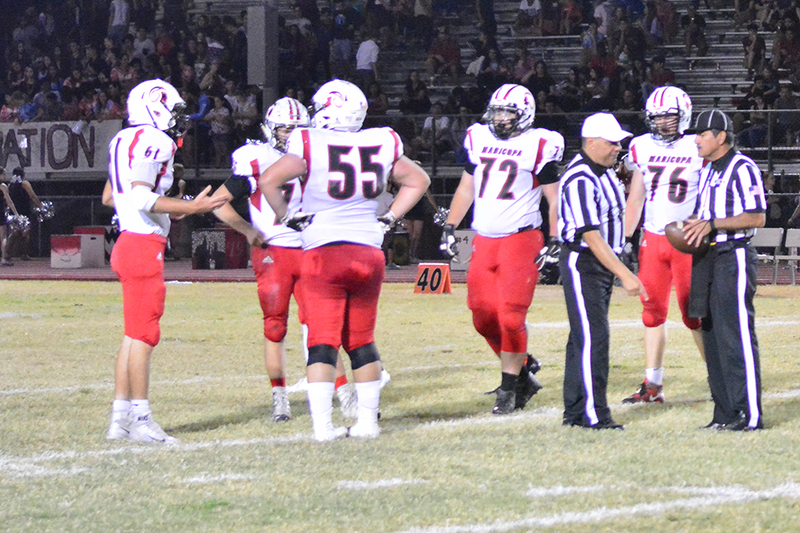 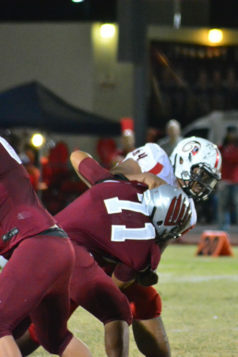 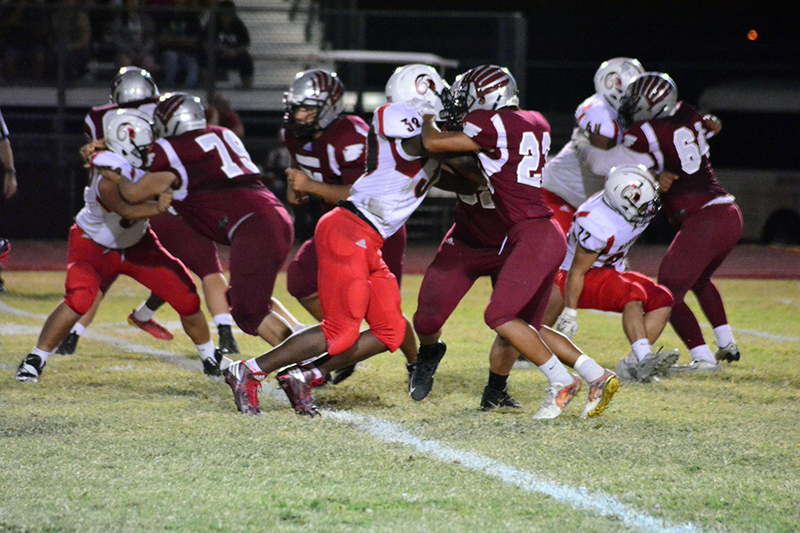 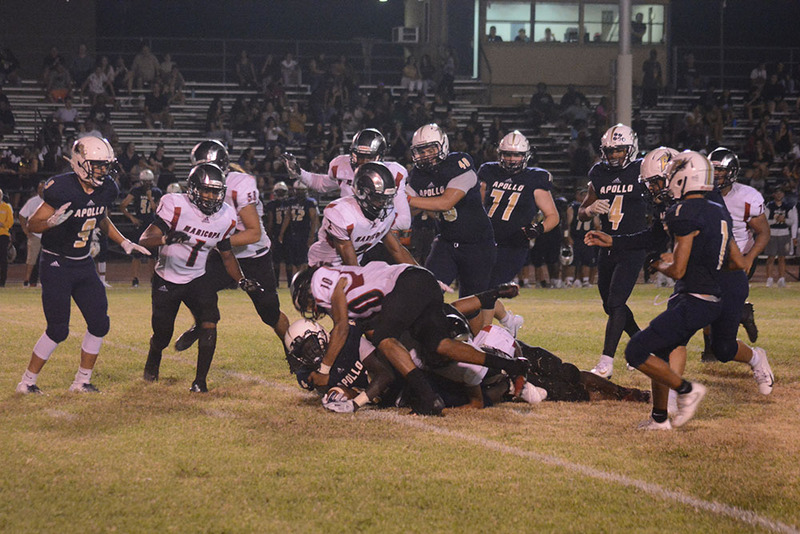 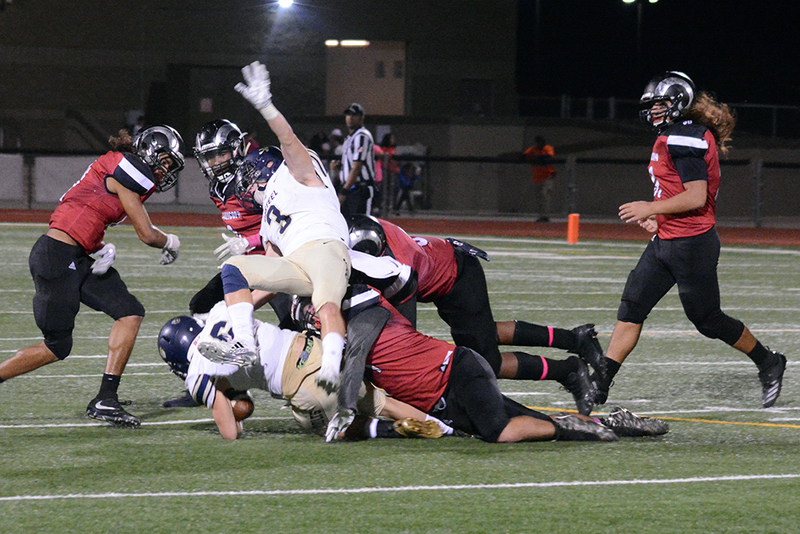 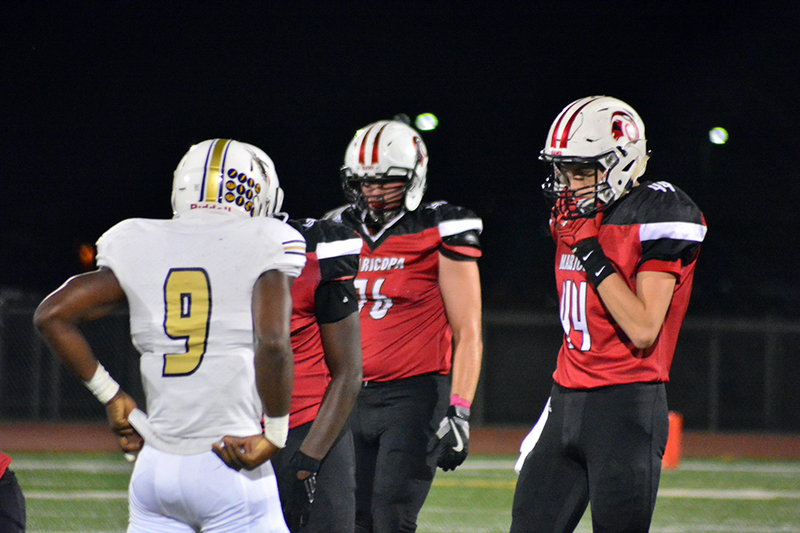 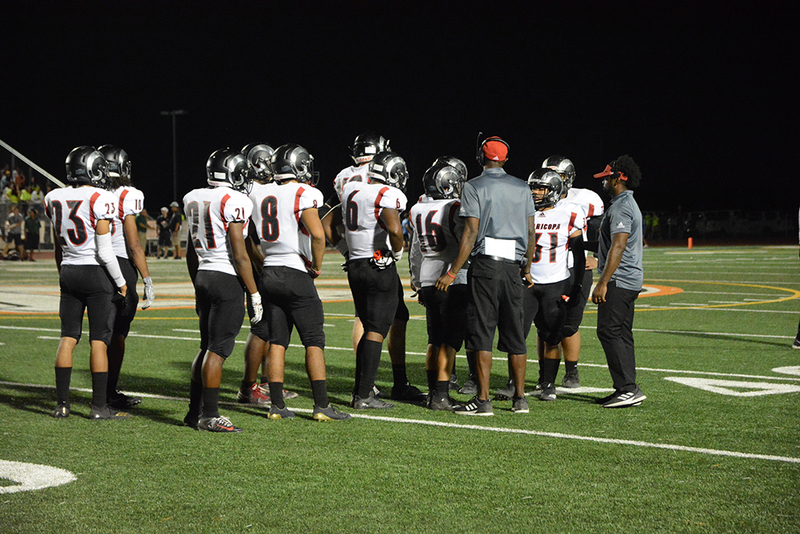 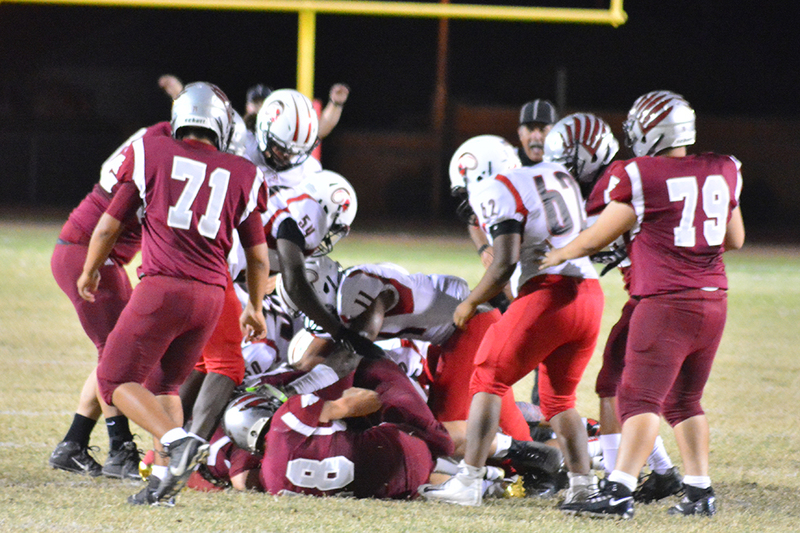 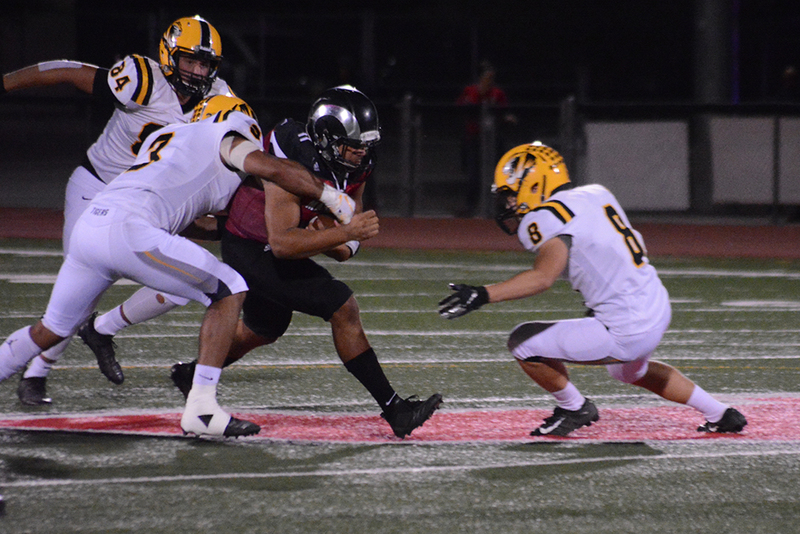 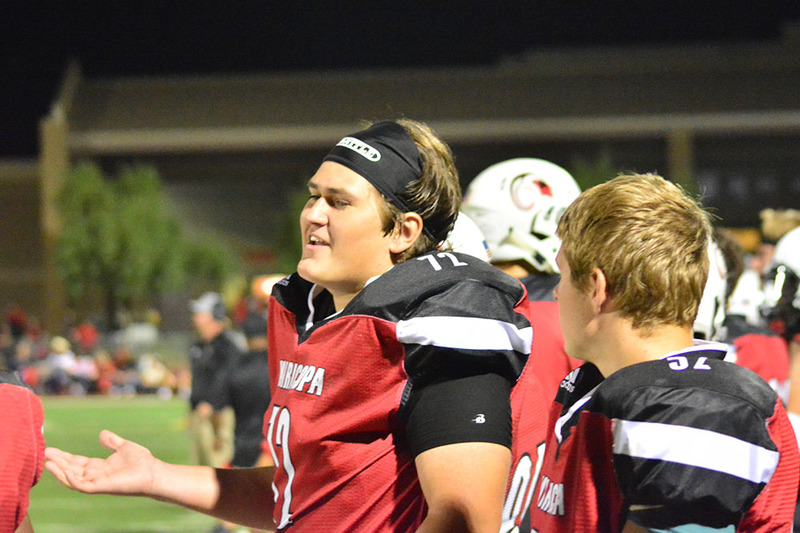 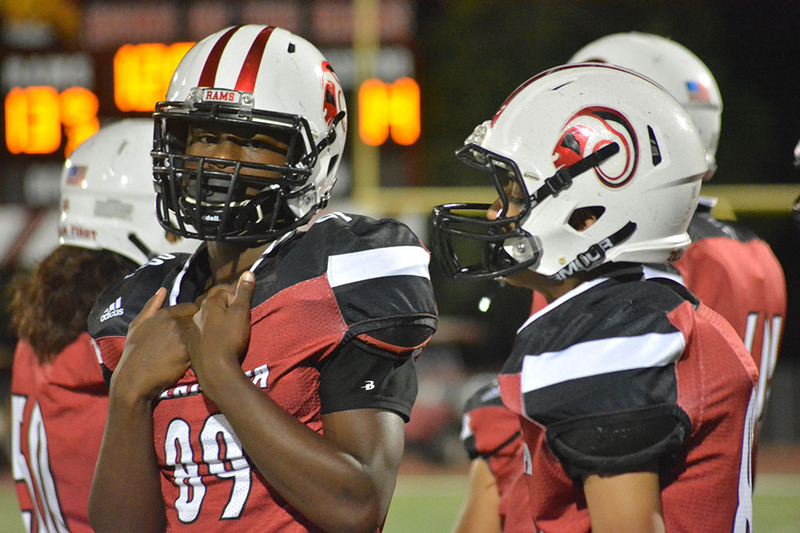 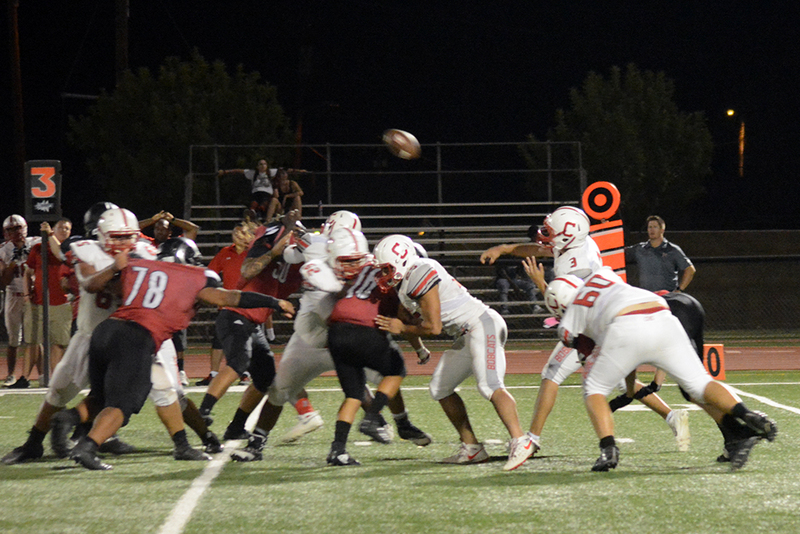 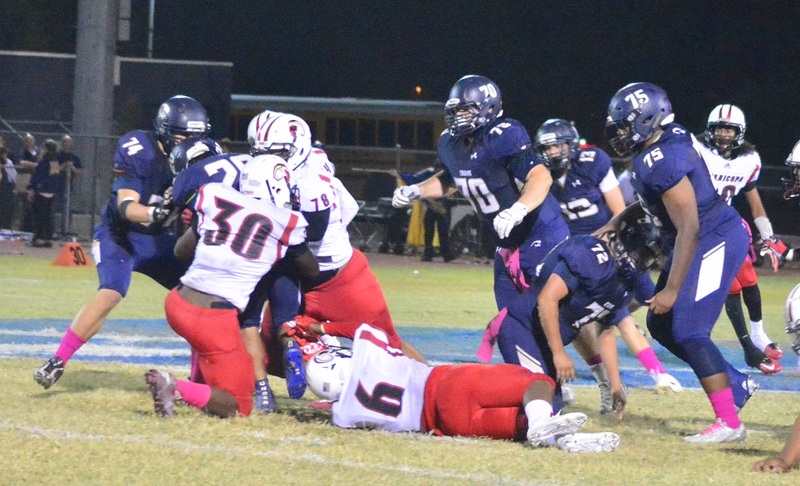 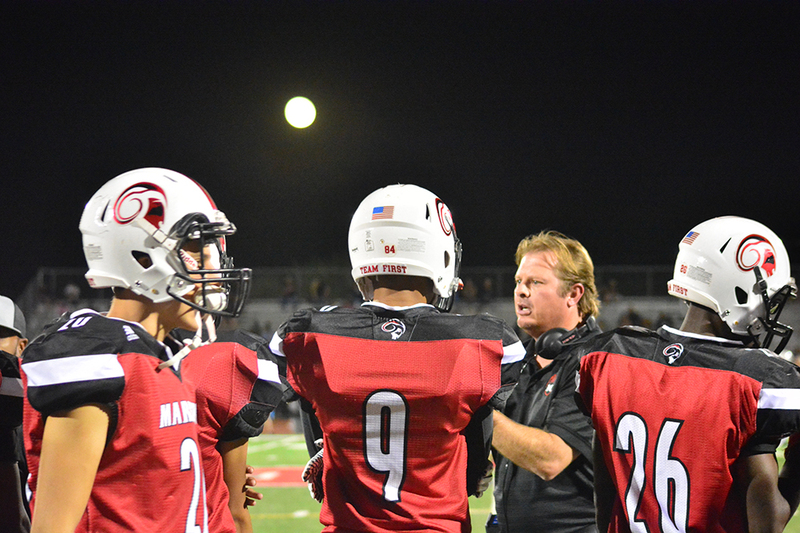 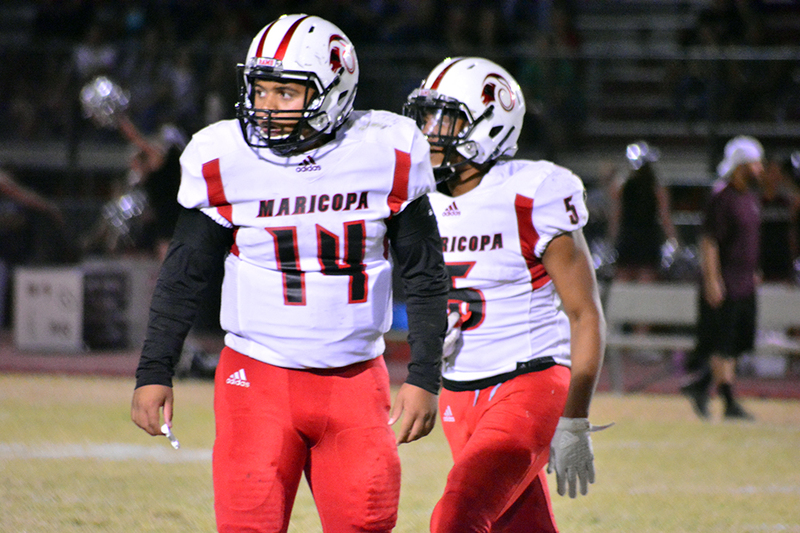 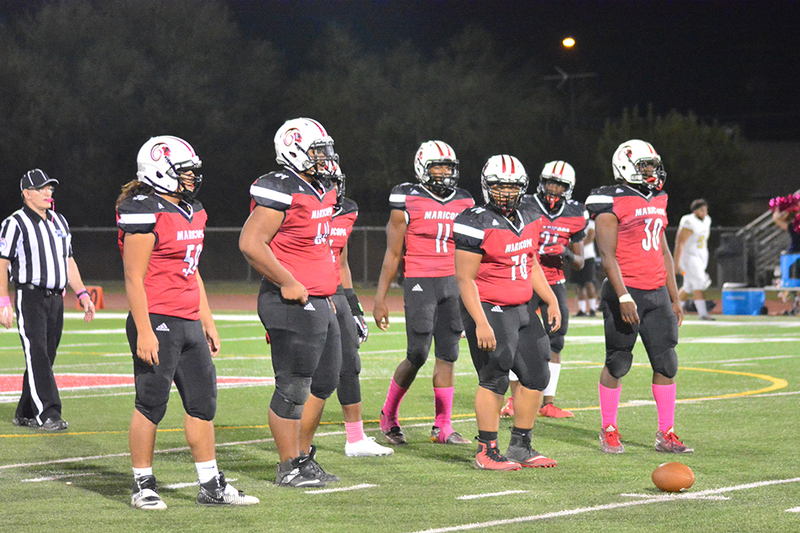 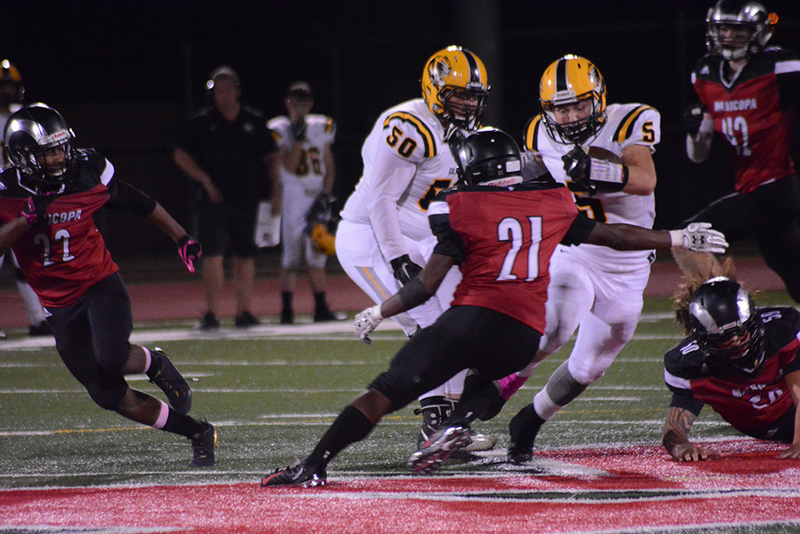 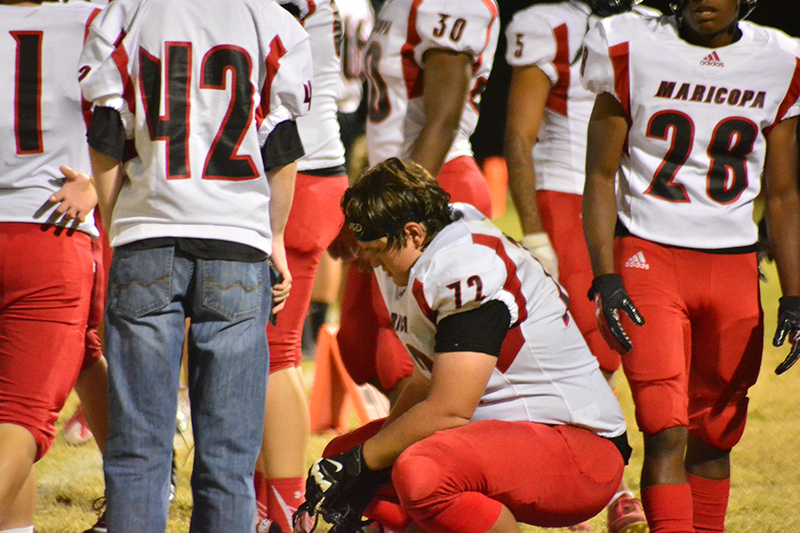 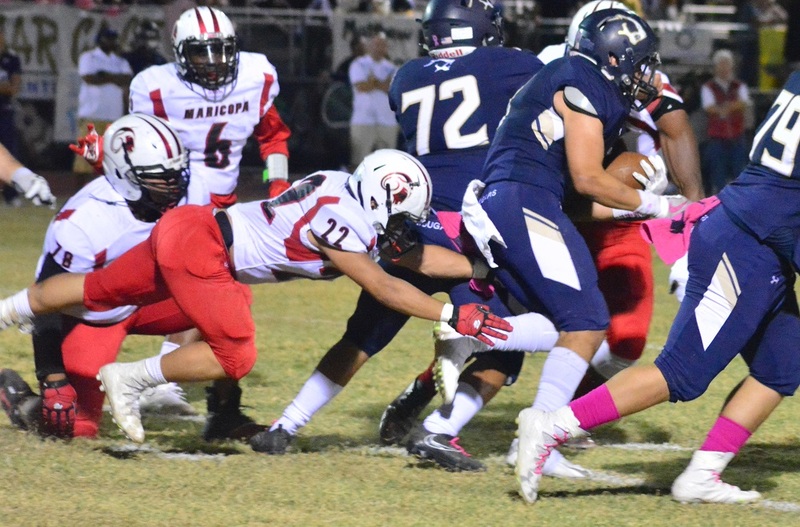 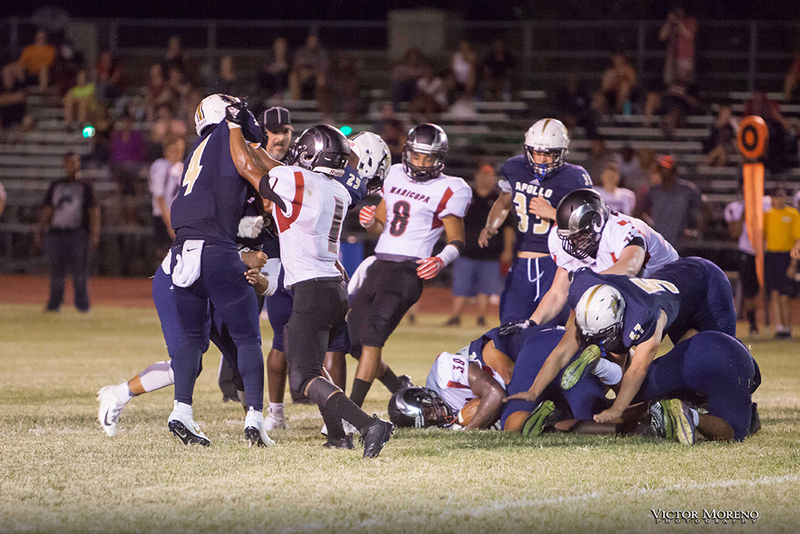 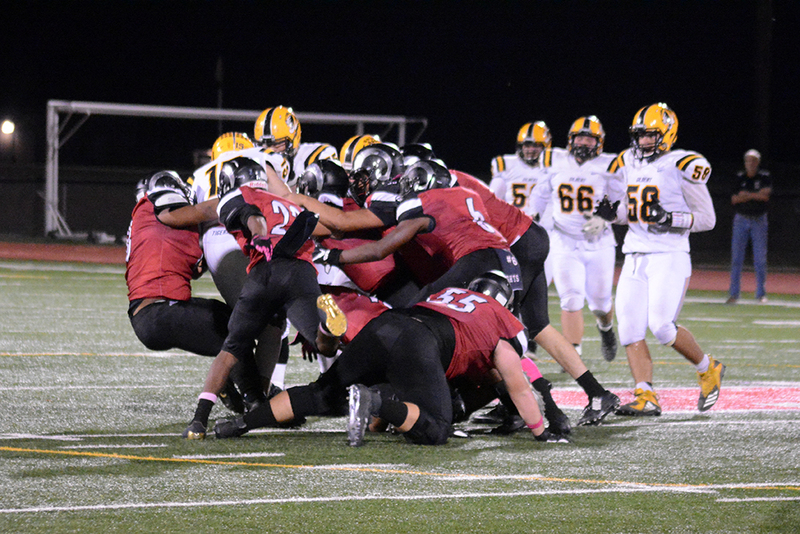 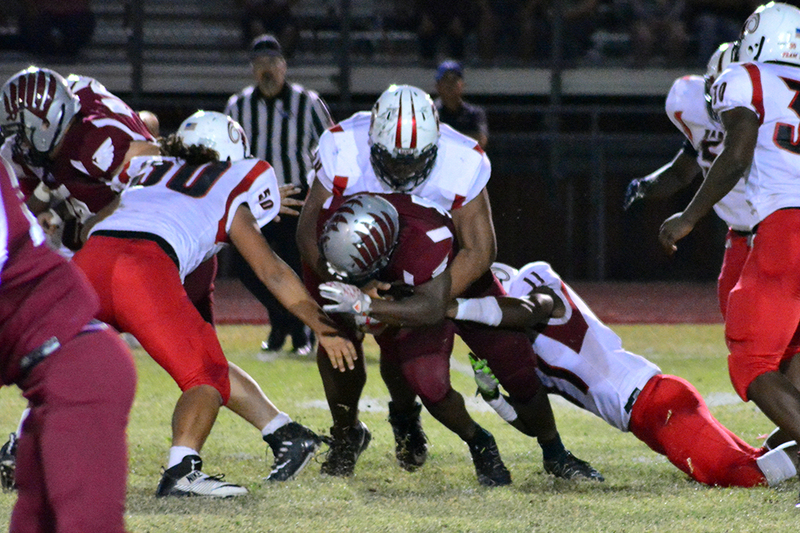 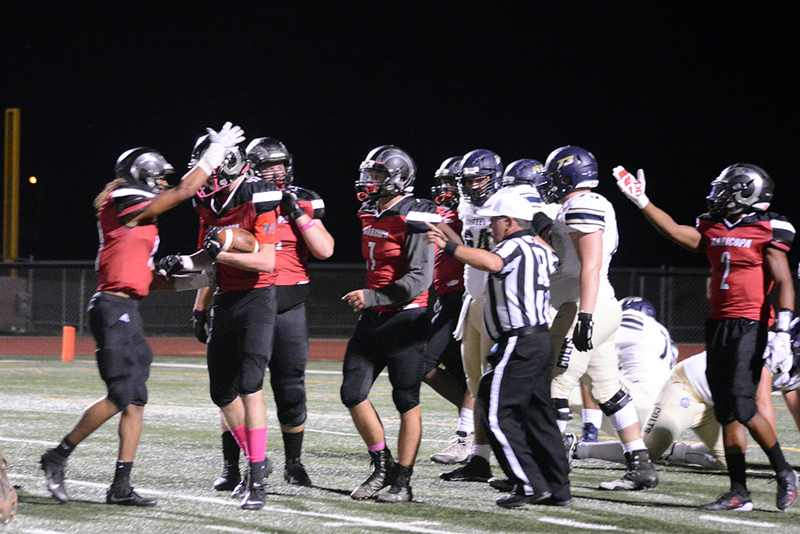 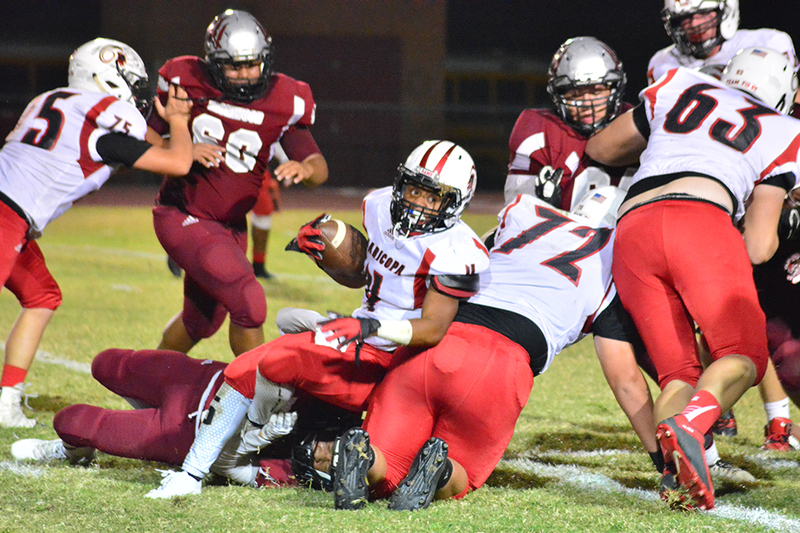 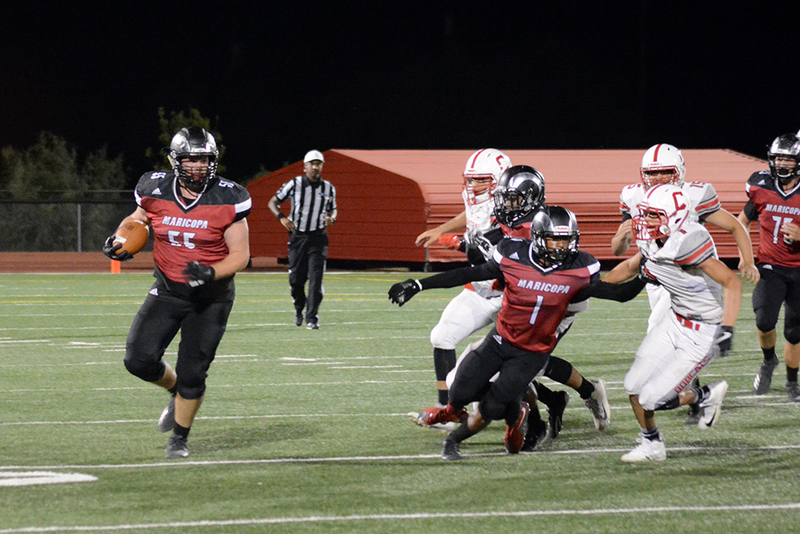 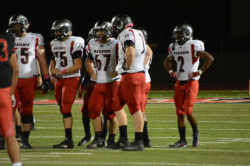 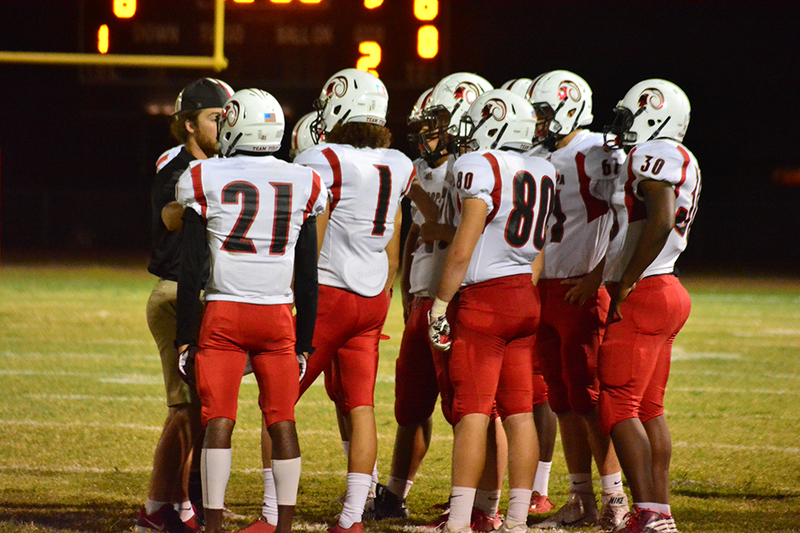 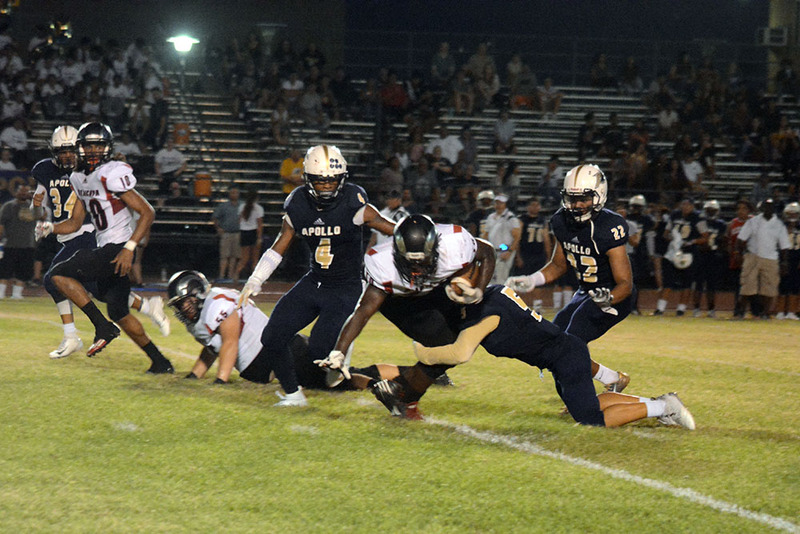 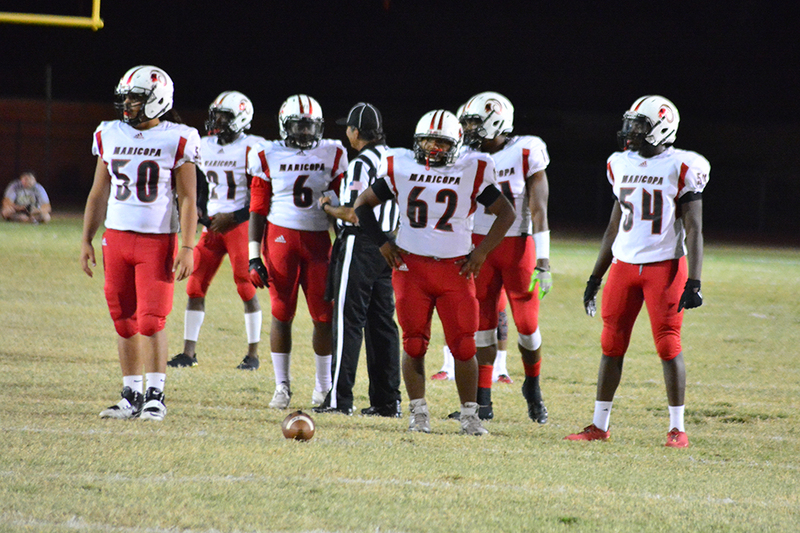 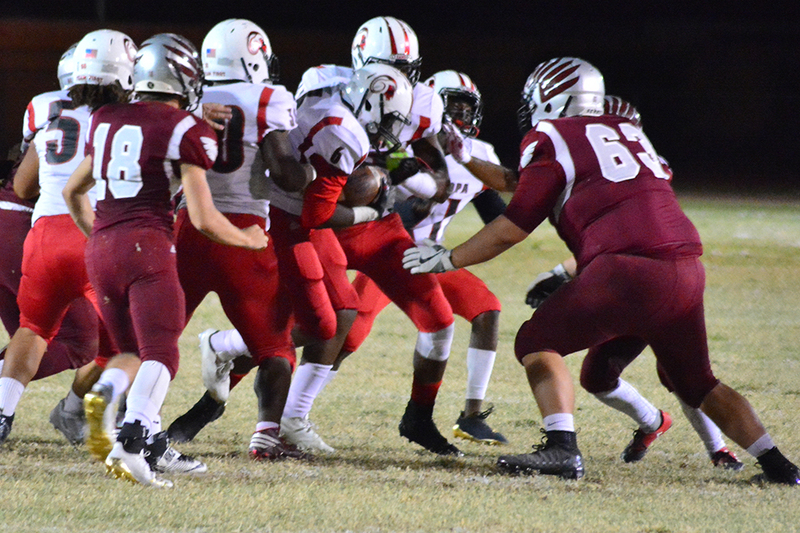 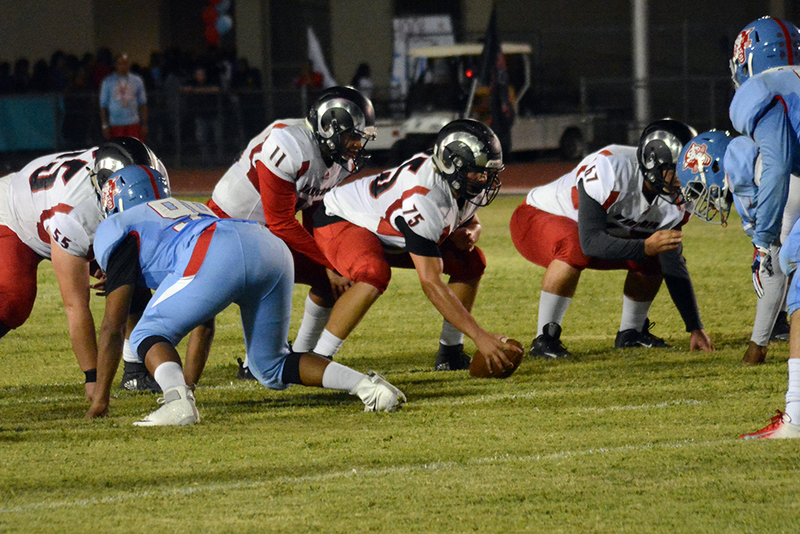 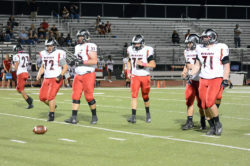 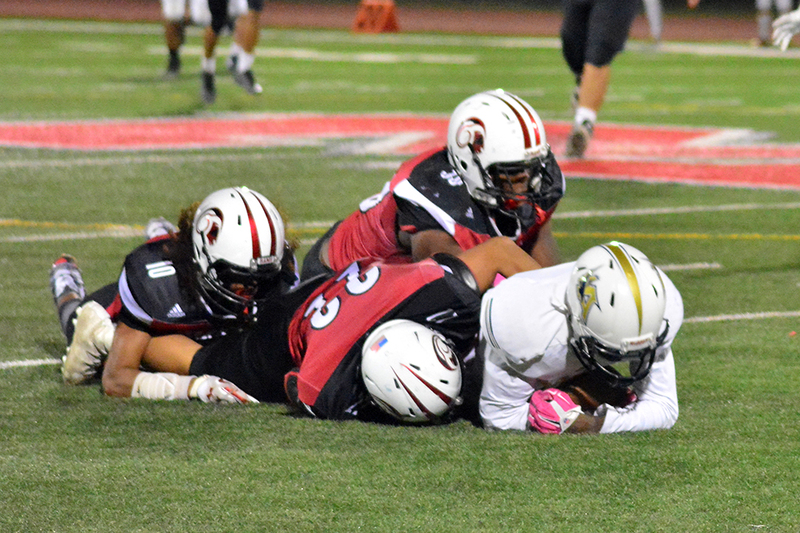 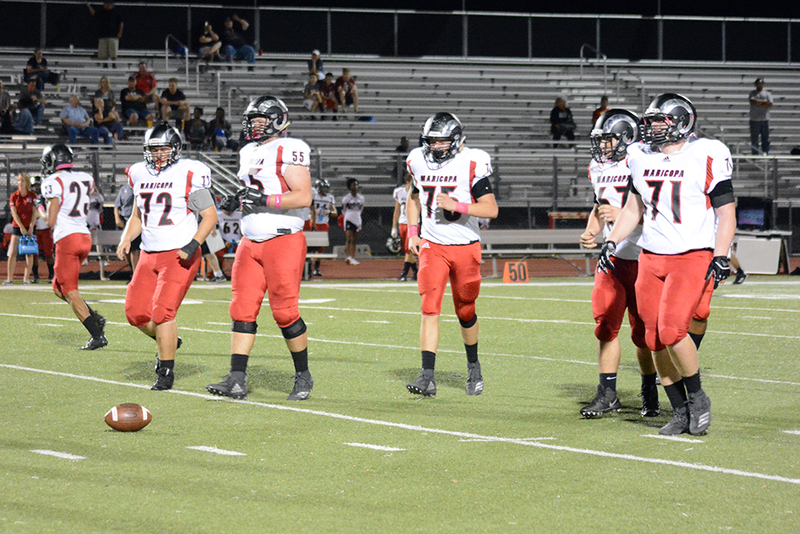 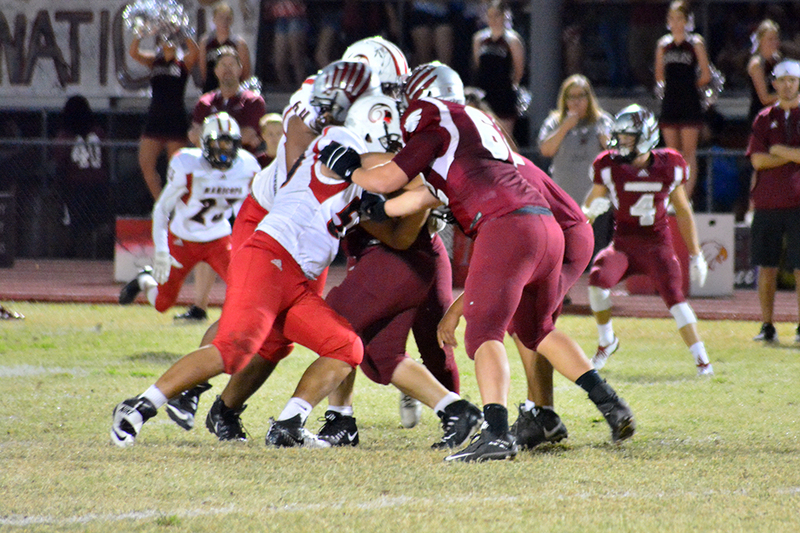 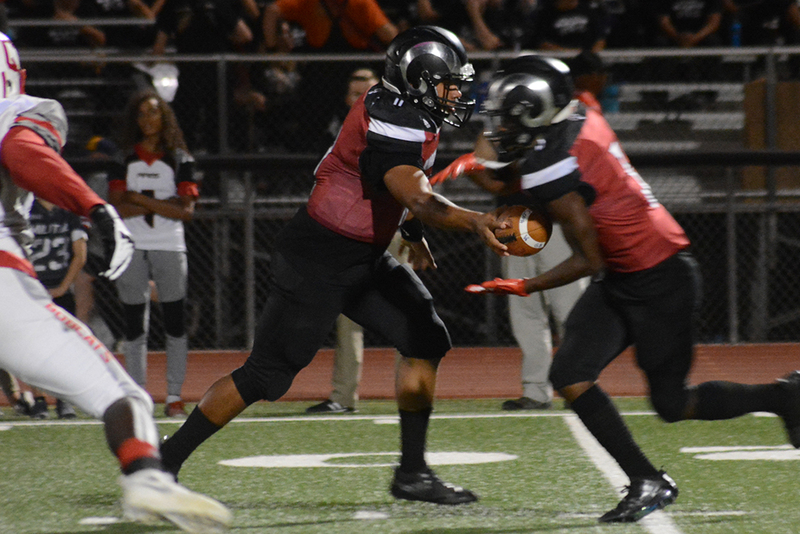 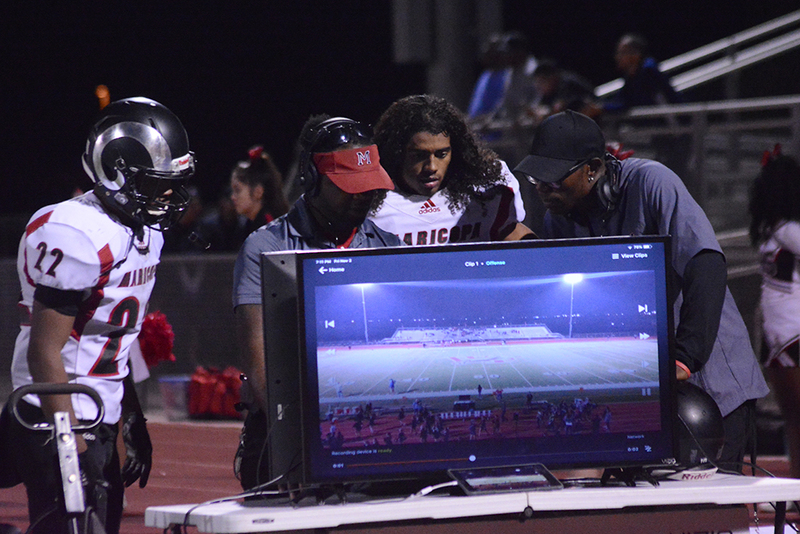 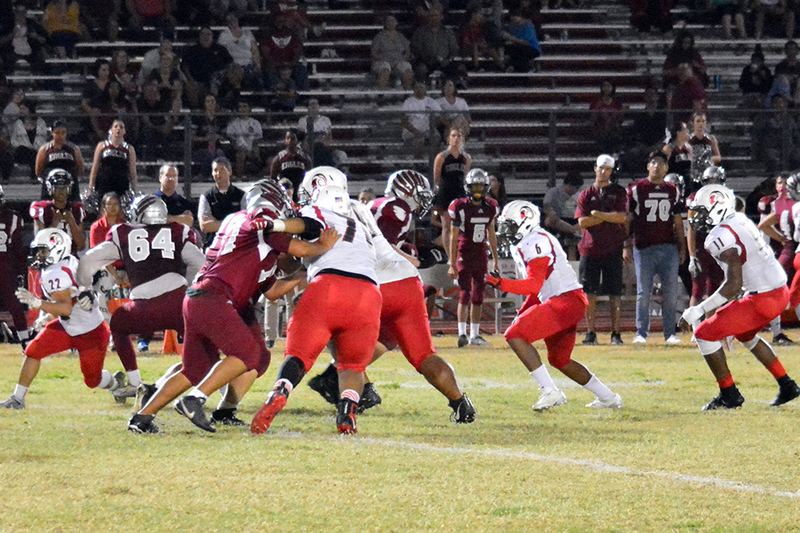 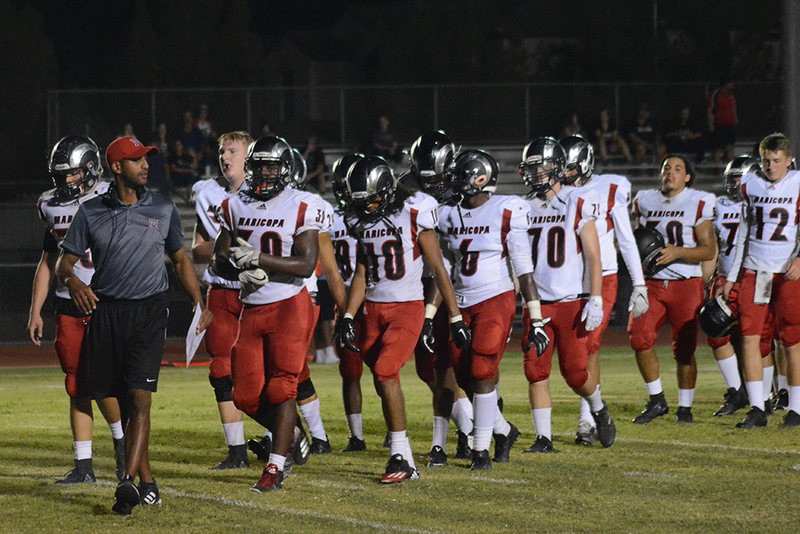 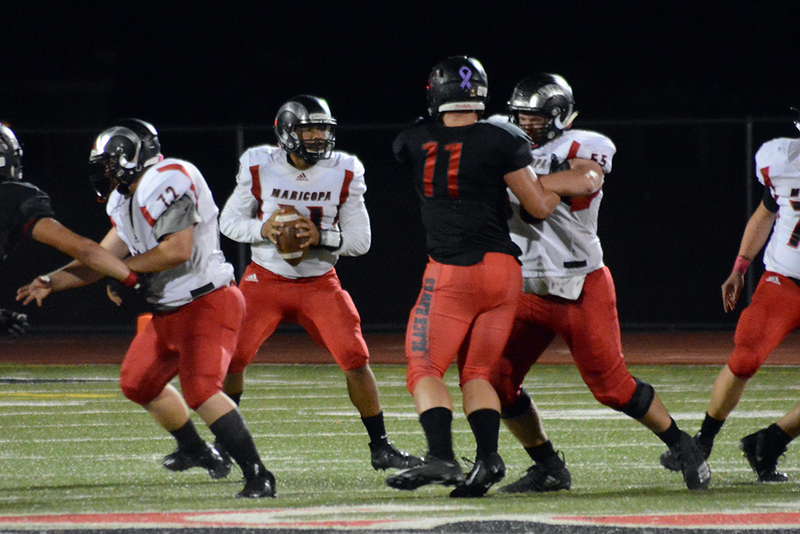 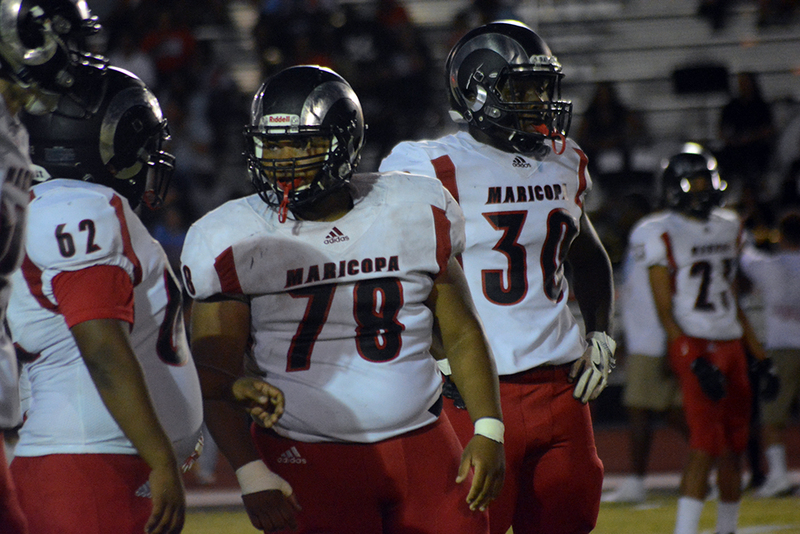 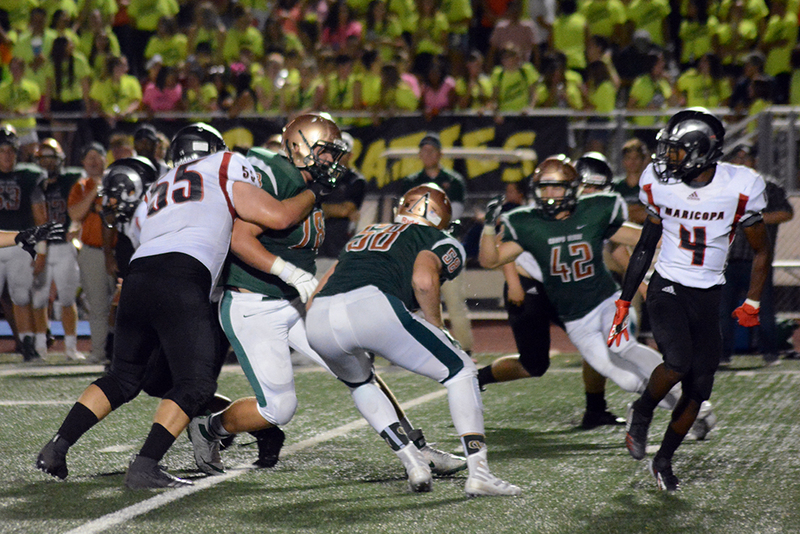 The Maricopa offense looked like it was in trouble, too, as time ran down and a sack put them at third-and-20. 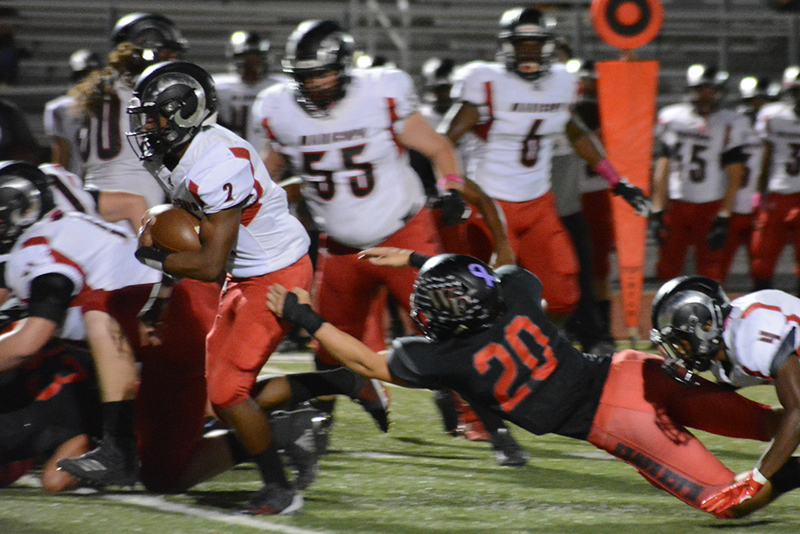 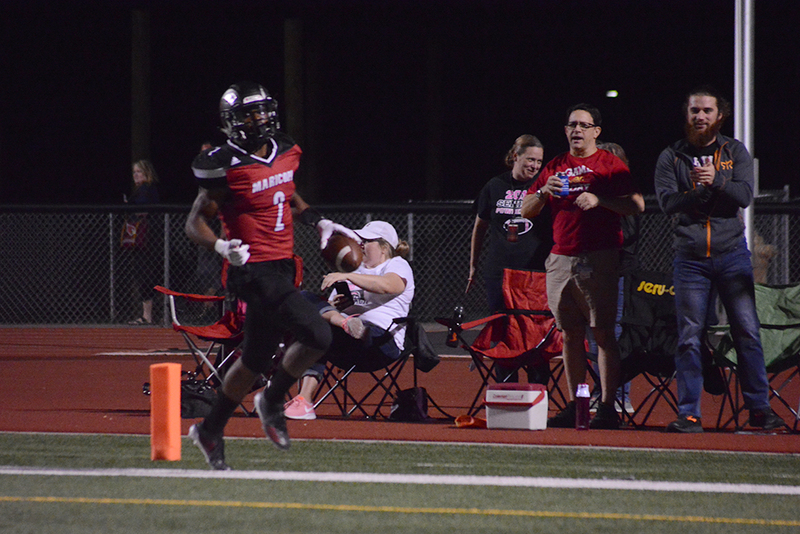 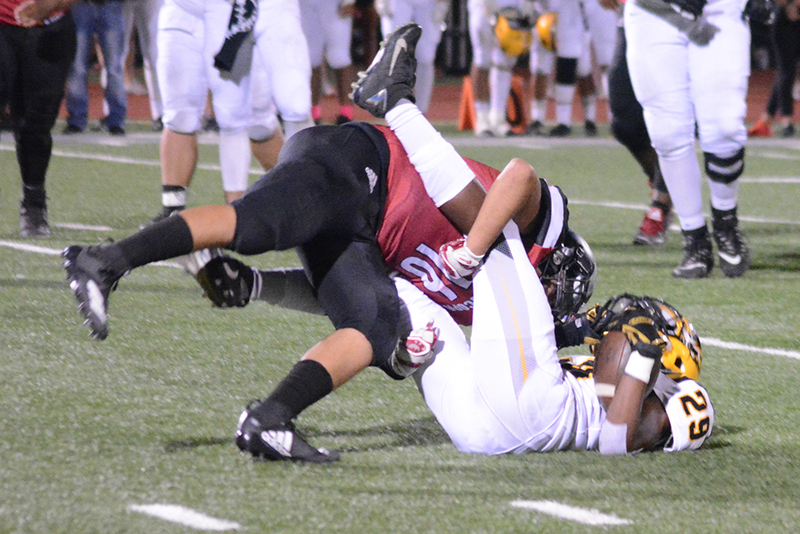 But Smith passed to Akins, who tumbled in for the score and the 14-10 lead at the half. 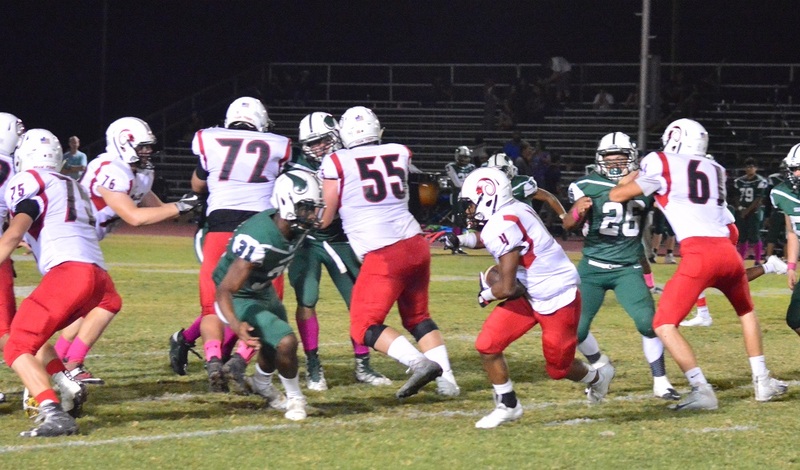 Sunnyslope used Penn to score from the 15 and take back the lead near the end of the third quarter. 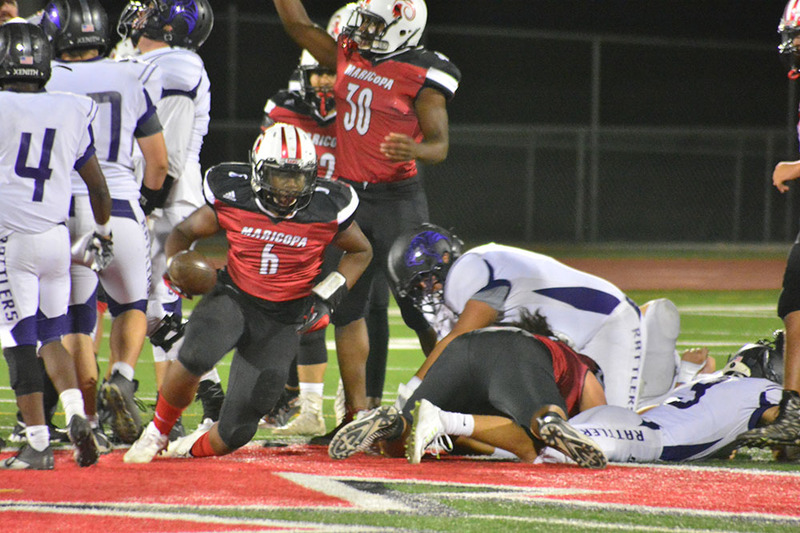 Having trouble getting past MHS defenders Edward Donaldson and Tylen Coleman near the goal line, the Vikings were in easy field-goal range. 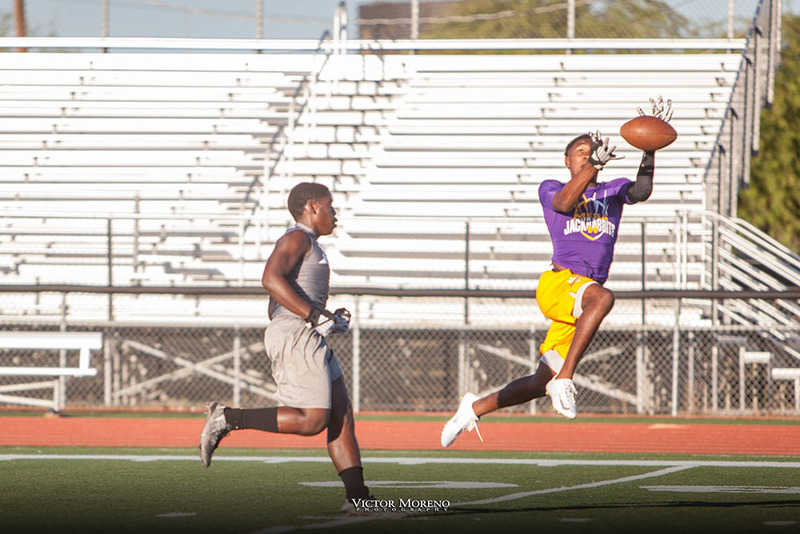 Instead they opted to go for the touchdown with a pass attempt. 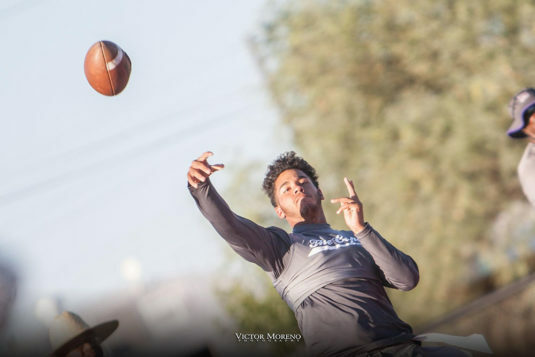 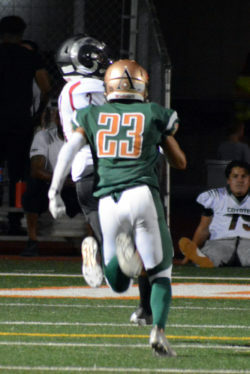 Injury notwithstanding, Cowing made them pay for that, grabbing the ball out of the air and running all the way back to Sunnyslope’s 15-yard line. 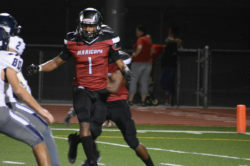 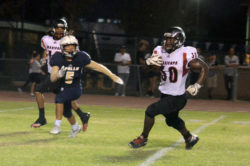 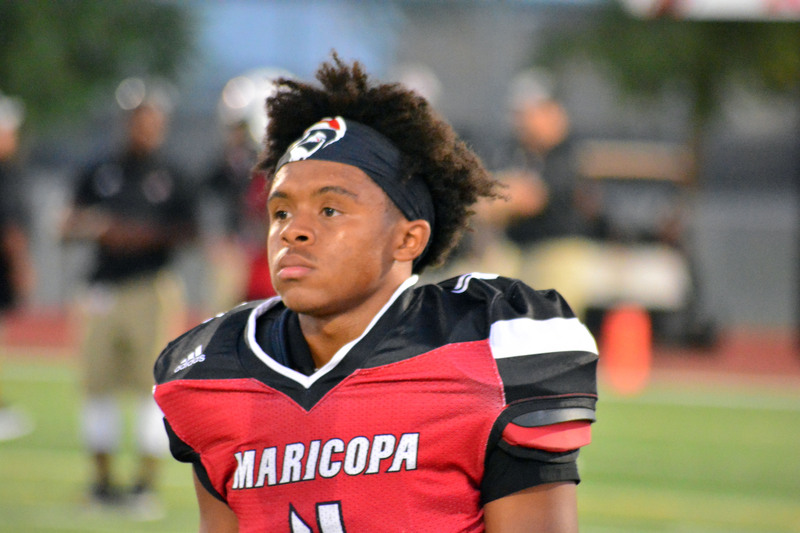 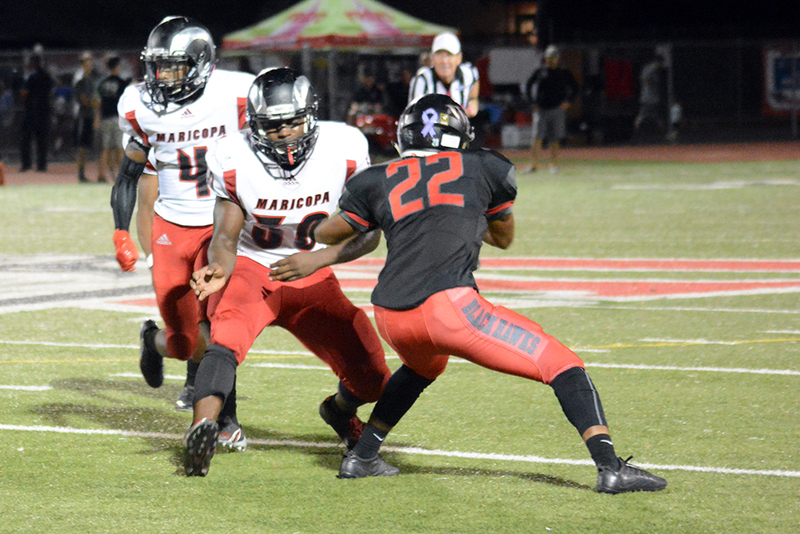 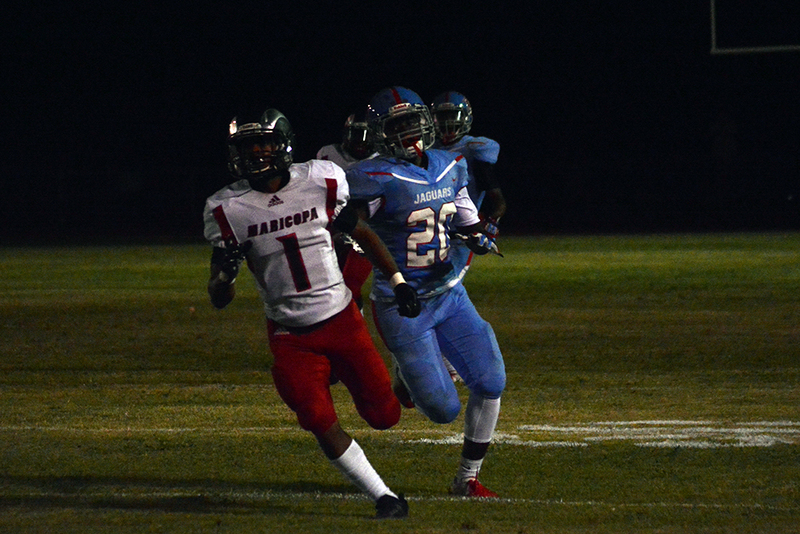 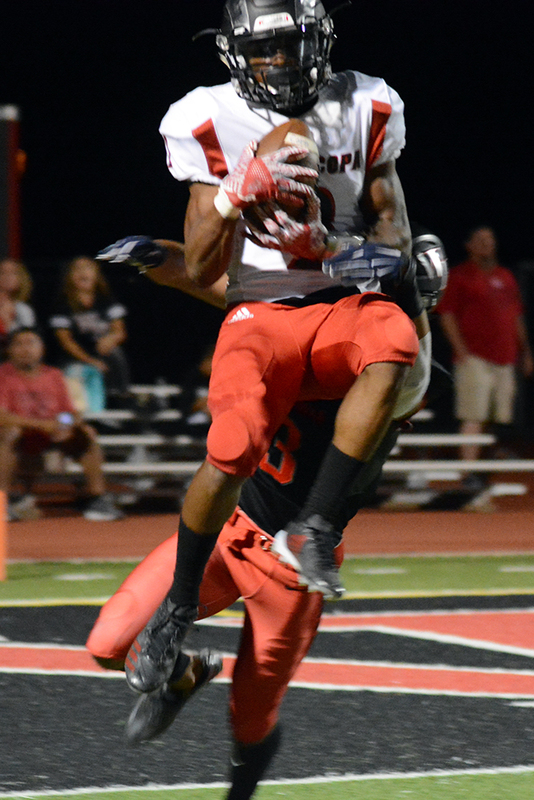 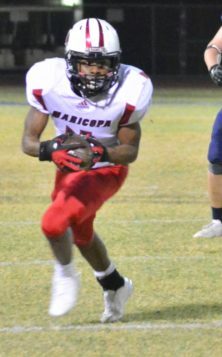 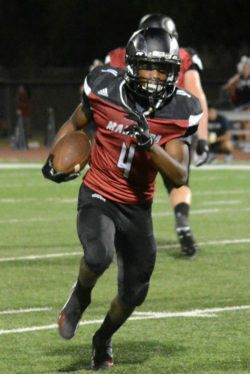 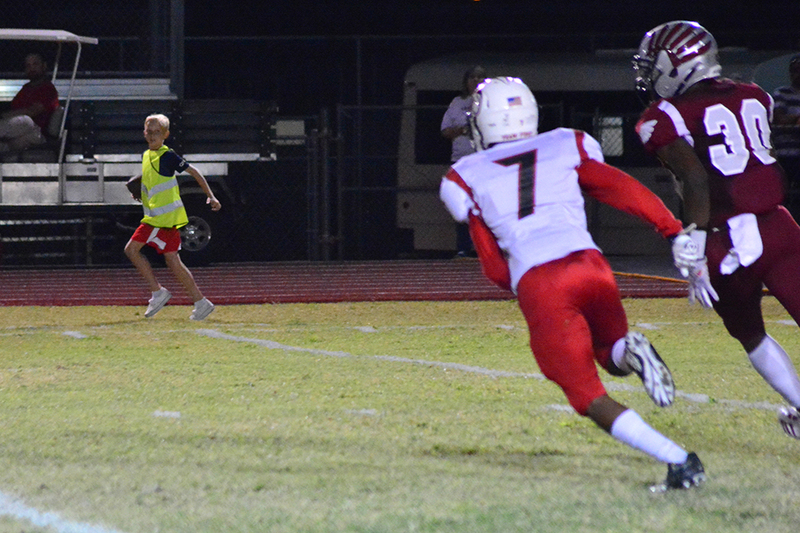 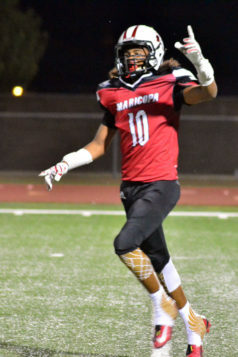 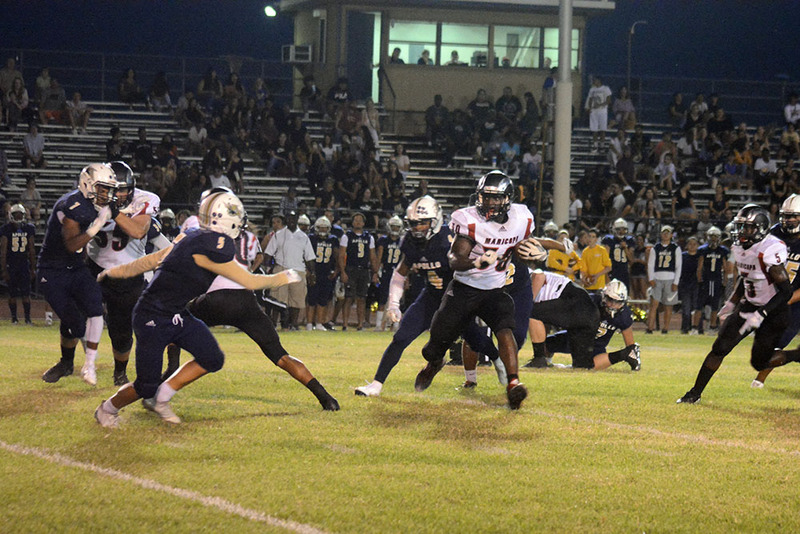 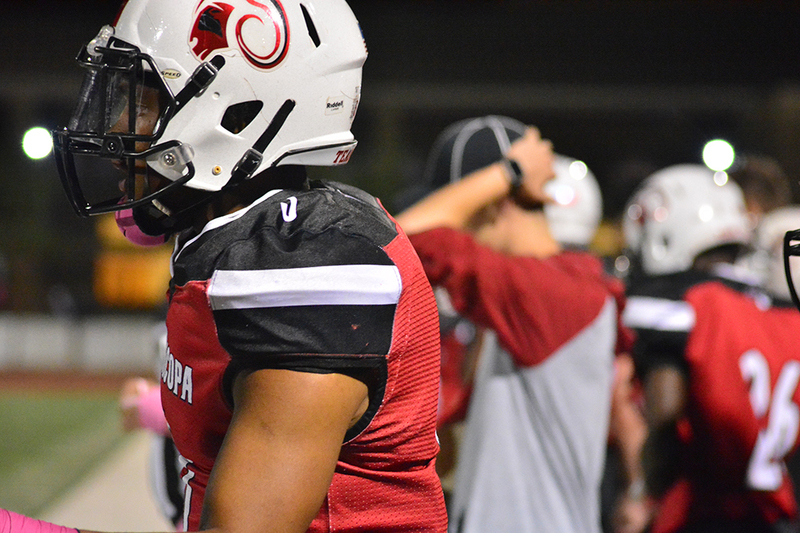 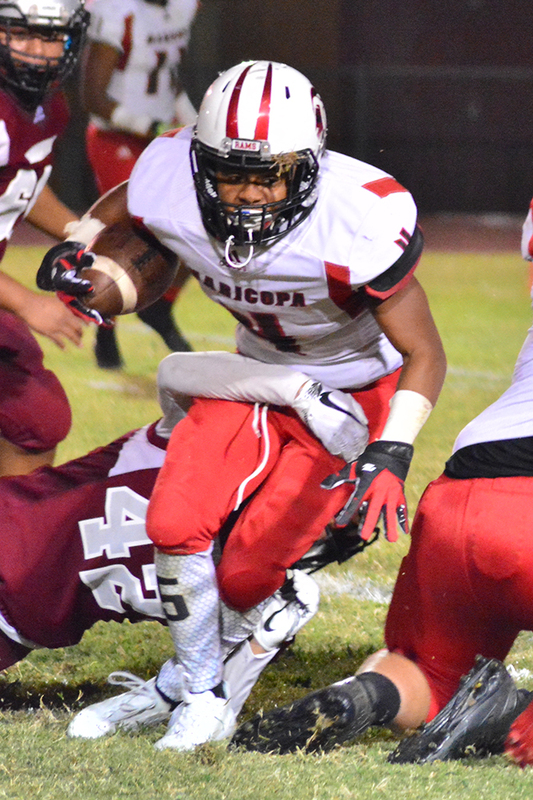 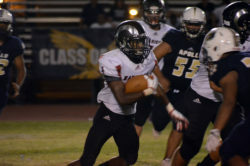 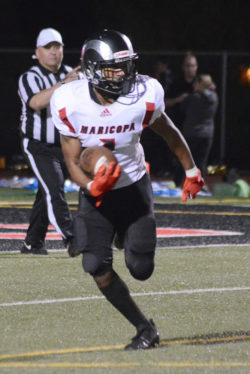 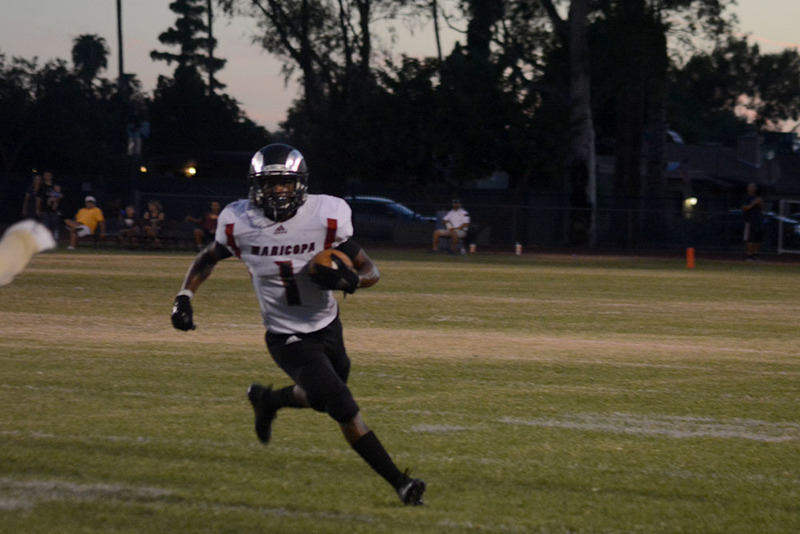 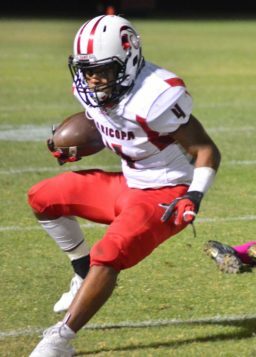 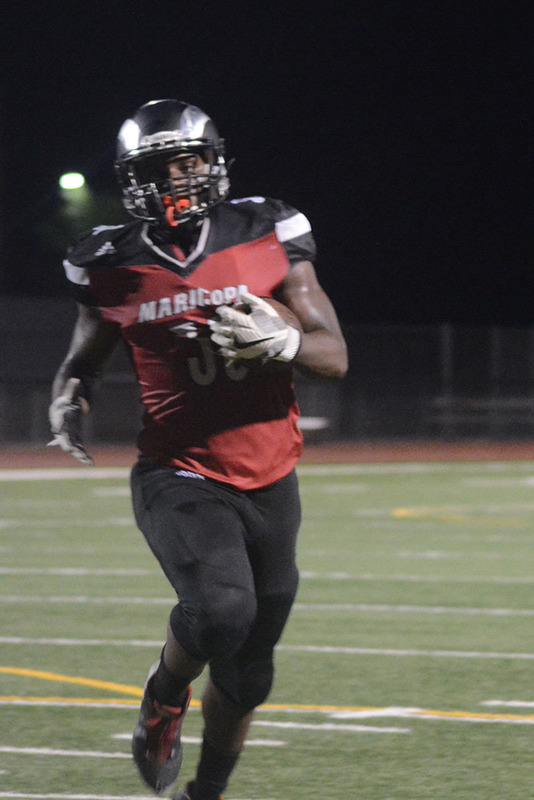 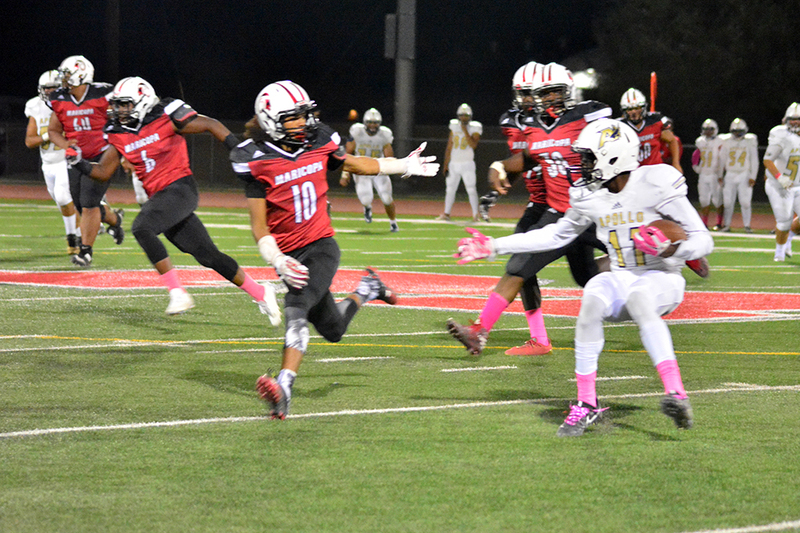 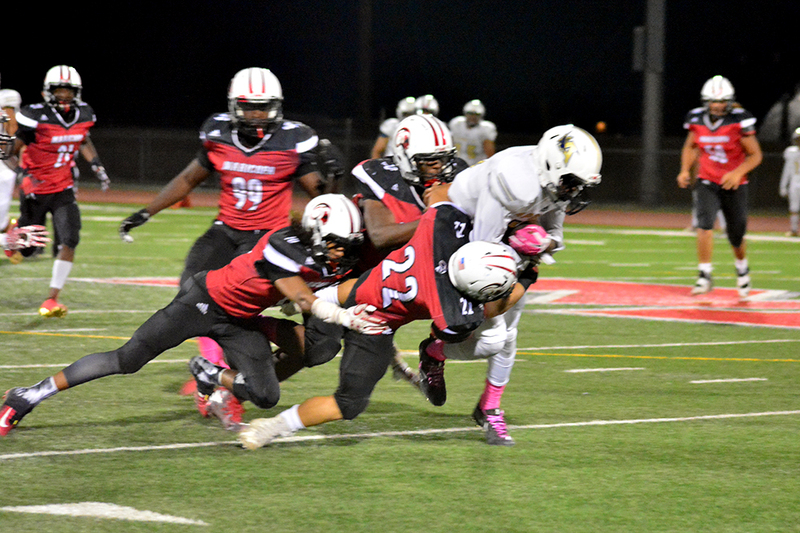 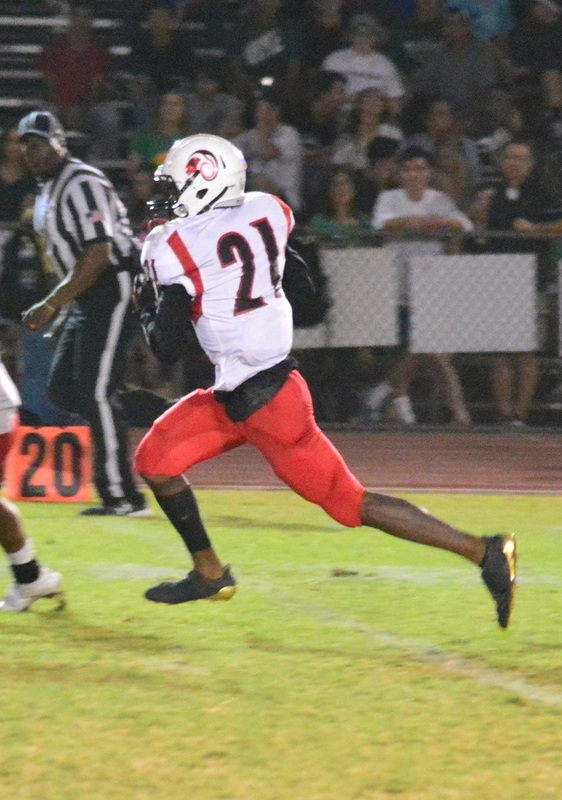 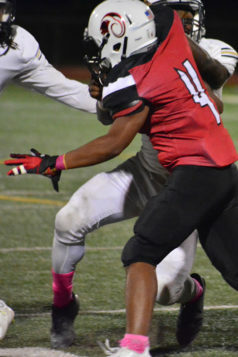 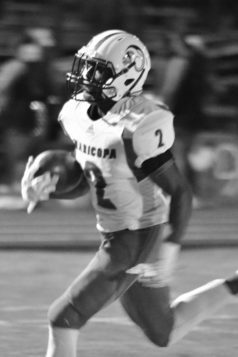 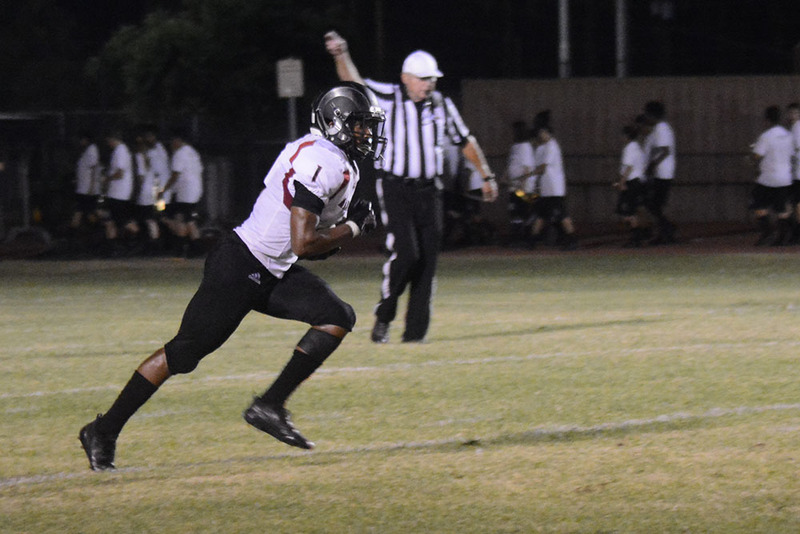 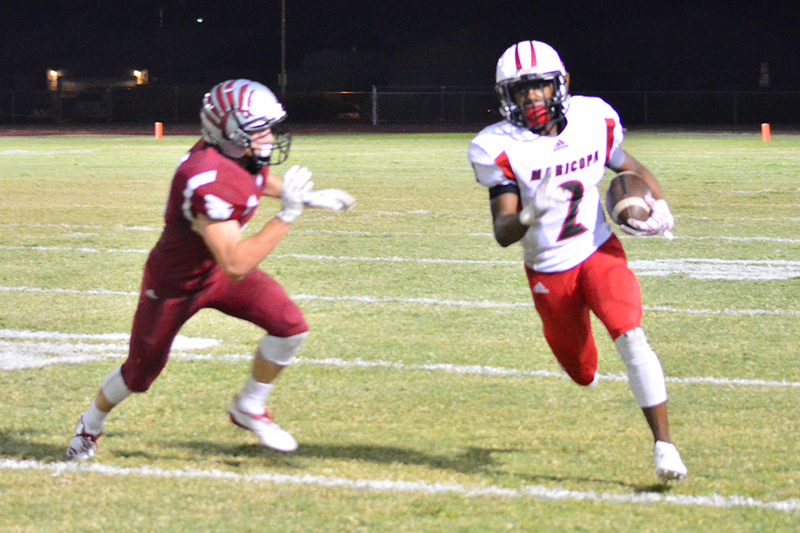 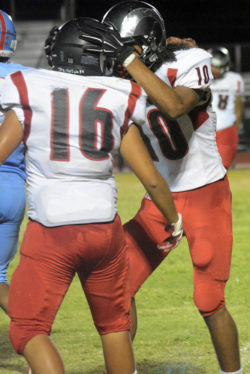 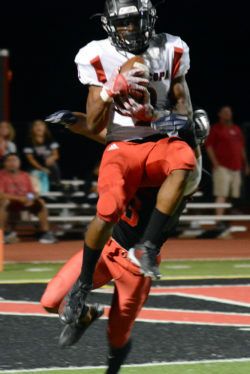 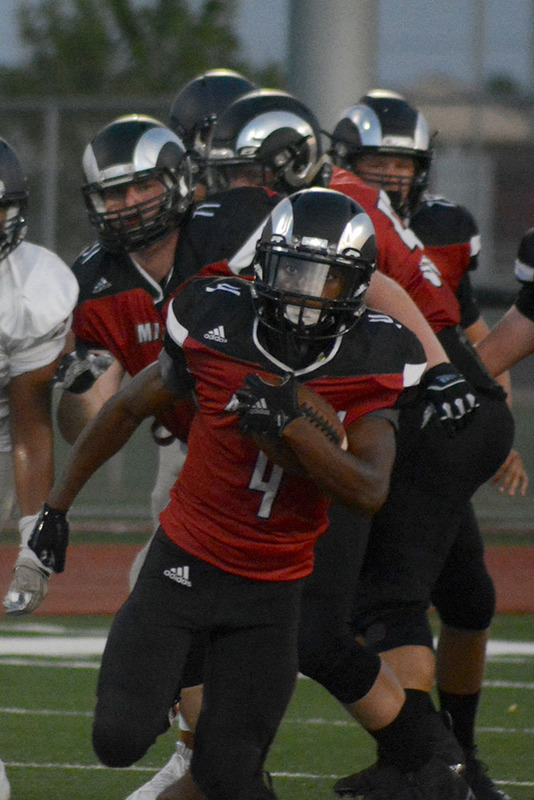 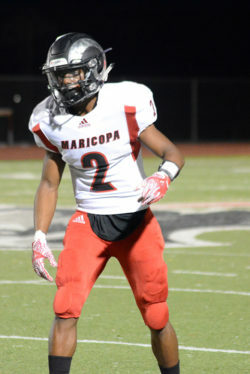 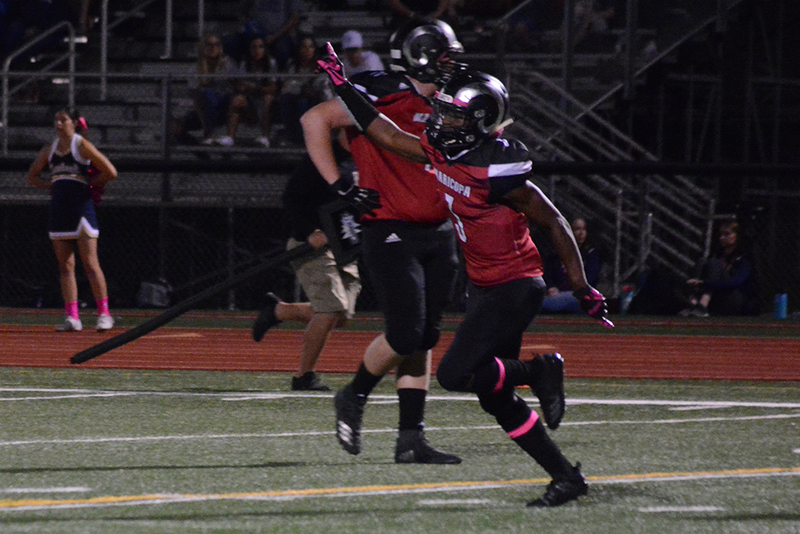 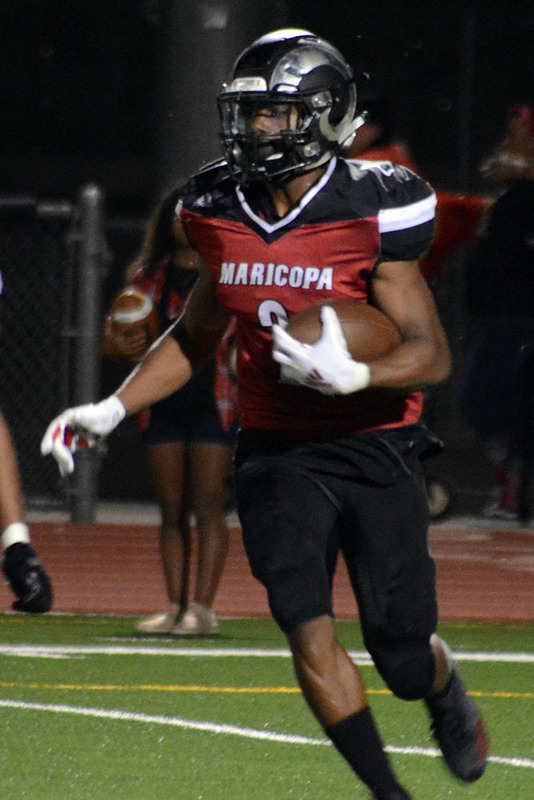 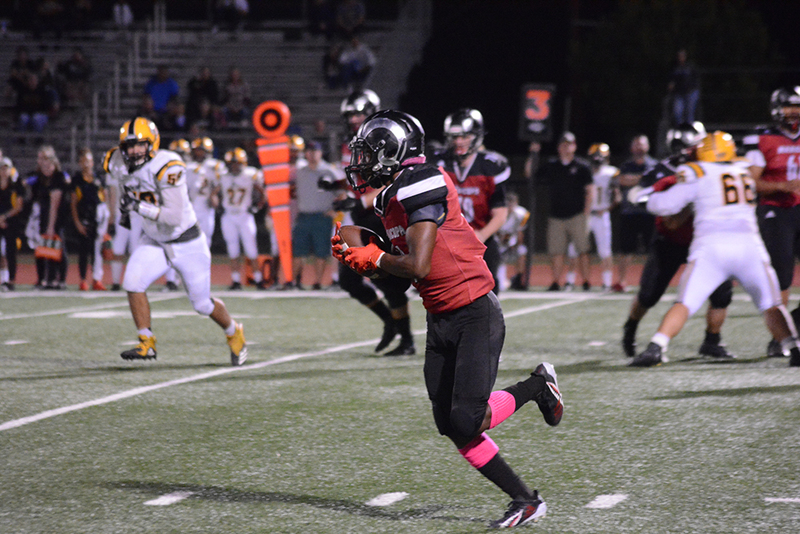 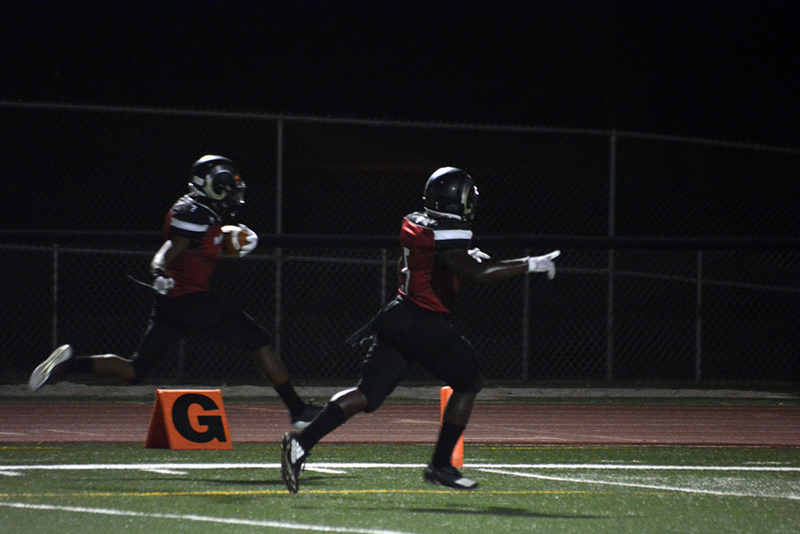 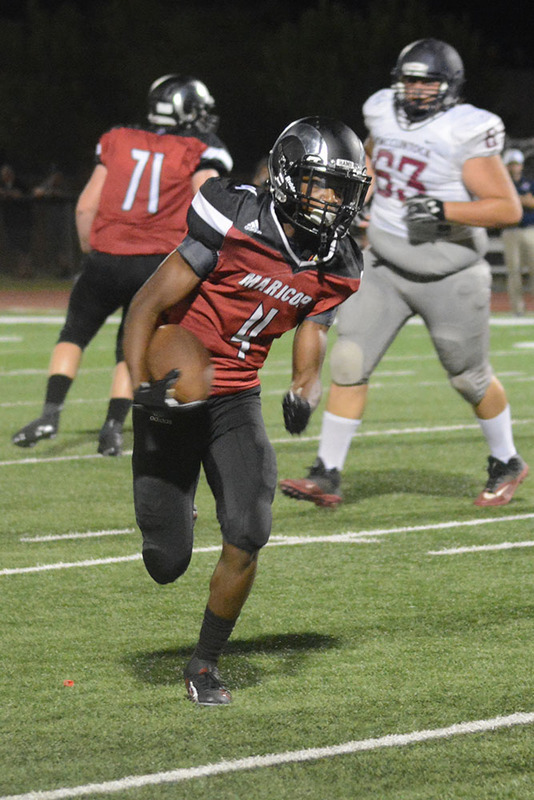 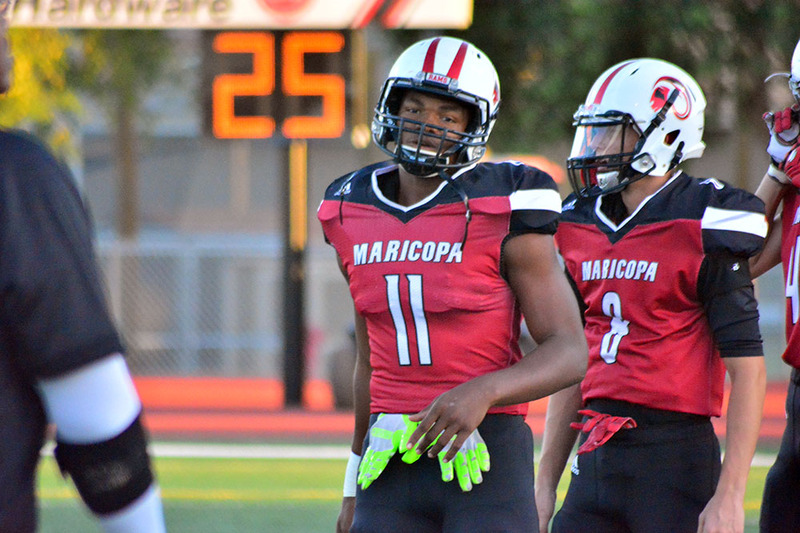 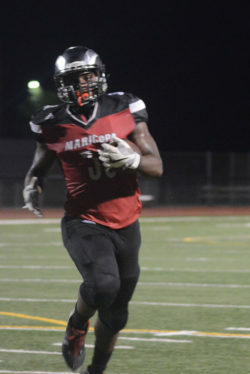 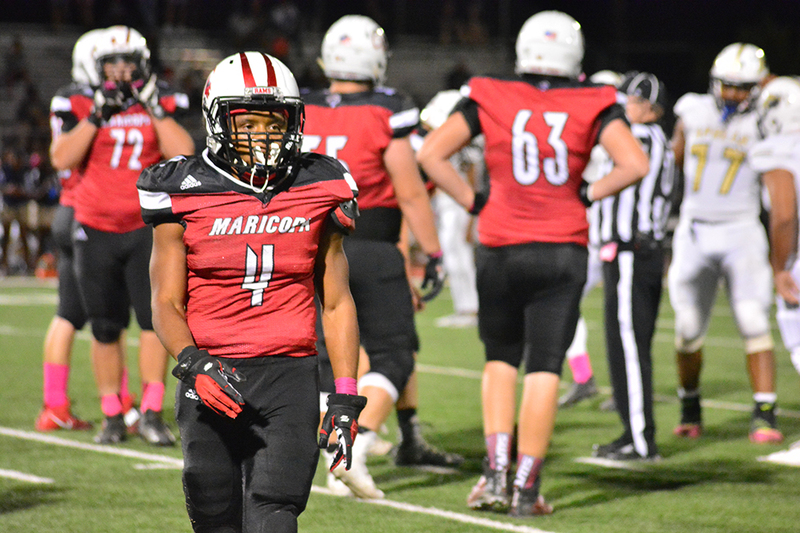 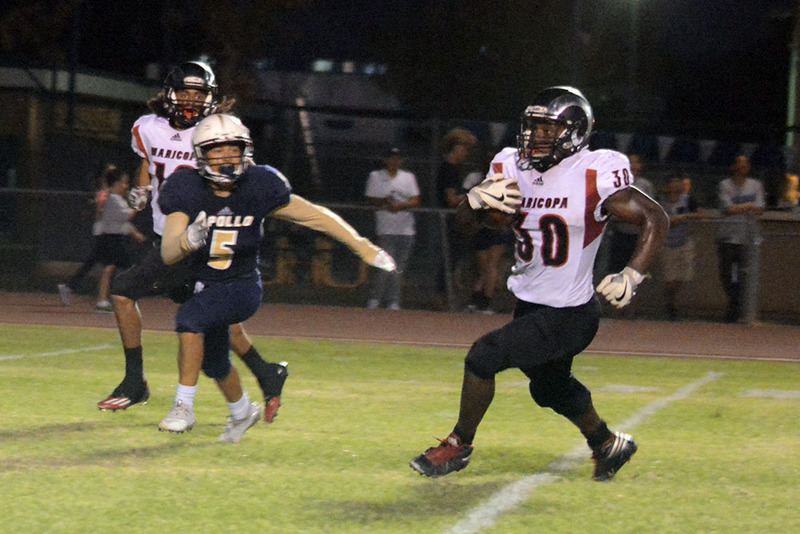 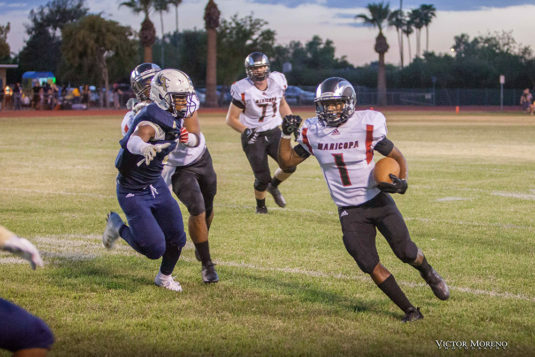 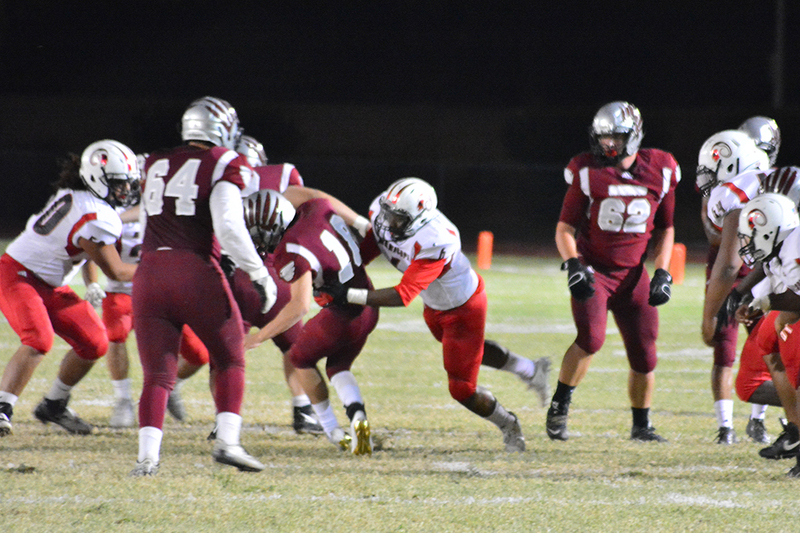 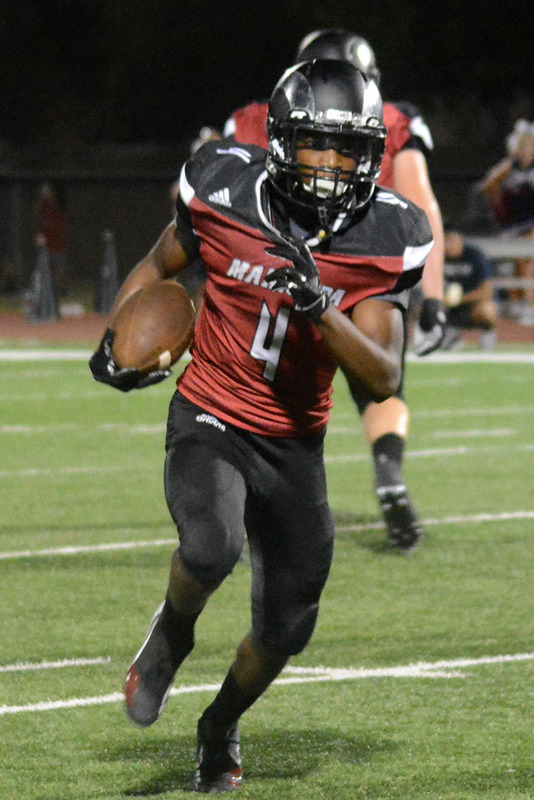 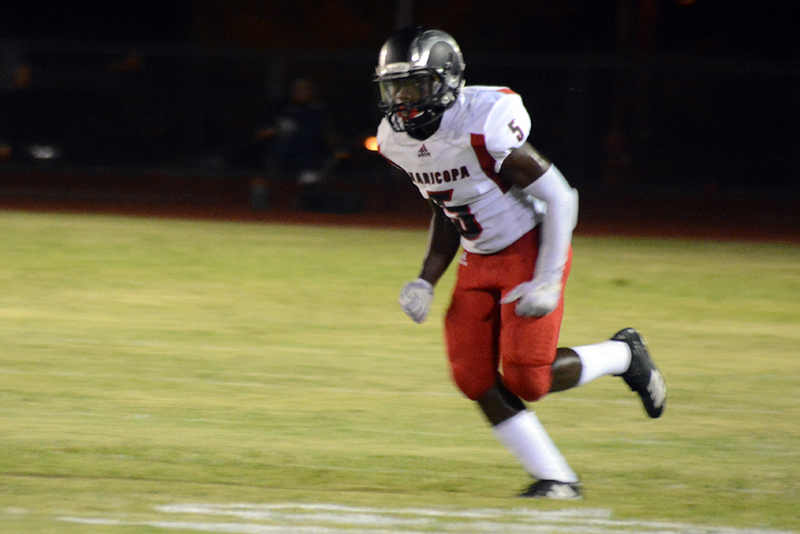 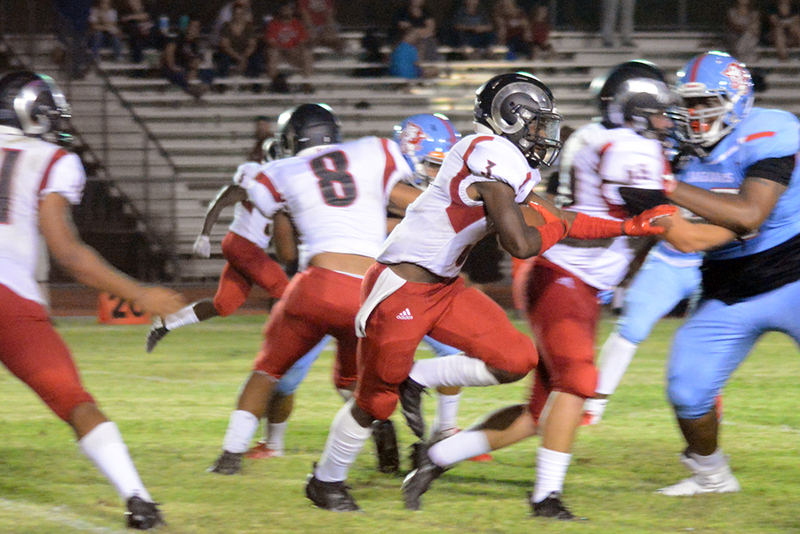 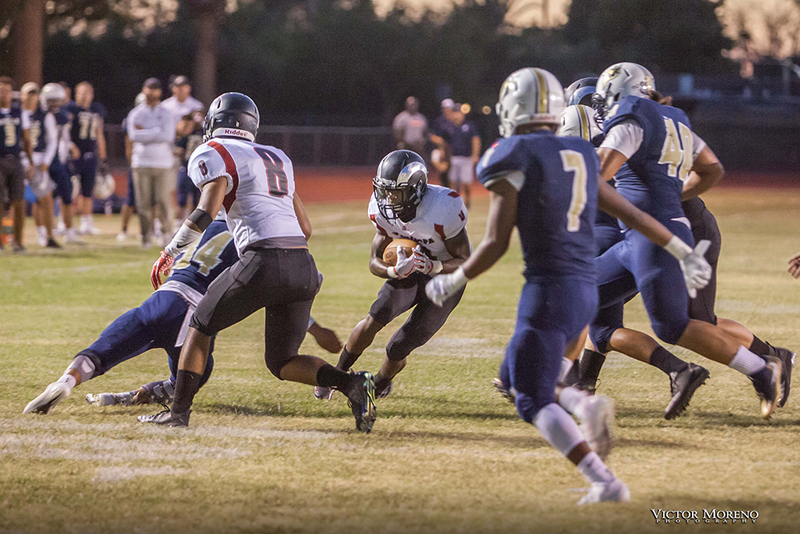 Soon after, senior running back Cameron Sanders took the ball in from the 10 to put Maricopa on top 20-17. 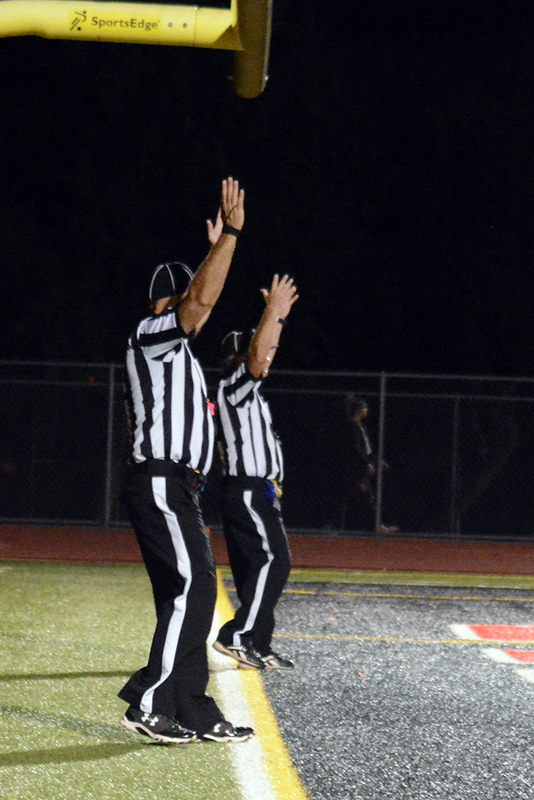 The Vikings answered with a field goal with 1:40 left in the game. 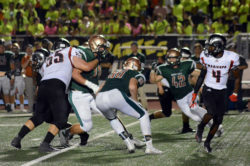 The Rams turned the ball over on a controversial call after it seemed forward motion had ceased, and that set up Sunnyslope’s scoring drive, capped by Penn rushing for a touchdown on third down. 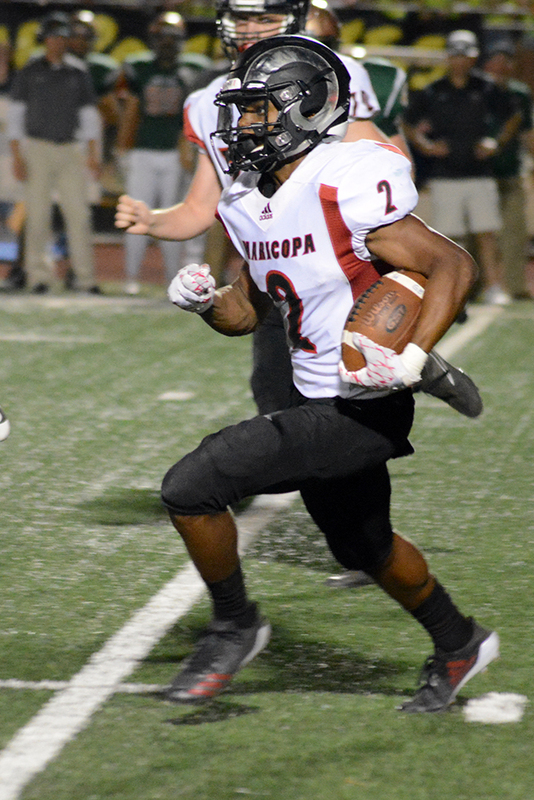 It gave Sunnyslope the 27-20 lead with 10 seconds left. 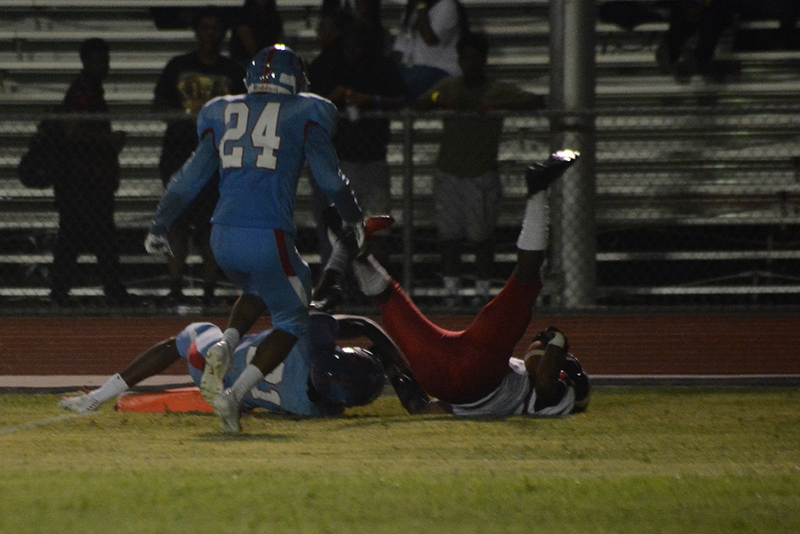 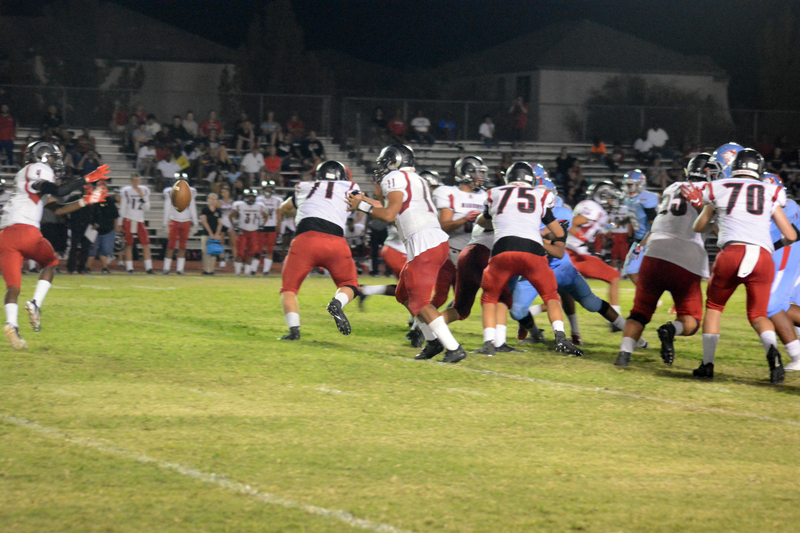 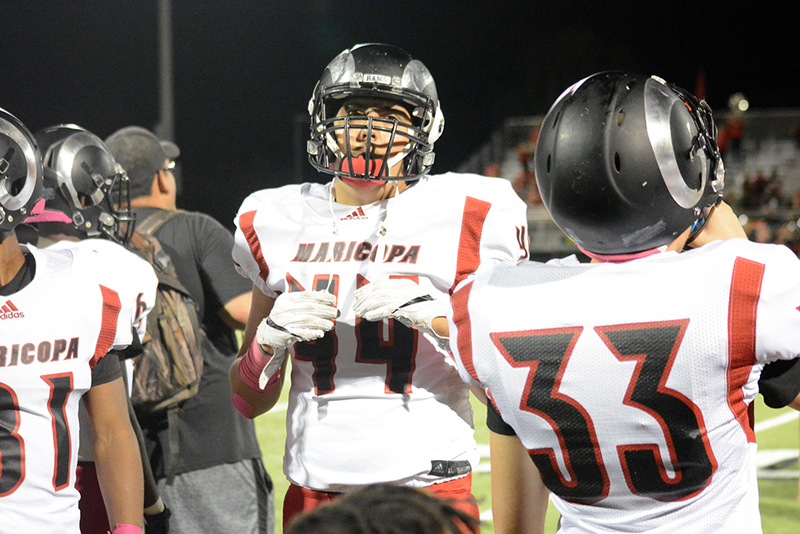 That left Maricopa with a desperation play with 2 seconds remaining, a lateral that backfired when the ball got away. 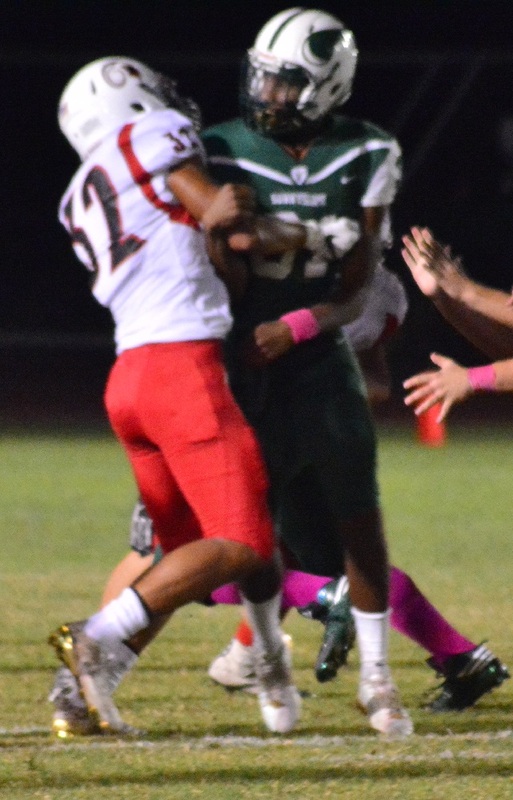 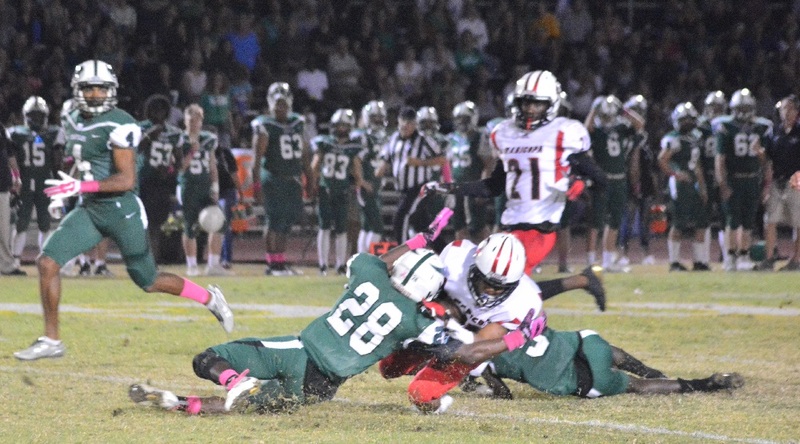 That would have ended the game in a loss for Maricopa anyway, but Sunnyslope’s Maurice Hayes picked up the ball and scored with no time left. 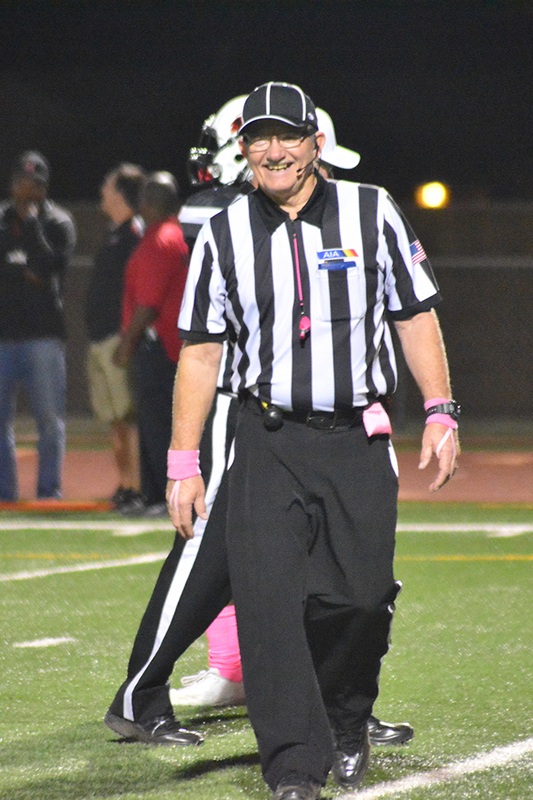 McDonald said he was disappointed in the Rams’ play. 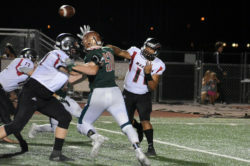 “We thought we had a good game plan, and I think right out of the gate they (Sunnyslope) started playing harder,” he said. 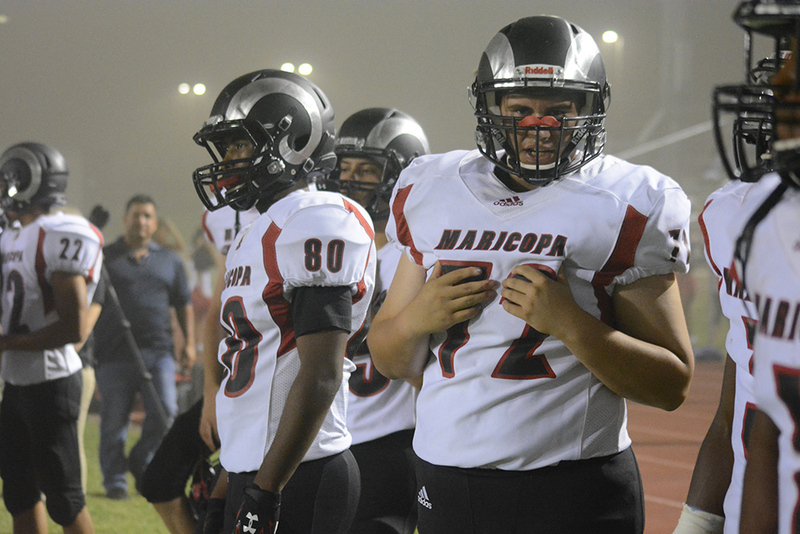 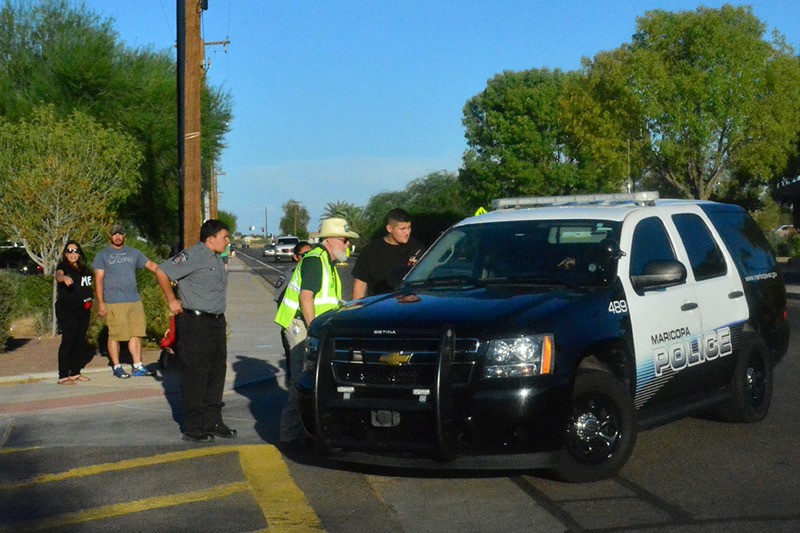 Maricopa may be feeling the effects for a while. 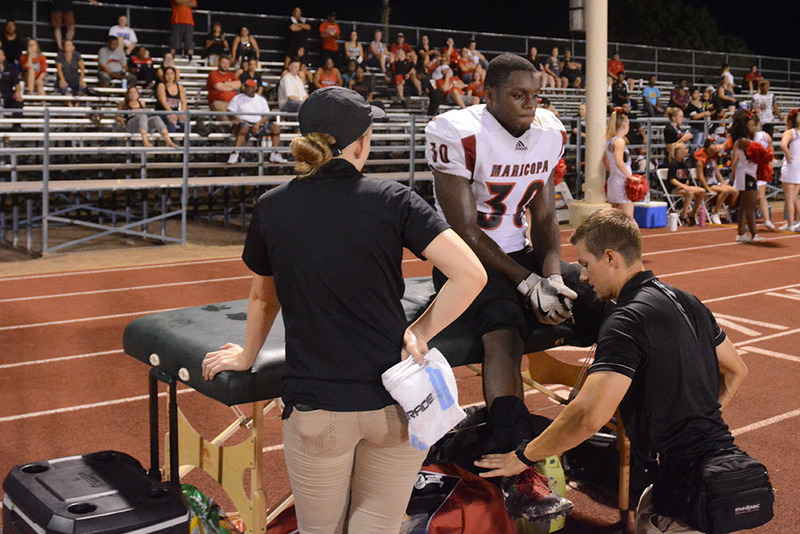 Cowing, who easily leads 5A Metro in receiving yards, may have broken a bone in his hand. 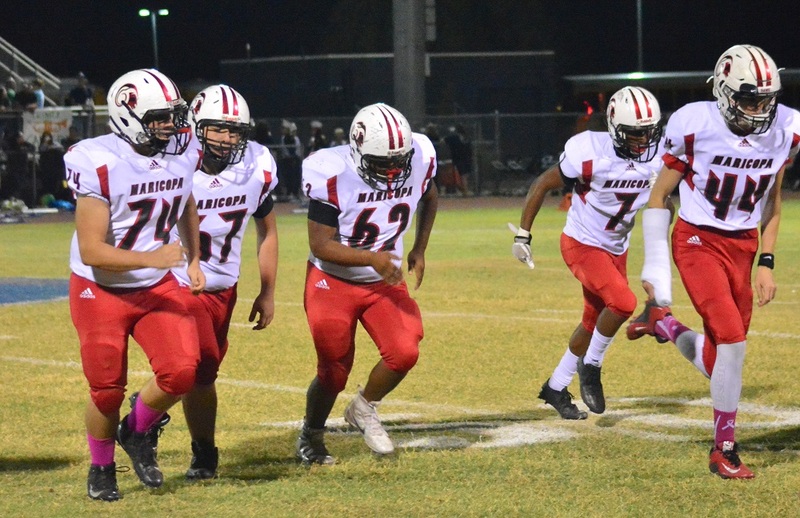 Next up for Maricopa is a region game at Kellis (5-3, 0-3). 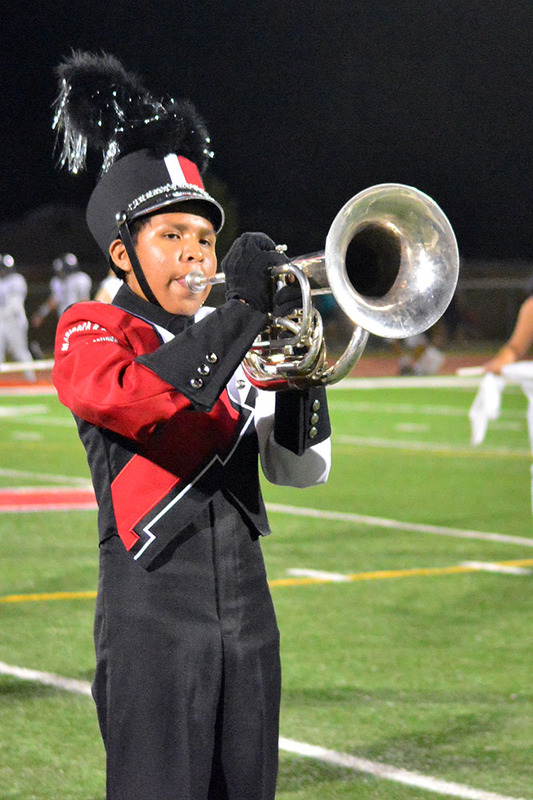 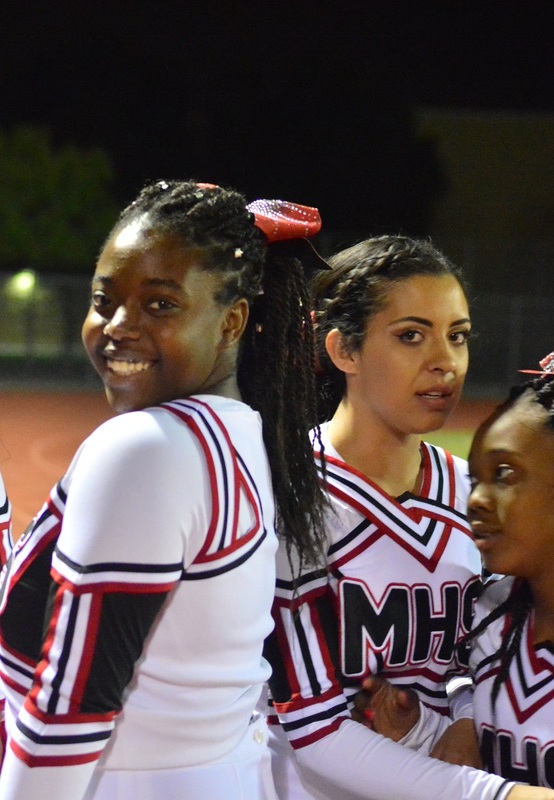 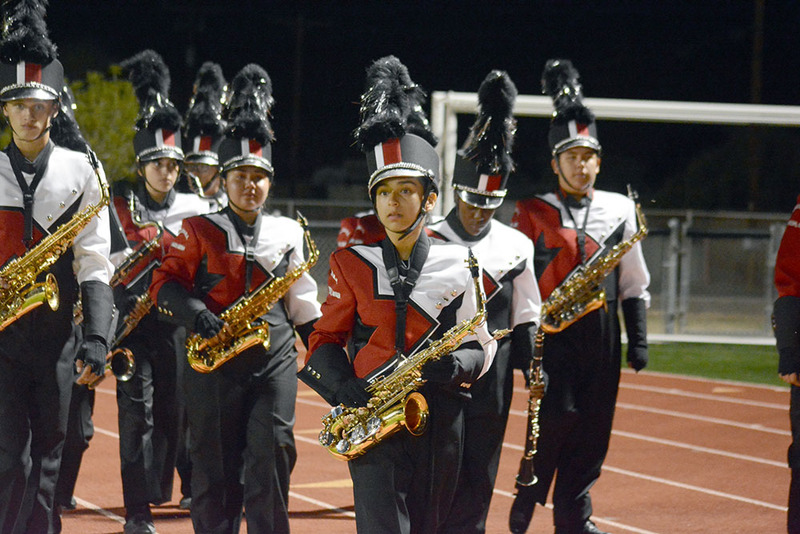 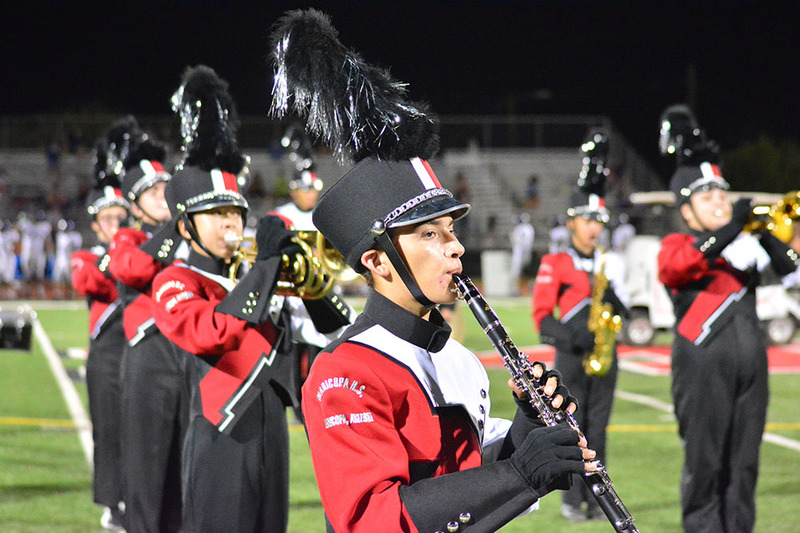 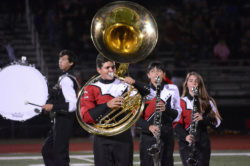 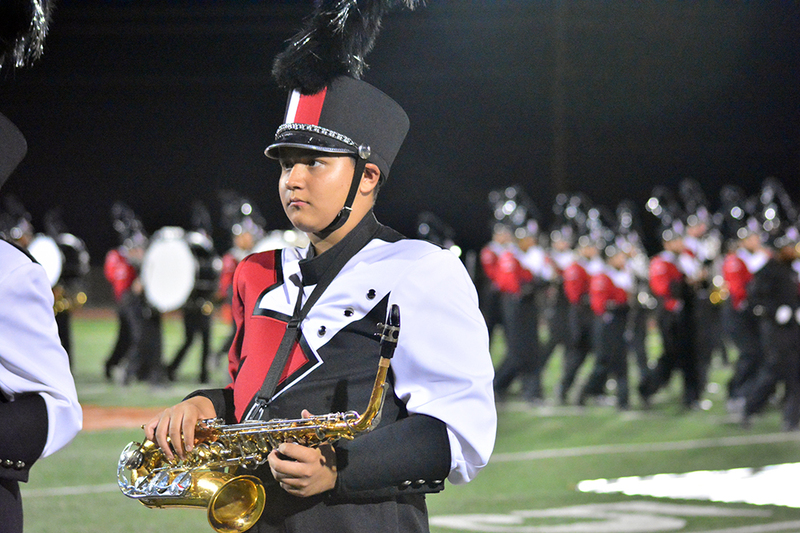 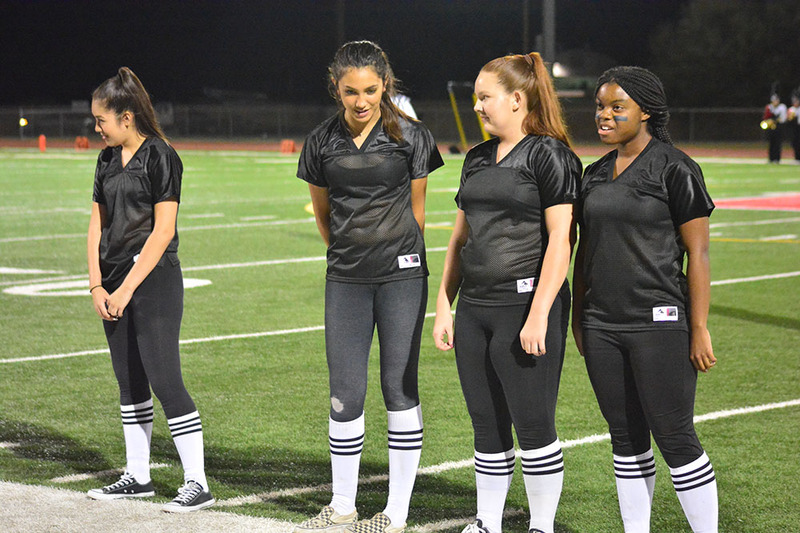 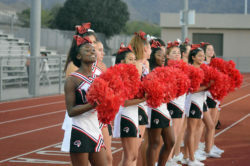 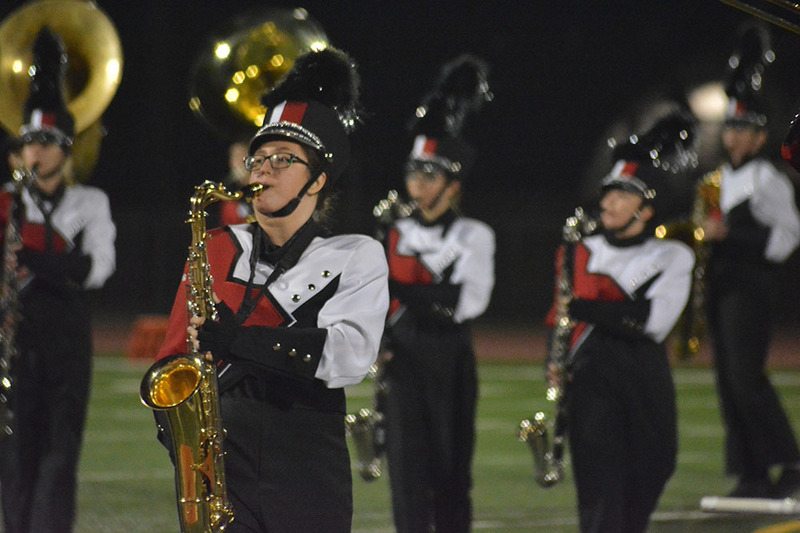 The game starts at 7 p.m. Oct. 20 at 8990 W. Orangewood Ave., Glendale. 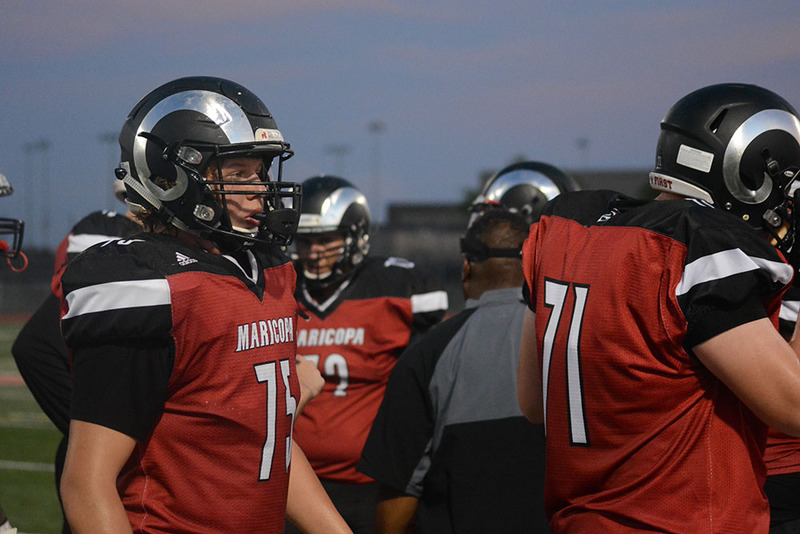 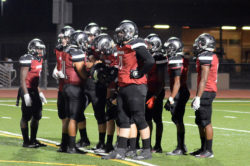 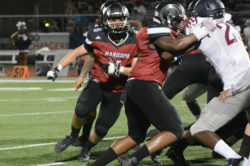 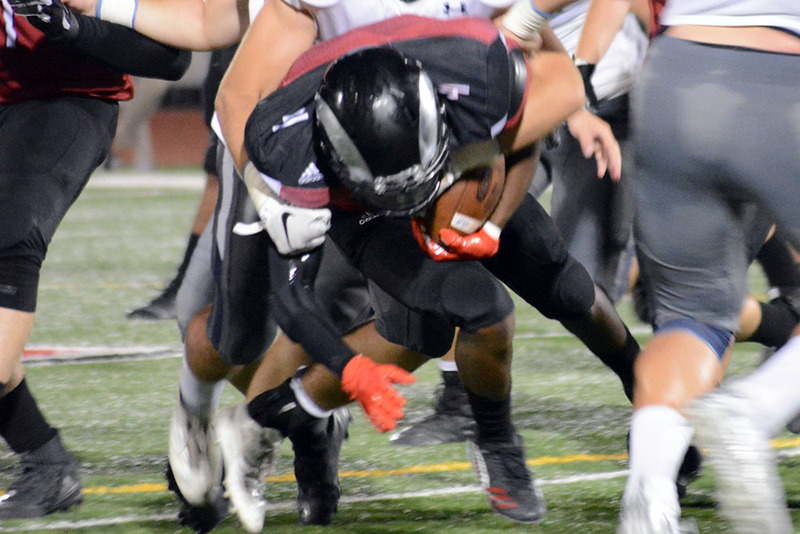 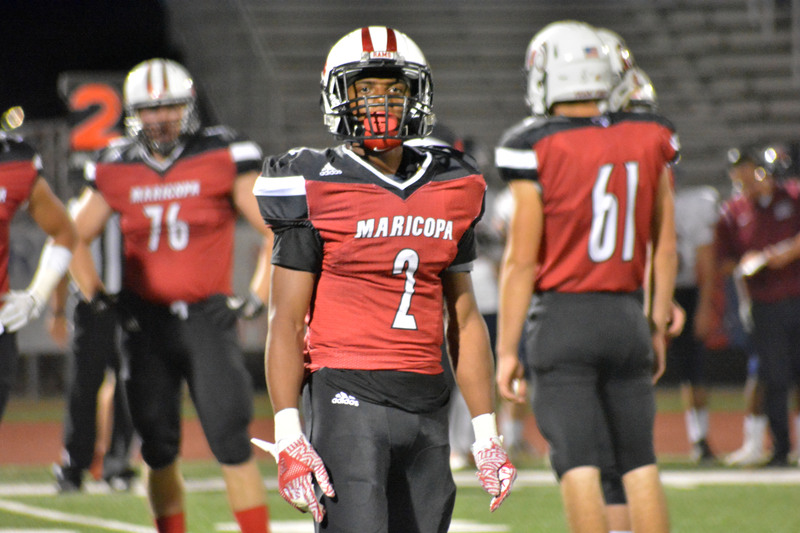 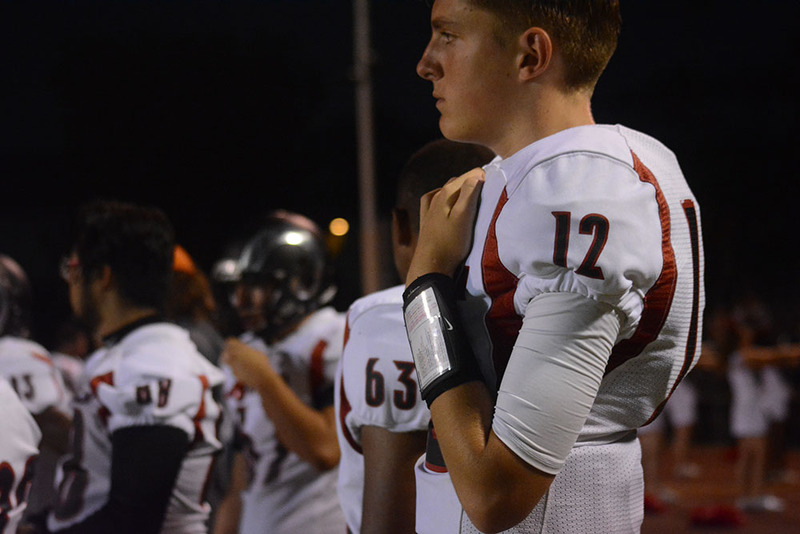 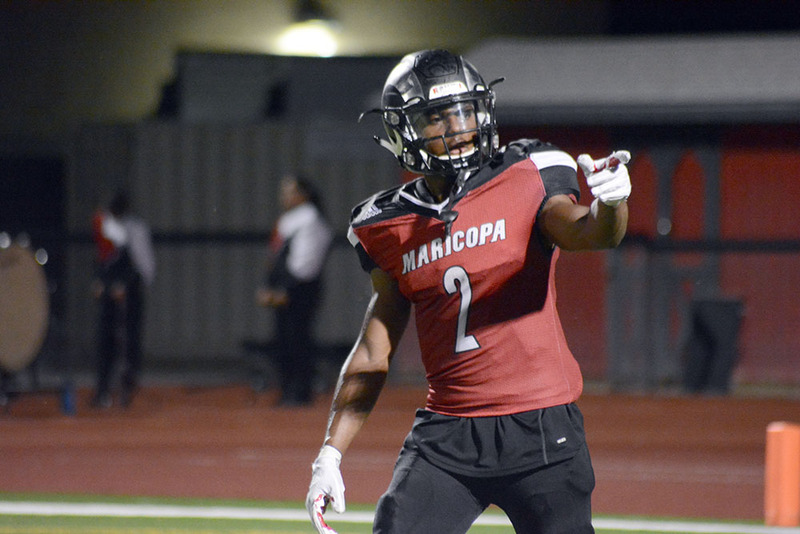 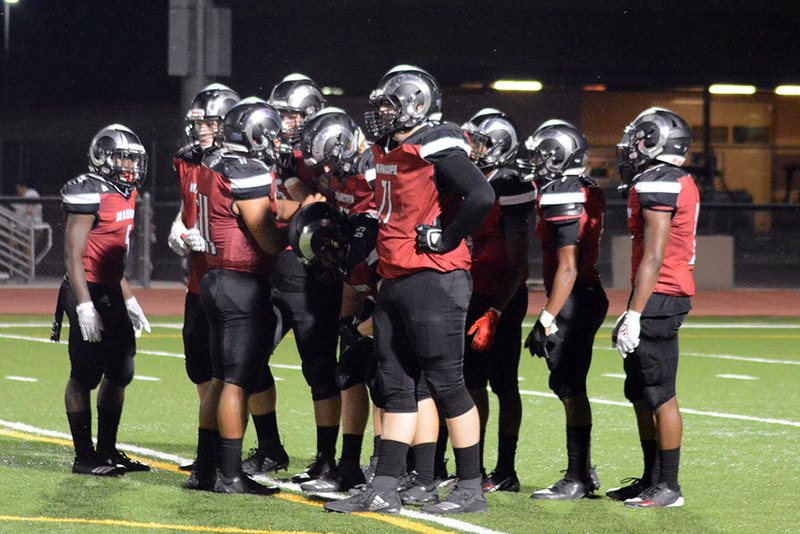 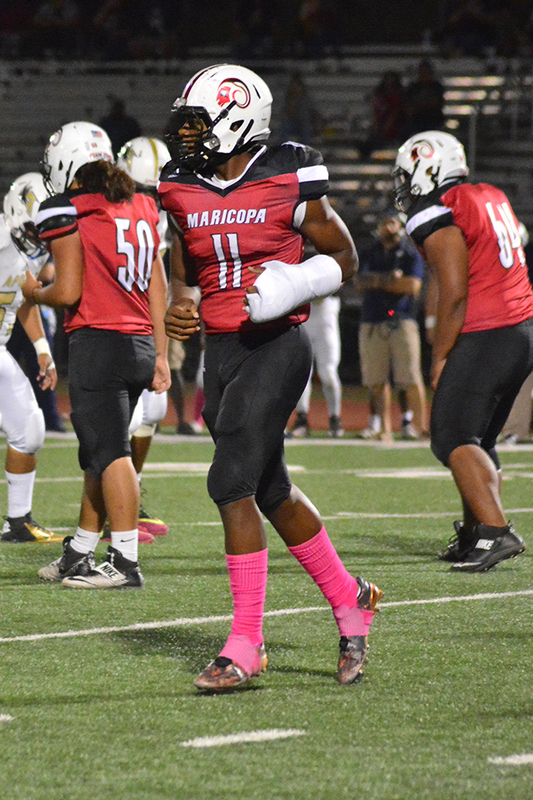 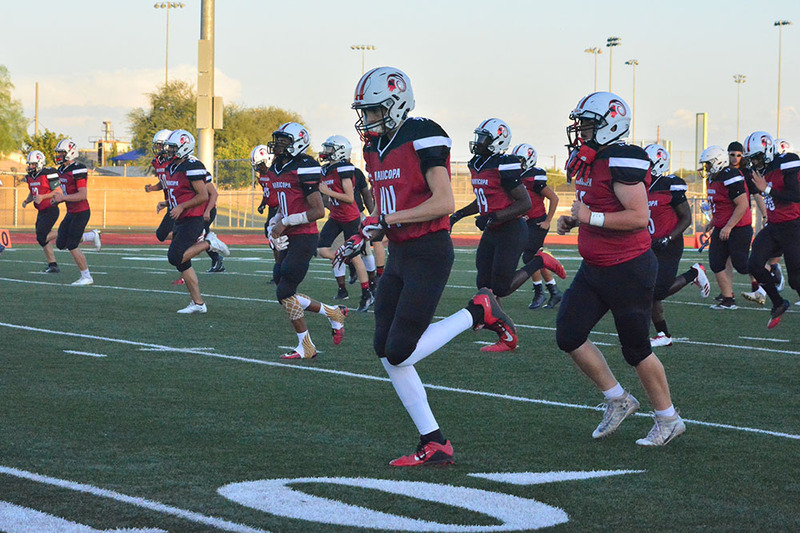 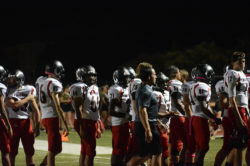 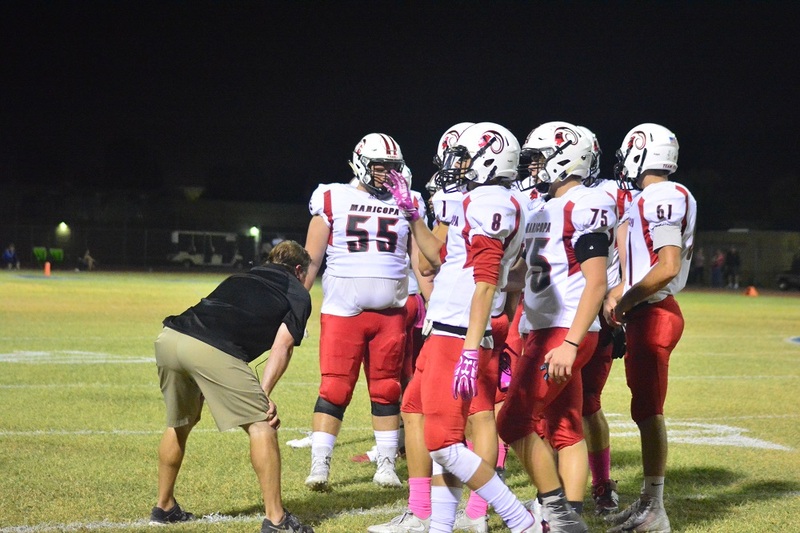 Ranking seventh in 5A this season, the Maricopa High School football team came off a bye week to a rough start against Metro rival Ironwood. 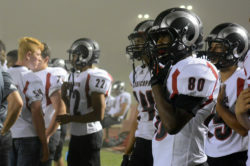 In the end, the Rams came away with the 26-15 “completely ugly win,” head coach Chris McDonald said. The team sputtered out of the chute, often losing yardage to unfortunate execution and penalties, with even a 36-yard touchdown pass called back by a flag. 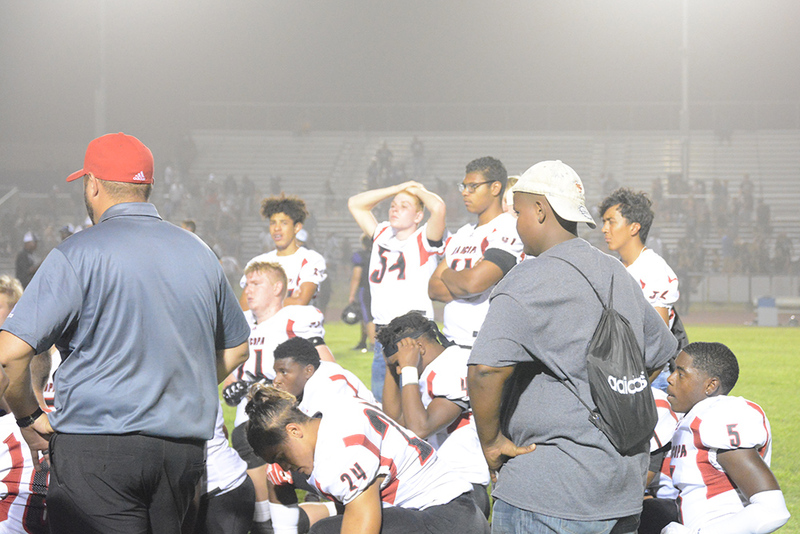 “From 2o to 20, we did a great job, and then we’d shoot ourselves in the foot with silly penalties near the goal line and took away 21 points,” McDonald said. 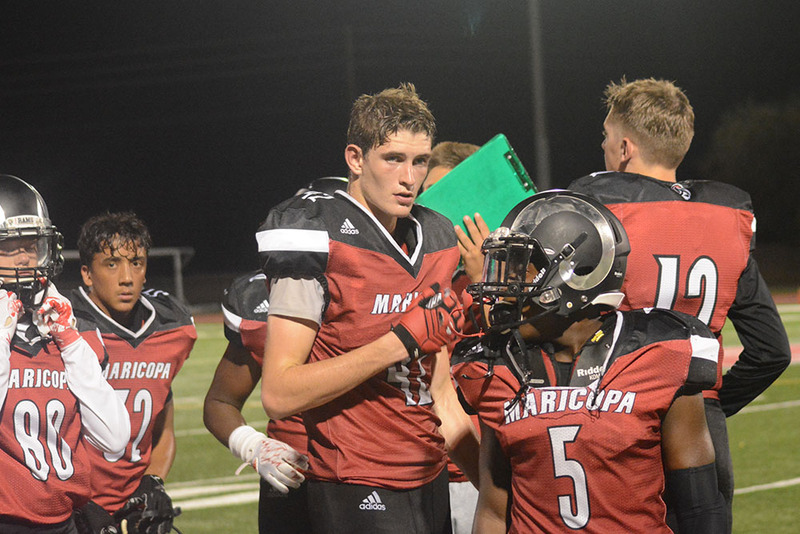 After junior Jacob Cowing took a pass from senior quarterback Alec Smith 62 yards for a touchdown, Maricopa went into halftime trailing 6-8. 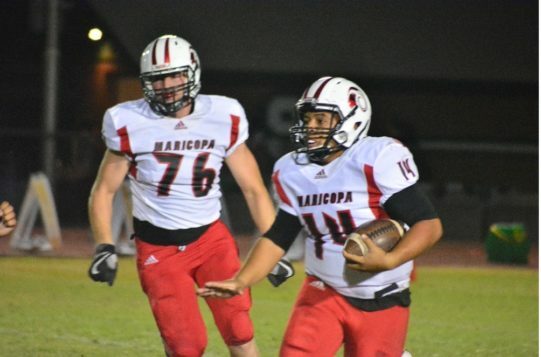 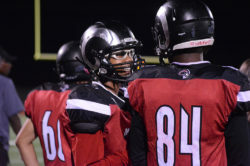 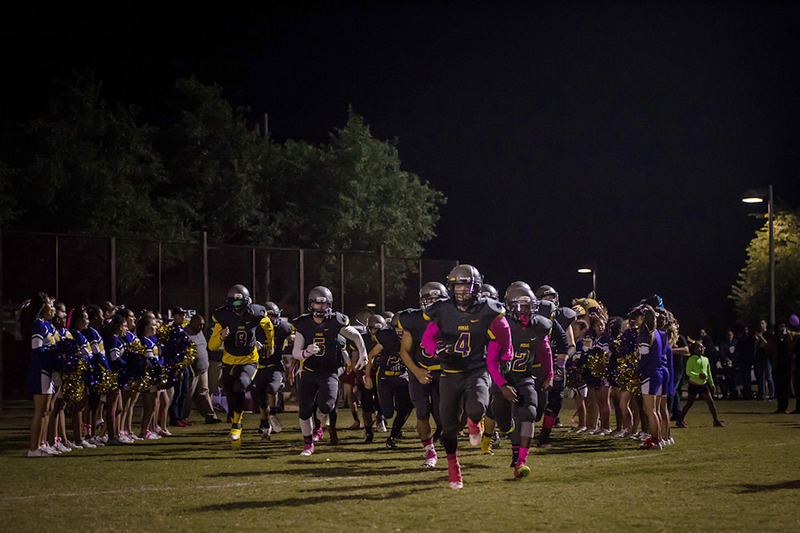 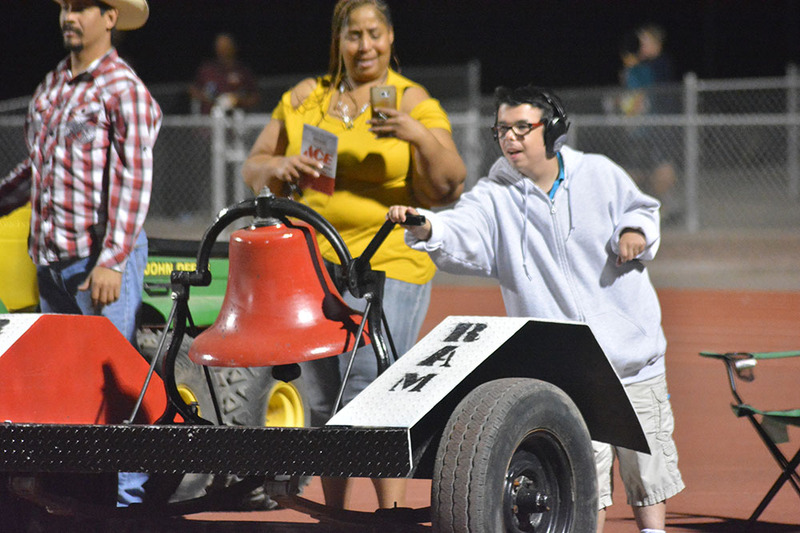 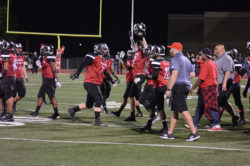 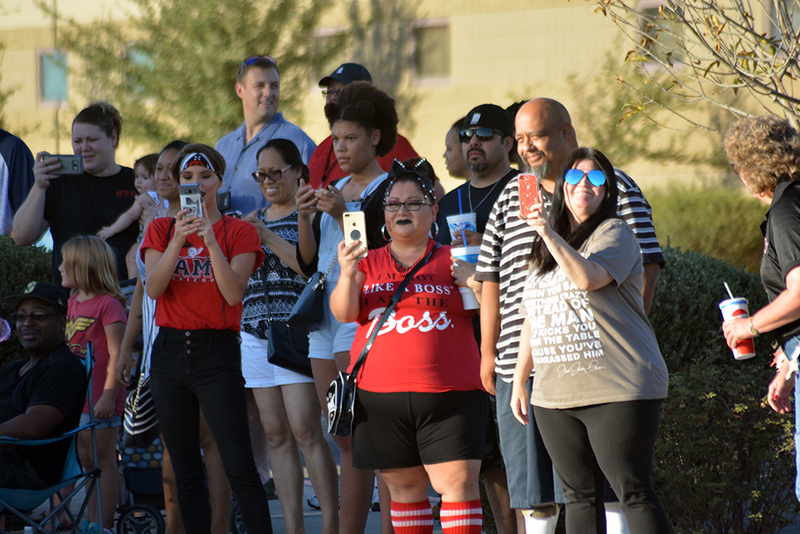 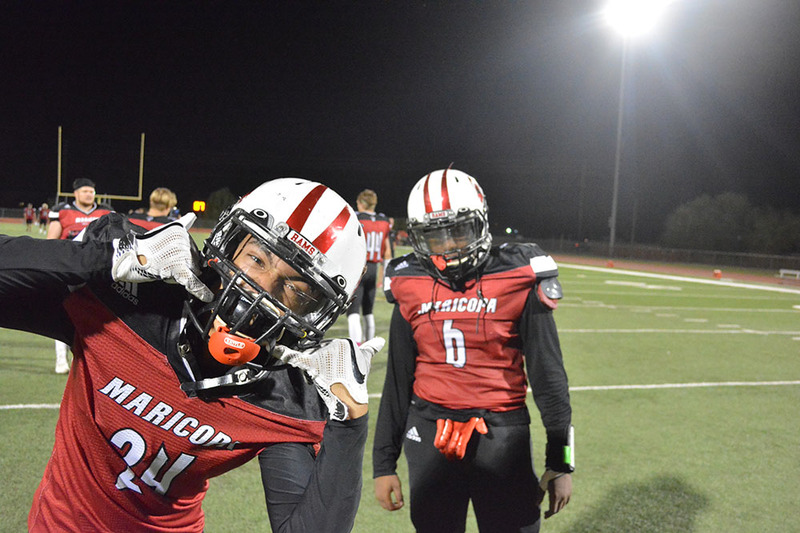 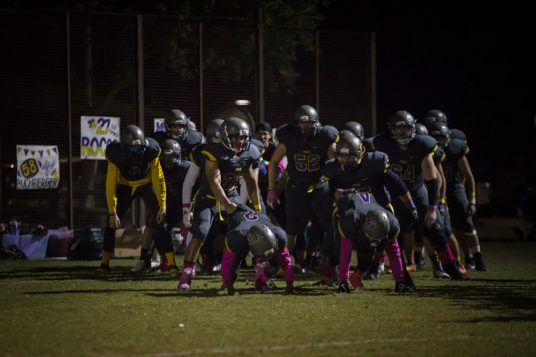 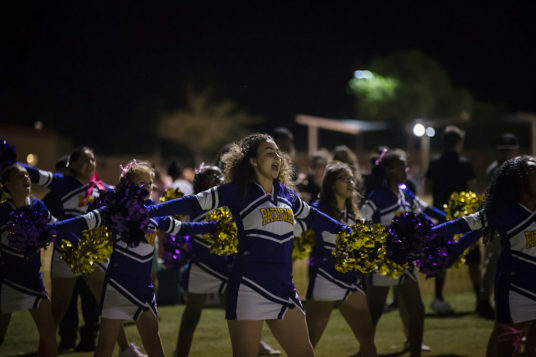 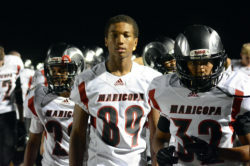 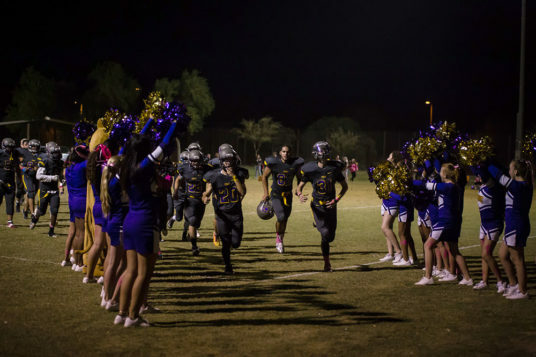 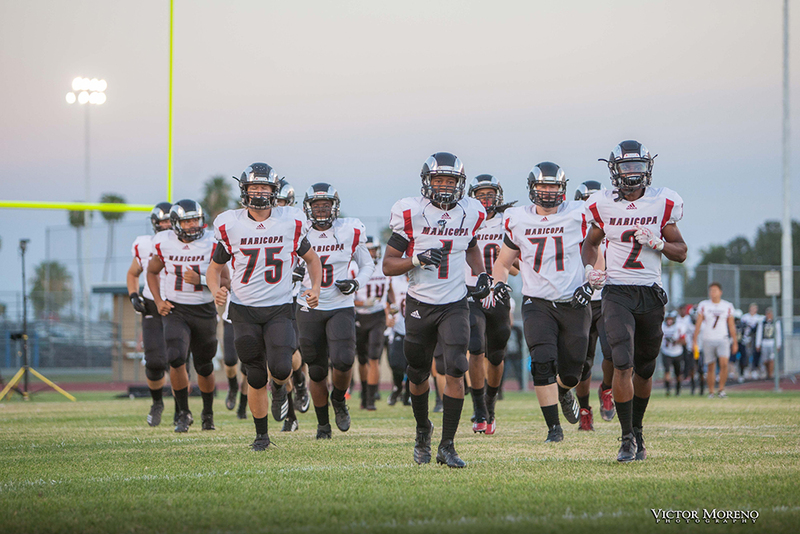 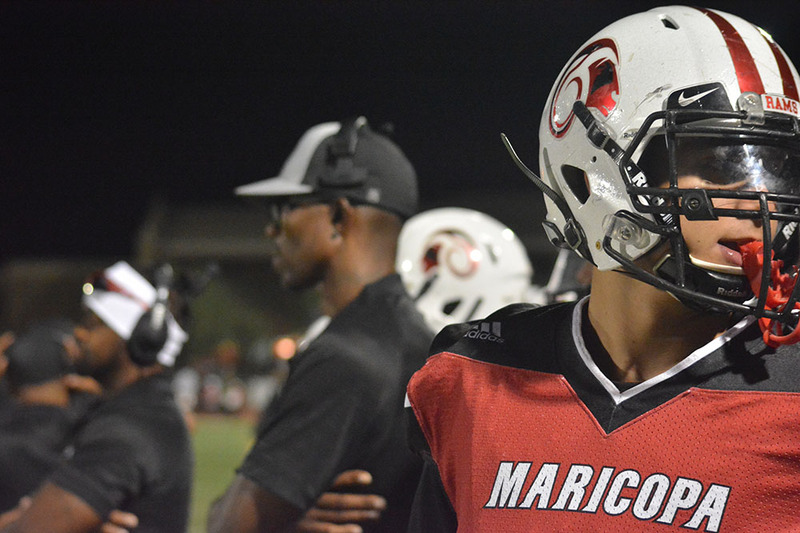 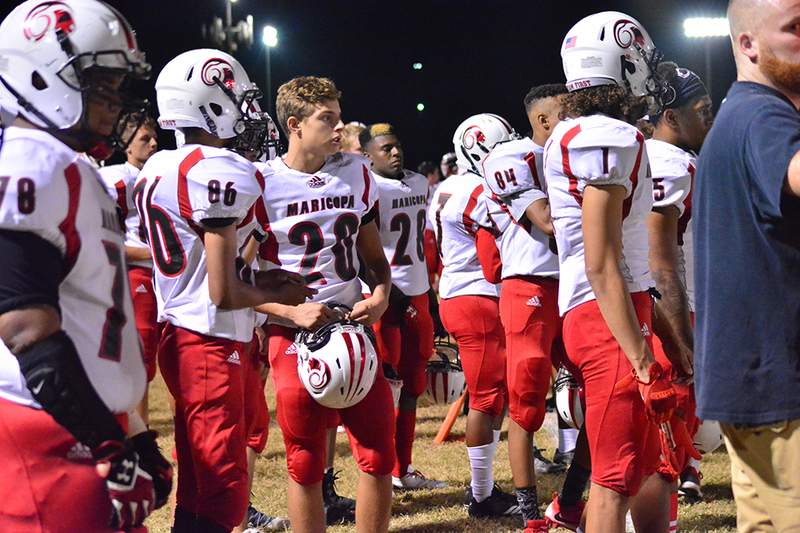 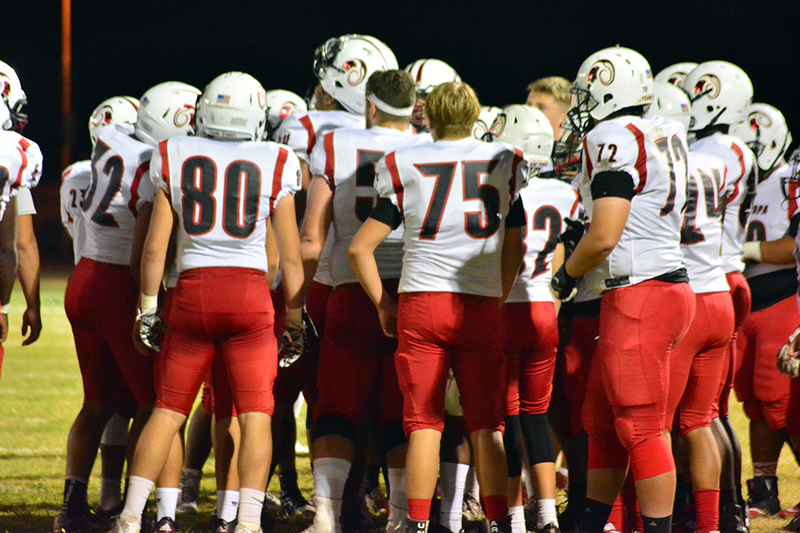 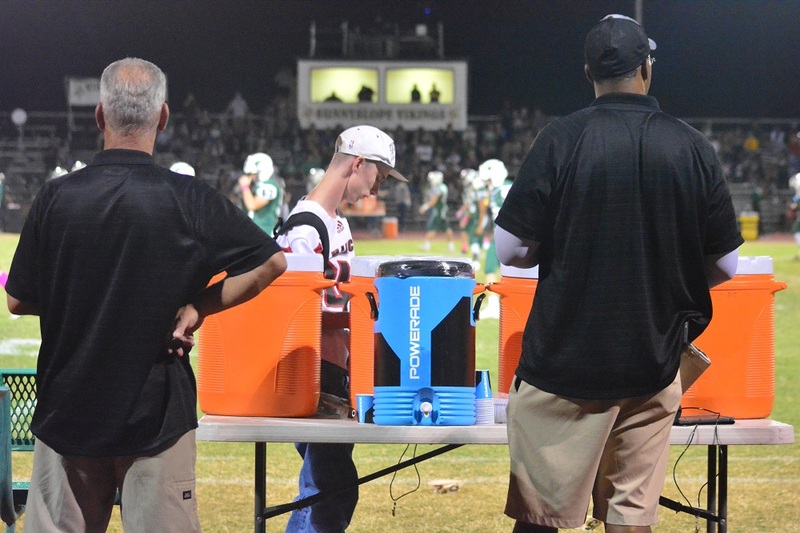 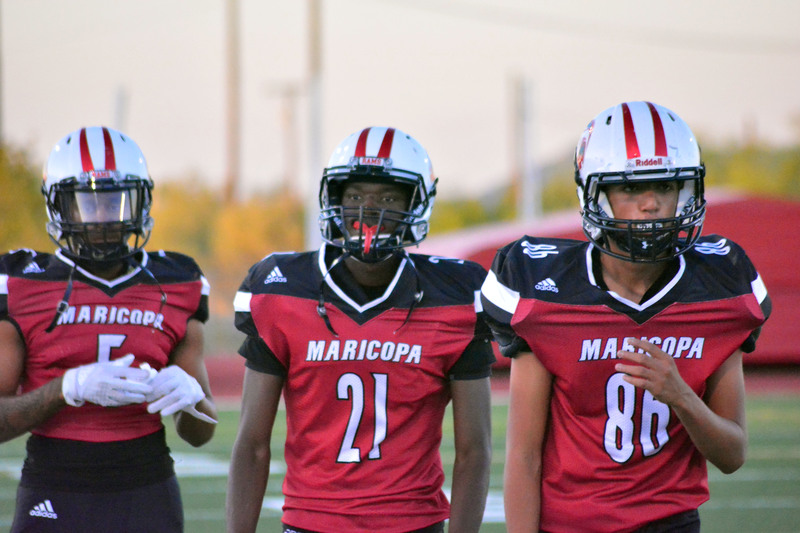 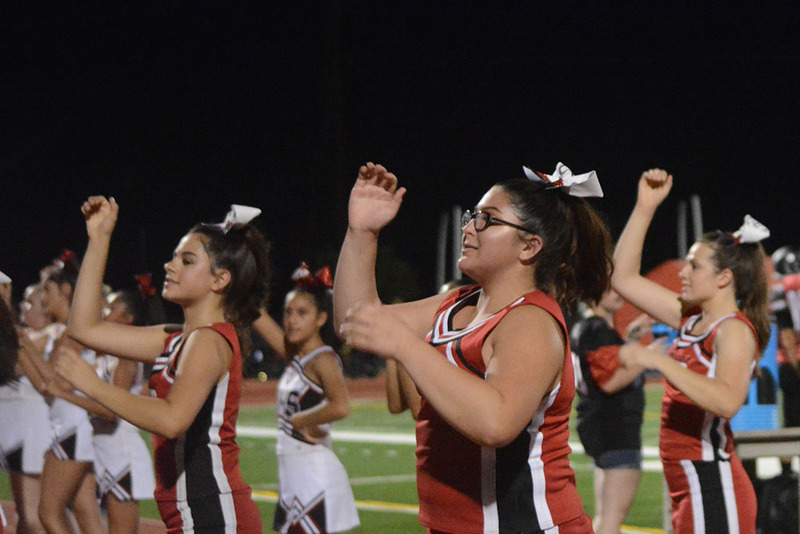 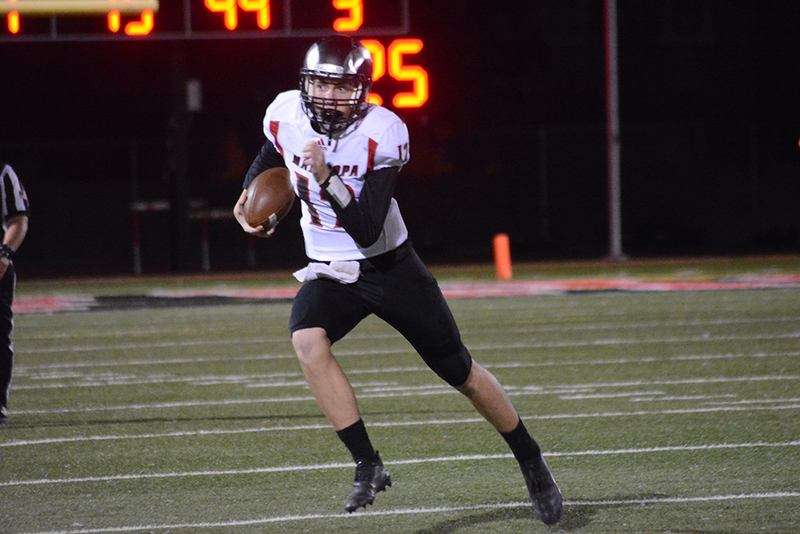 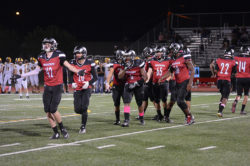 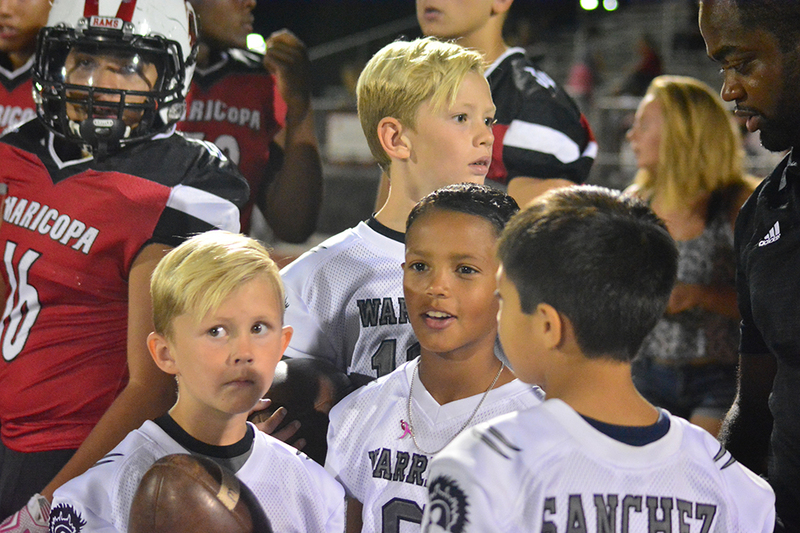 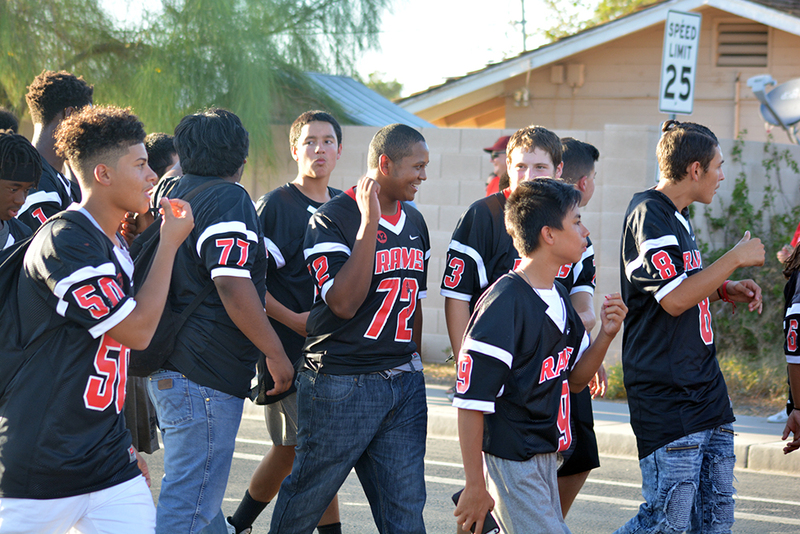 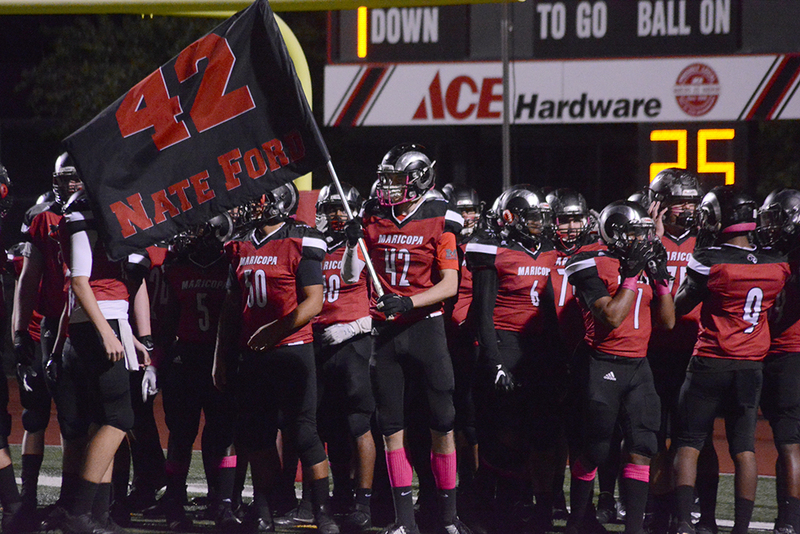 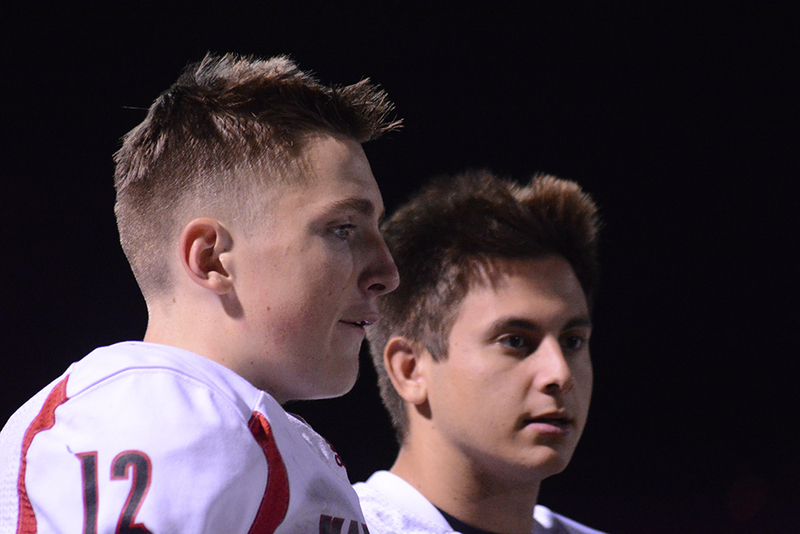 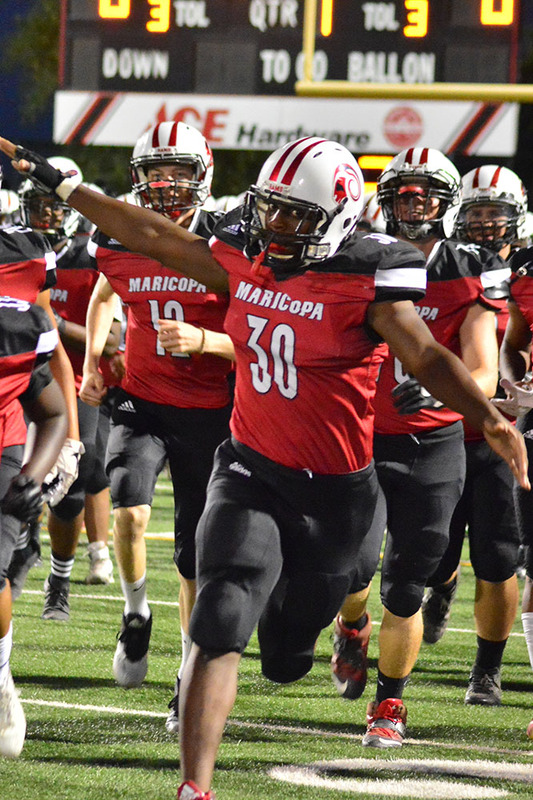 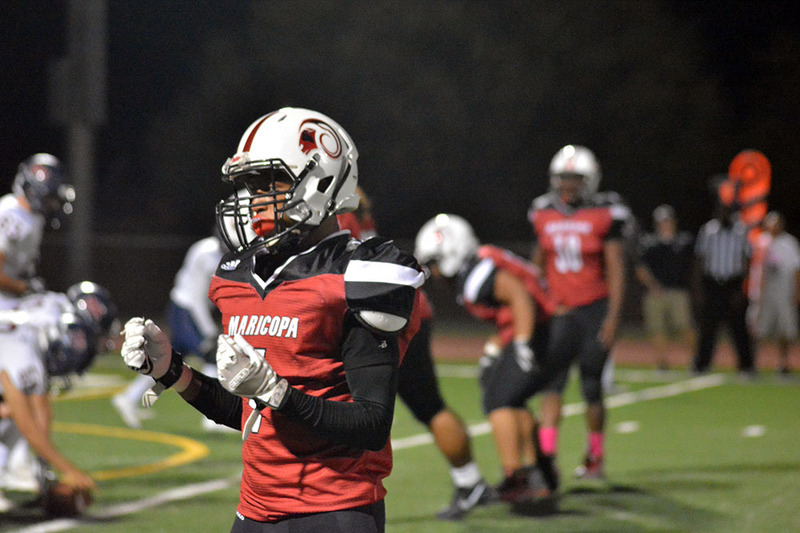 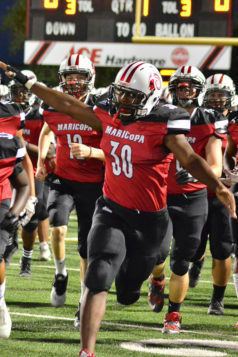 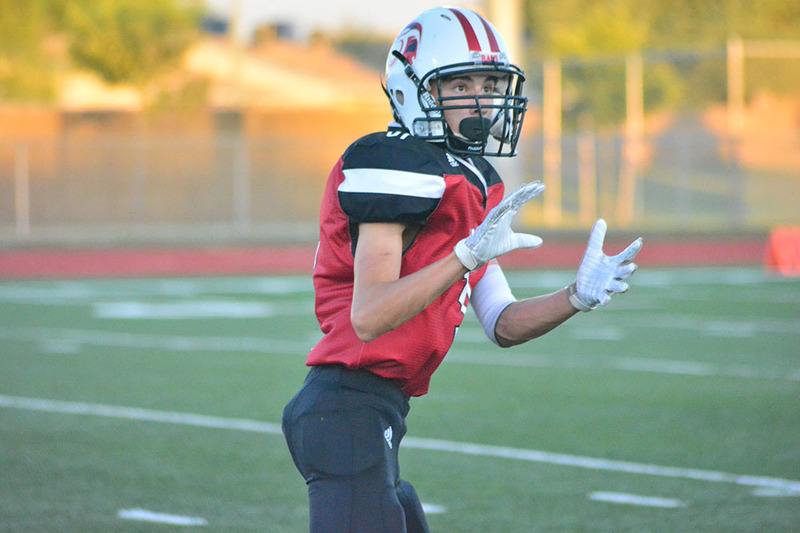 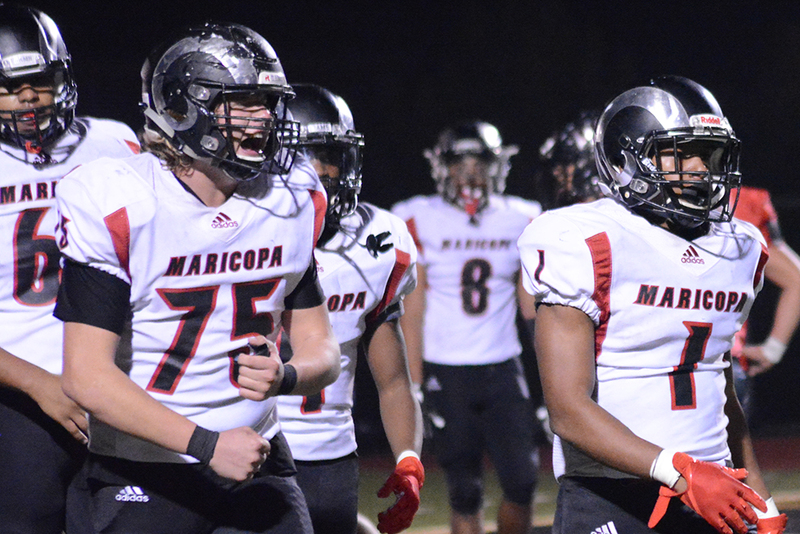 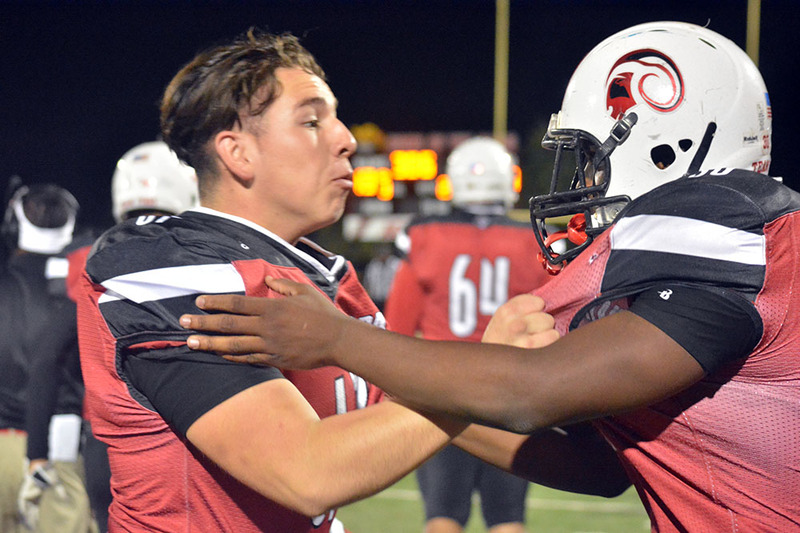 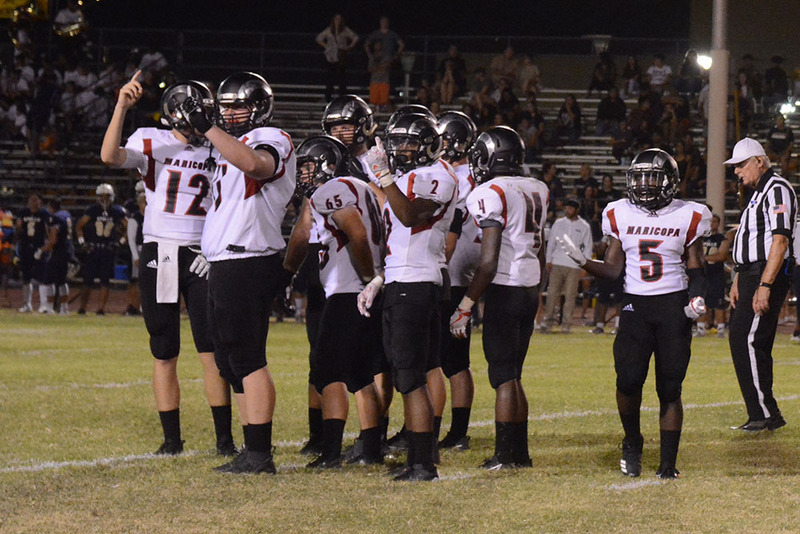 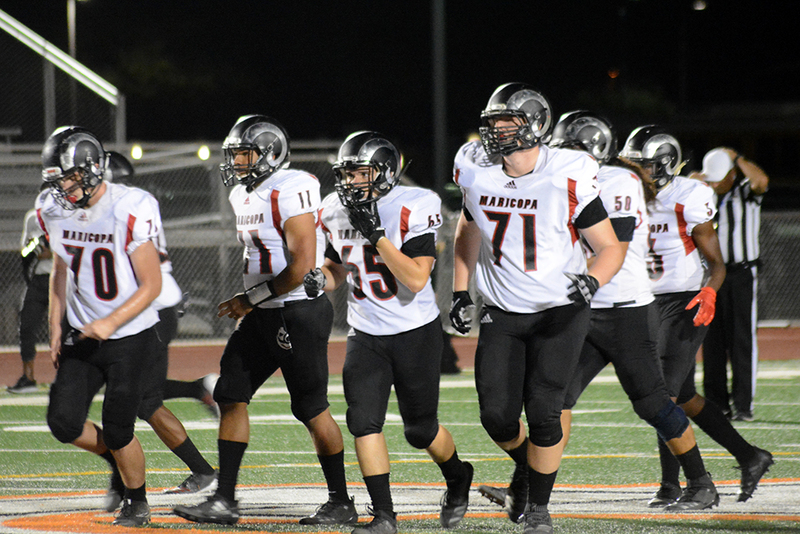 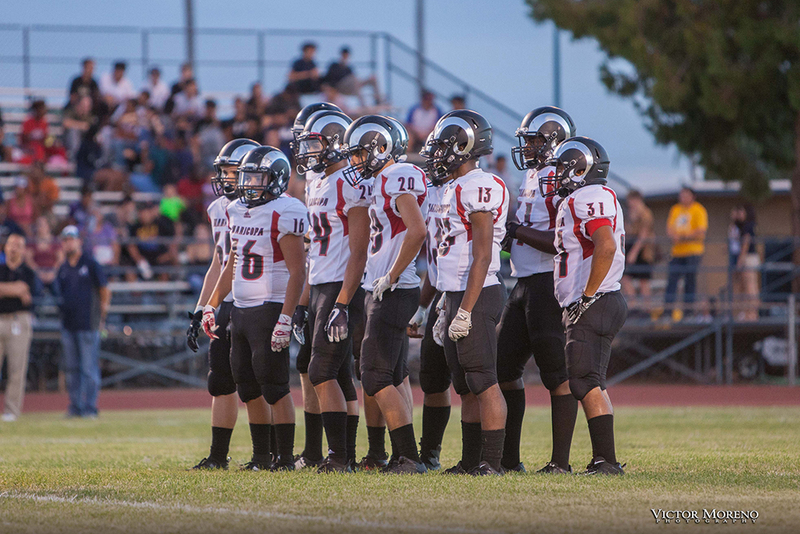 During the break, they rallied themselves to return to Maricopa’s brand of football. 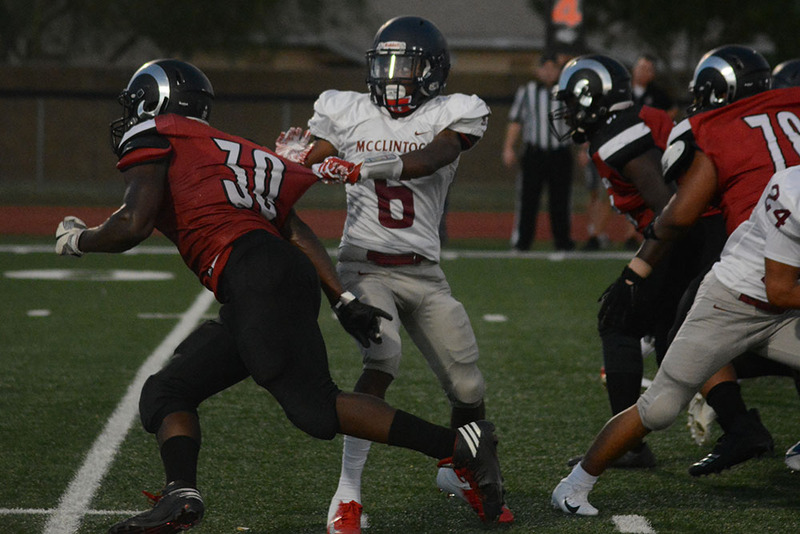 “We talked about how we need to relax and play our game,” McDonald said. The chat was effective. 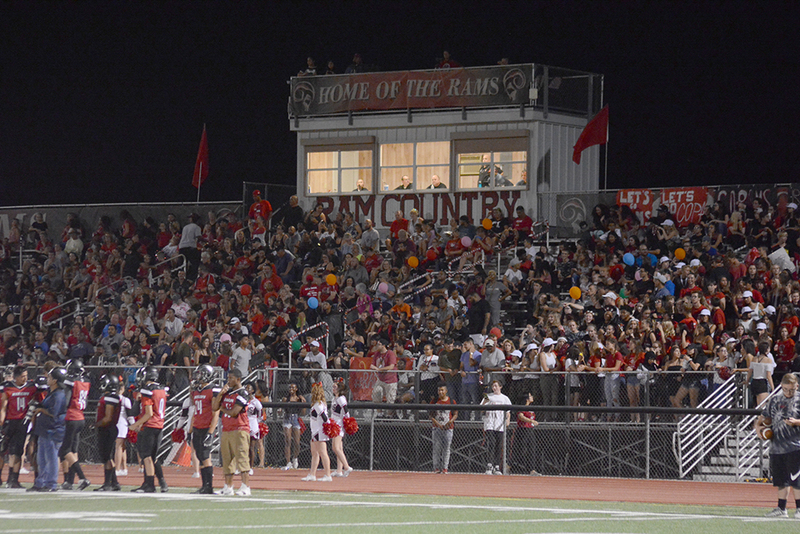 The Rams scored on their first possession of the third quarter. 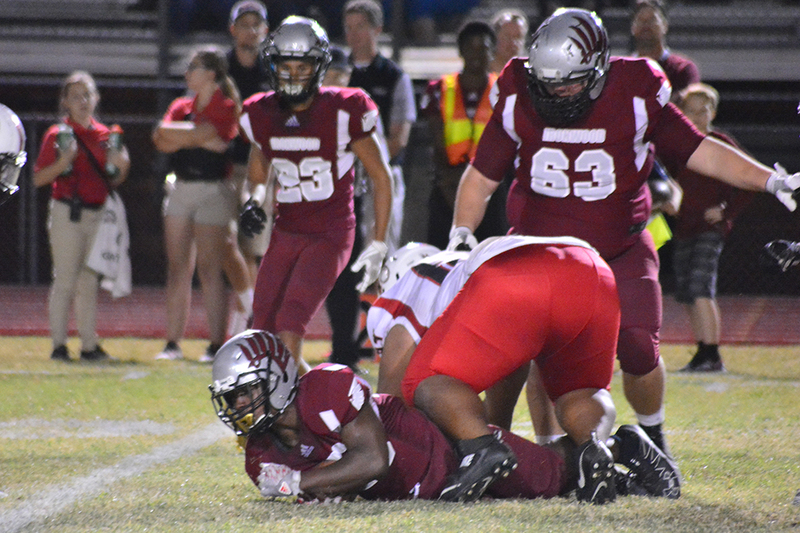 A drive that started on their 35 culminated in a seven-yard TD run by senior Kemo Akins and a successful point-after kick by Josh Mendes. 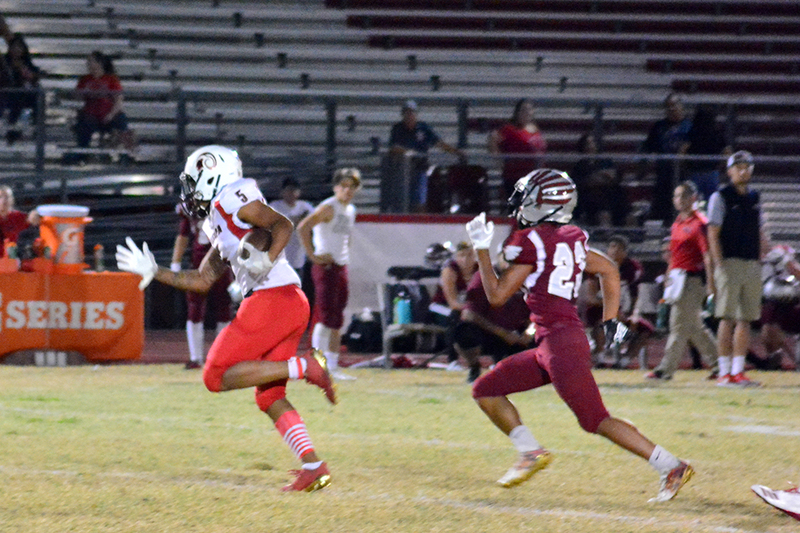 Immediately after, Ironwood fumbled the ball on its own 15, and Maricopa junior Tylen Coleman picked it up and scored. 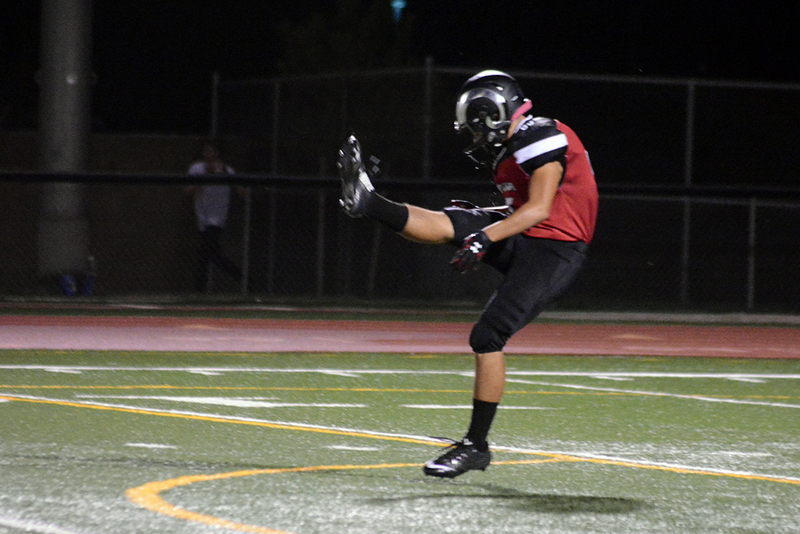 Mendes’ kick put the Rams up 20-8. 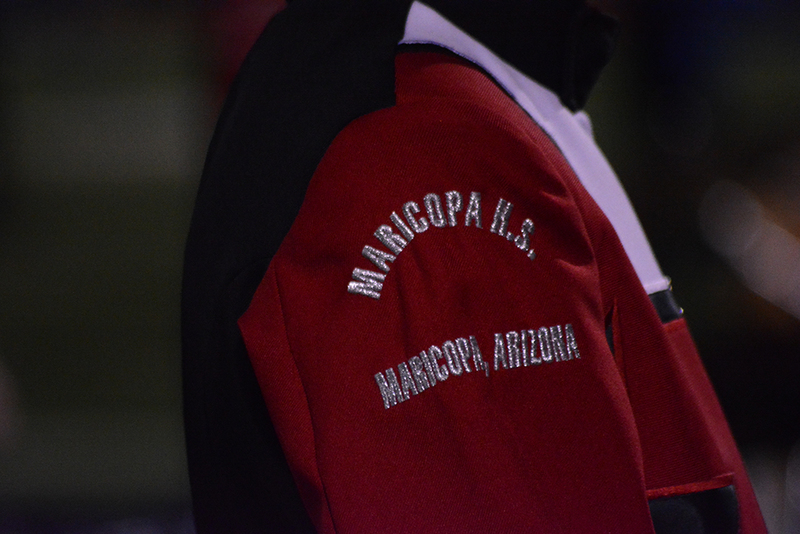 Ironwood was not finished, however. 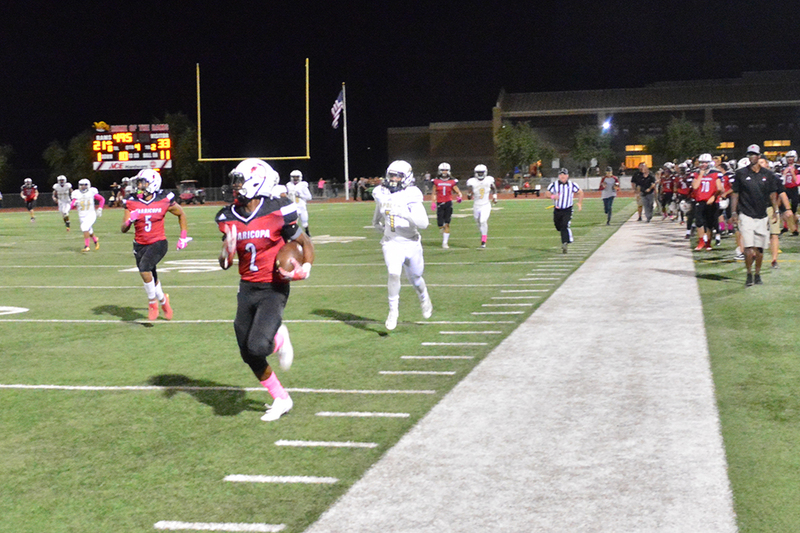 A 23-yard touchdown run put the Eagles just five points behind Maricopa with 4:11 left in the third. 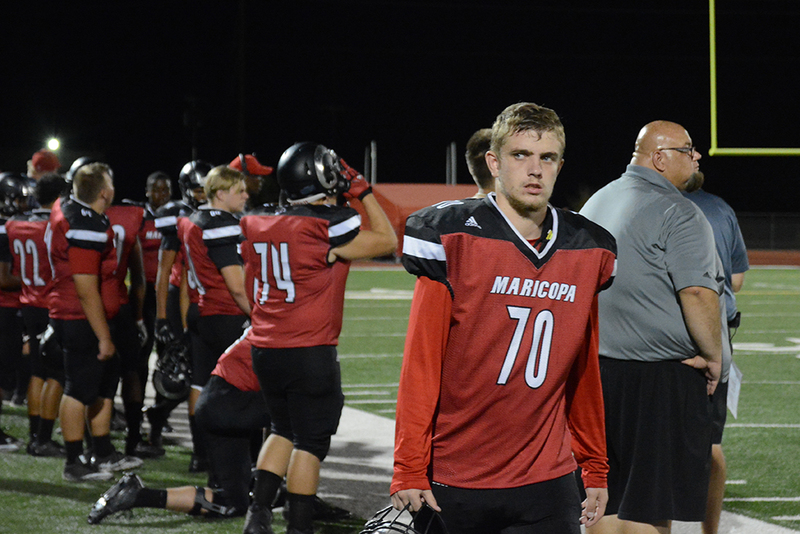 But the Maricopa defense shut down the Eagles the rest of the night. Akins put the game away for the Rams in the fourth quarter on a 39-yard run up the left sideline. He was shoved across the corner of the end zone for the final touchdown. 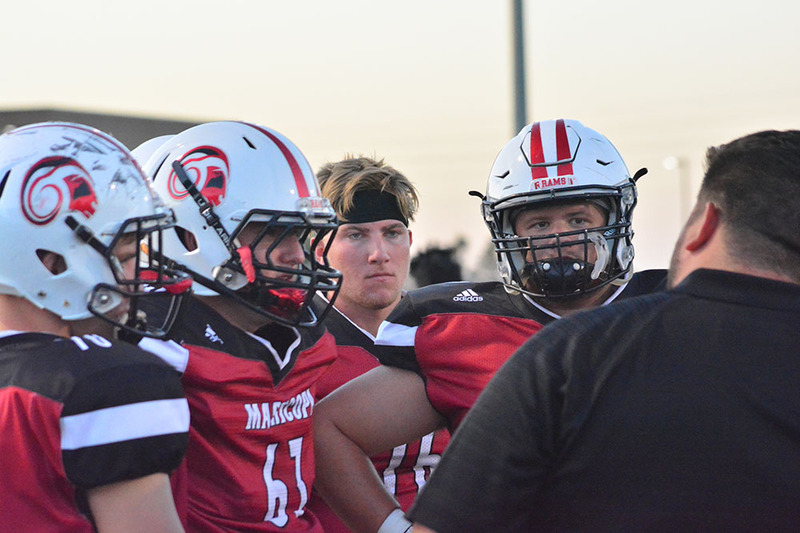 “It’s nice that we’re in a position now as a program where we can still win not putting our best foot forward at times,” McDonald said. 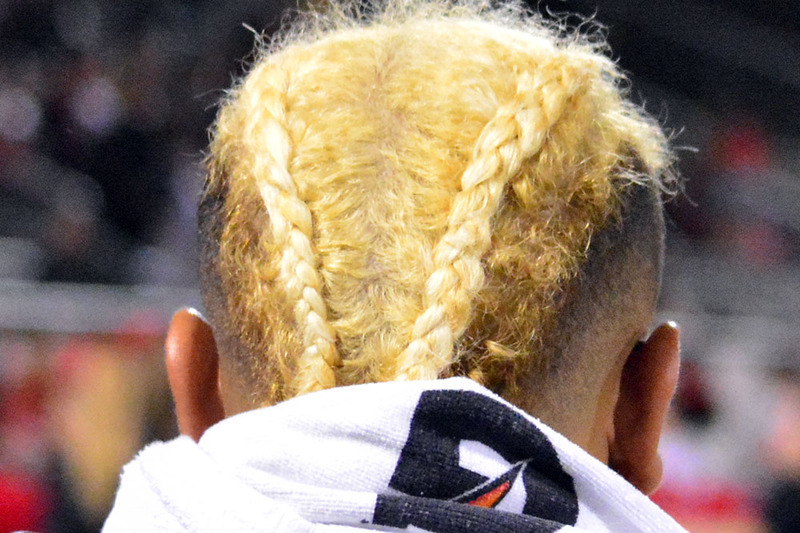 Both teams had injuries, with the Rams losing junior Jimmy Cutajar for the game. He was taken to a hospital for treatment, but the coach said he sounded upbeat. 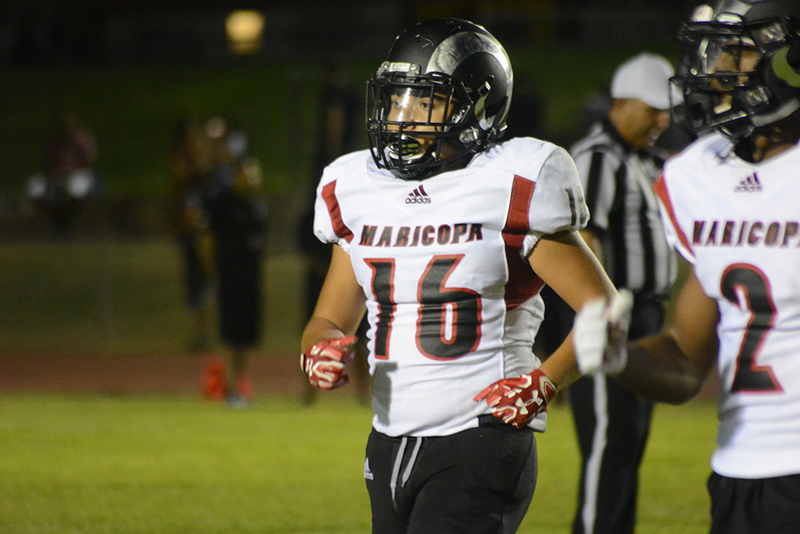 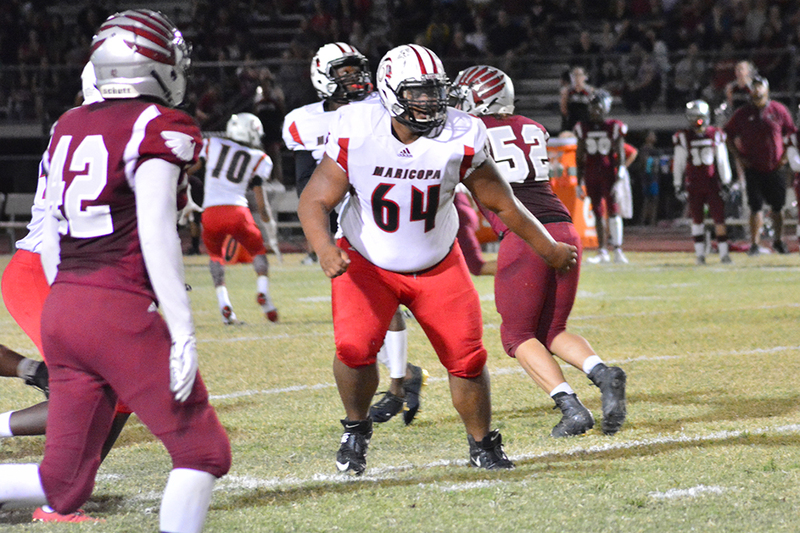 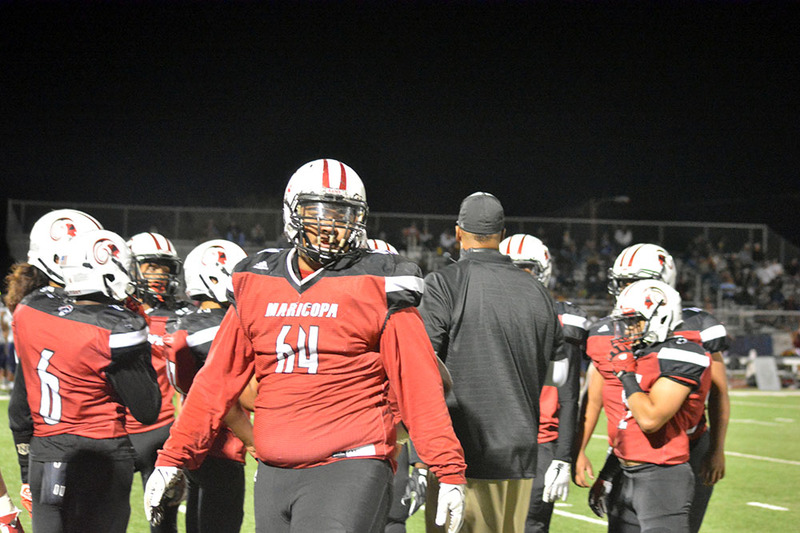 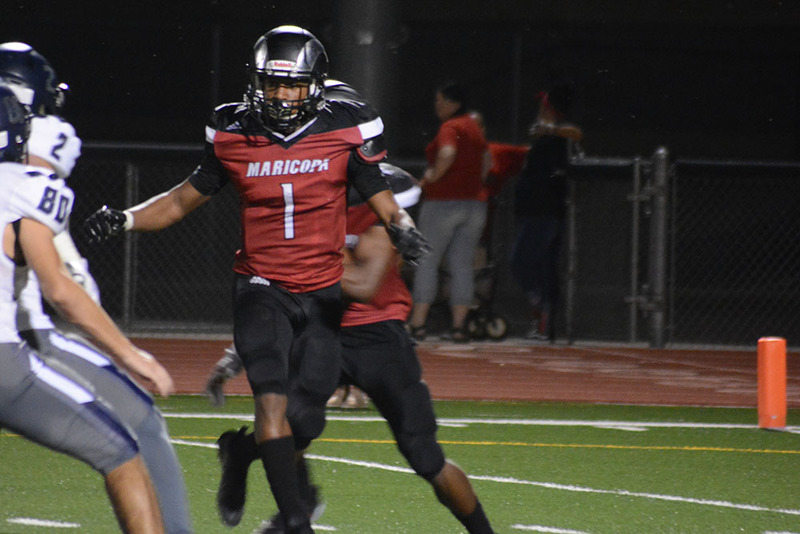 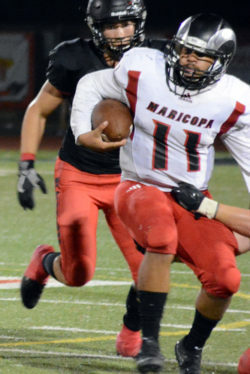 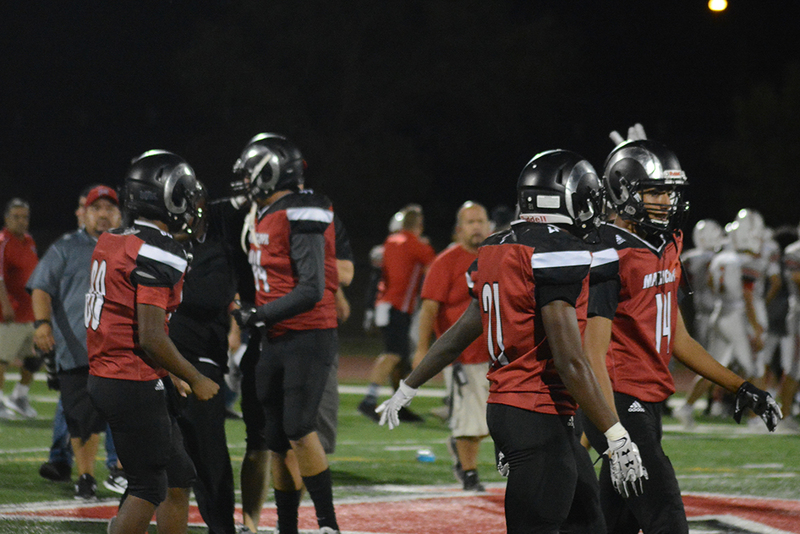 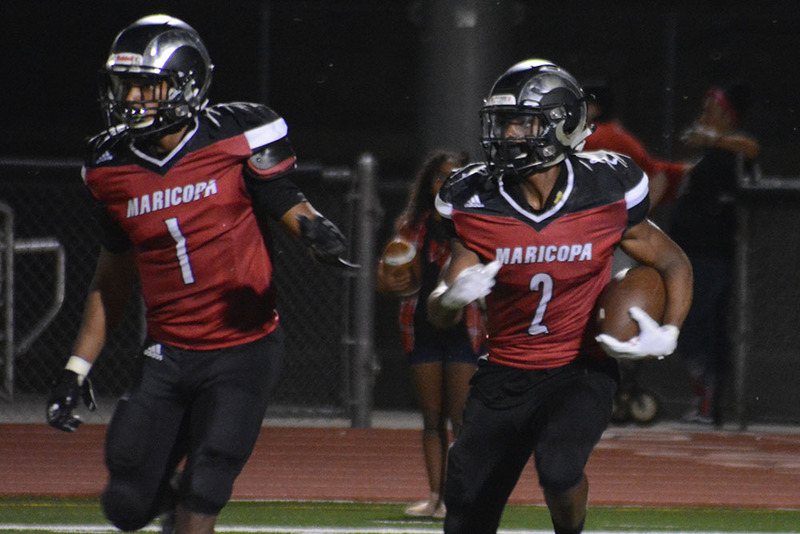 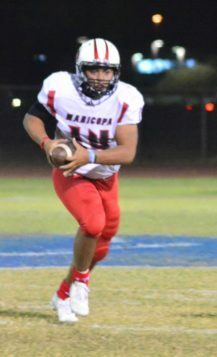 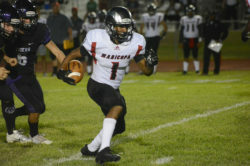 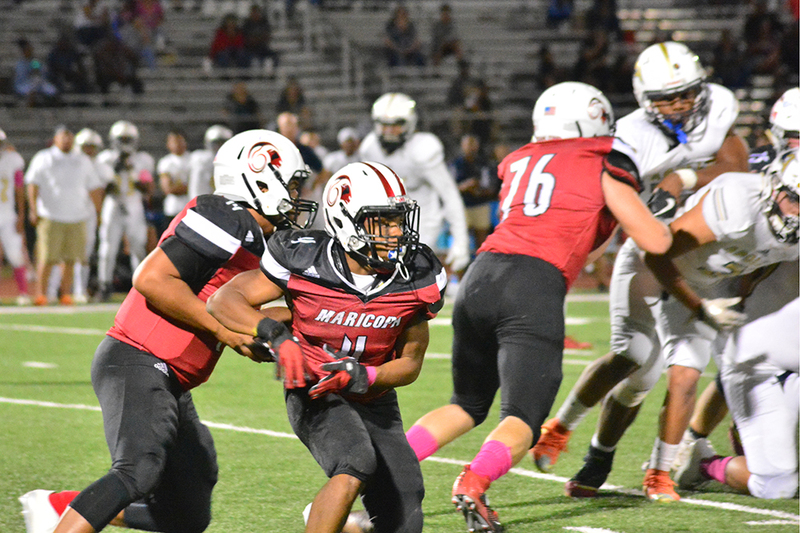 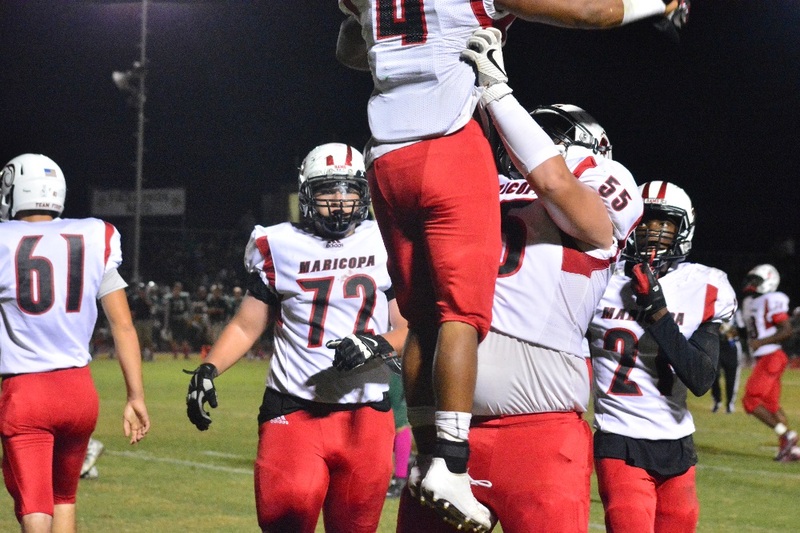 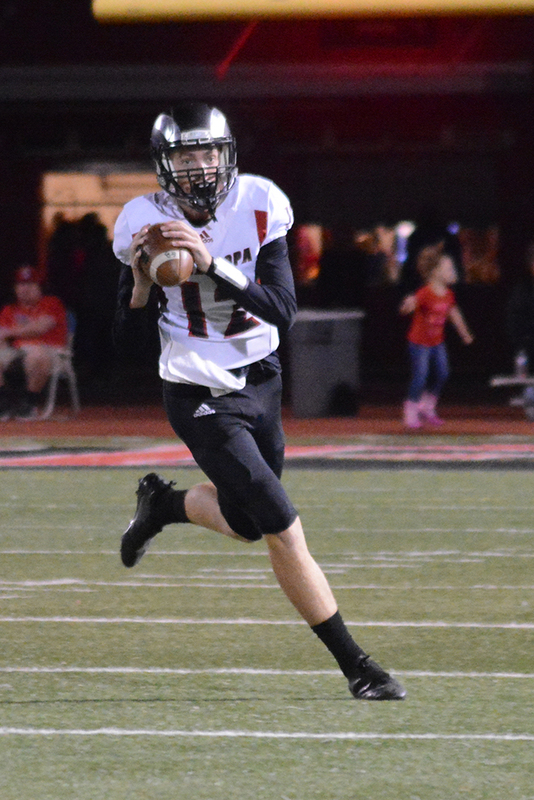 The win put Maricopa’s record at 5-1 (1-0). 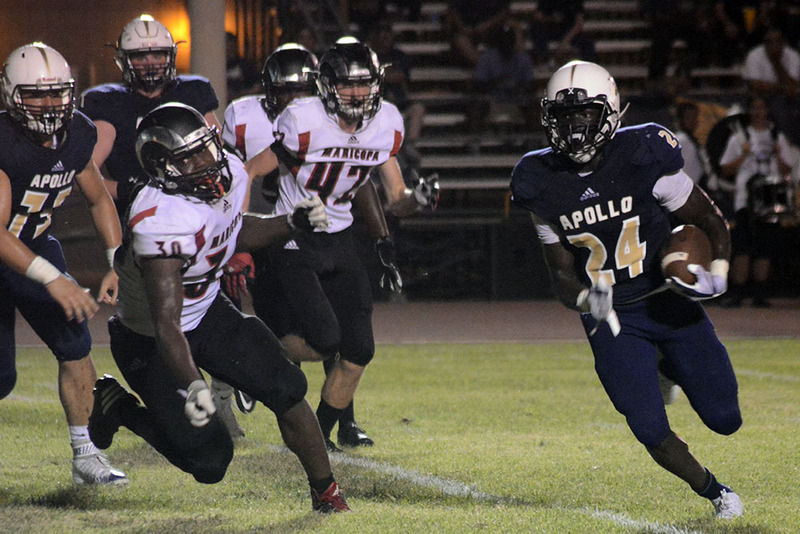 Ranked right behind them in 5A is Apollo, which is 4-1 going into tonight’s game. 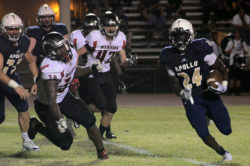 The Rams play Apollo next Friday. 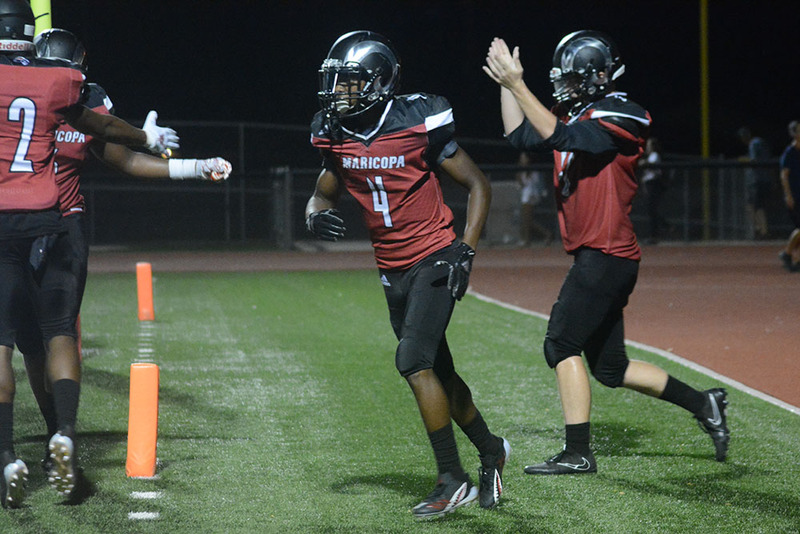 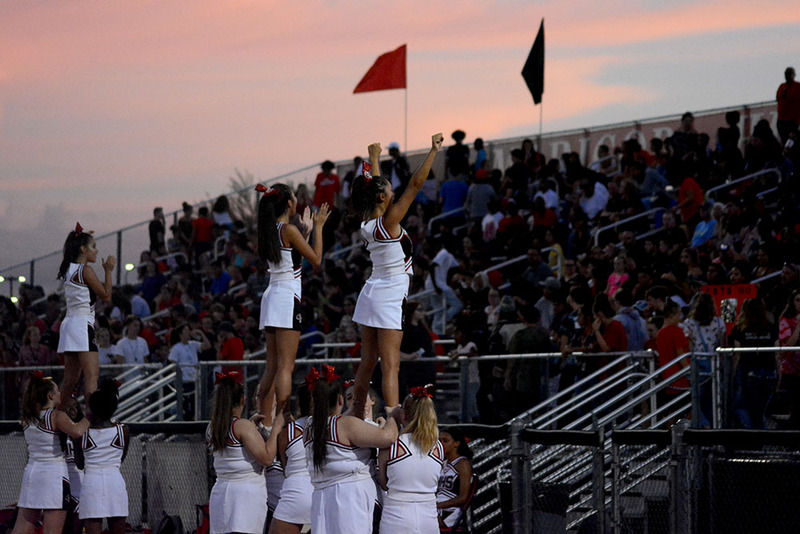 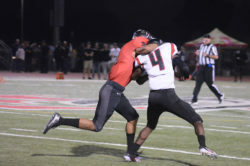 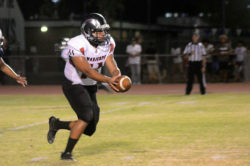 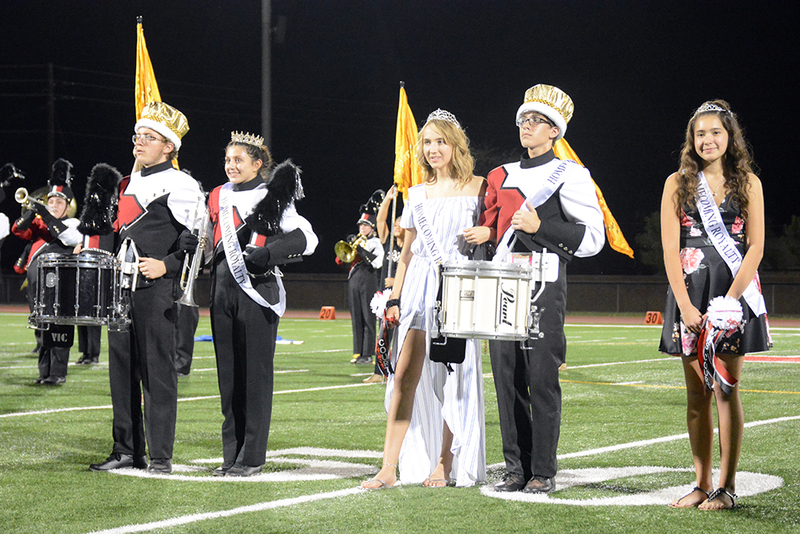 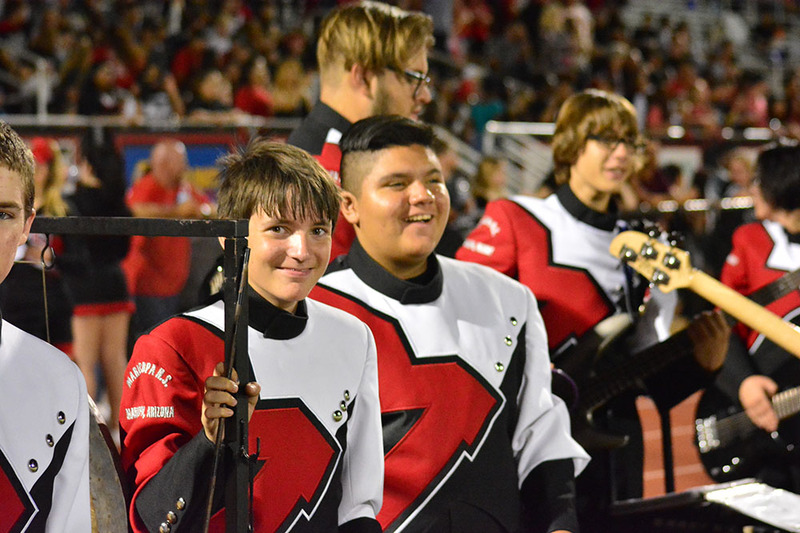 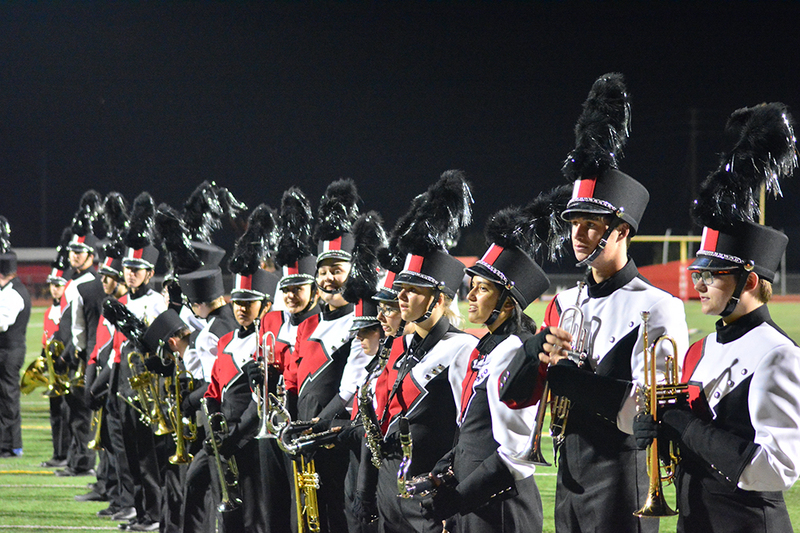 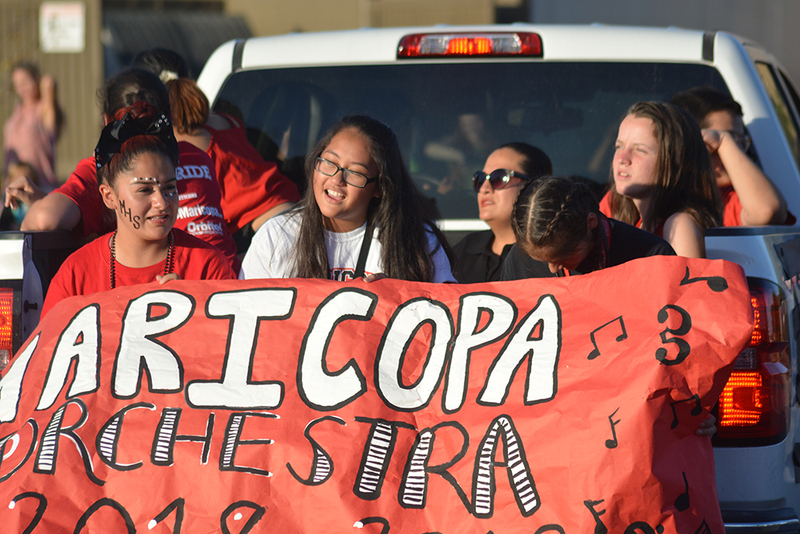 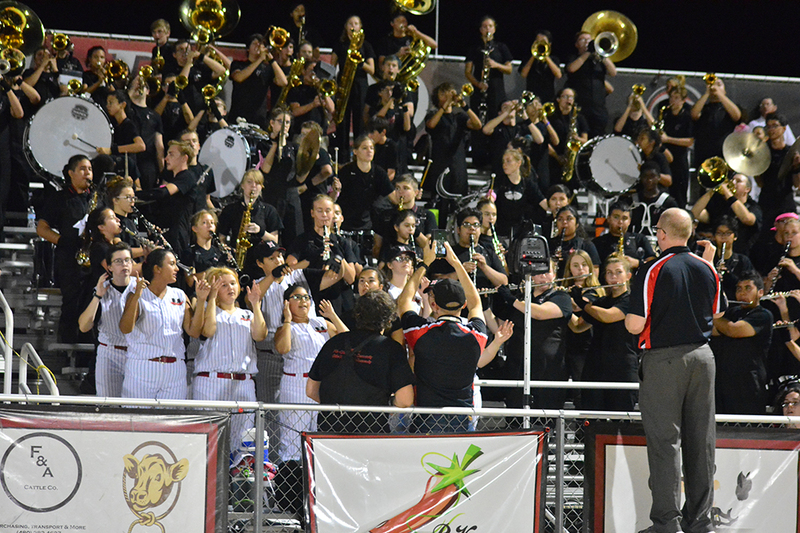 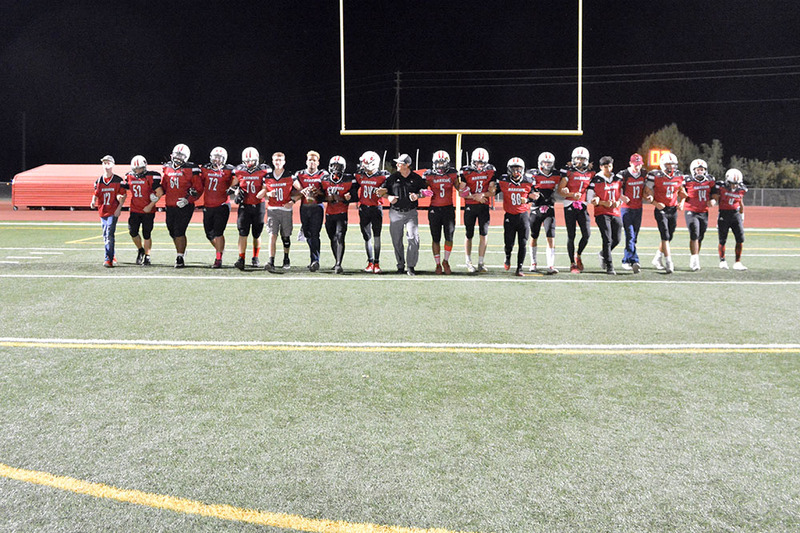 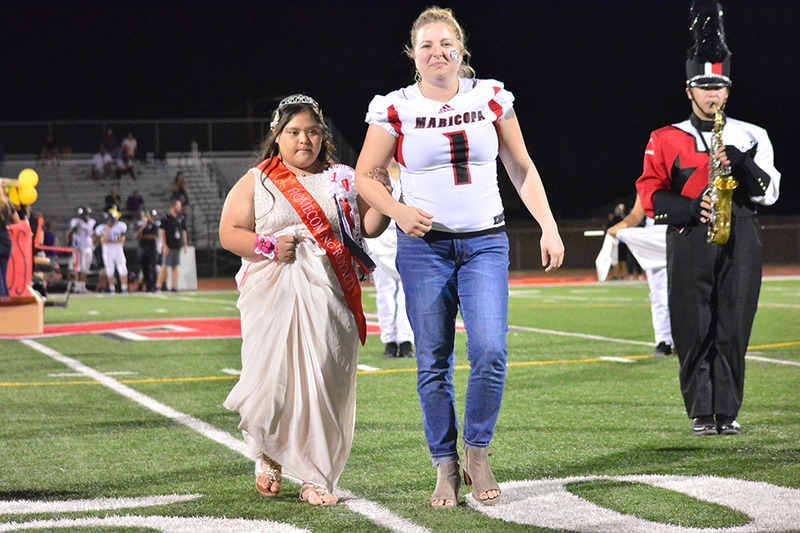 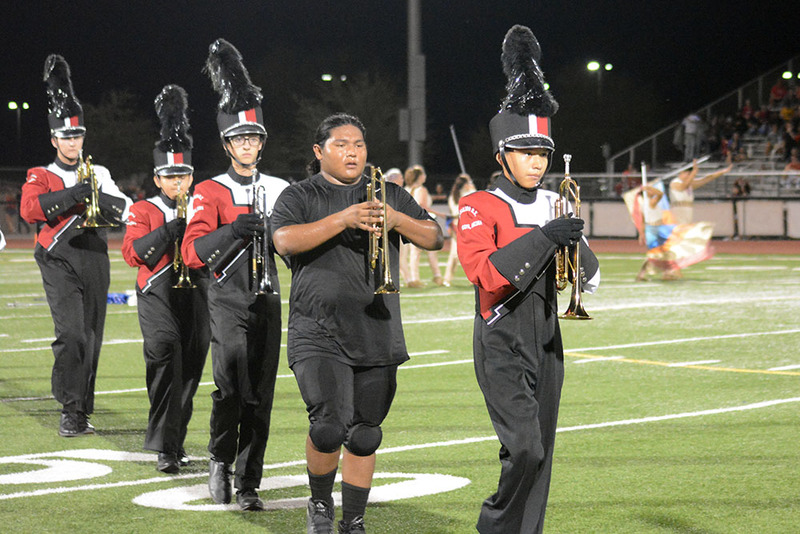 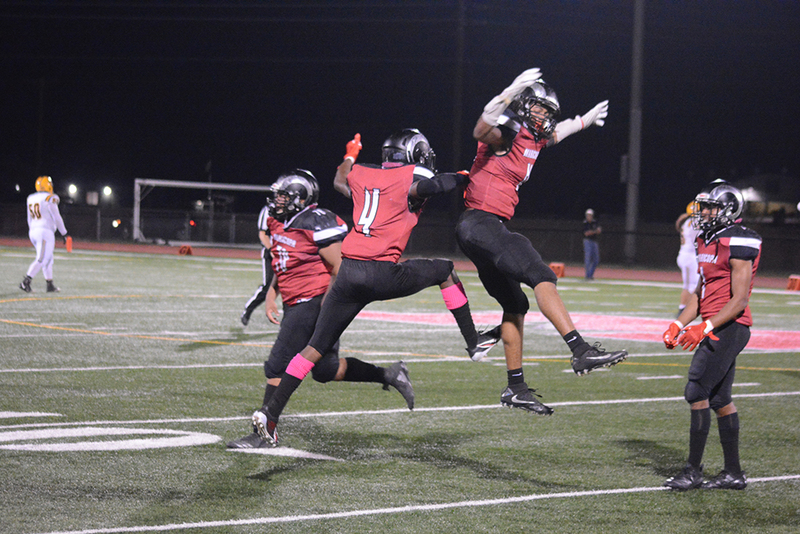 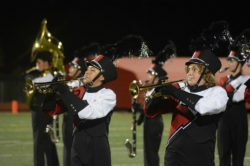 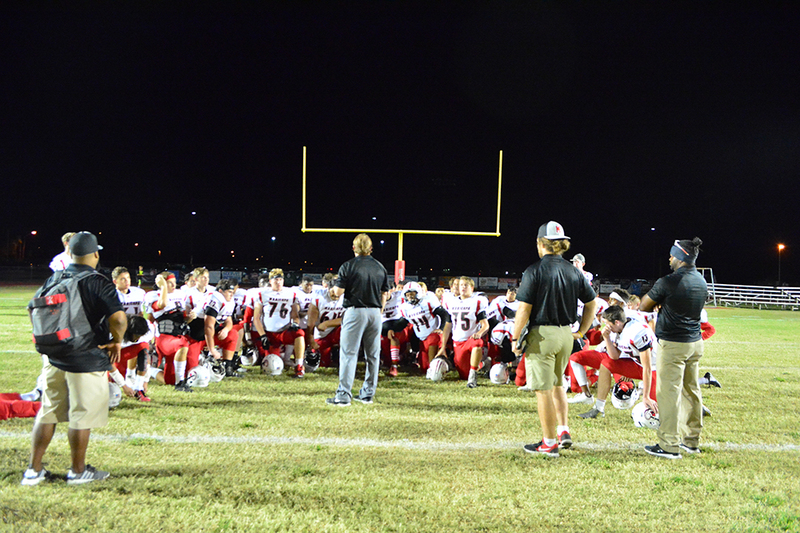 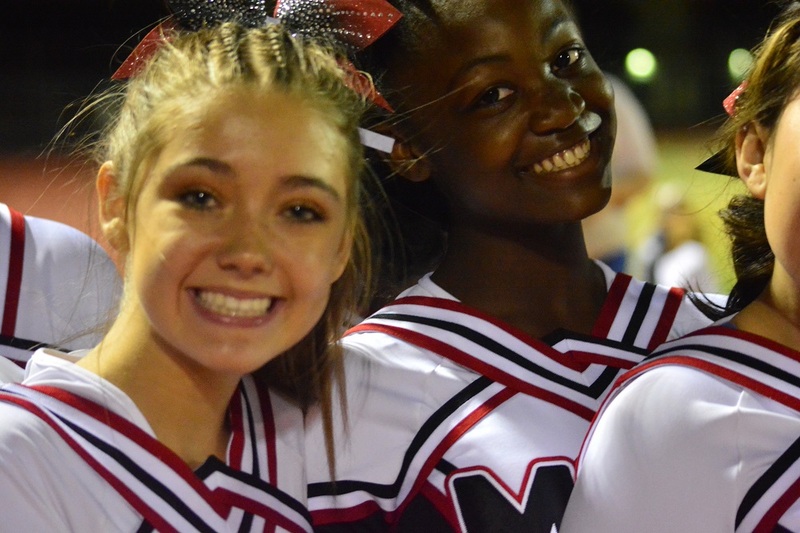 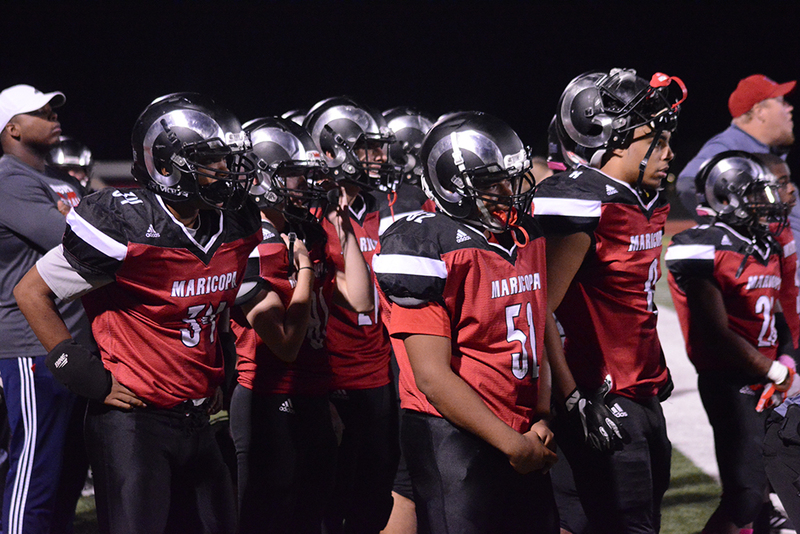 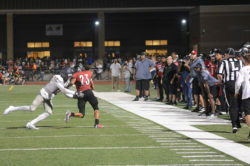 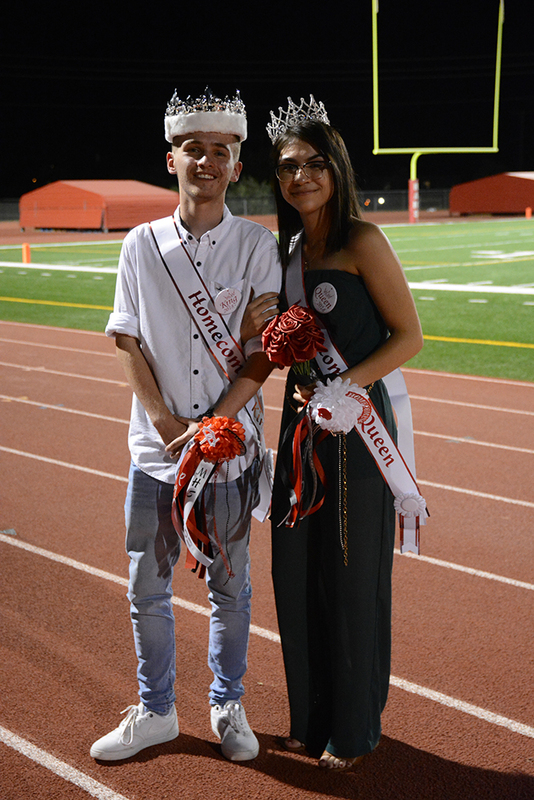 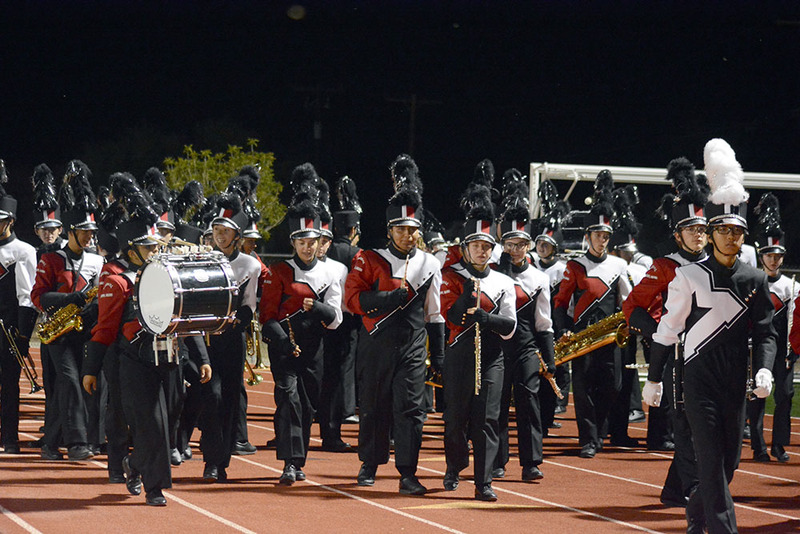 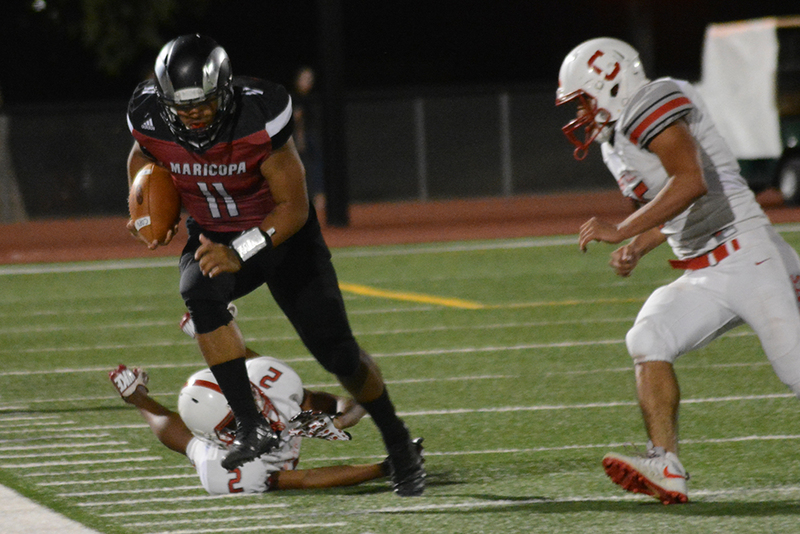 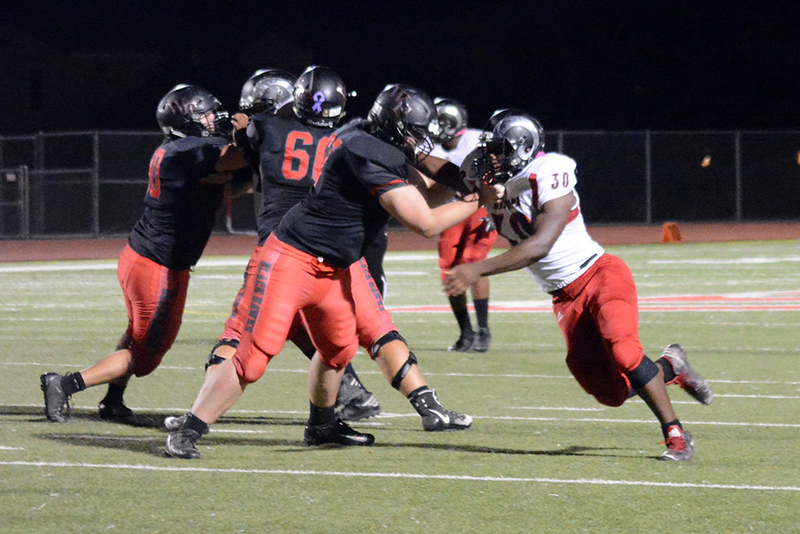 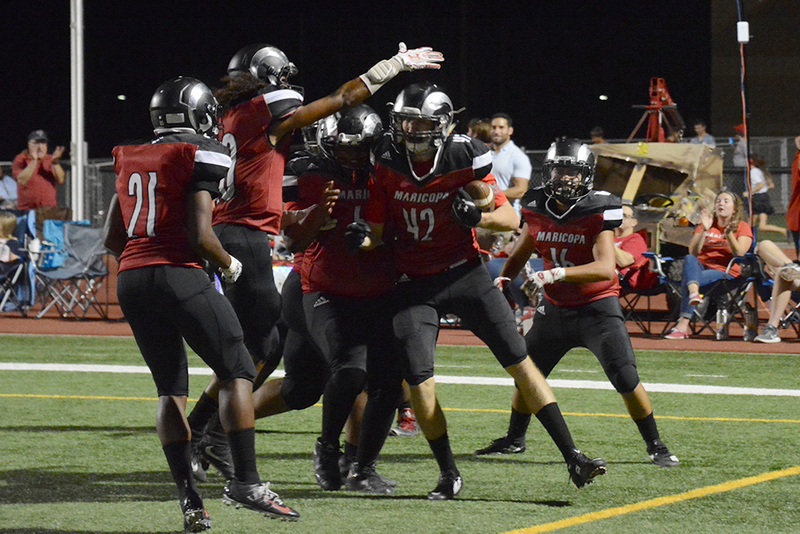 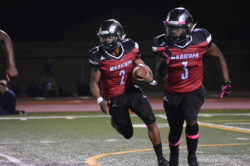 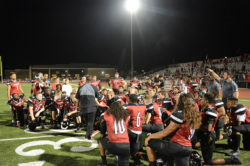 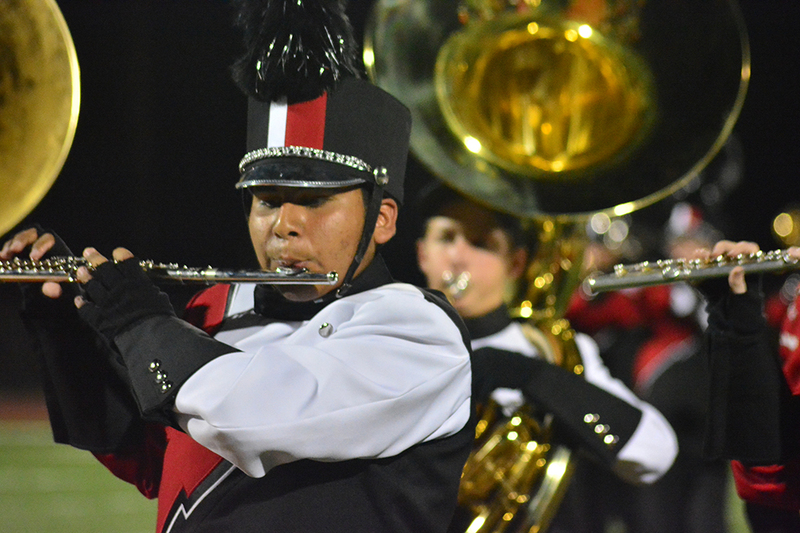 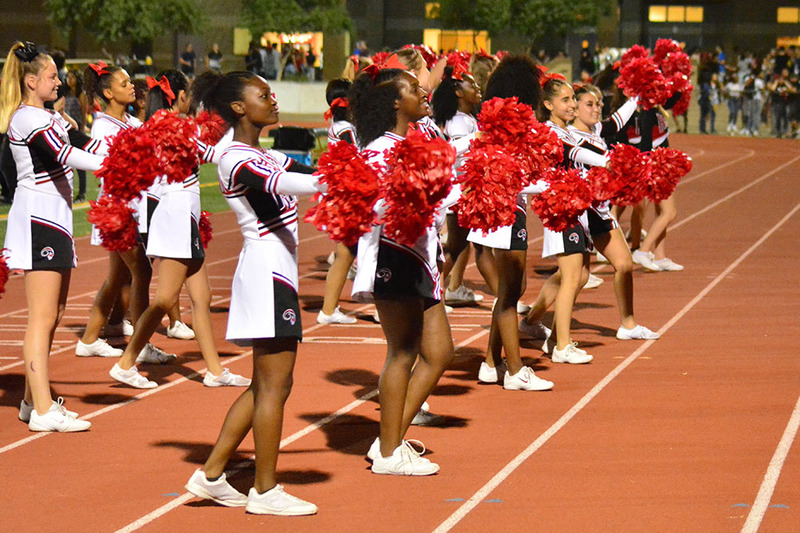 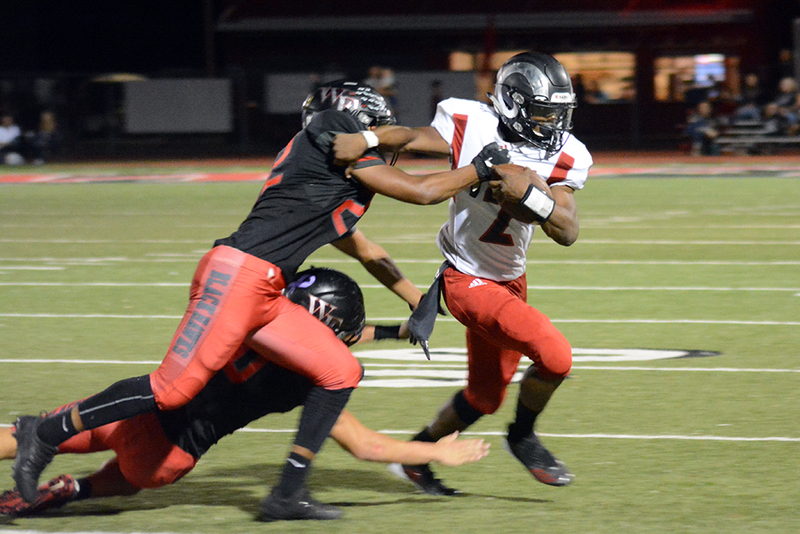 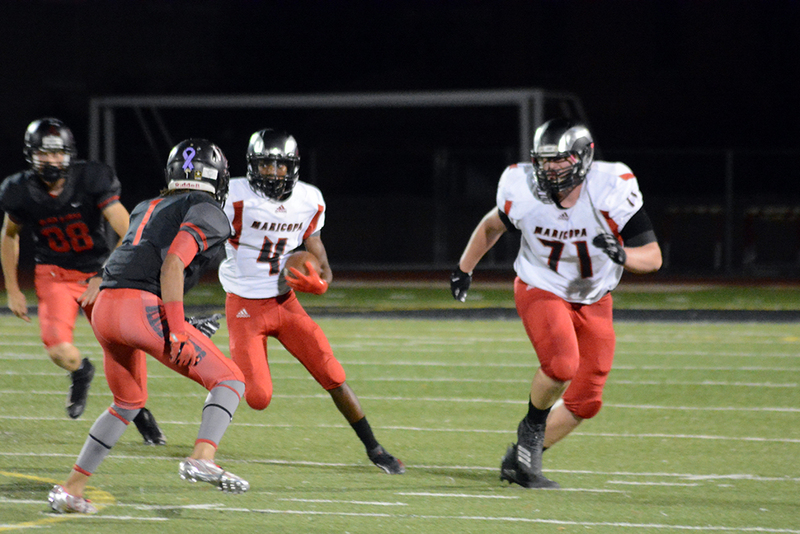 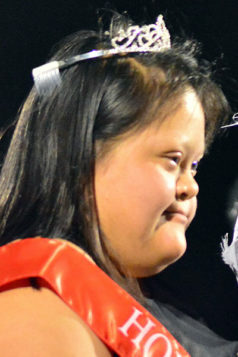 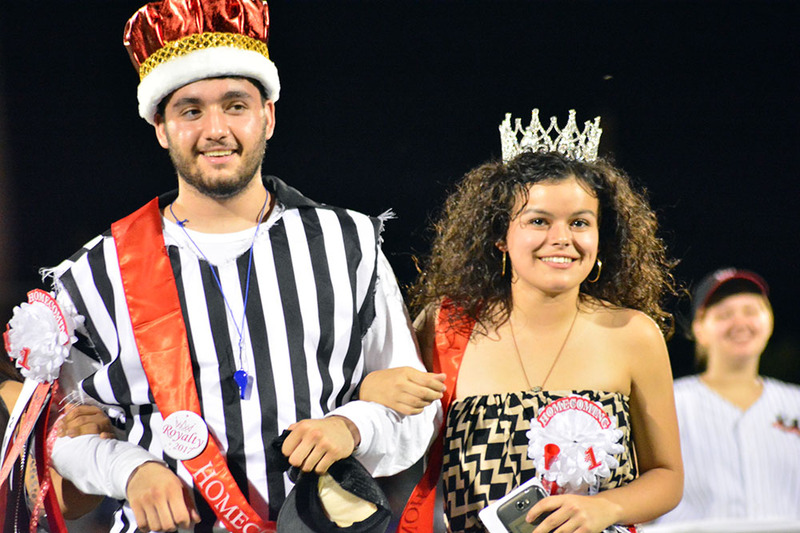 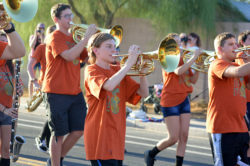 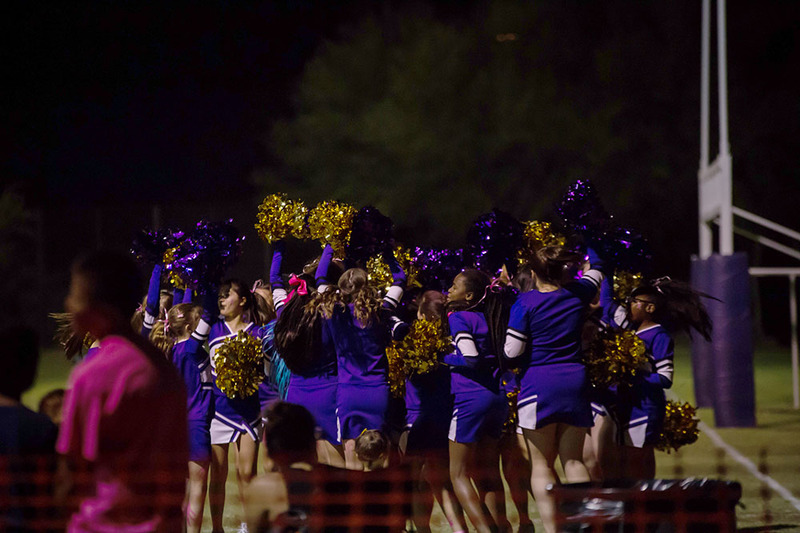 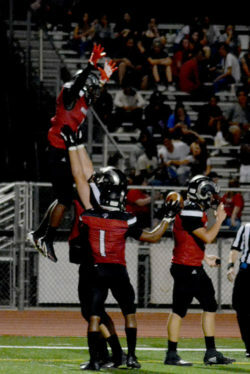 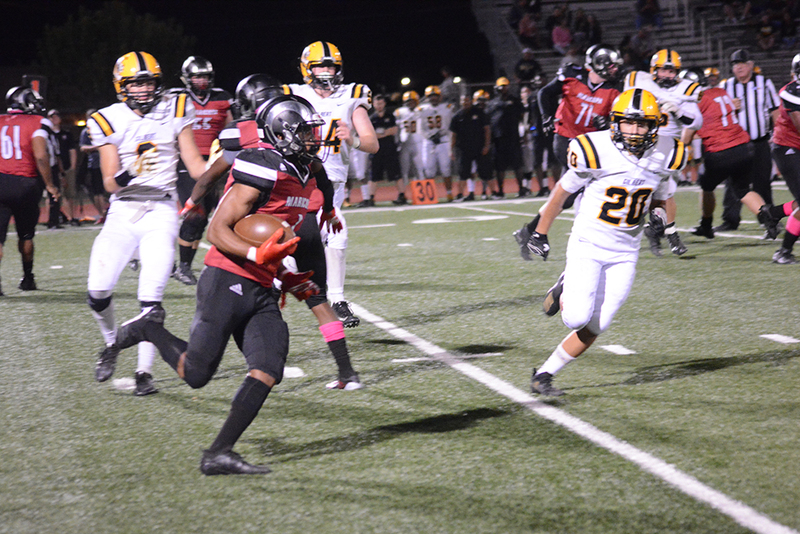 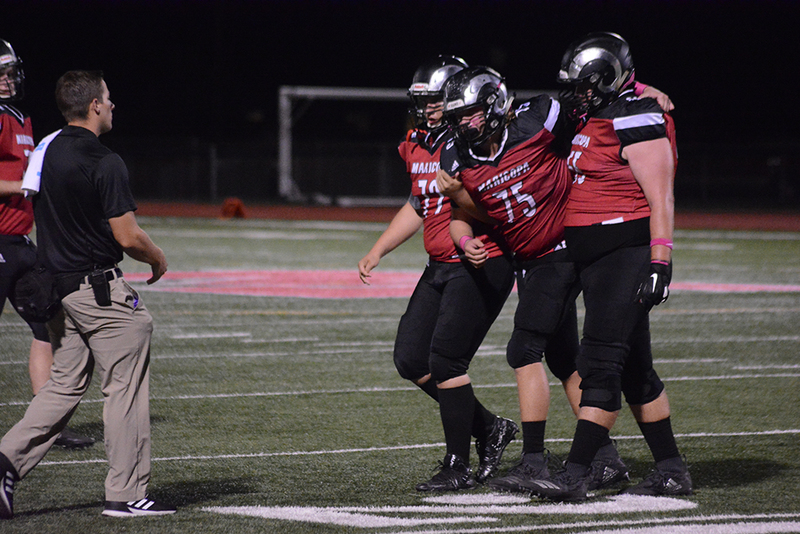 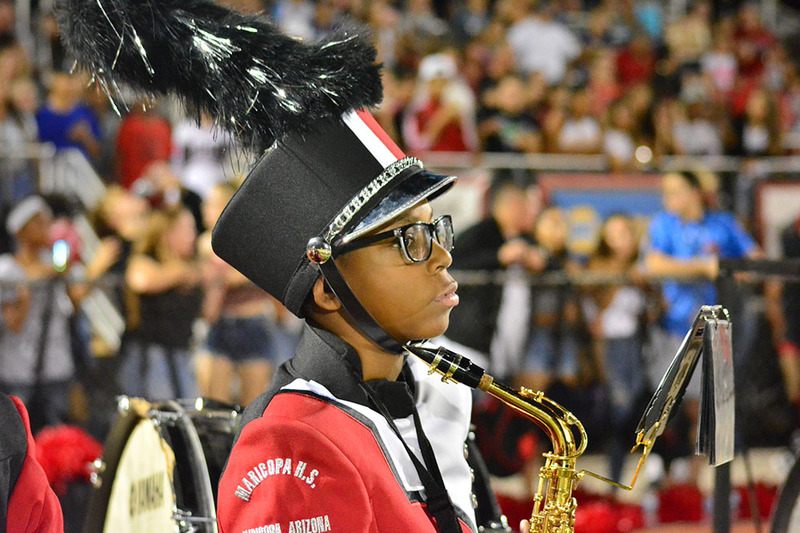 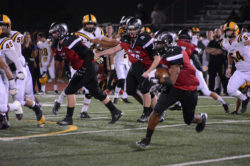 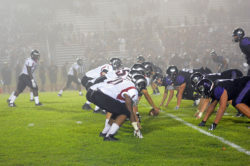 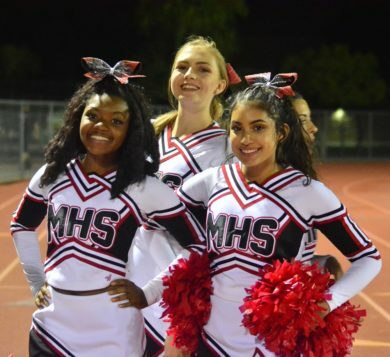 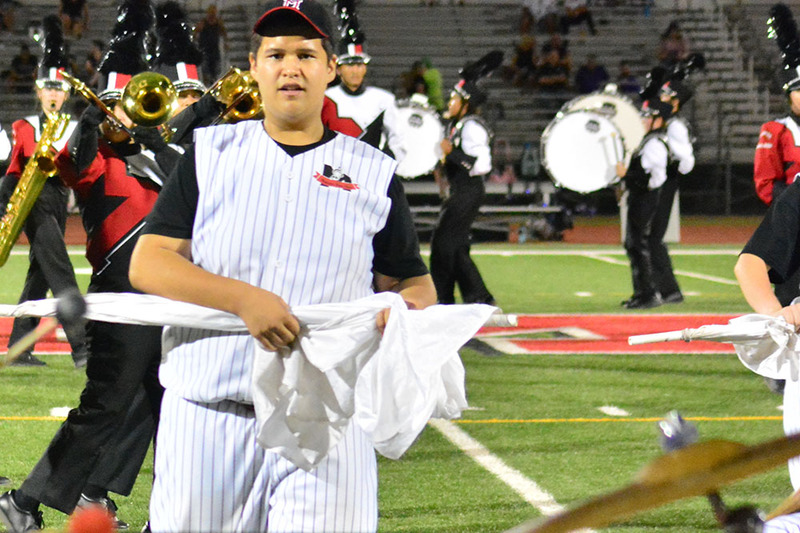 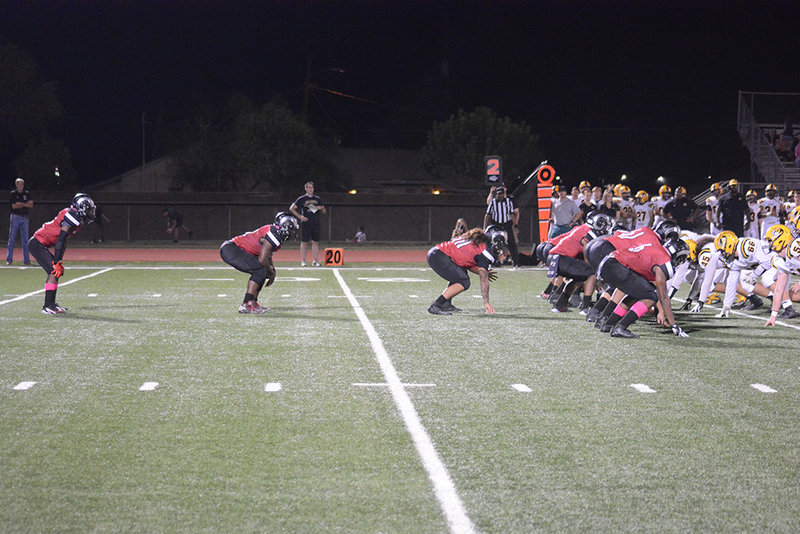 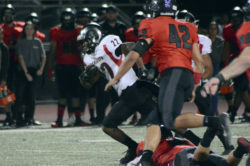 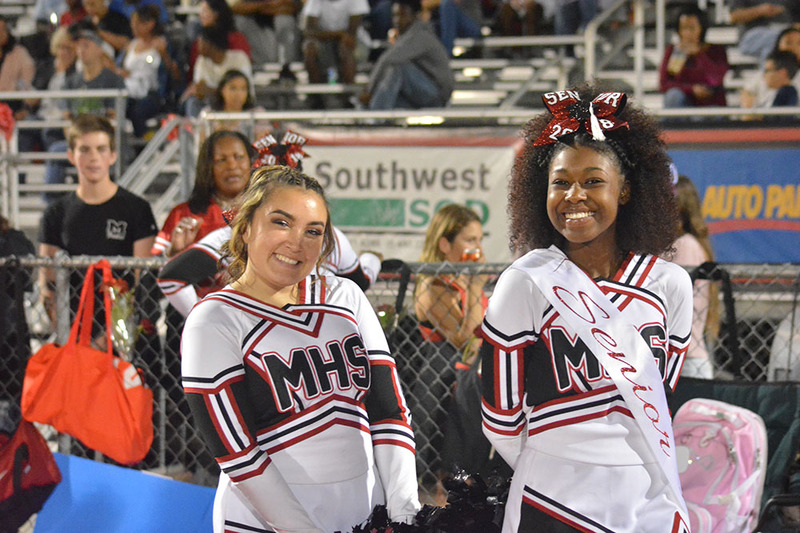 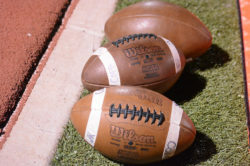 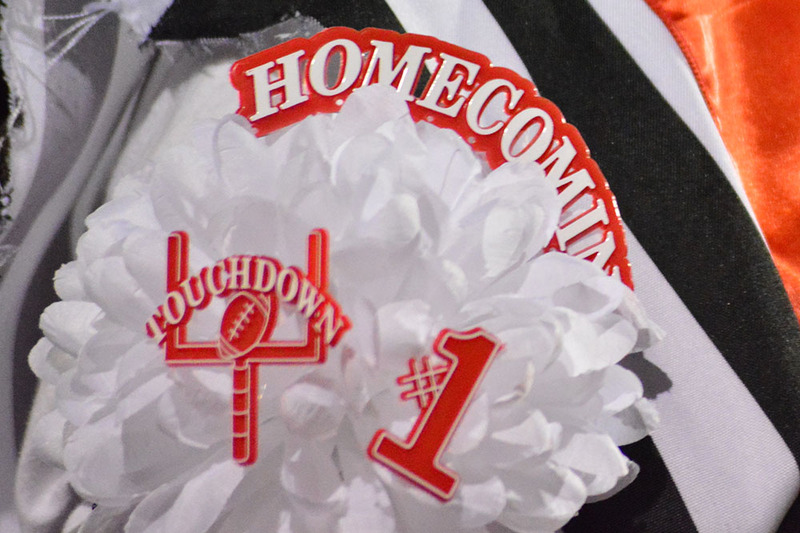 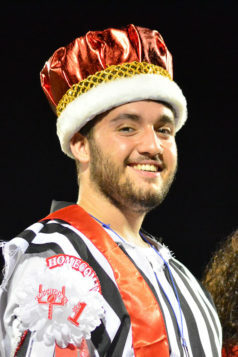 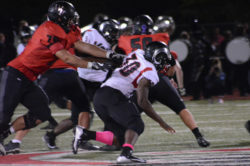 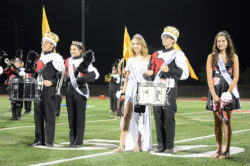 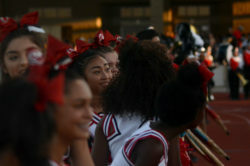 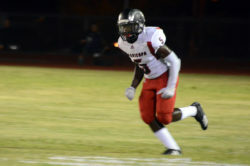 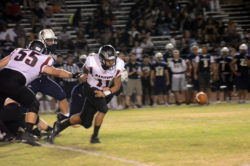 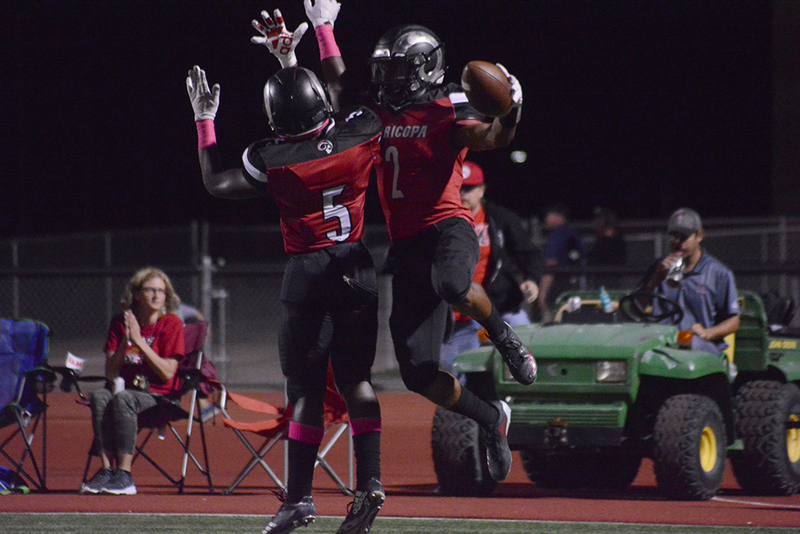 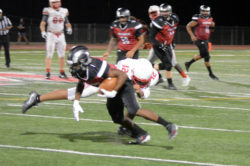 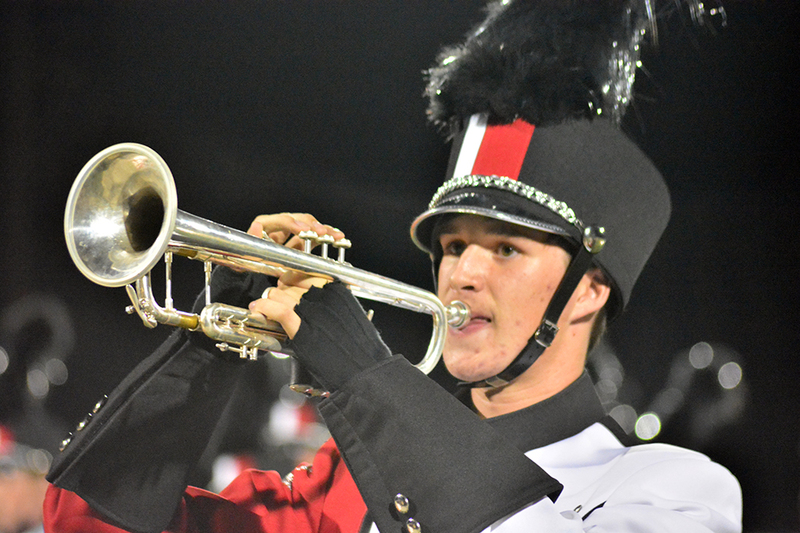 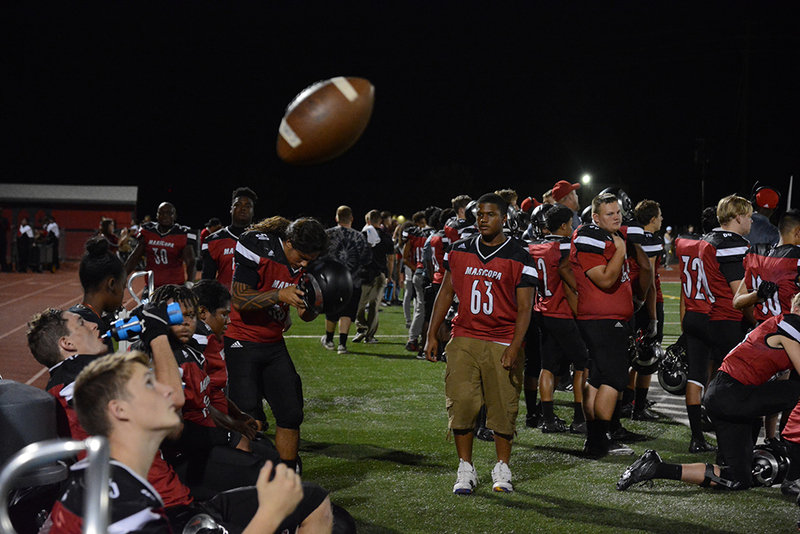 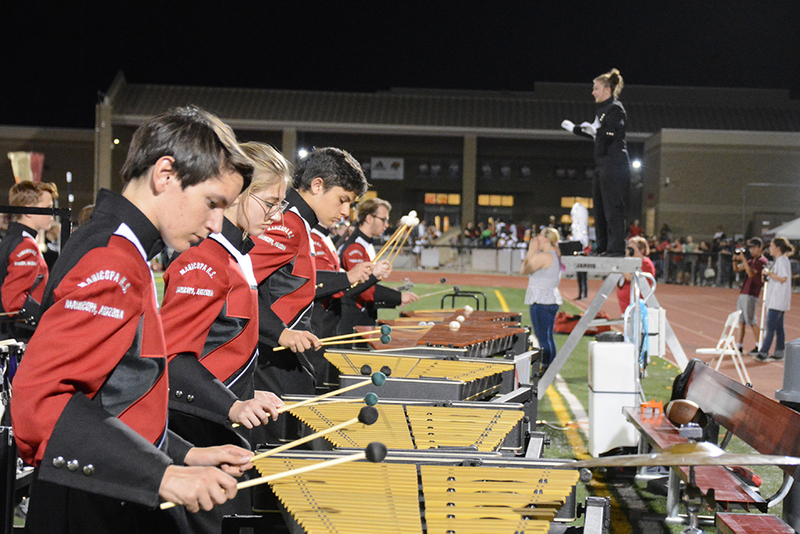 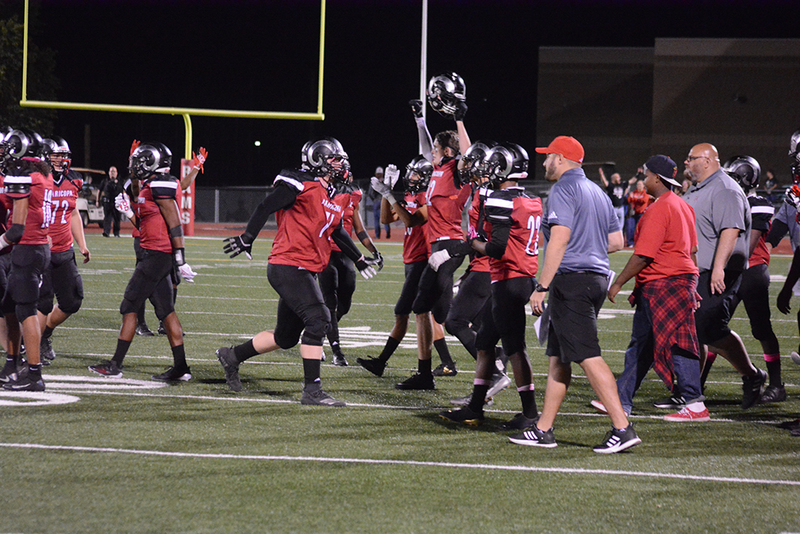 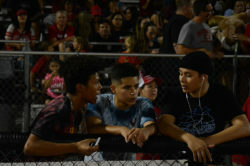 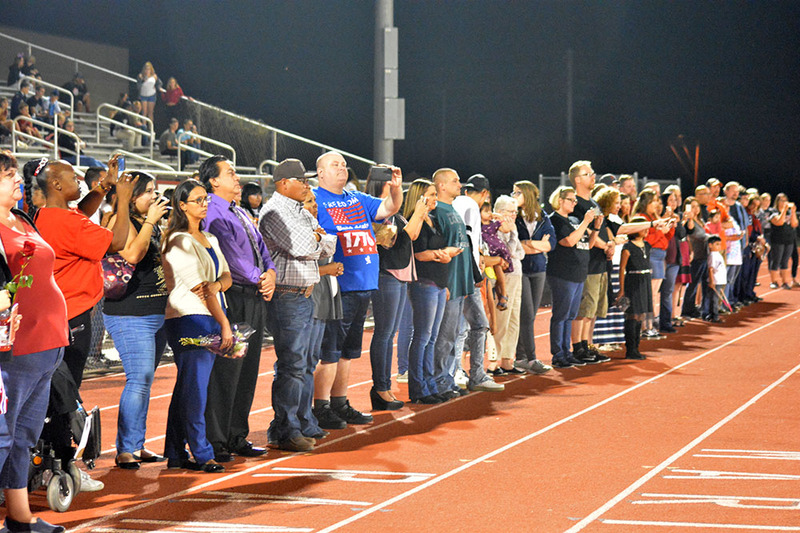 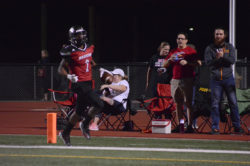 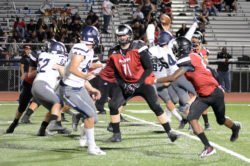 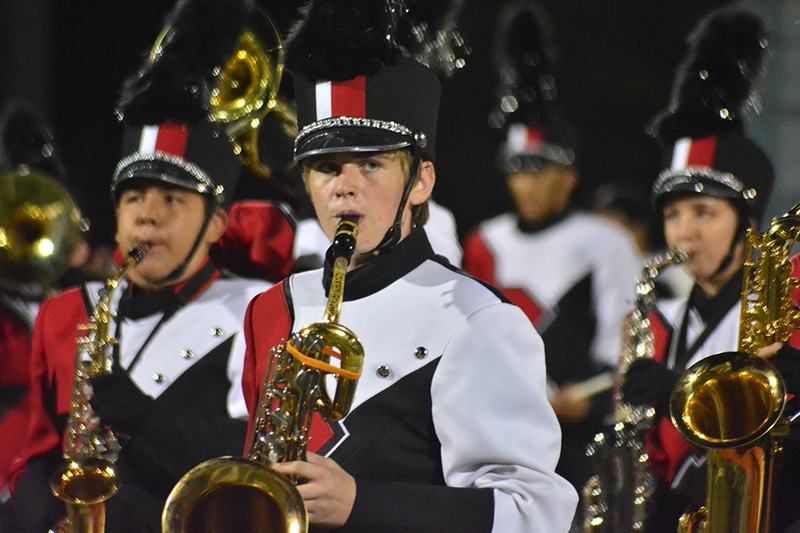 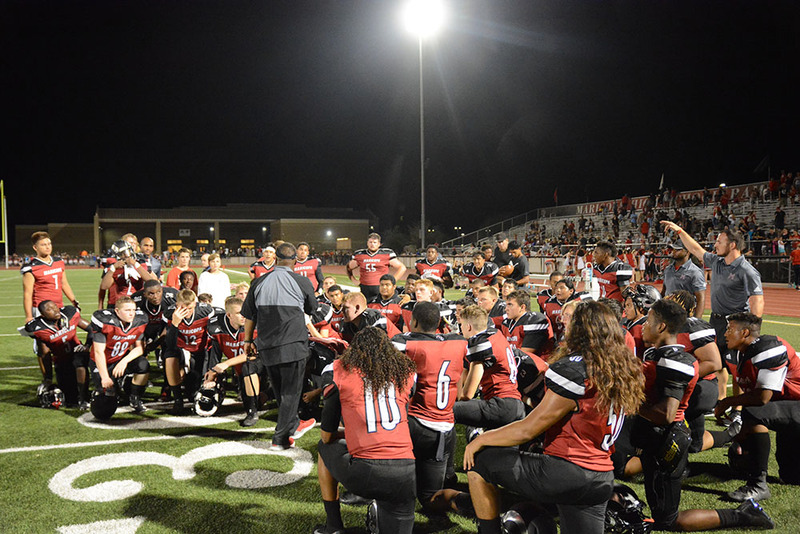 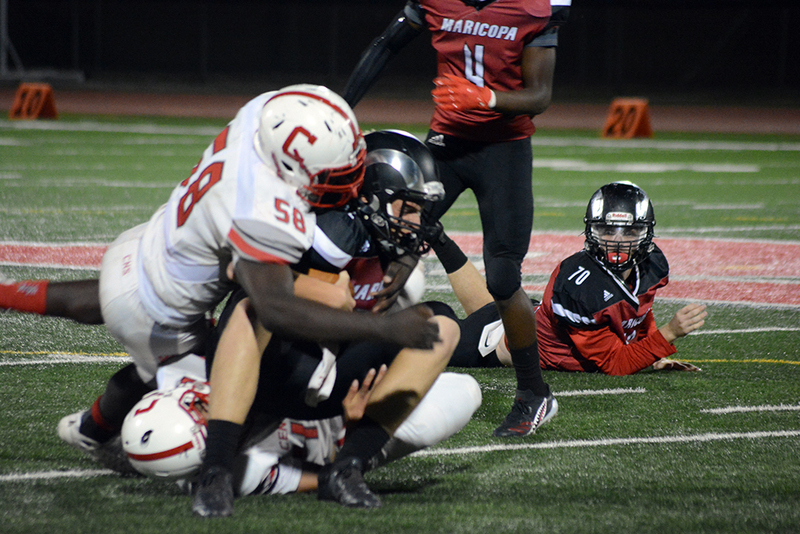 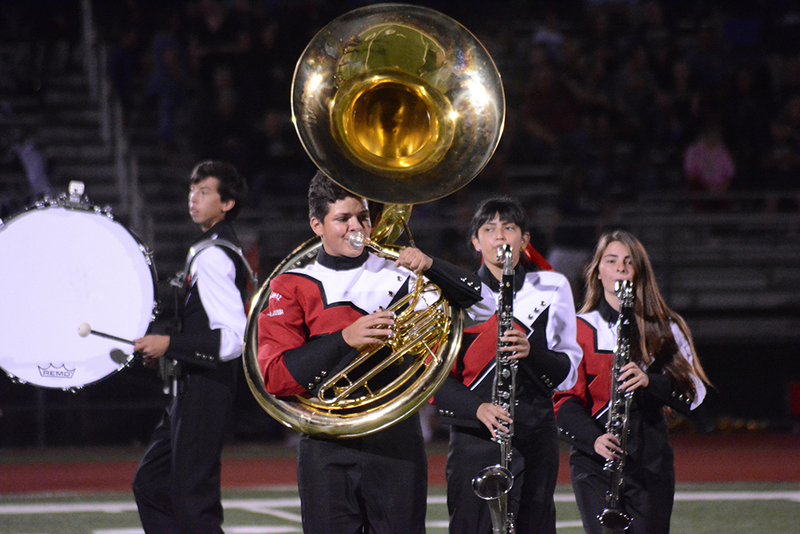 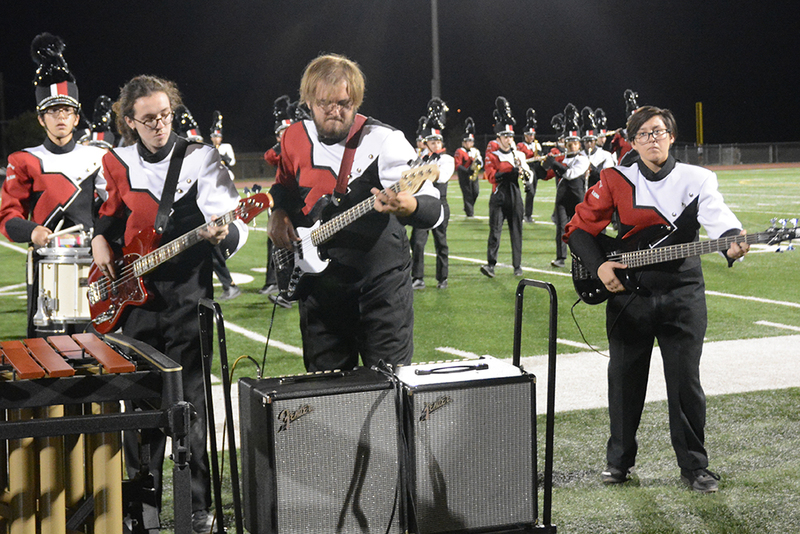 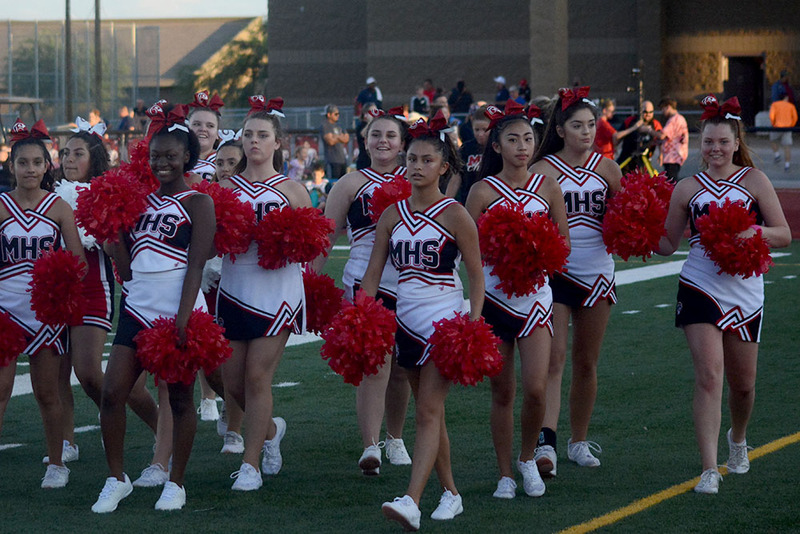 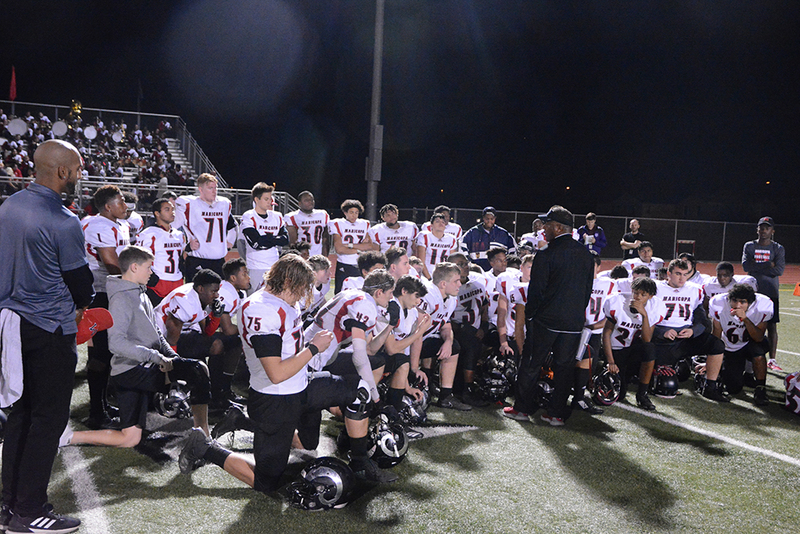 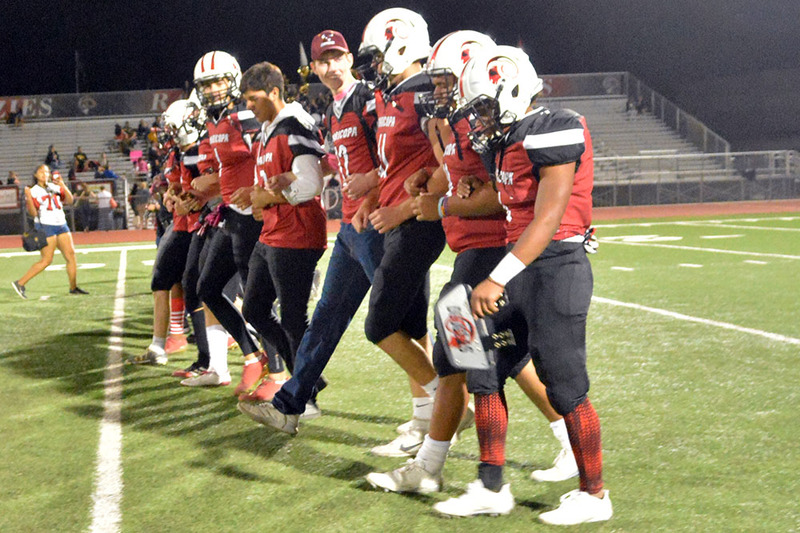 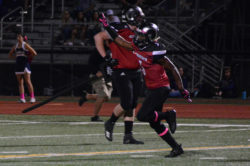 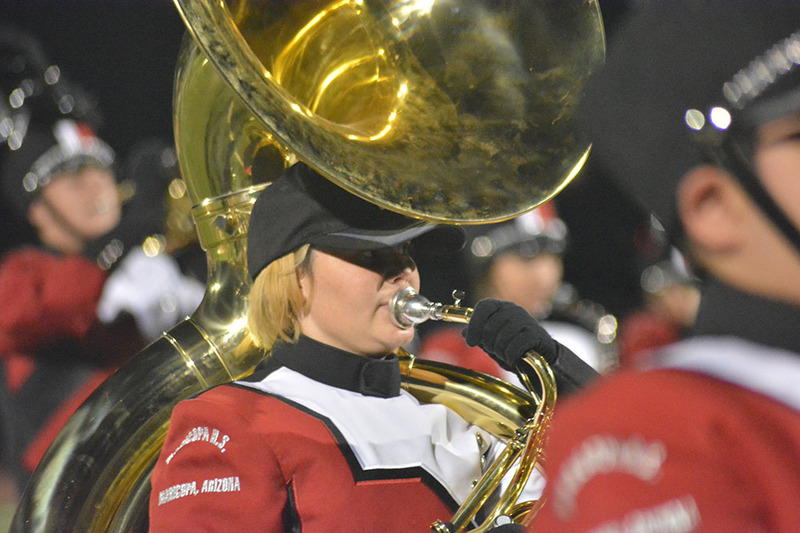 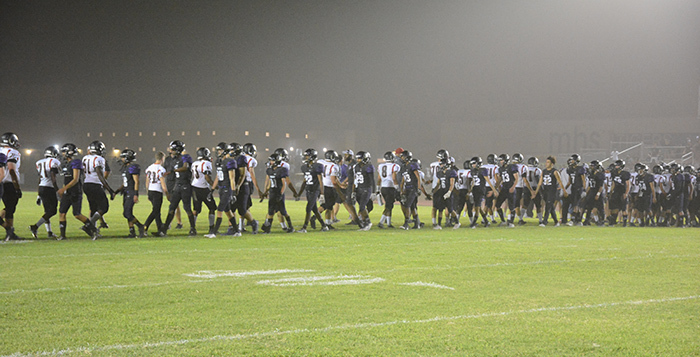 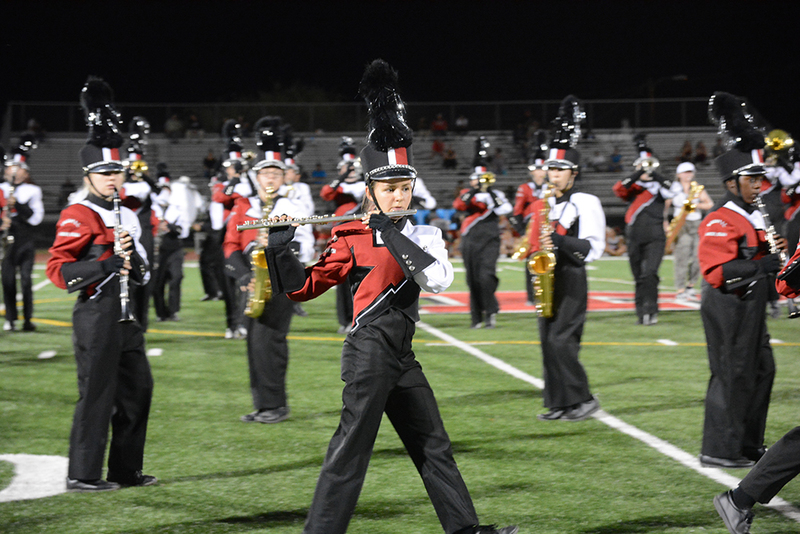 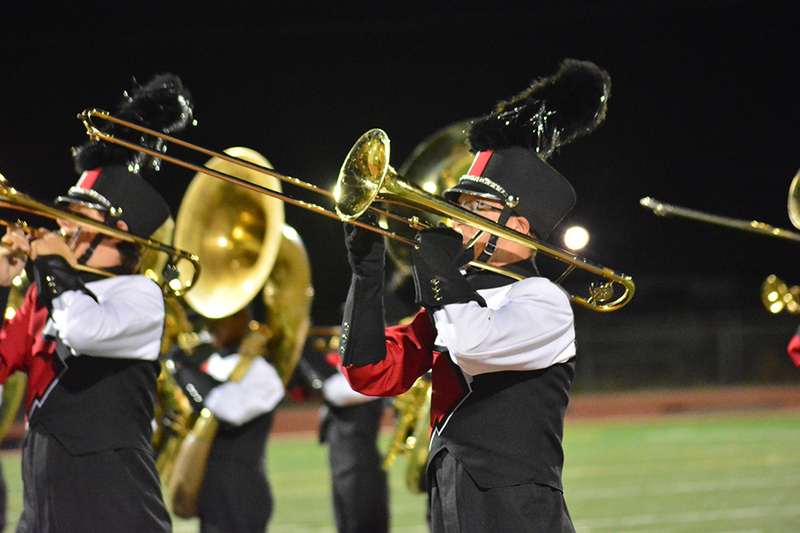 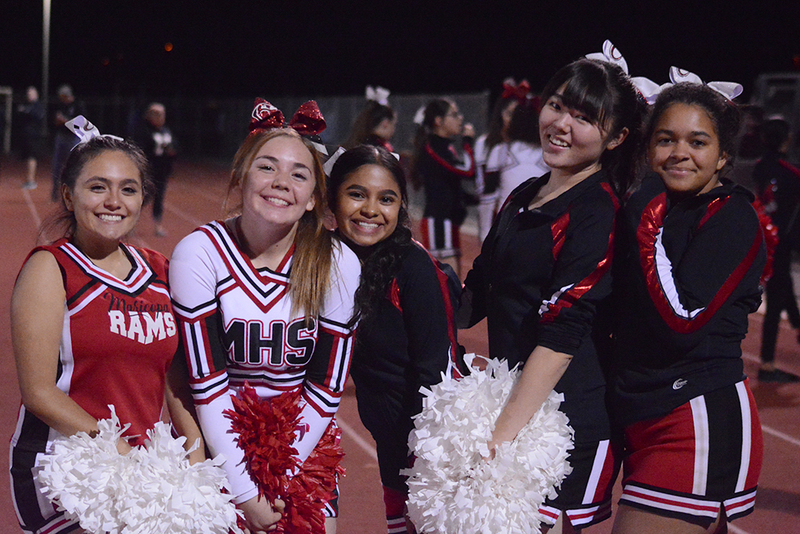 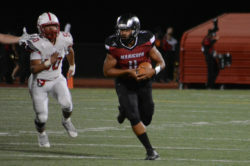 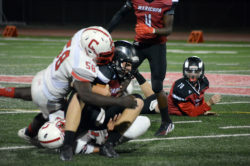 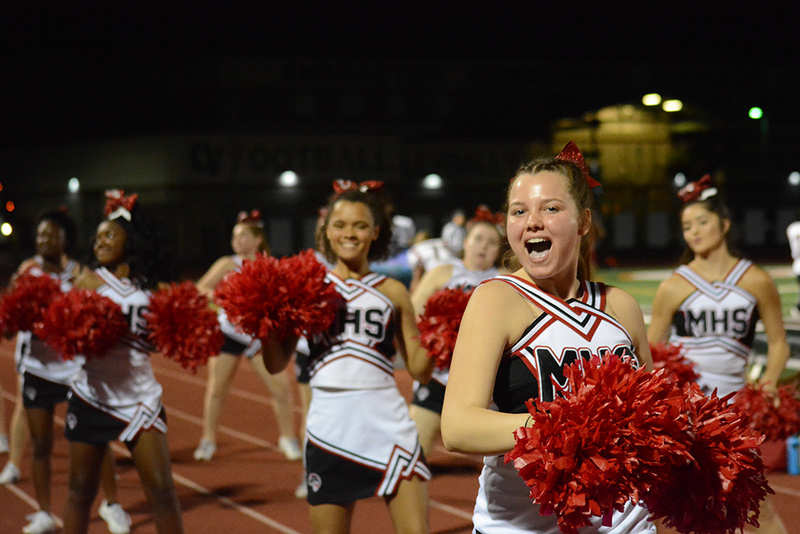 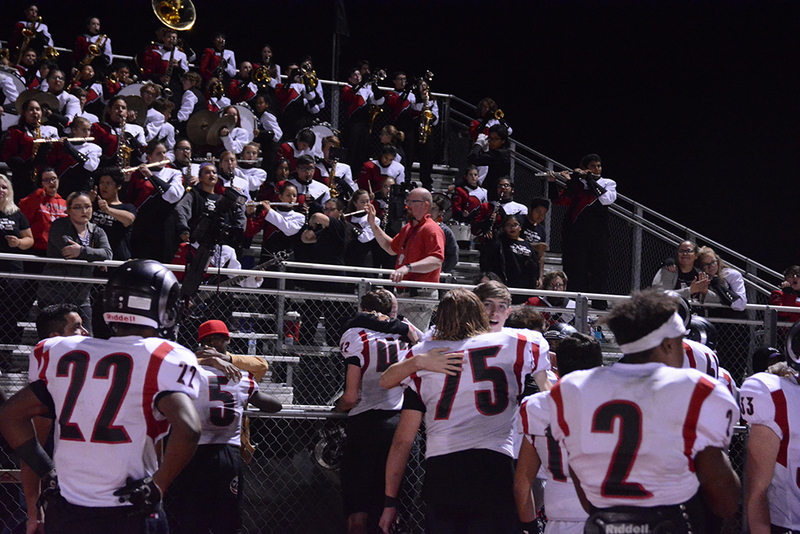 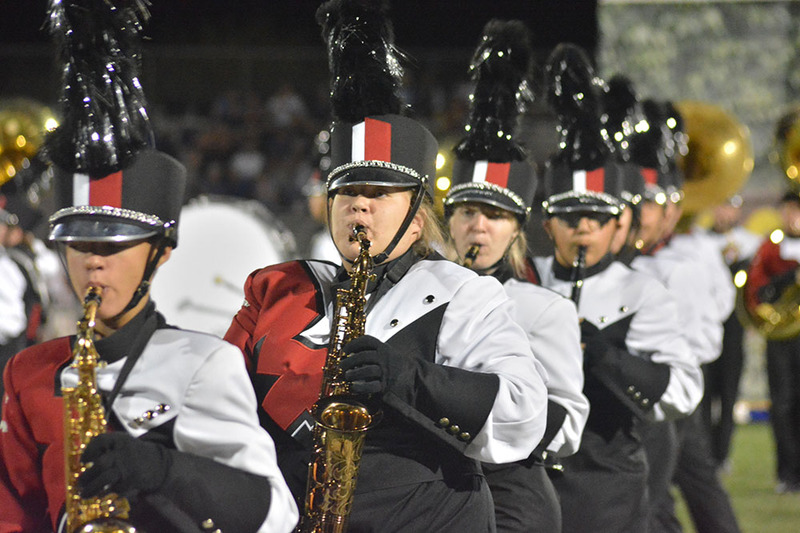 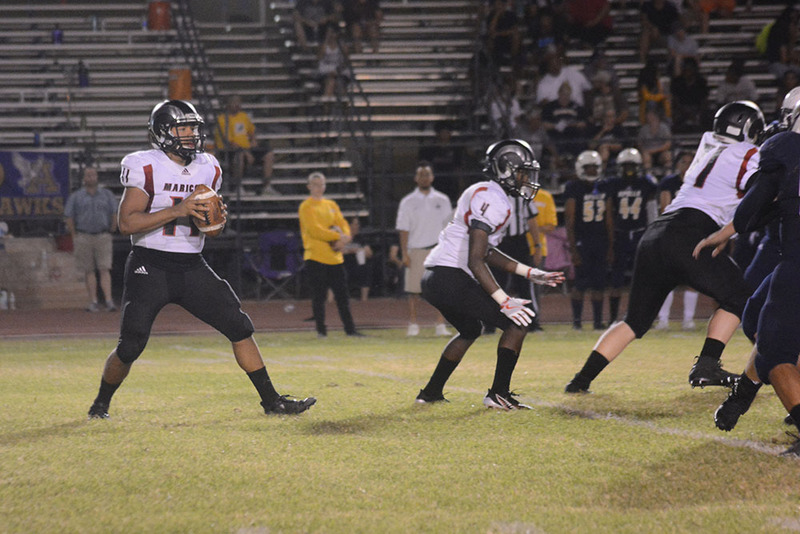 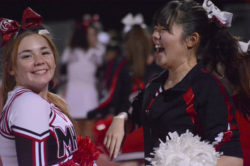 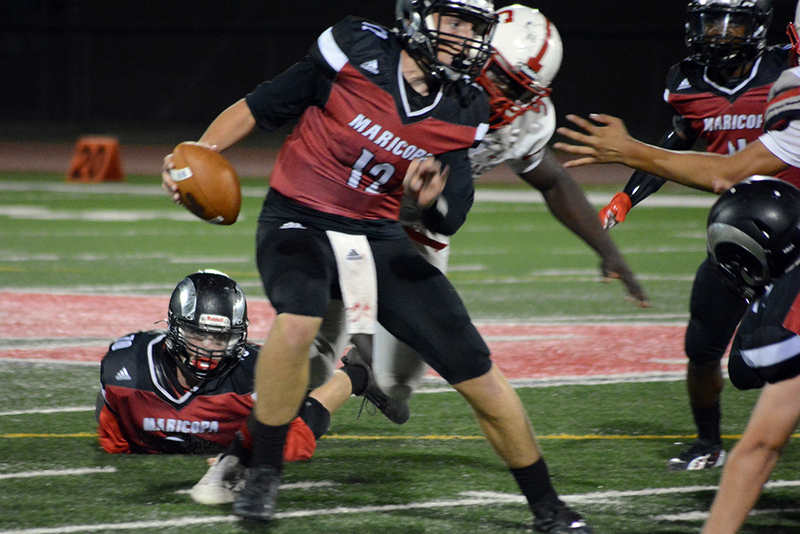 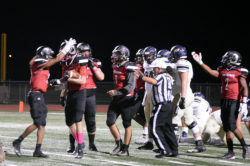 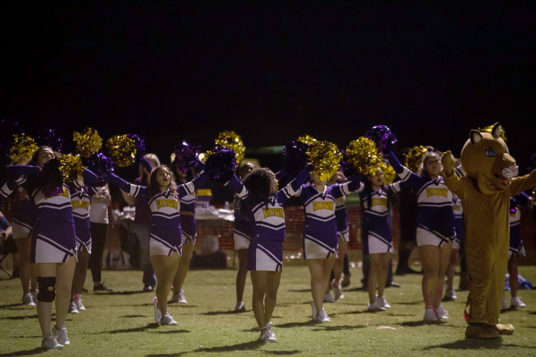 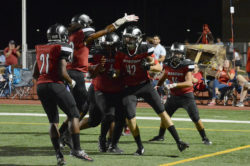 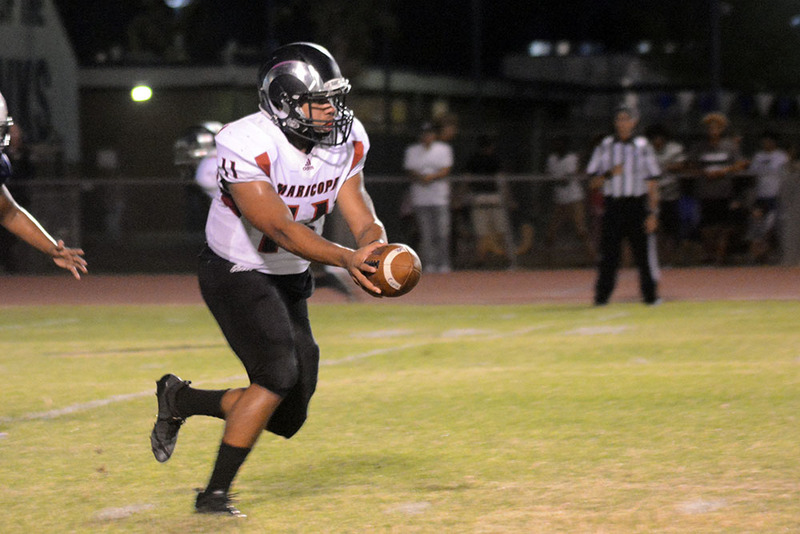 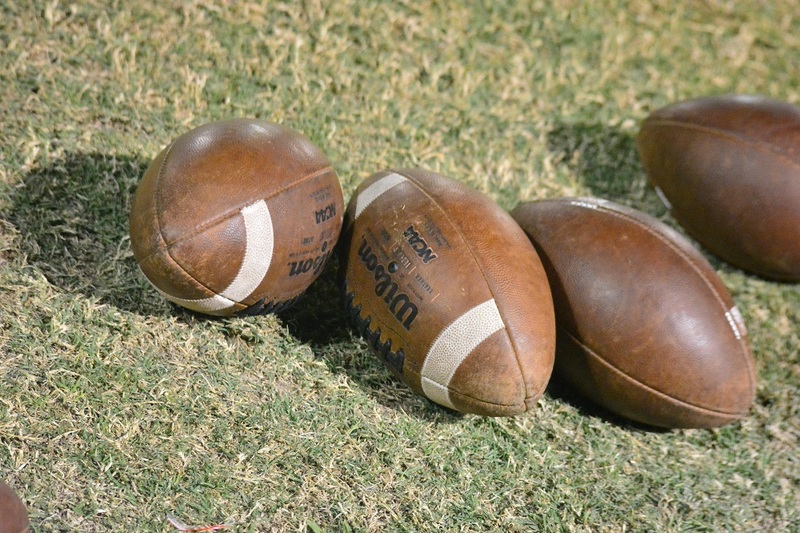 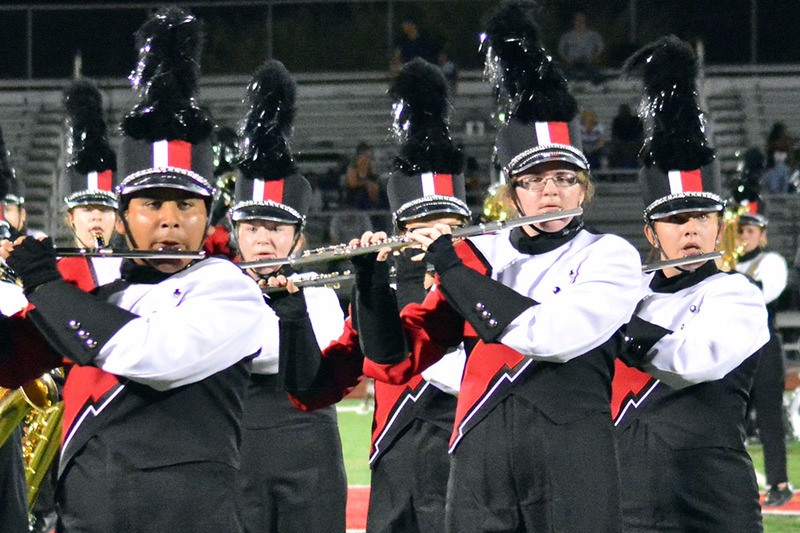 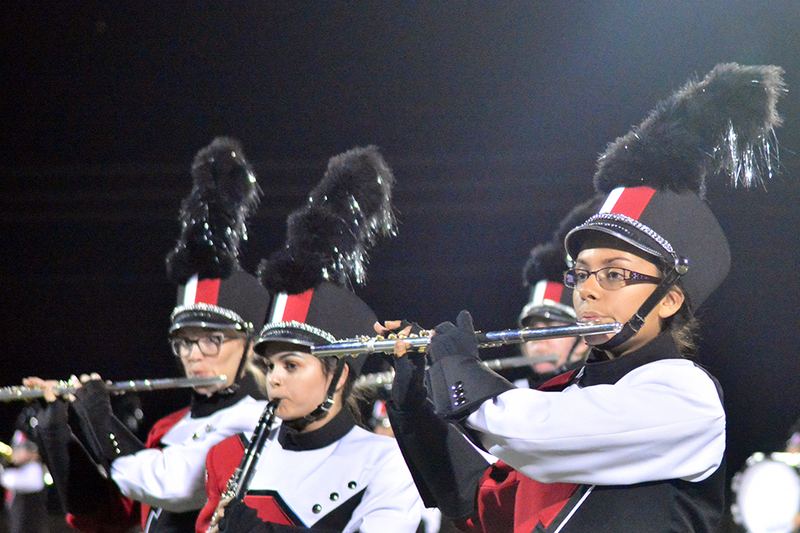 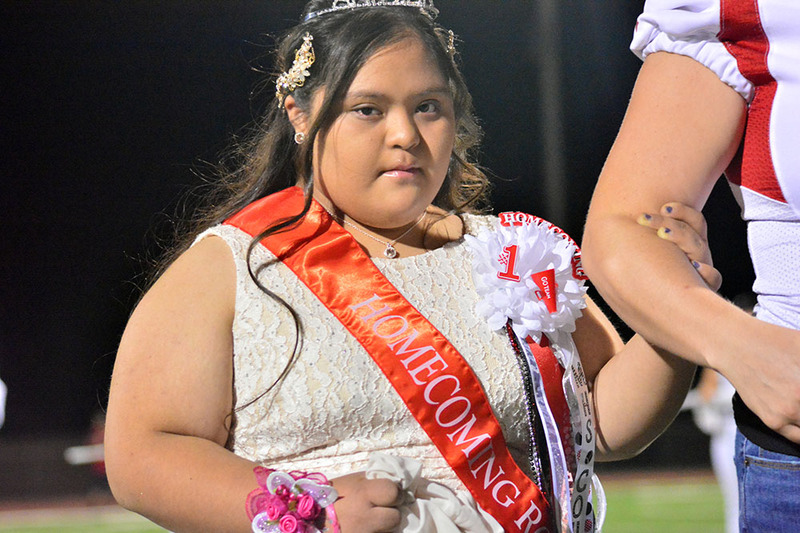 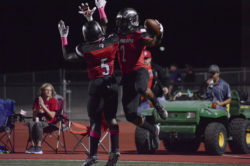 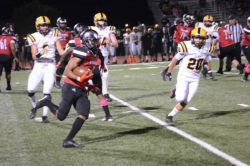 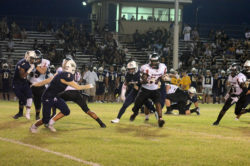 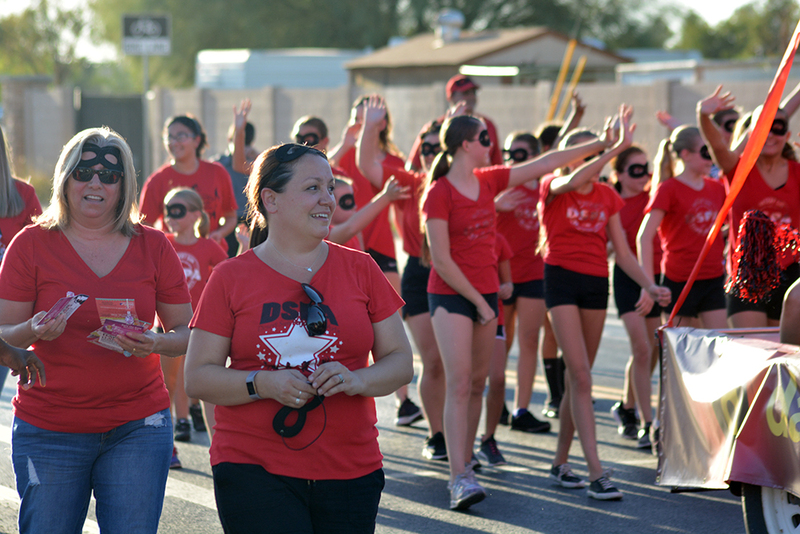 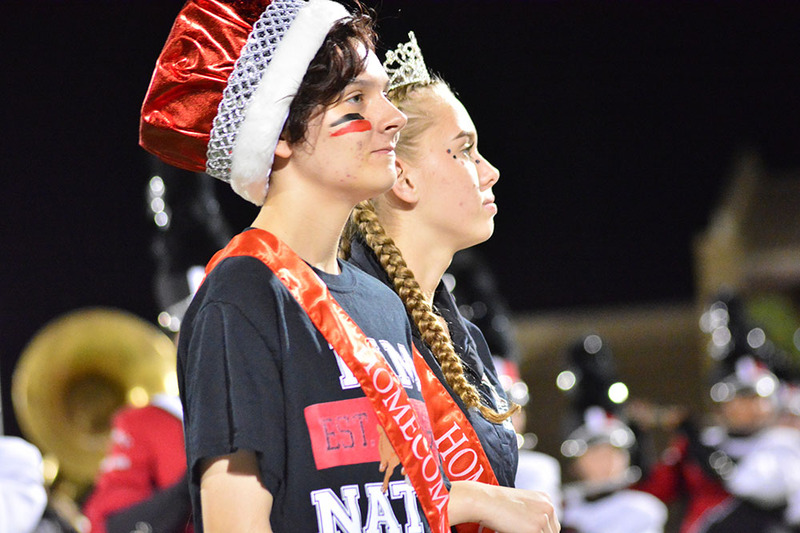 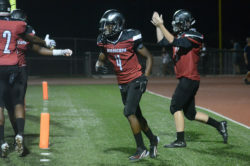 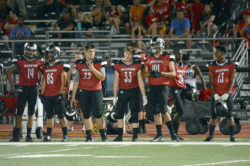 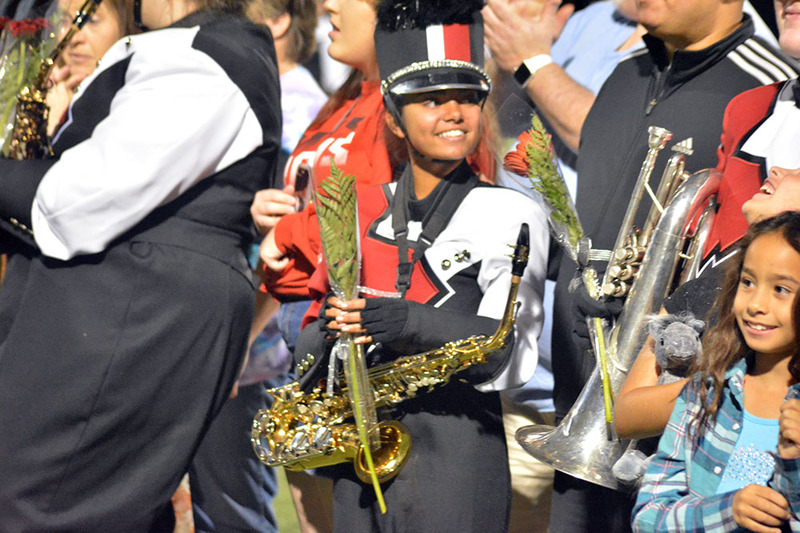 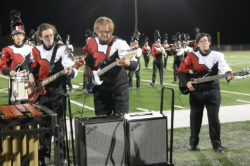 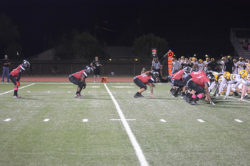 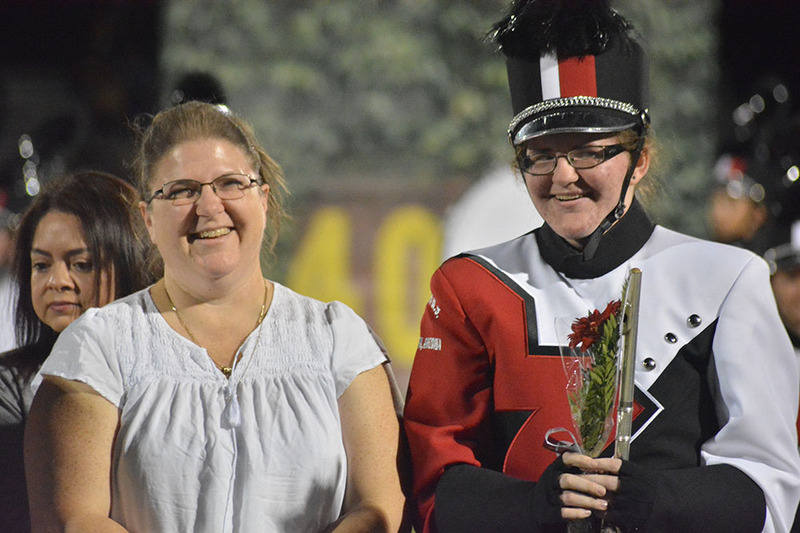 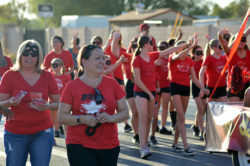 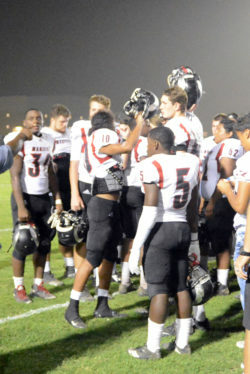 The Maricopa High School football team handily won its Homecoming game Friday night, 54-14, over North Canyon. 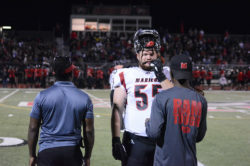 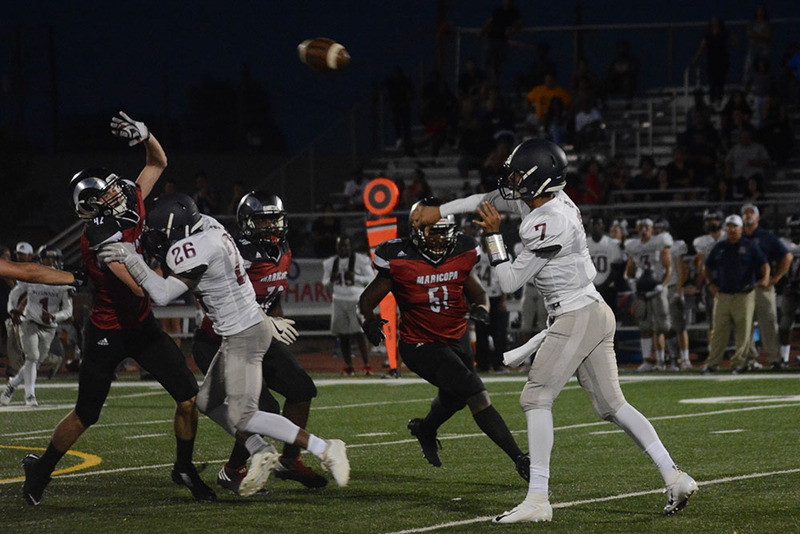 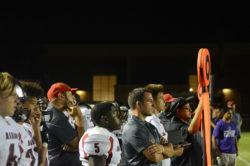 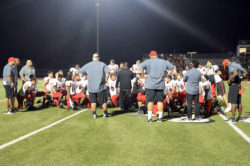 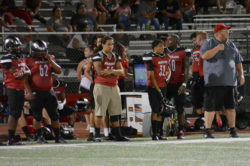 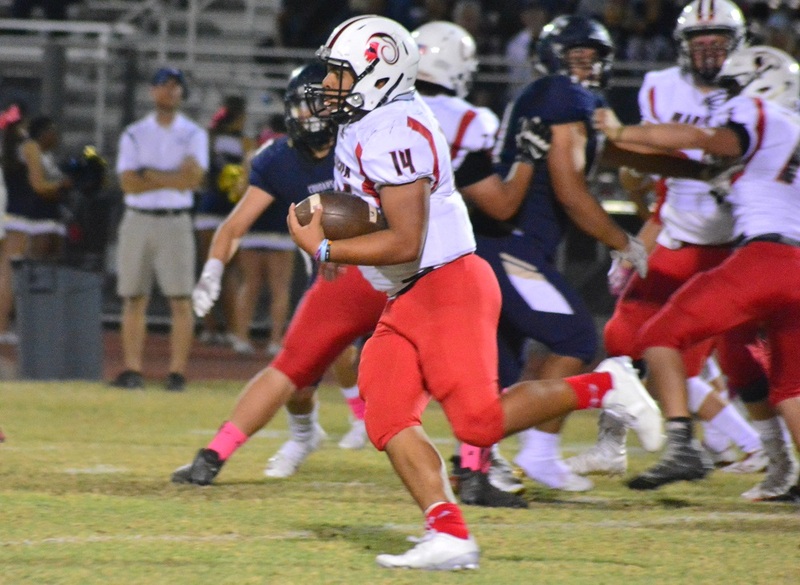 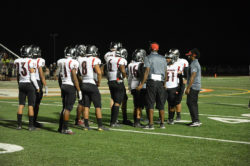 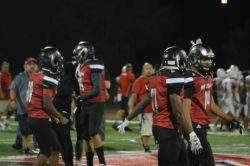 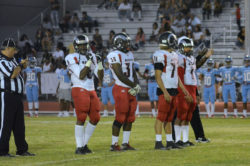 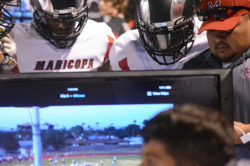 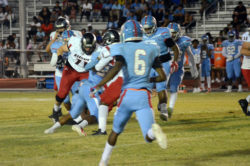 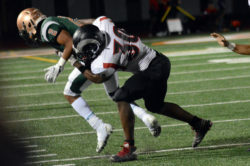 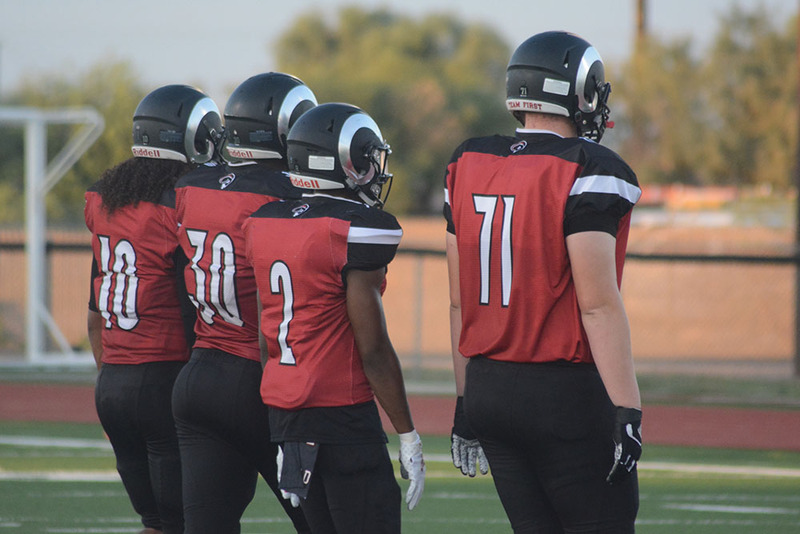 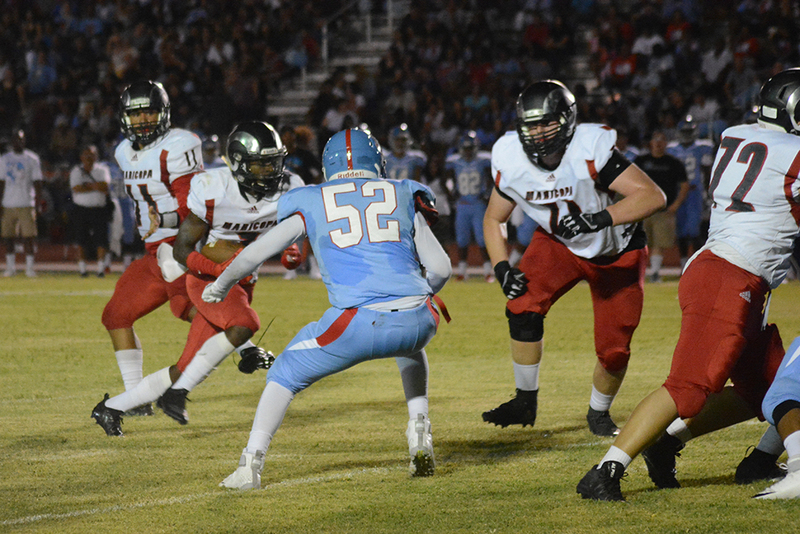 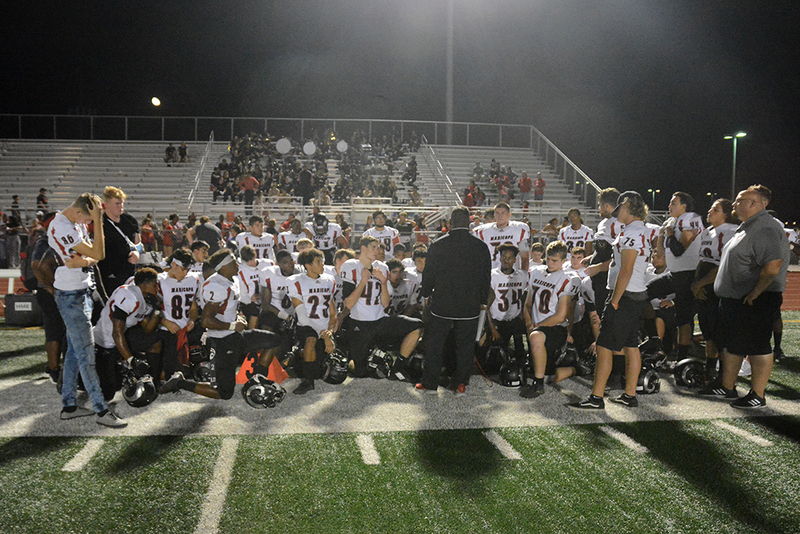 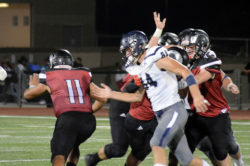 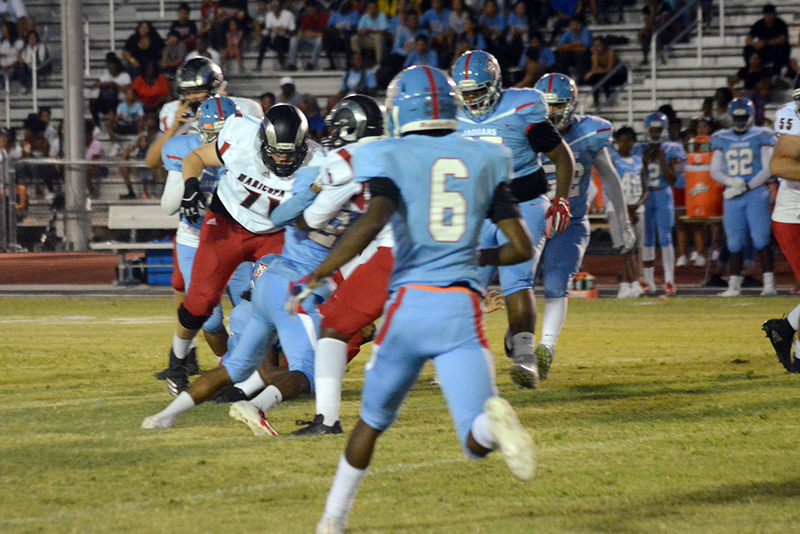 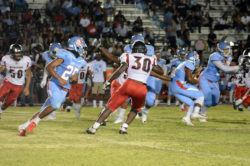 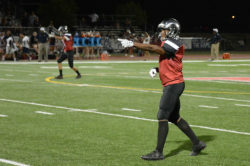 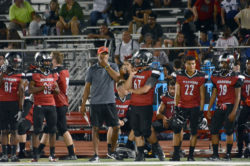 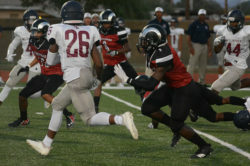 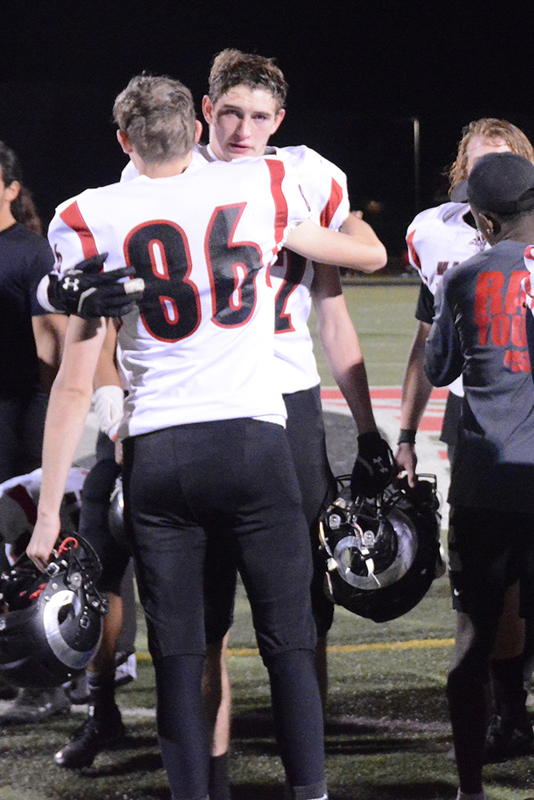 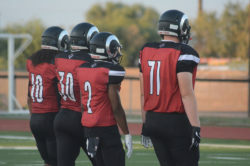 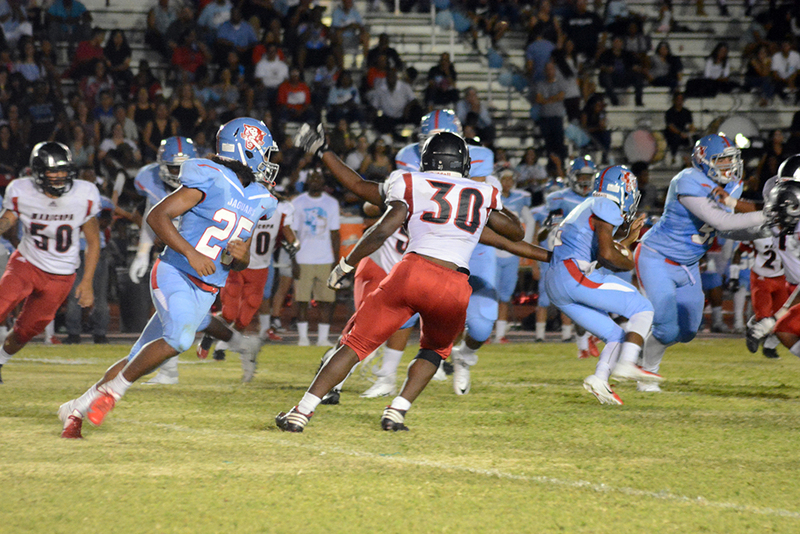 Head coach Chris McDonald said the Rams did to the Rattlers what Centennial had done to Maricopa the week before, and improved their mid-season record to 4-1 in the process. 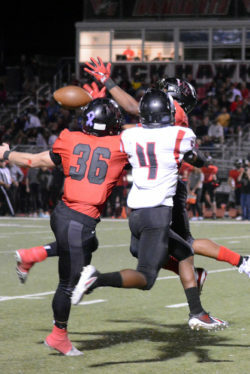 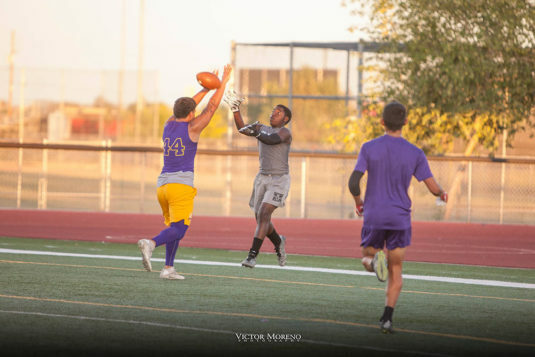 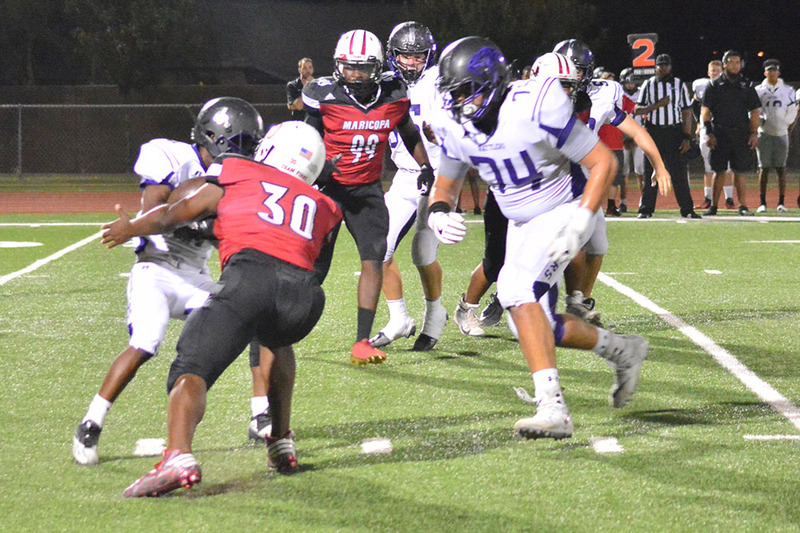 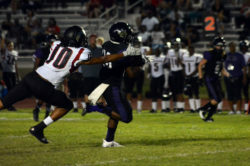 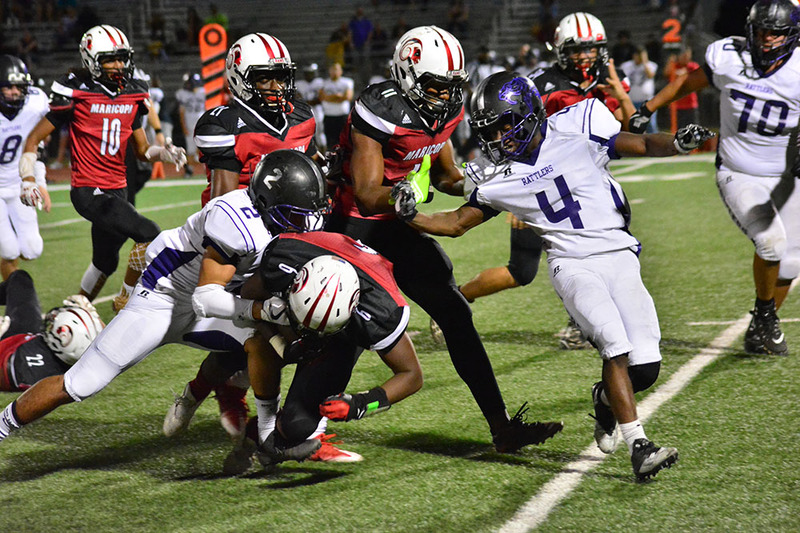 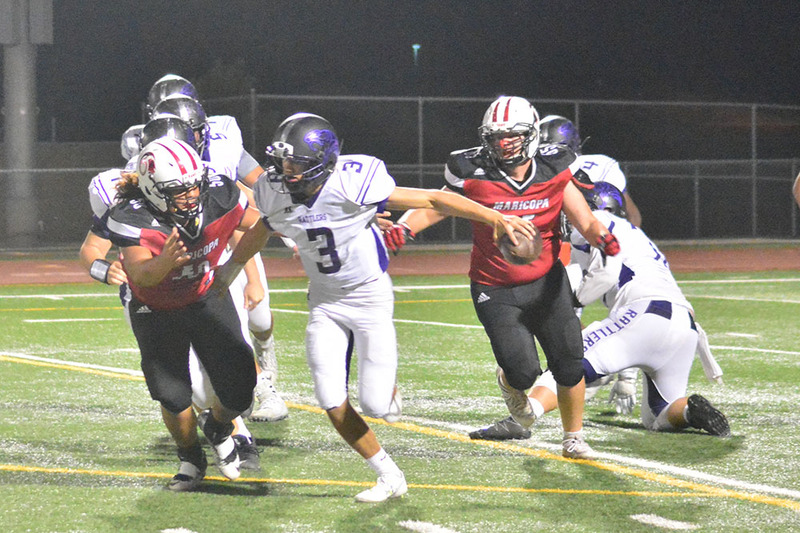 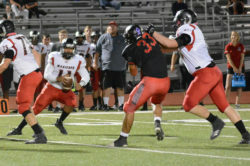 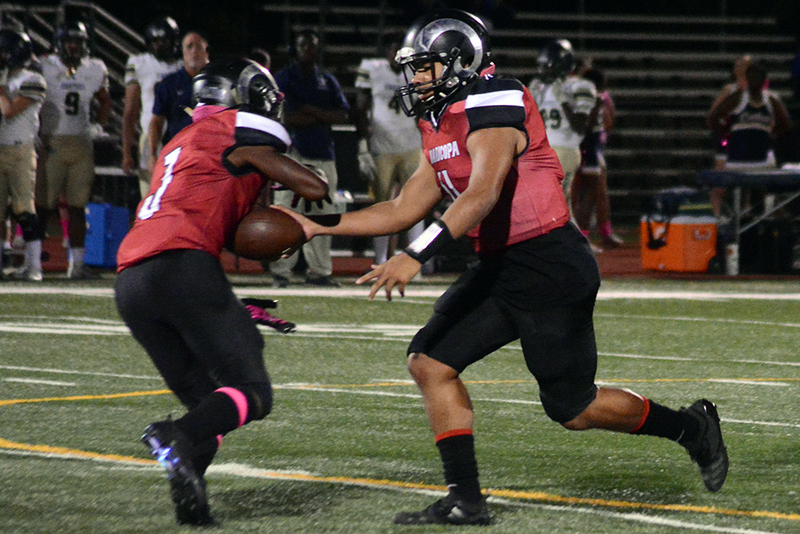 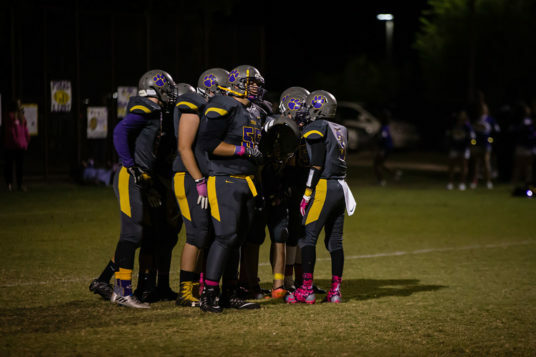 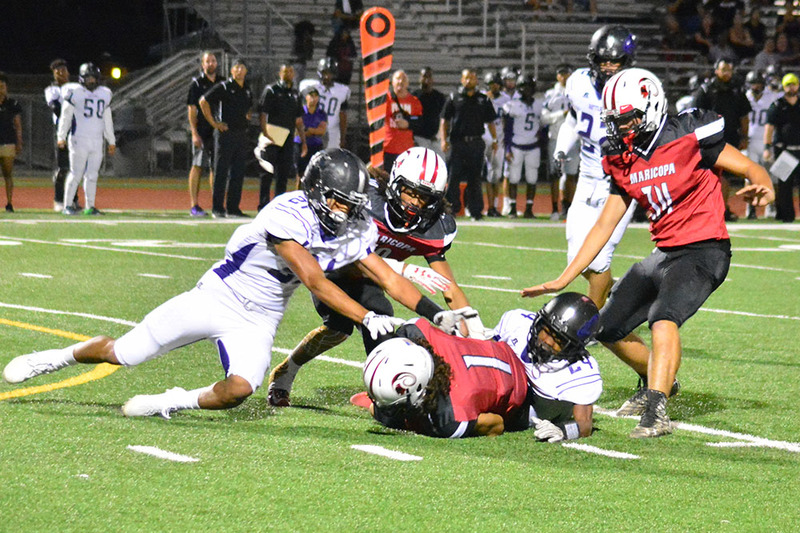 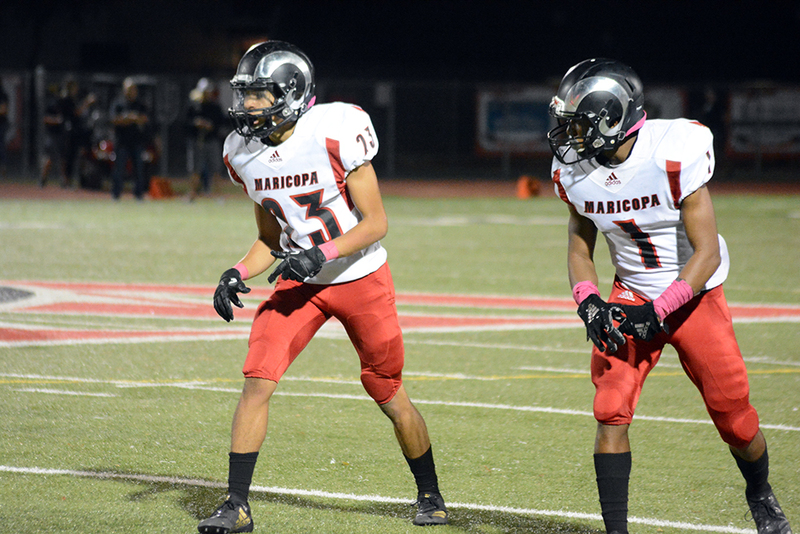 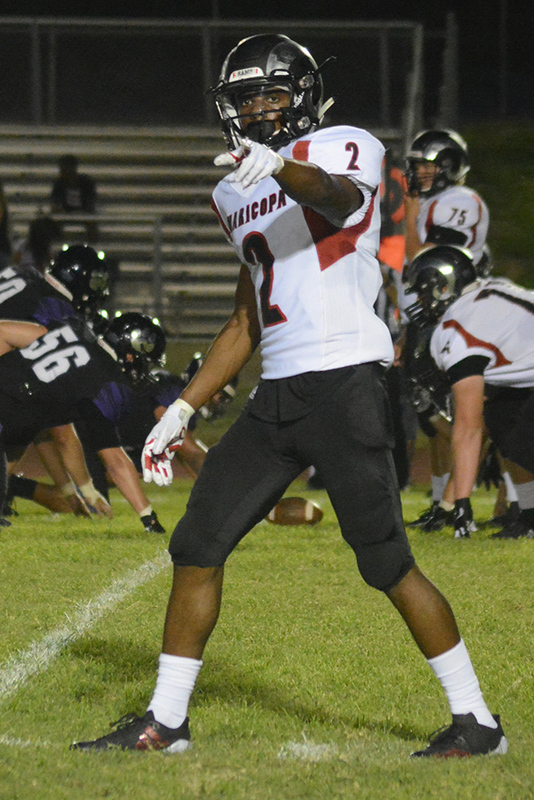 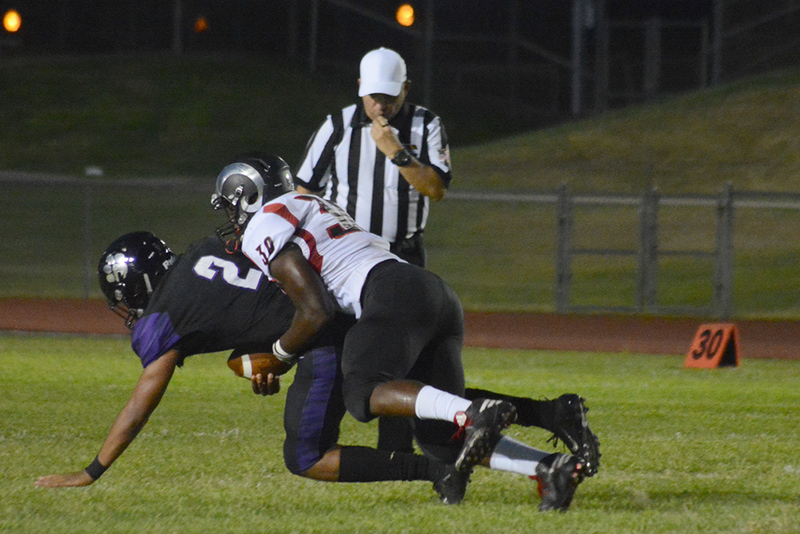 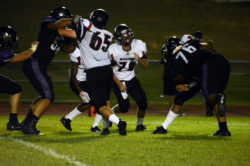 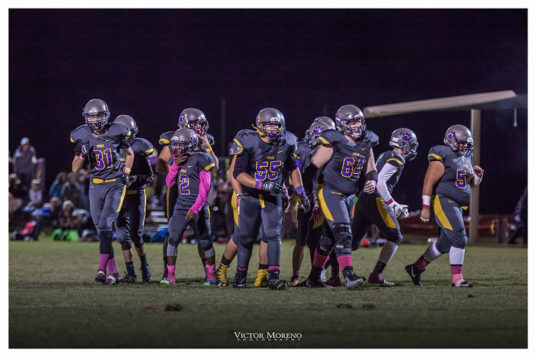 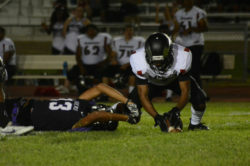 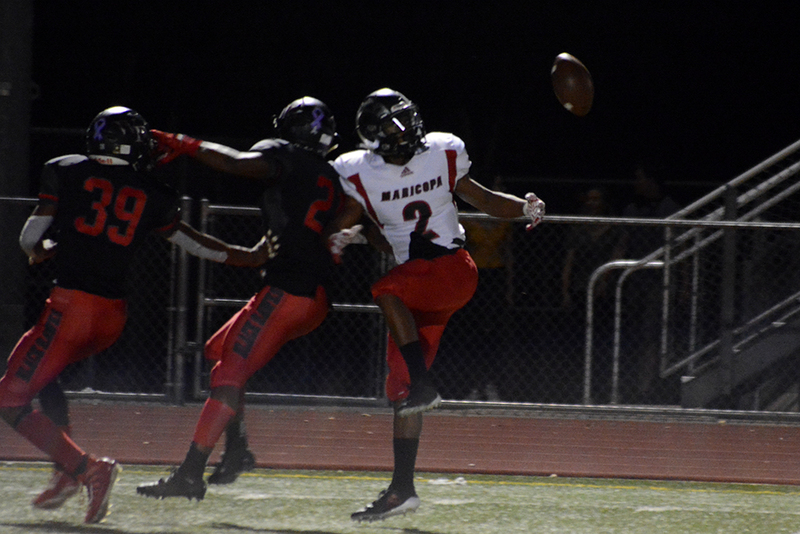 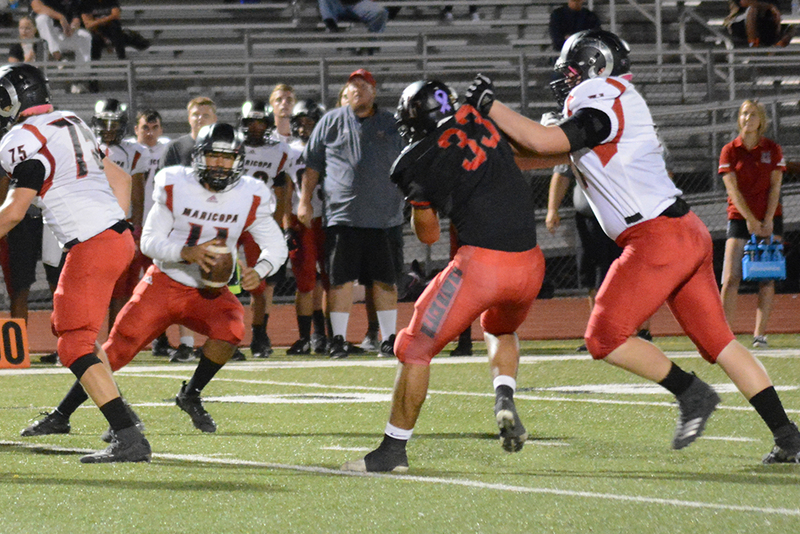 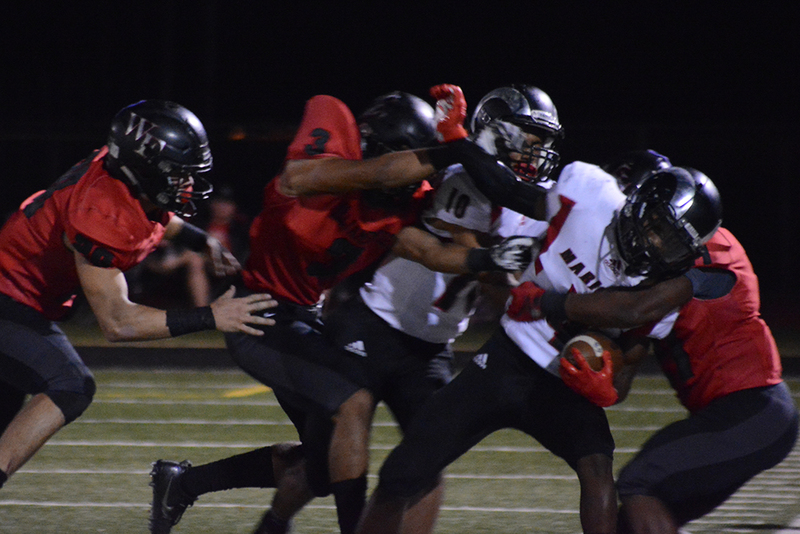 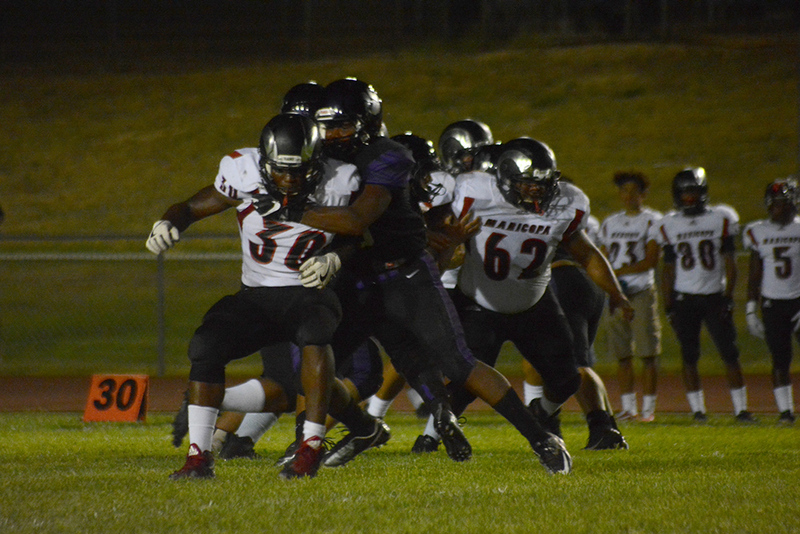 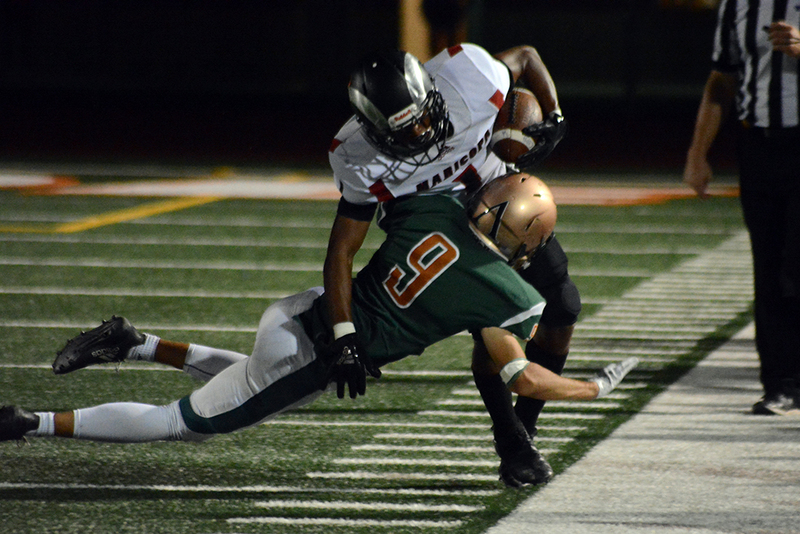 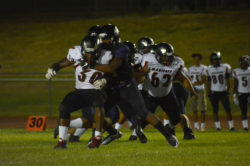 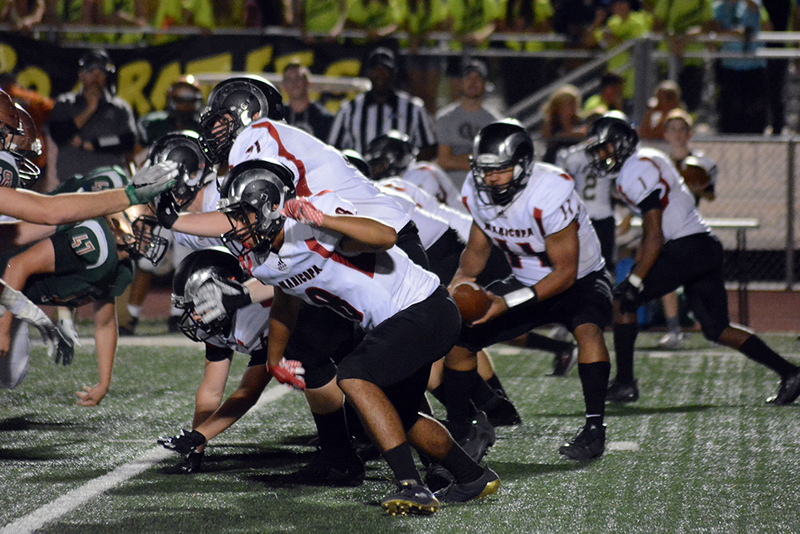 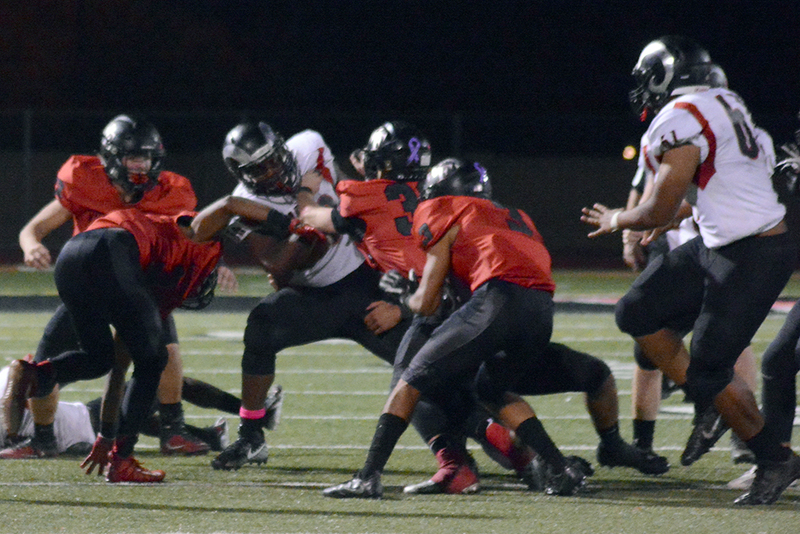 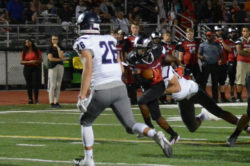 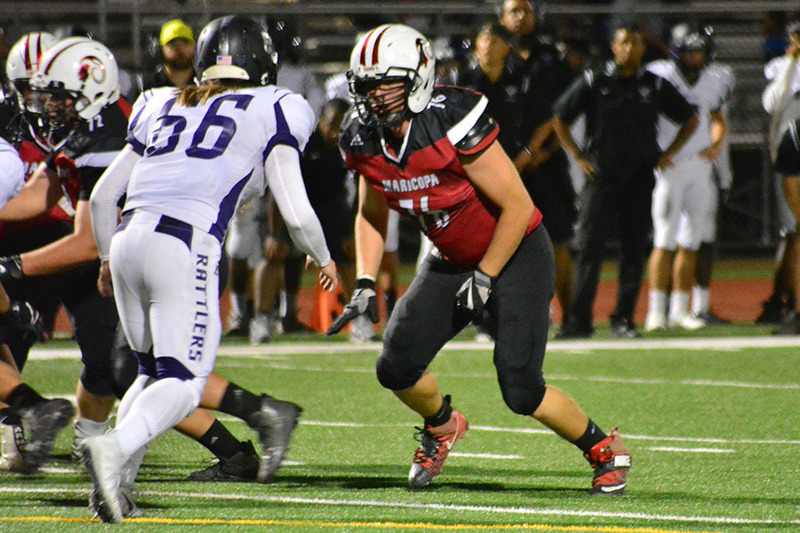 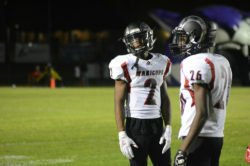 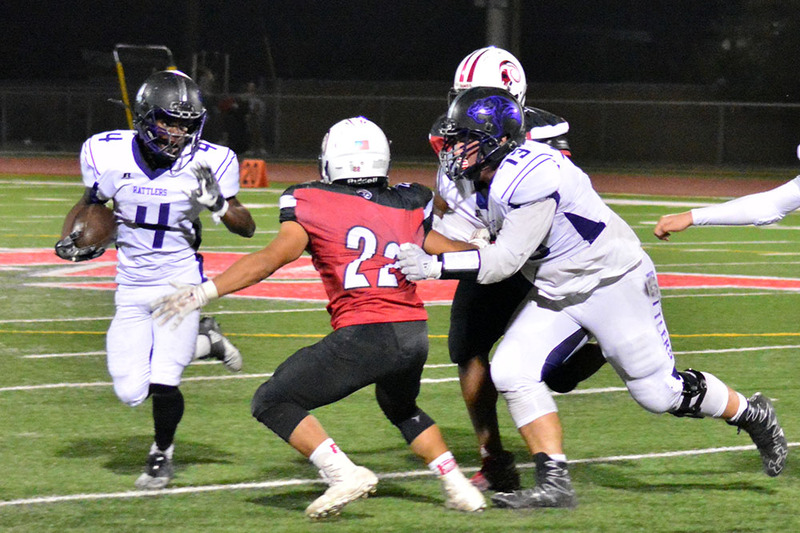 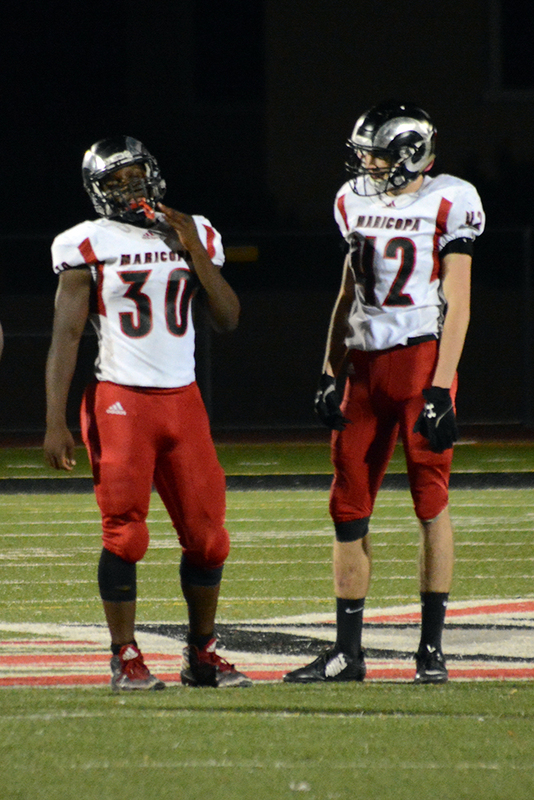 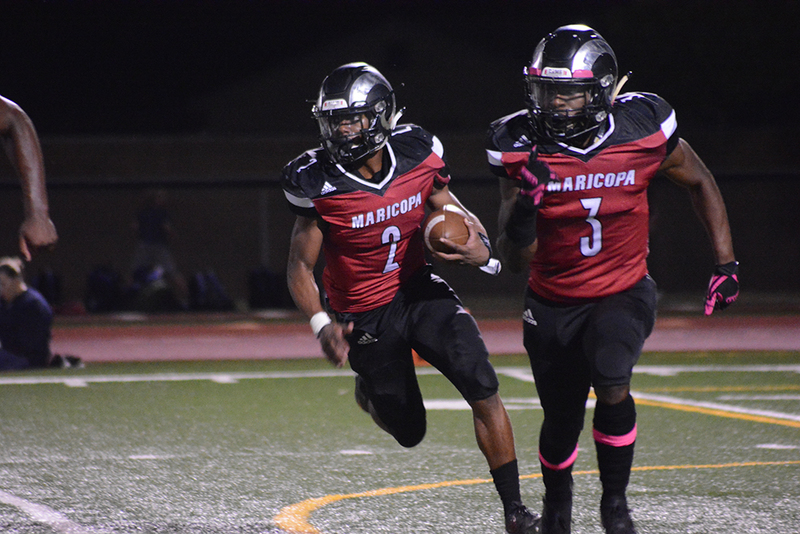 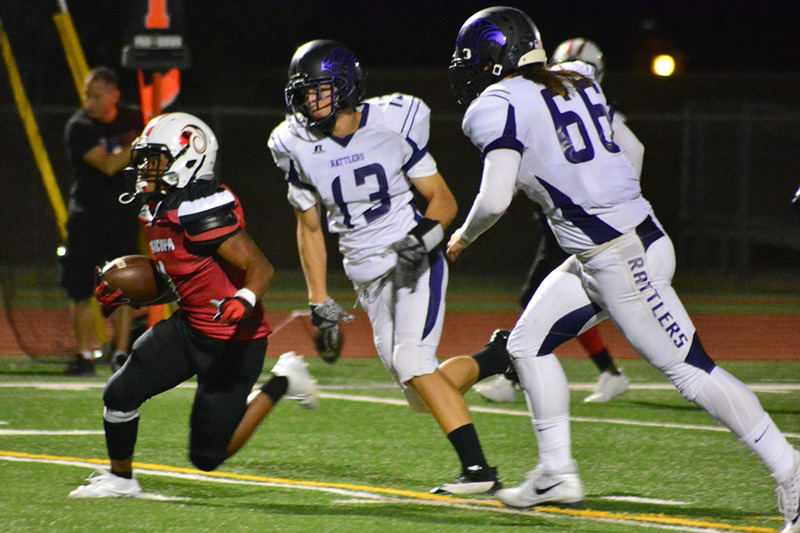 The Maricopa defense held North Canyon (2-3) to 54 rushing yards and 122 receiving yards. 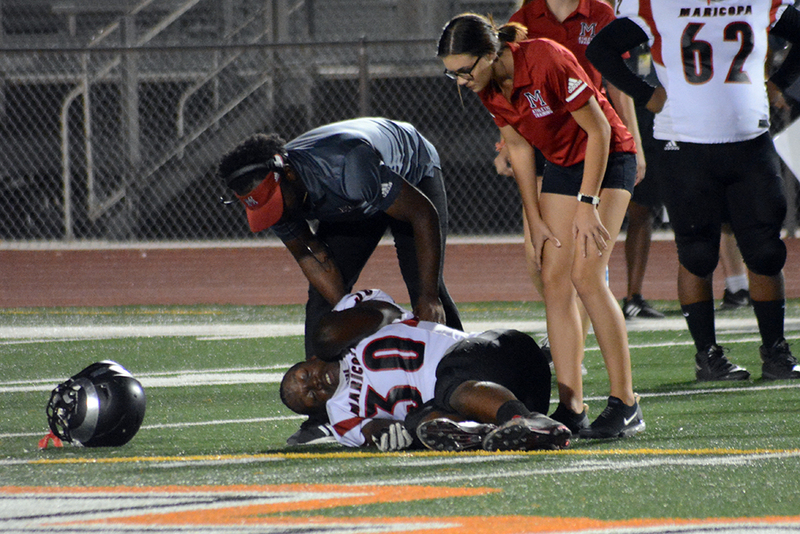 Fumble recoveries, interceptions (Jacob Cowing and Ilijah Johnson), sacks, a safety (Stefon Nelson) and even the recovery of a bad punt hike in the end zone (Edward Donaldson) had the Rattlers back on their heels all game. 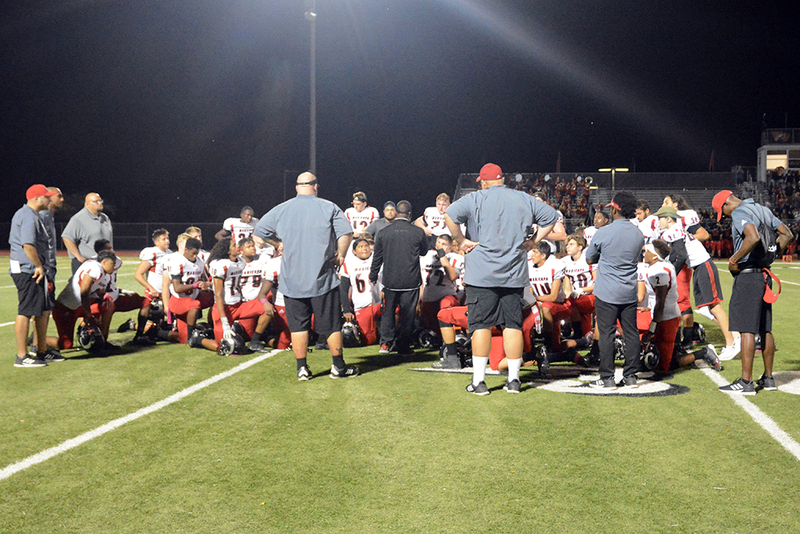 “We capitalized on their turnovers and took the wind out of their sails,” McDonald said. 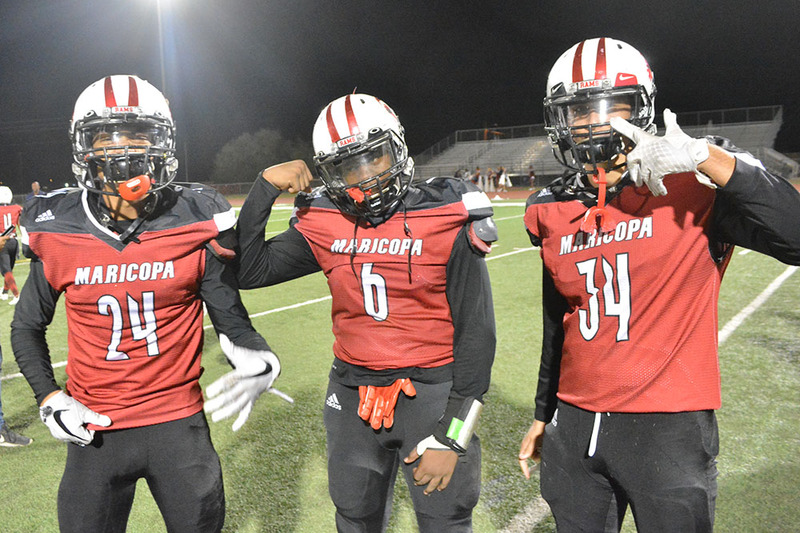 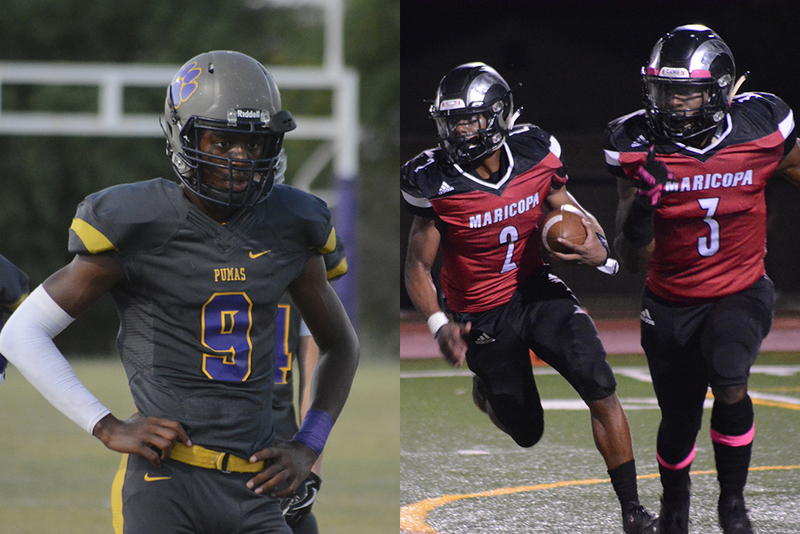 Meanwhile, the Maricopa offense was firing on all cylinders. 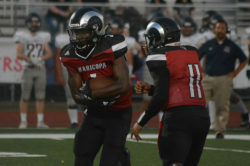 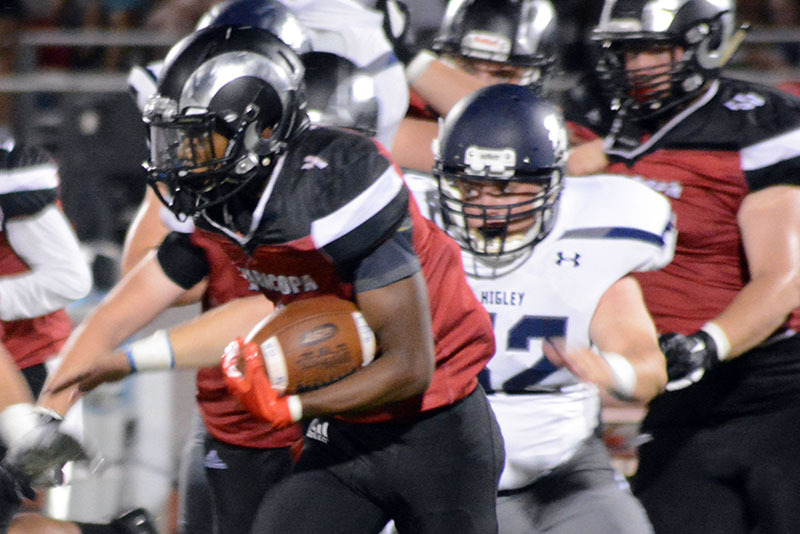 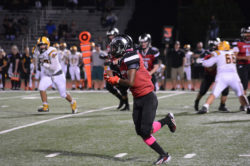 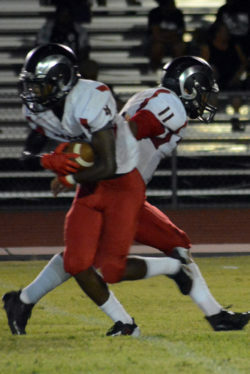 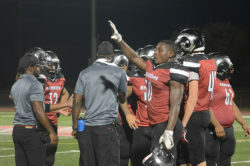 Senior running back Kemo Akins rushed for three touchdowns, including the first and last of the Rams’ eight touchdowns. 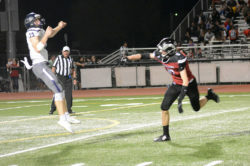 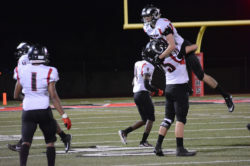 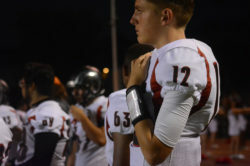 Senior quarterback Alec Smith connected with junior wide receiver Jacob Cowing on three scoring plays, including two 80-yard bombs. 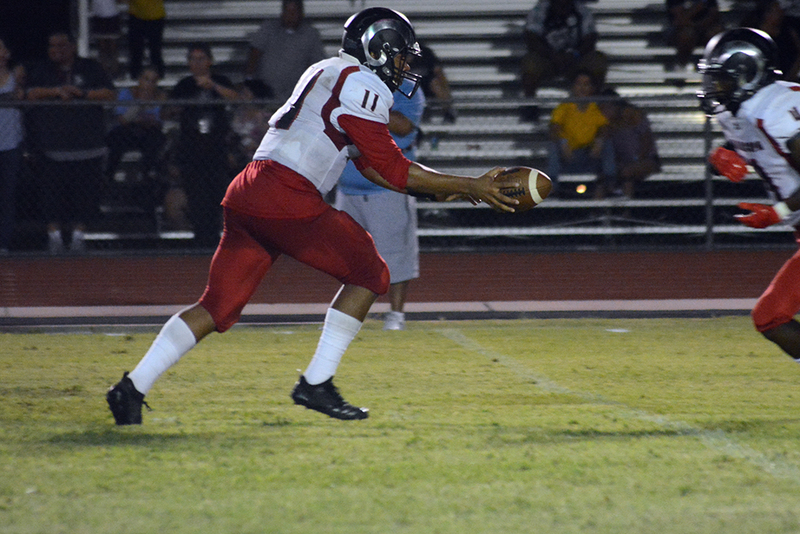 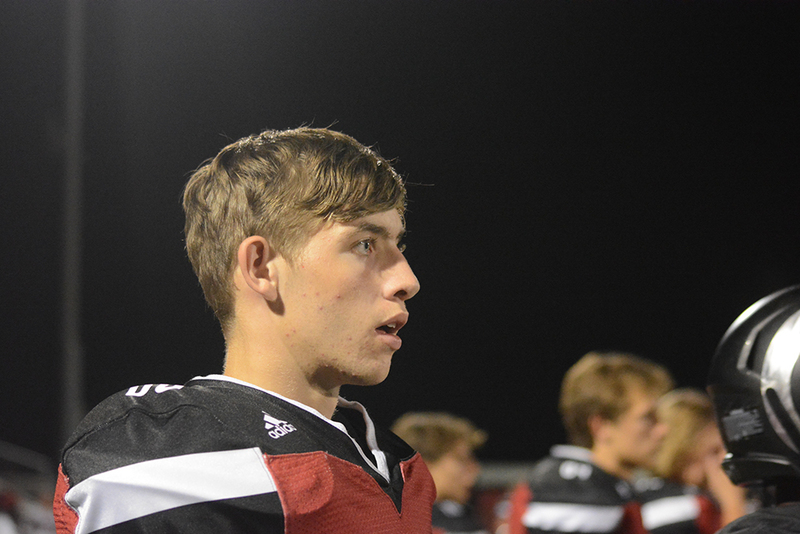 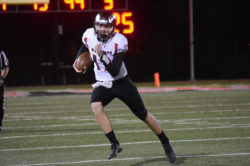 Smith, who again had more than 150 yards passing despite playing only half the game, also scored on a 28-yard keeper. Maricopa did have serious issues on special teams, and mistakes McDonald warned the team could cost them games. In the meantime, the Rams are relishing a blowout victory and a week off. 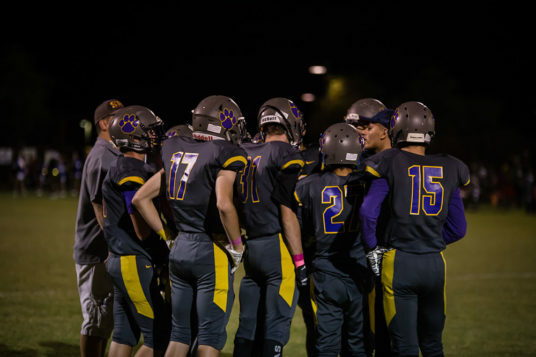 This week is a bye for the team. 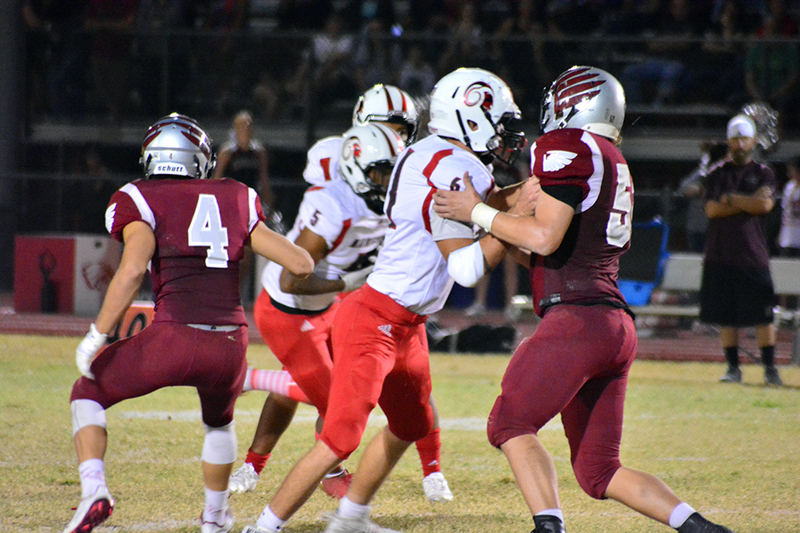 The second half of the season, in which they take on all 5A Metro foes, begins Thursday, Sept. 28, at Ironwood (1-3) in Glendale. Maricopa has outscored its opponents 181-113. 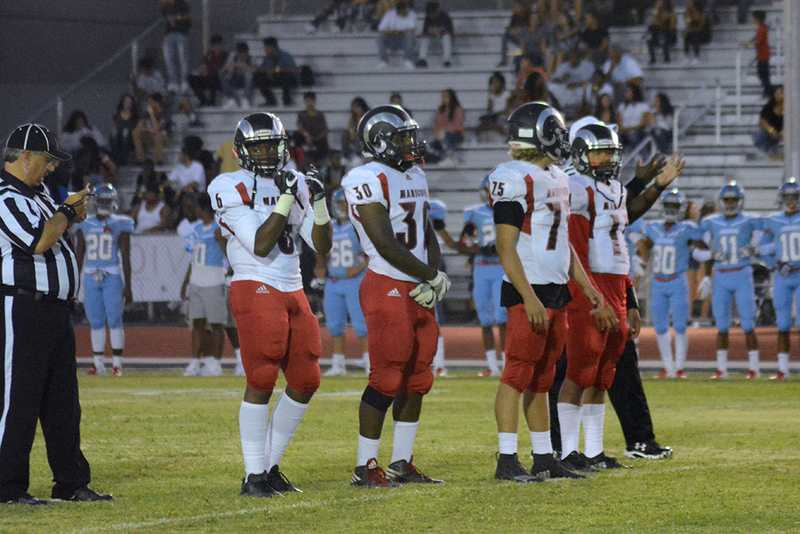 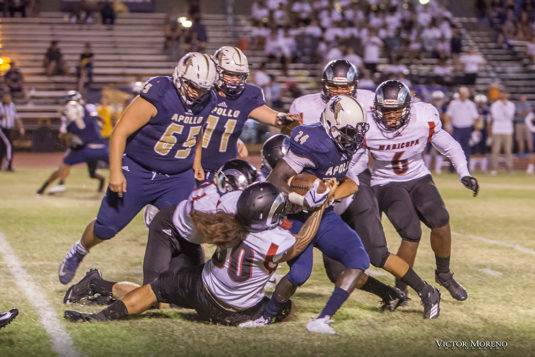 After Ironwood, the Rams will face Apollo (3-1), Sunnyslope (2-2), Kellis (4-0) and McClintock (2-2).